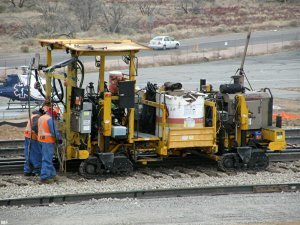 Don E. Toles (DET), Gary G. Gray (GGG), Marc Fournier (MF). 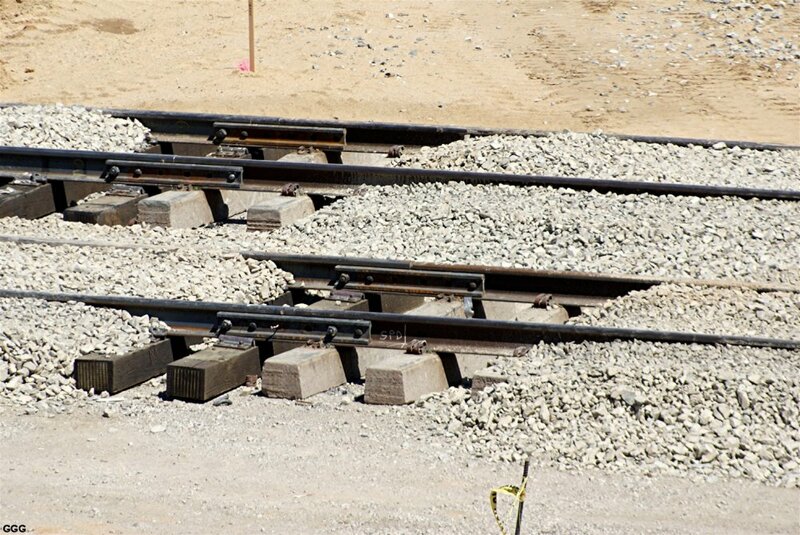 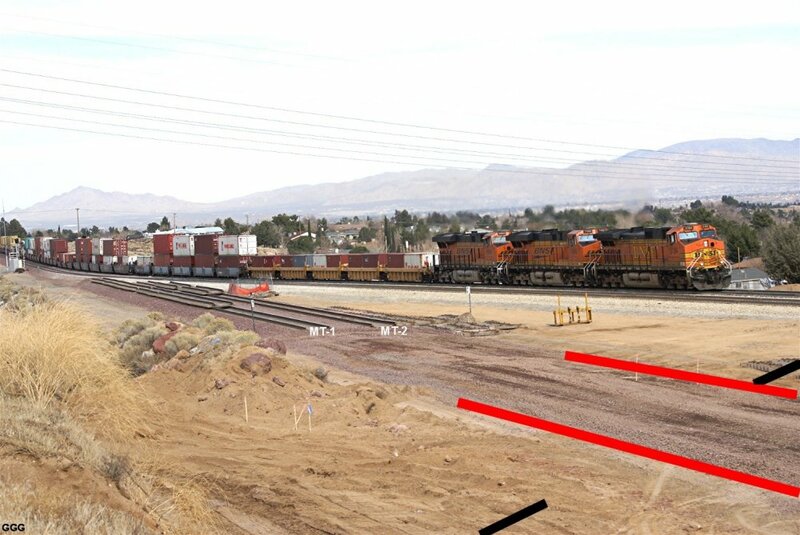 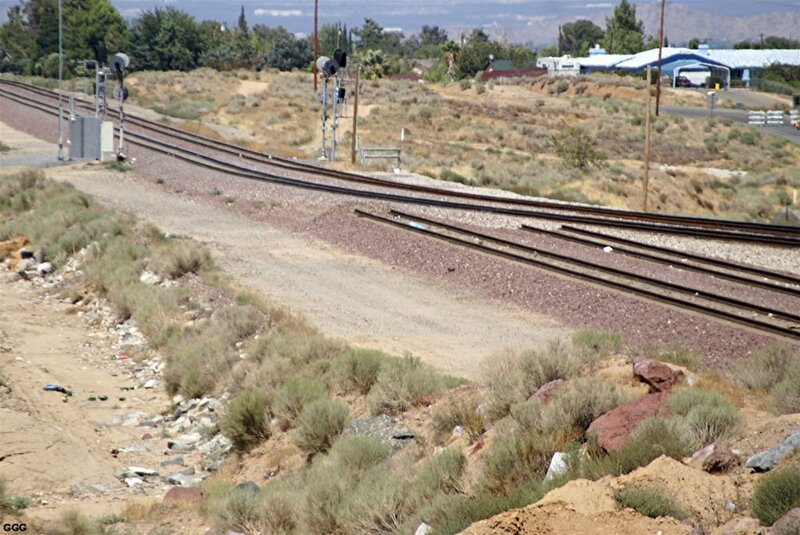 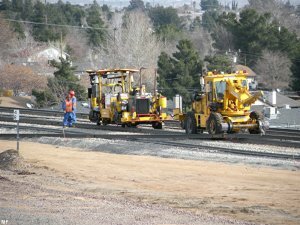 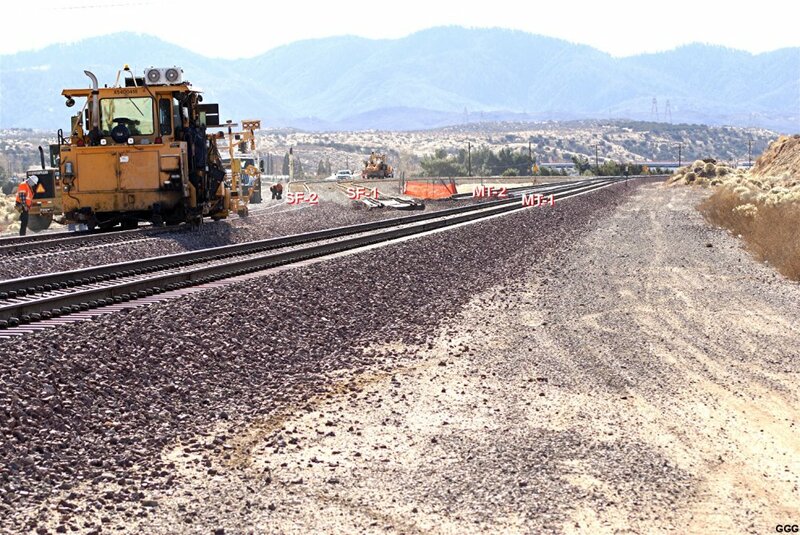 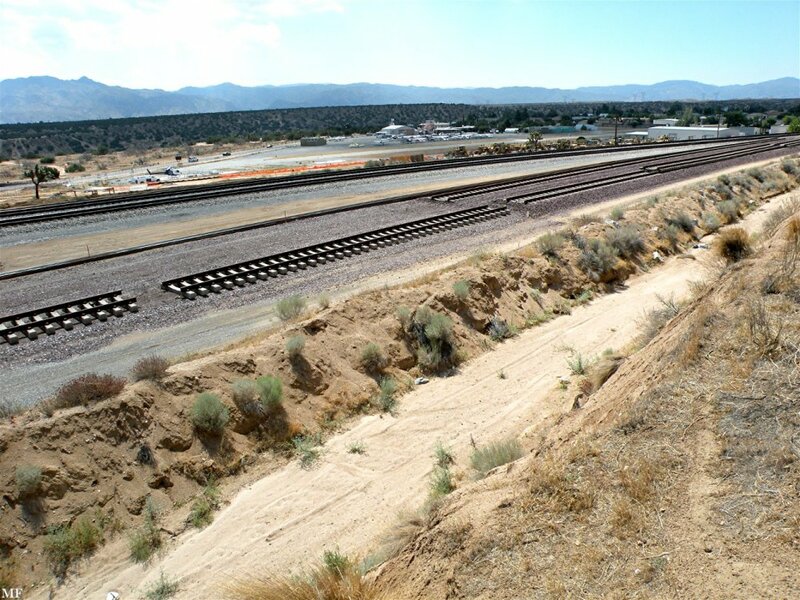 The Ranchero Rd extension will require a three track (for a future BNSF 3rd main ???) 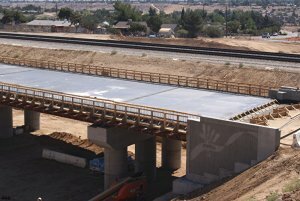 Railroad bridge. 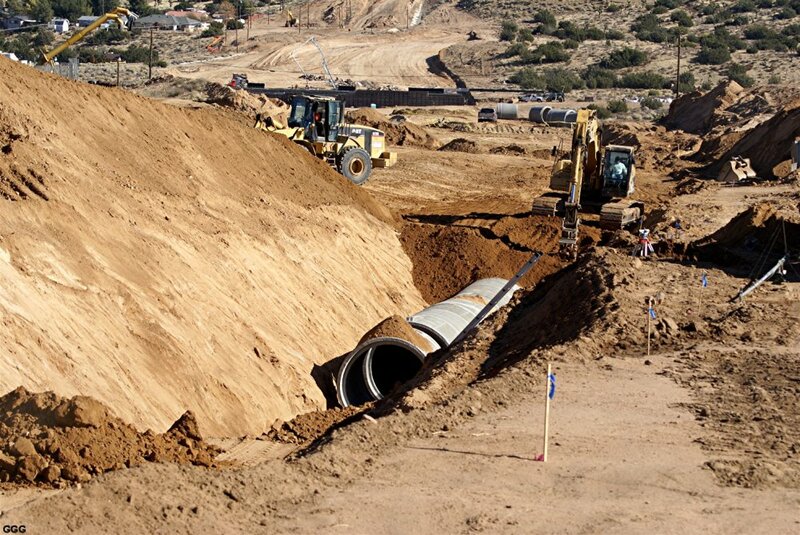 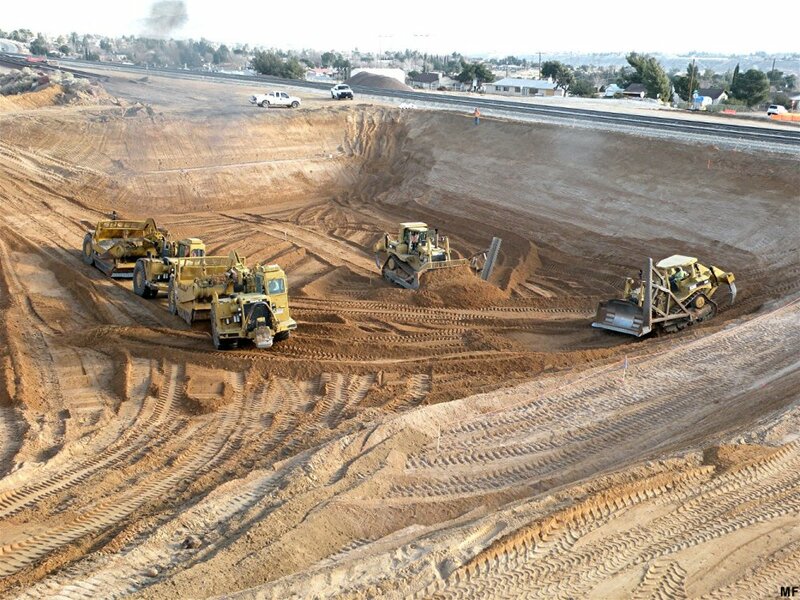 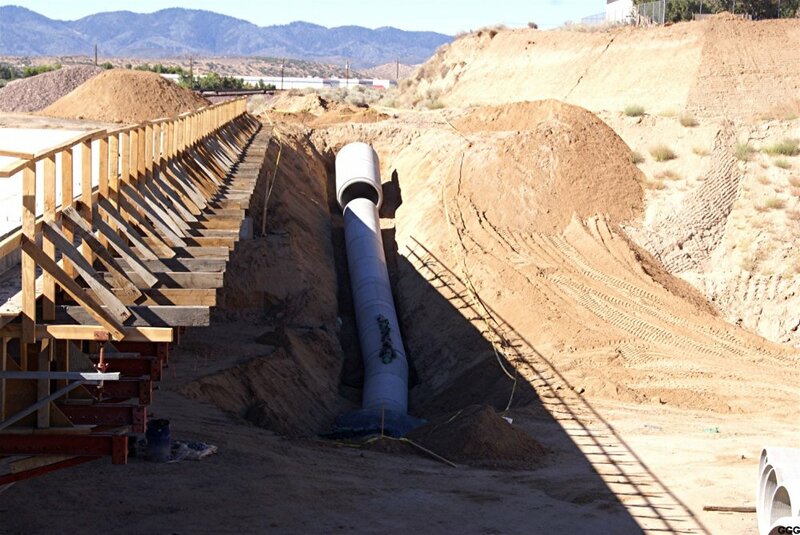 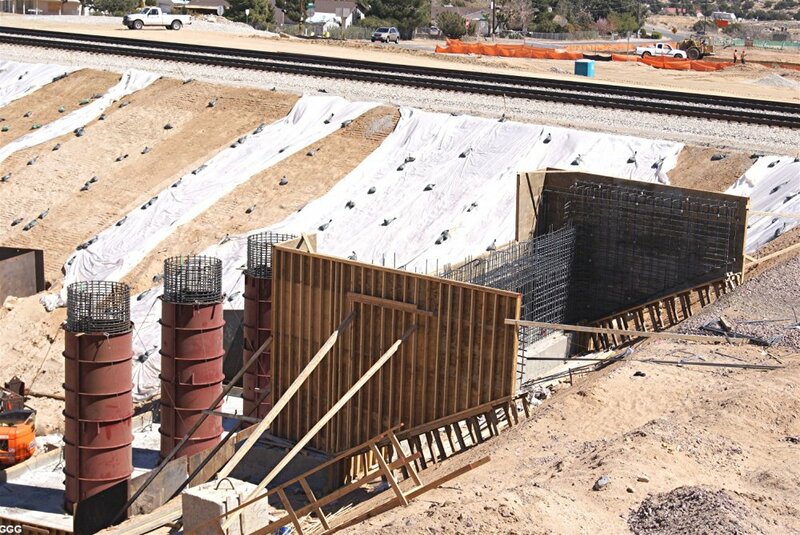 Also, the extension of Ranchero Rd east of the BNSF will require a very large box culvert and 30 feet of fill to raise the road above a major tributary that carries storm runoff to the Mojave River. 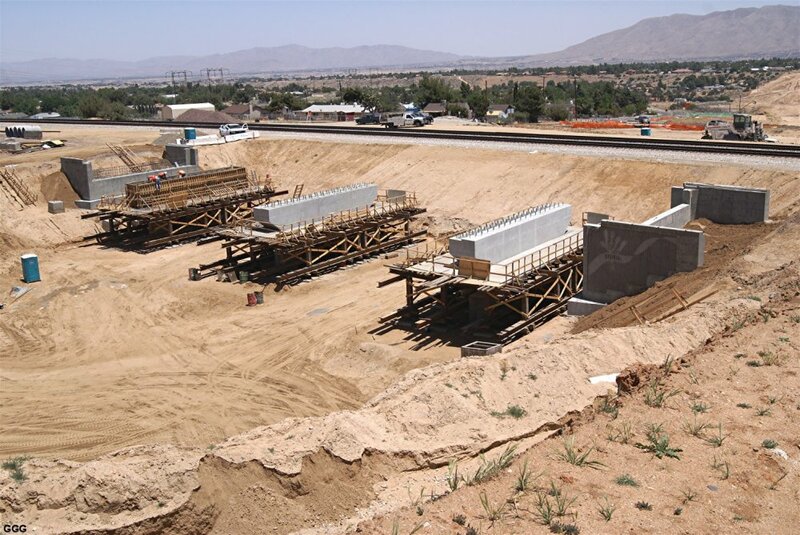 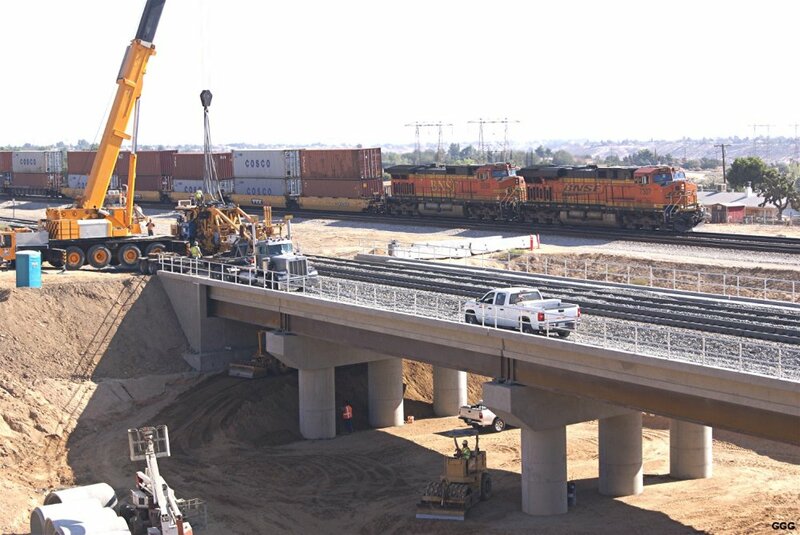 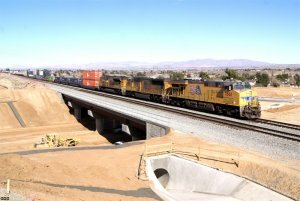 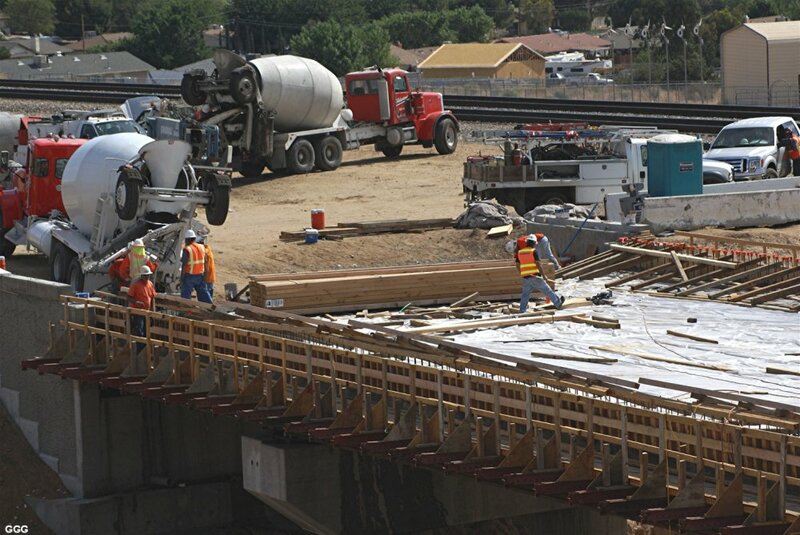 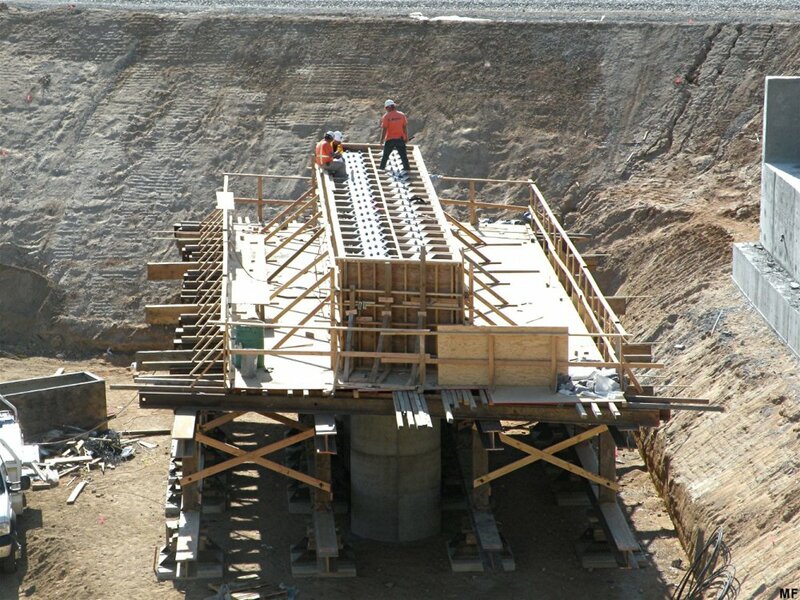 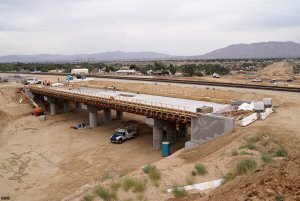 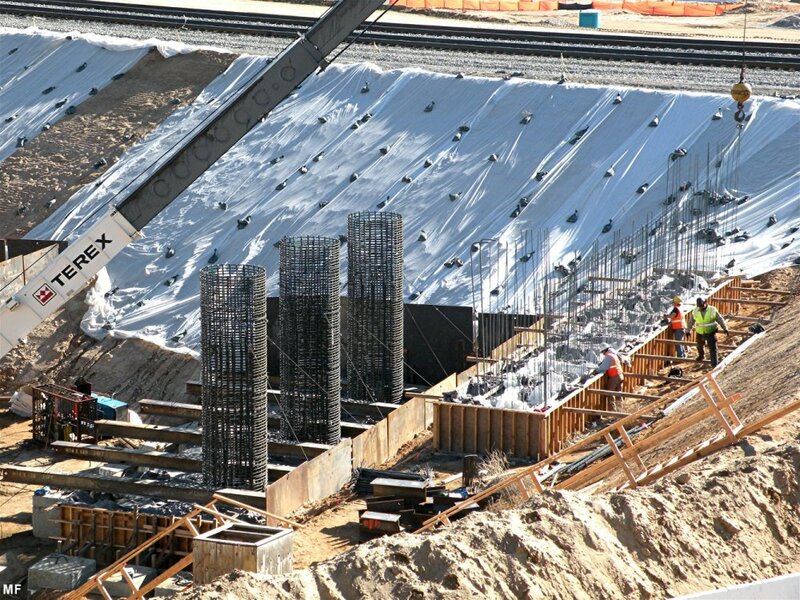 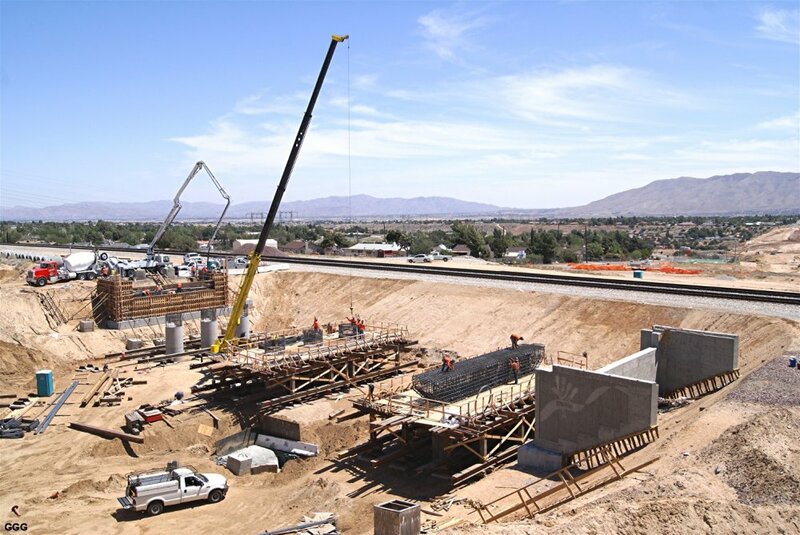 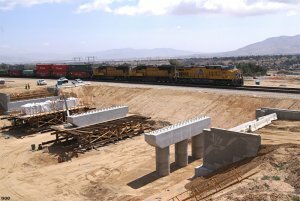 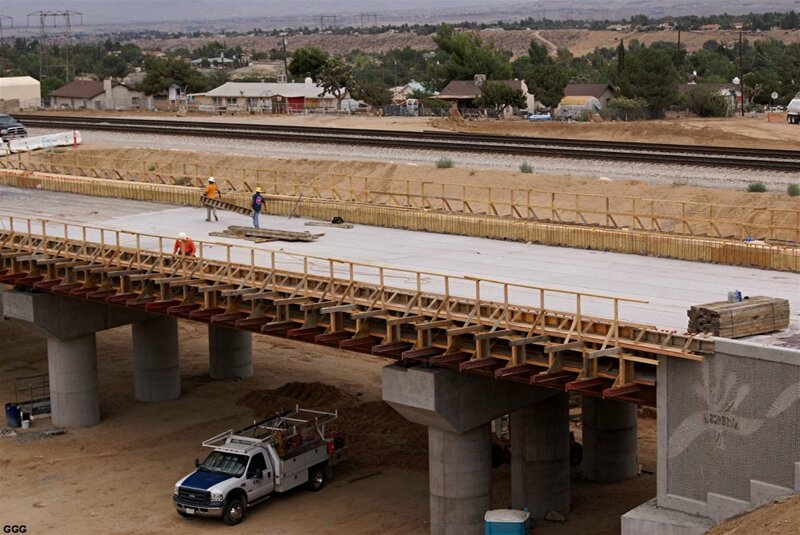 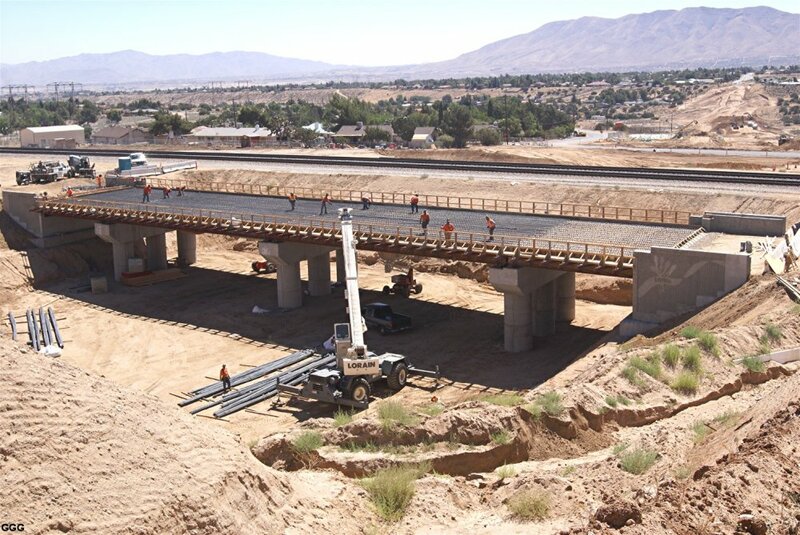 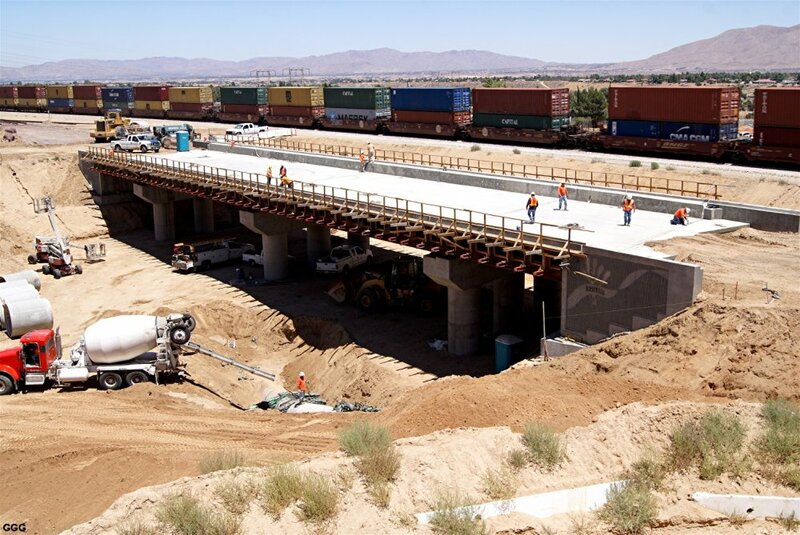 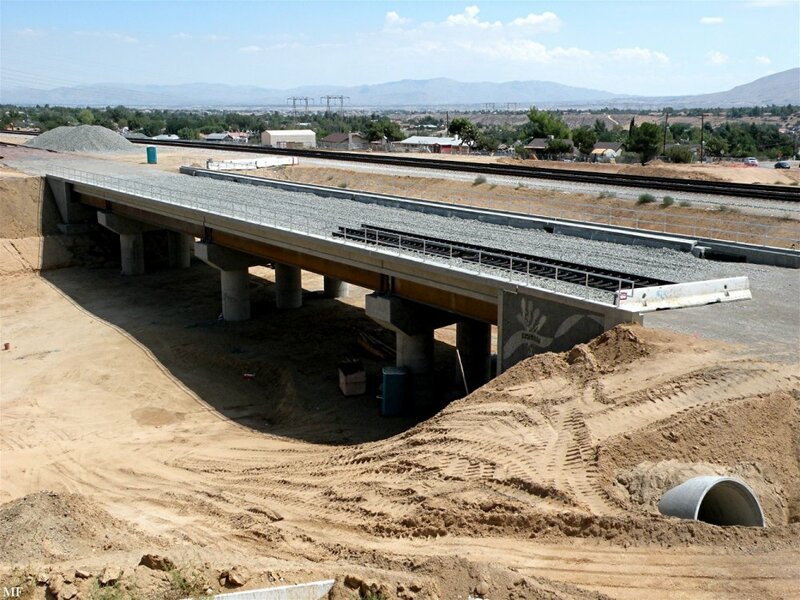 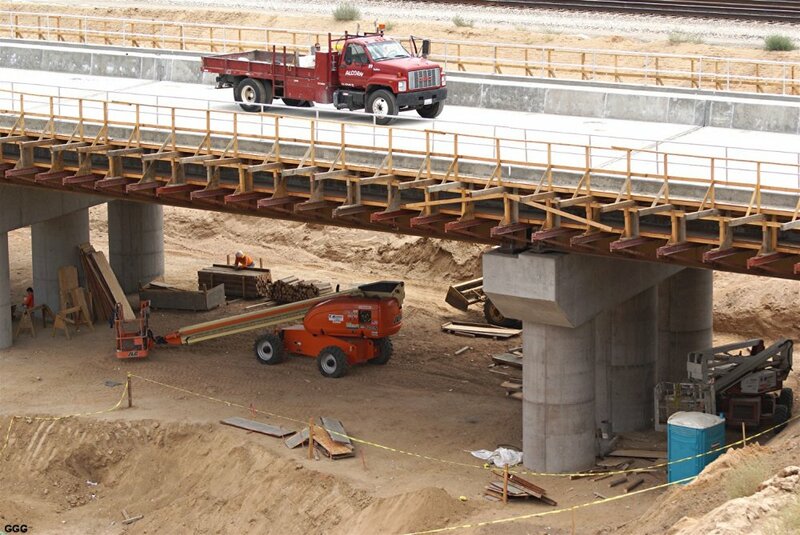 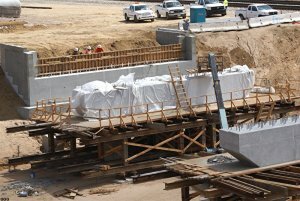 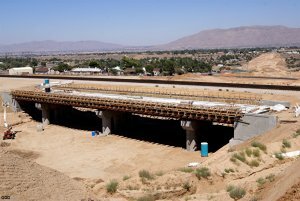 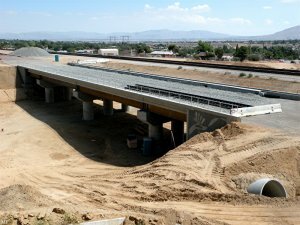 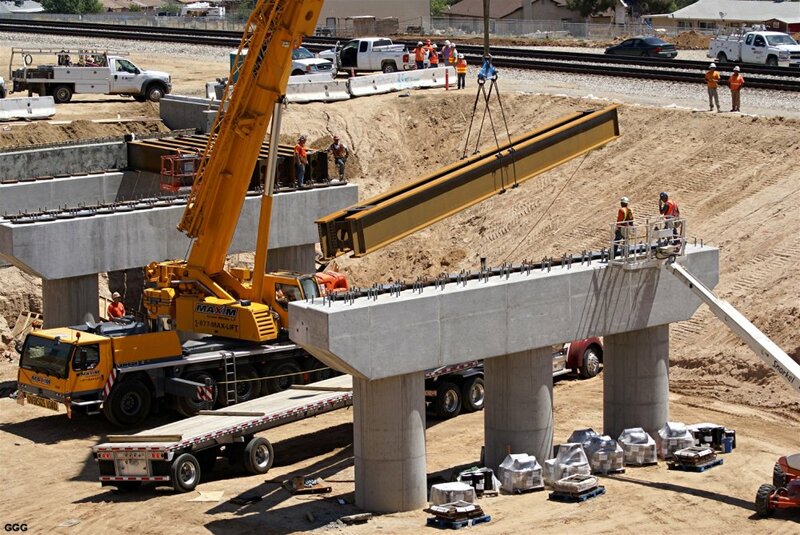 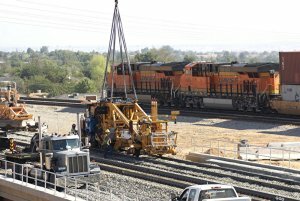 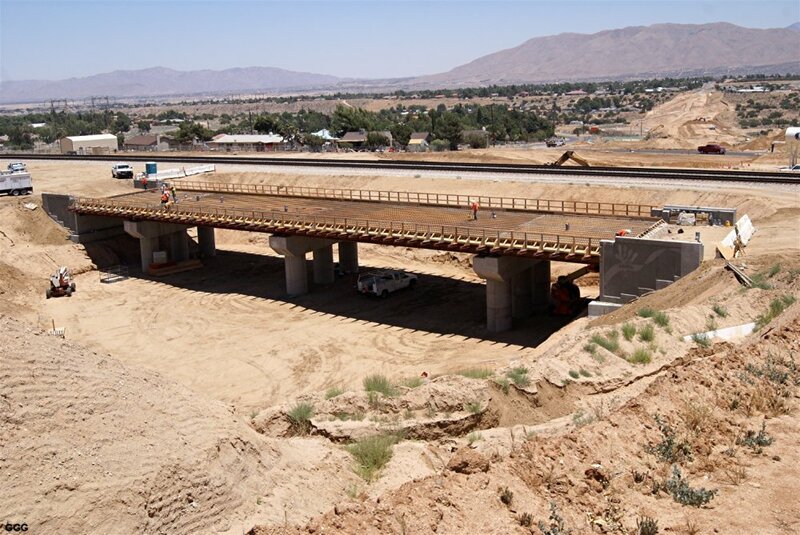 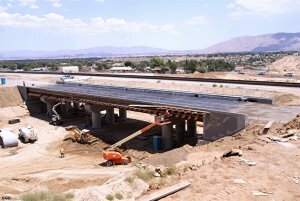 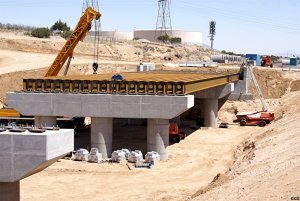 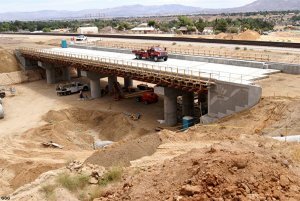 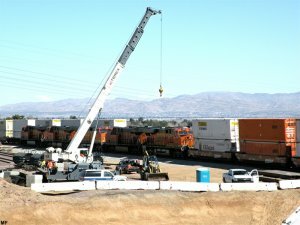 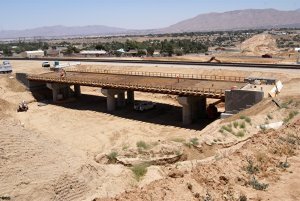 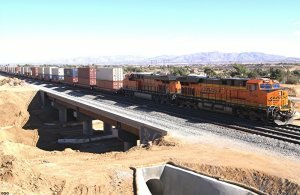 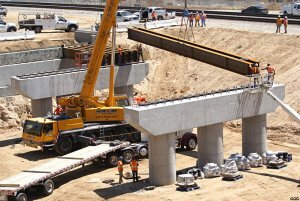 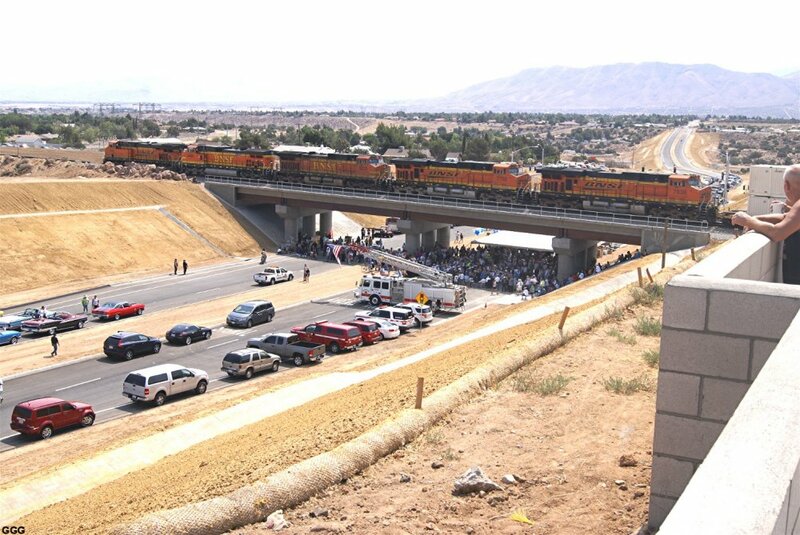 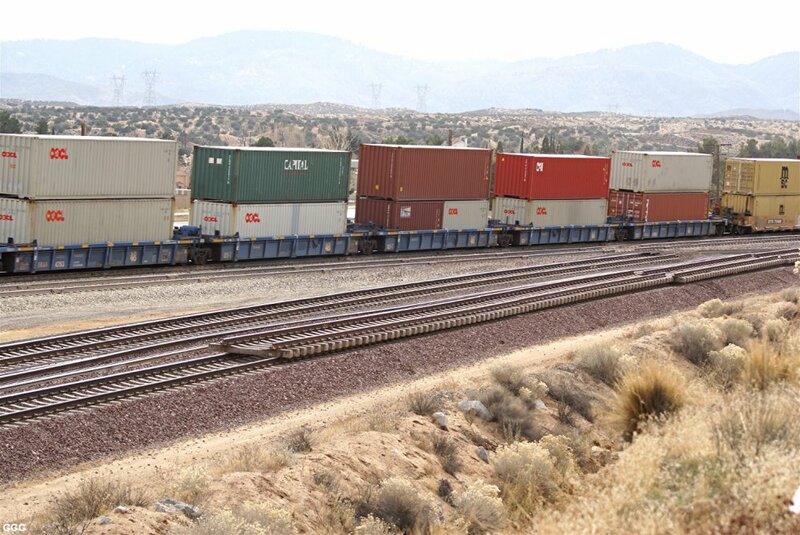 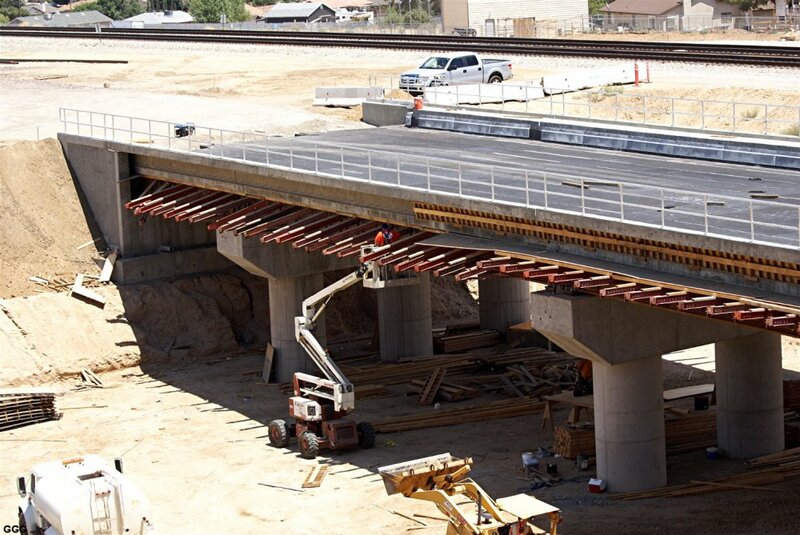 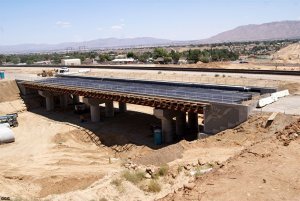 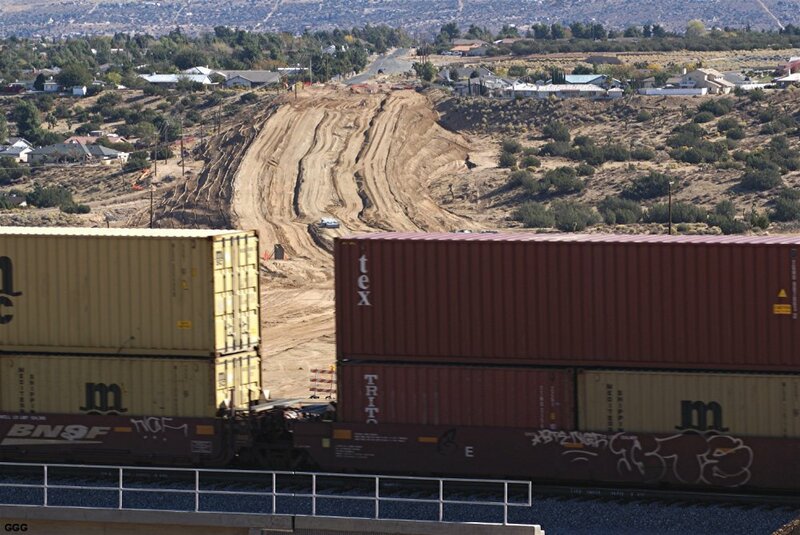 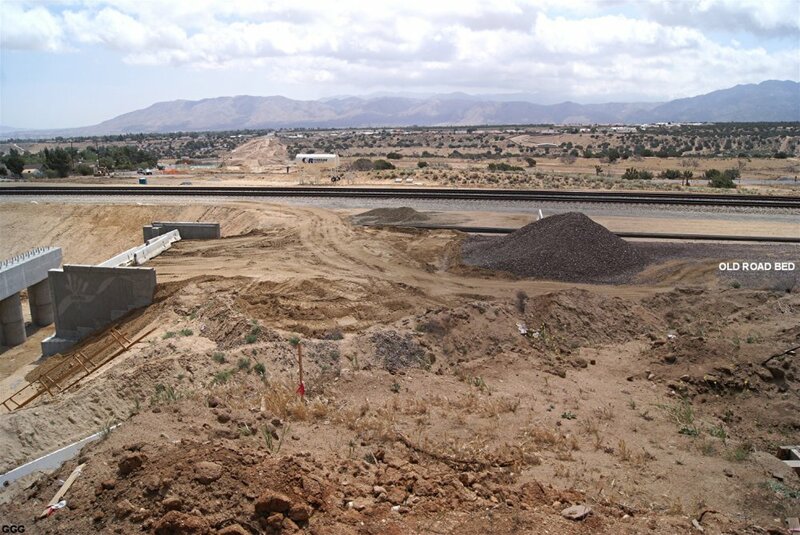 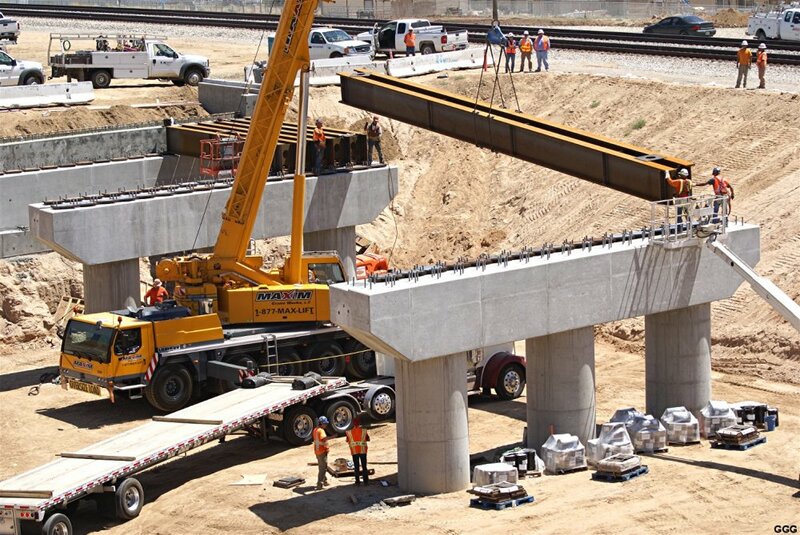 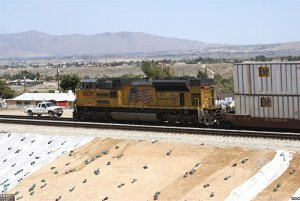 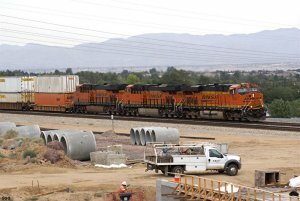 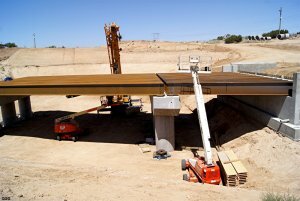 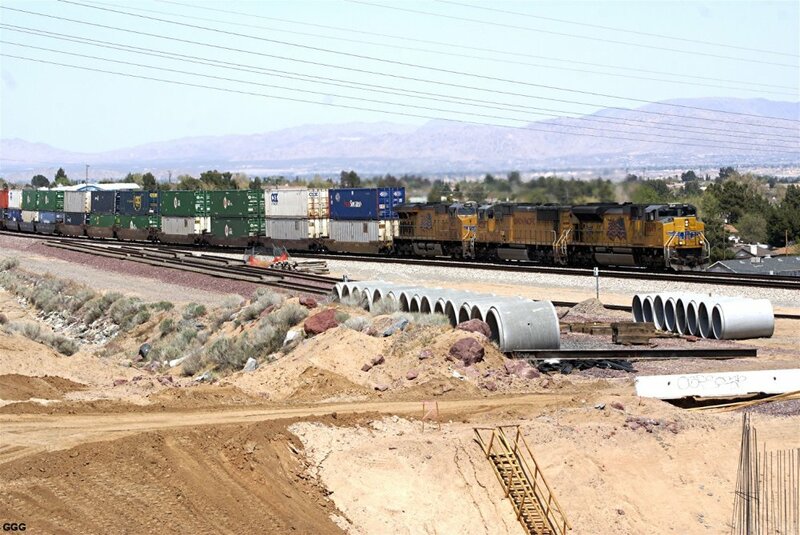 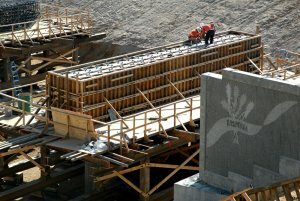 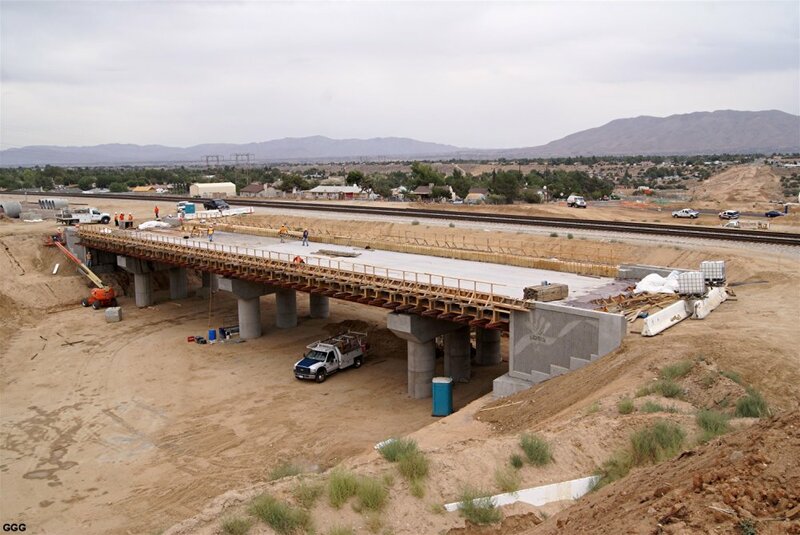 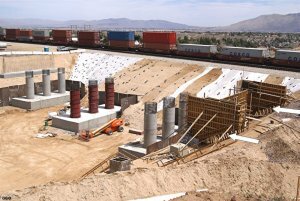 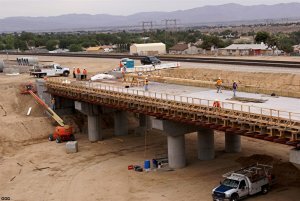 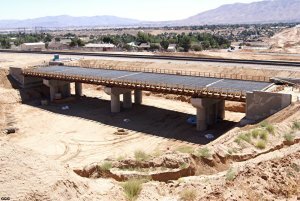 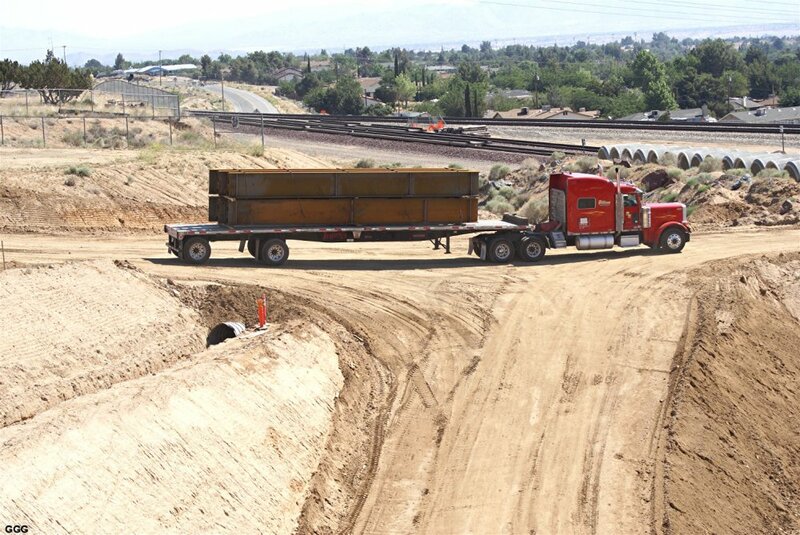 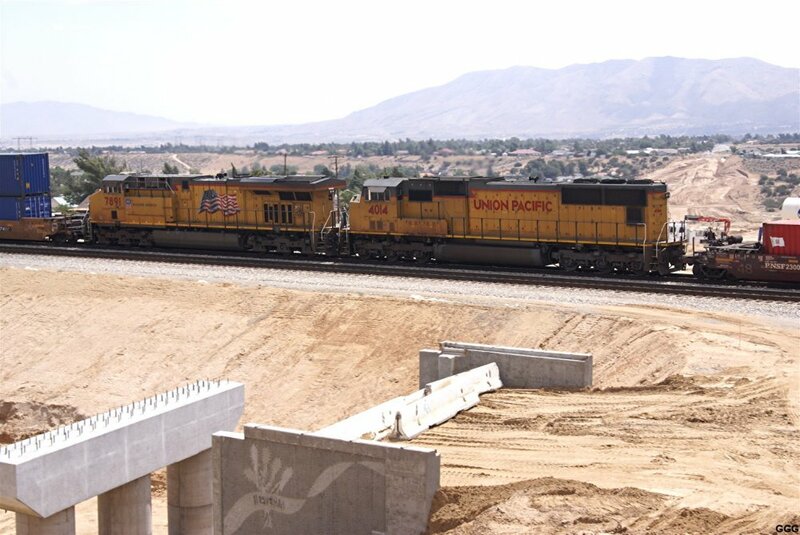 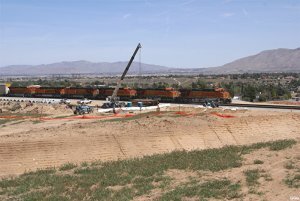 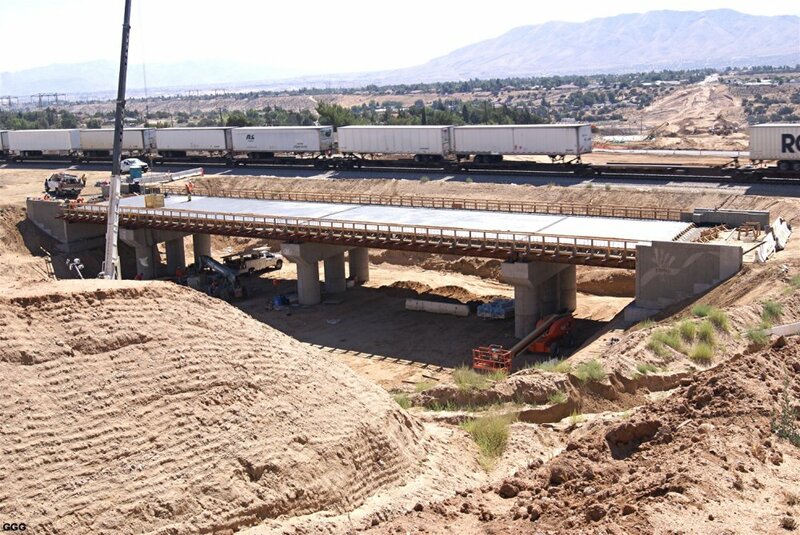 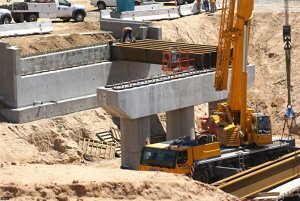 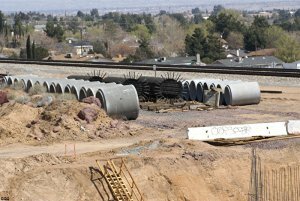 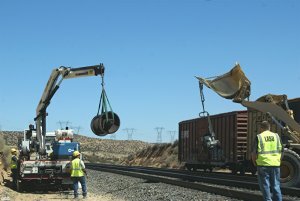 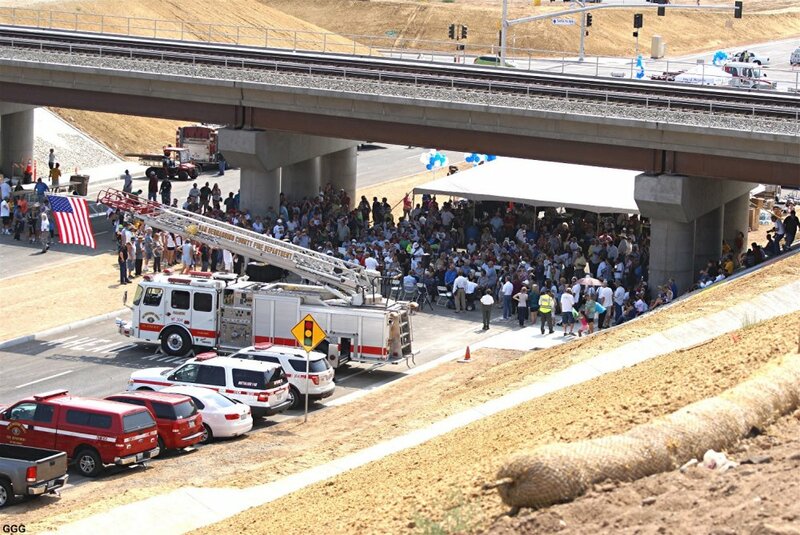 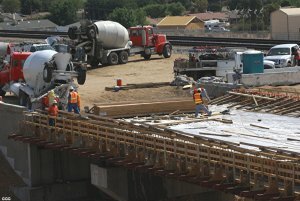 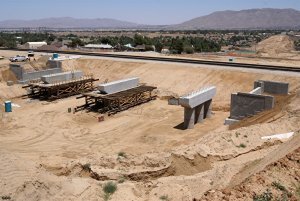 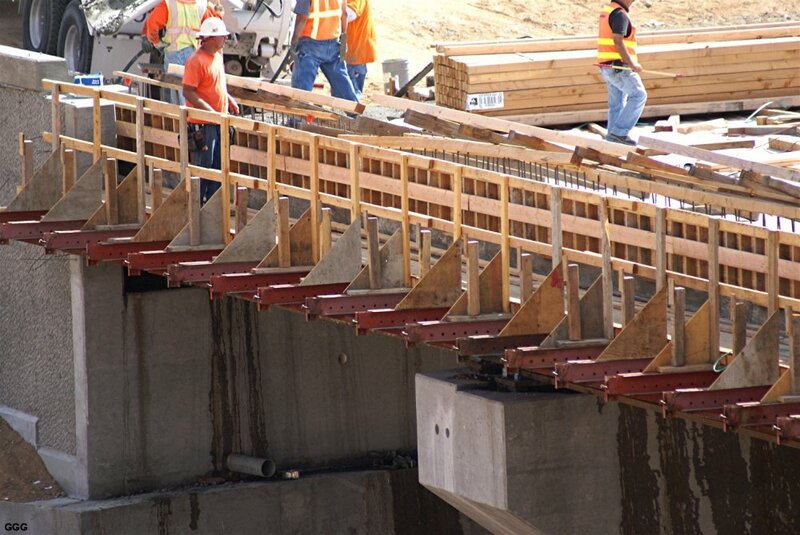 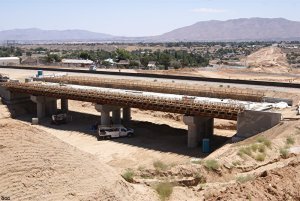 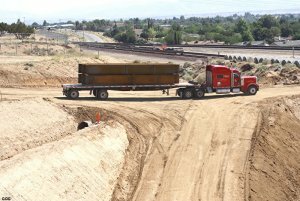 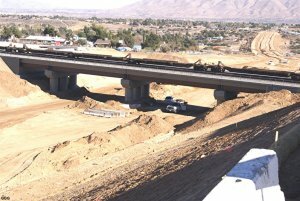 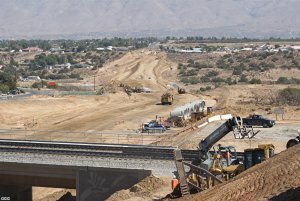 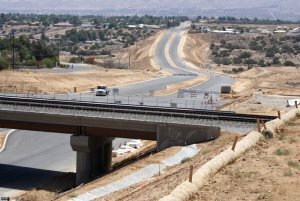 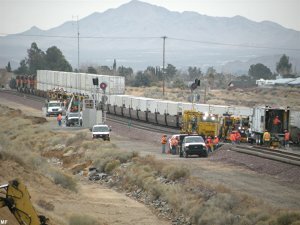 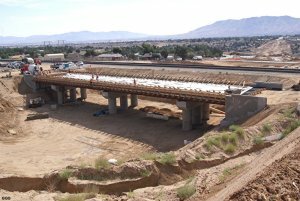 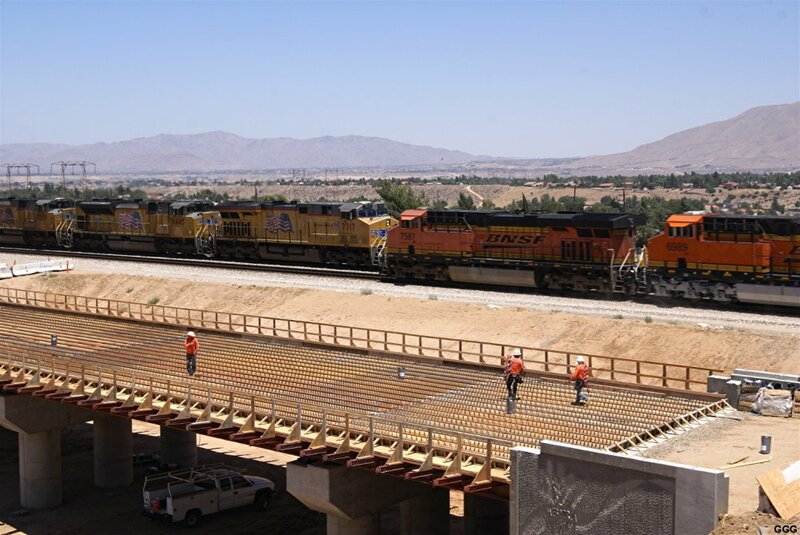 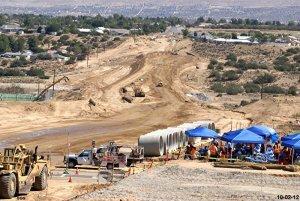 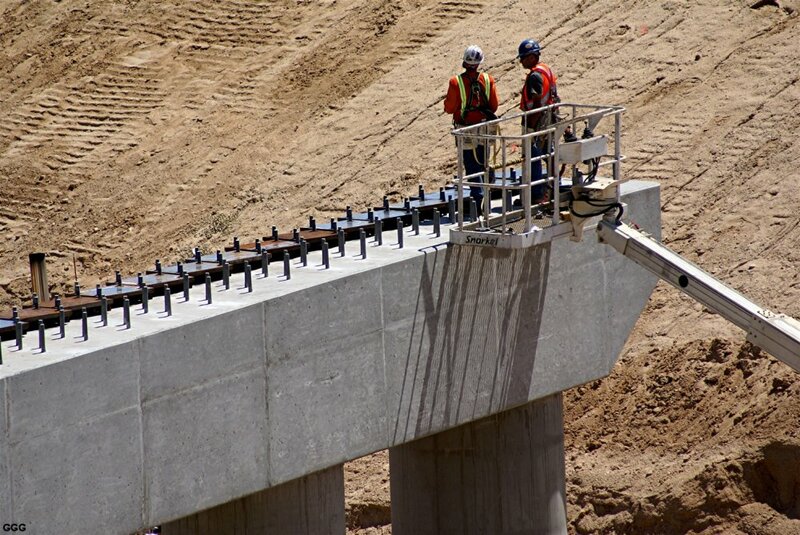 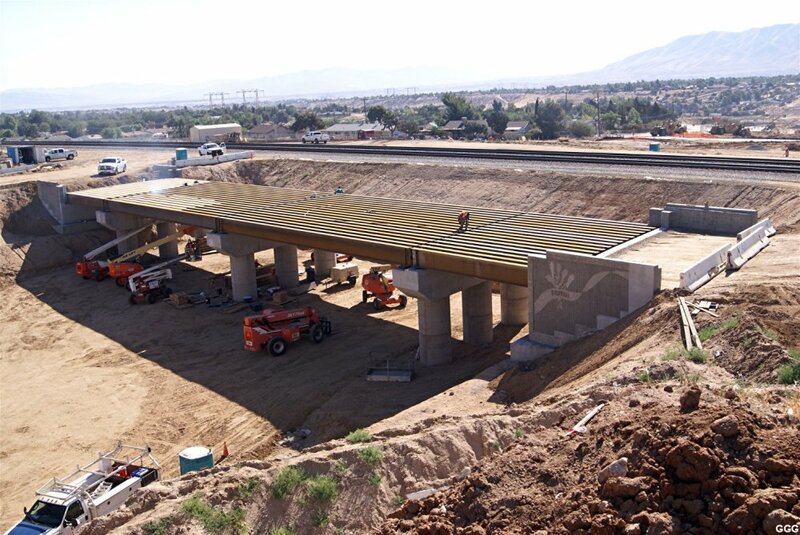 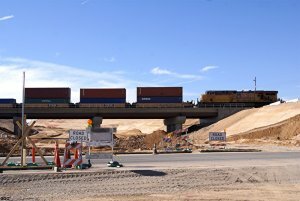 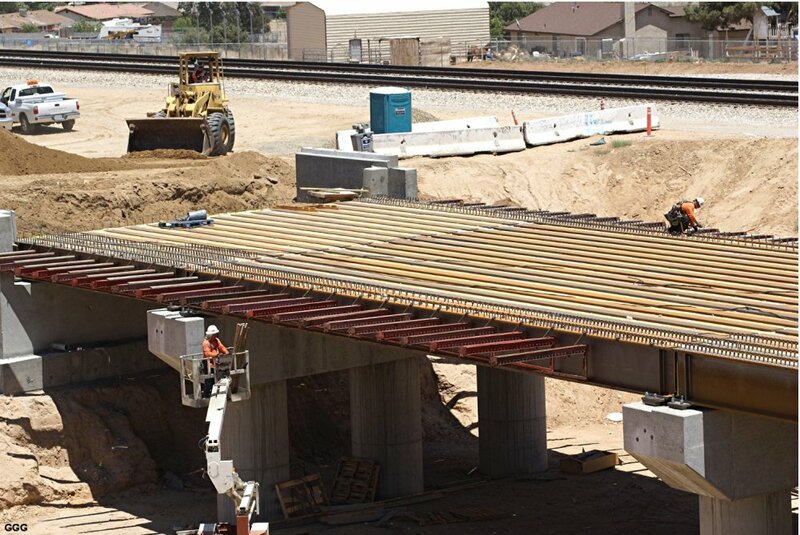 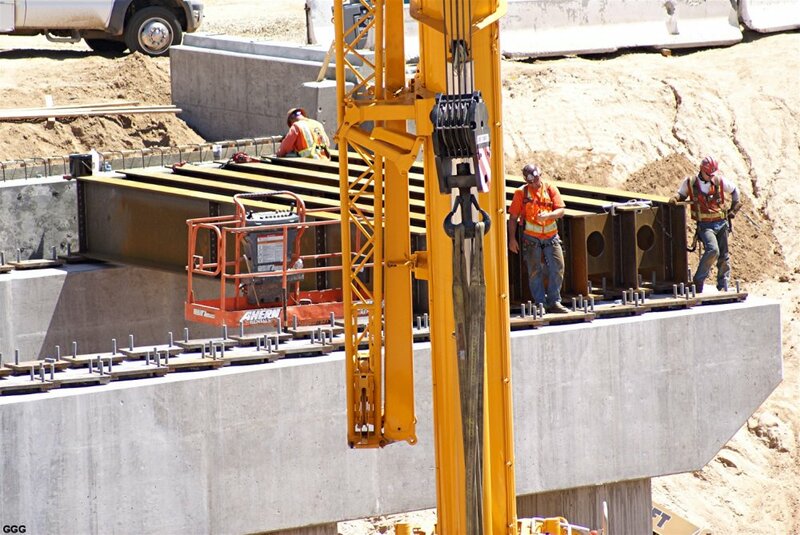 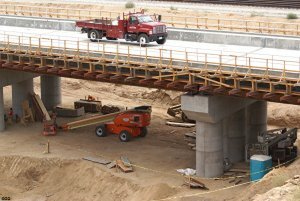 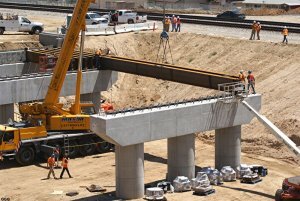 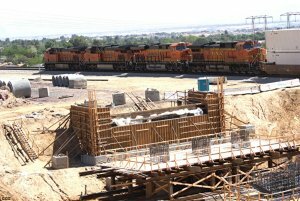 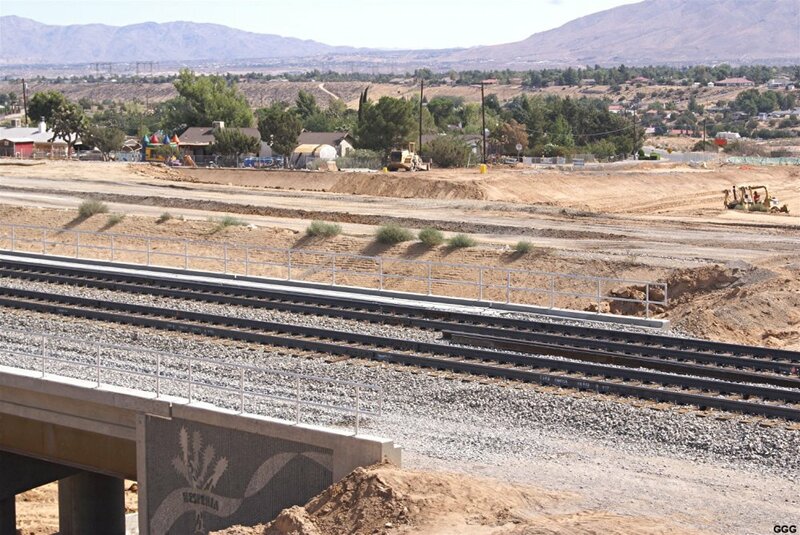 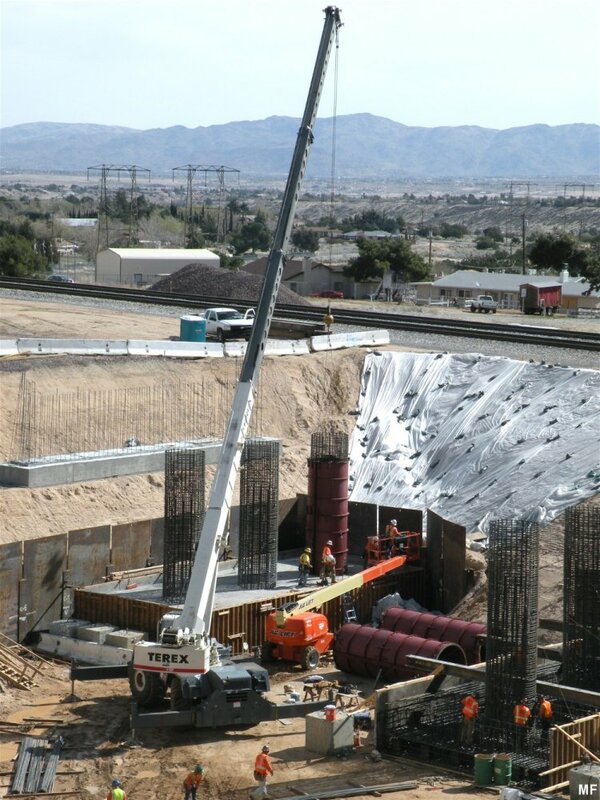 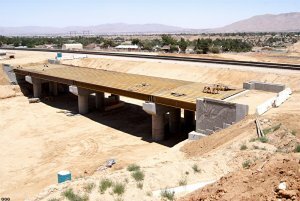 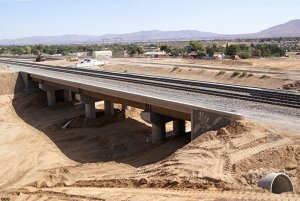 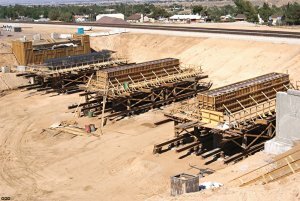 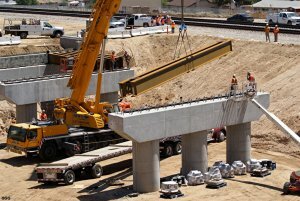 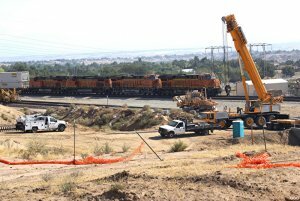 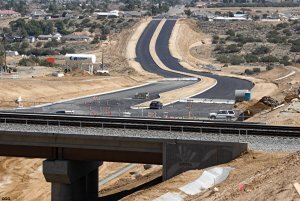 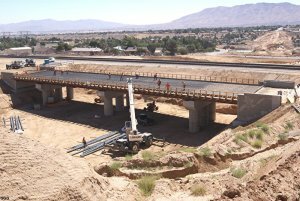 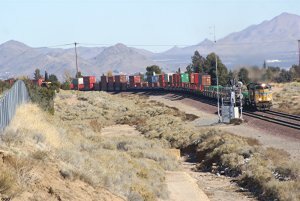 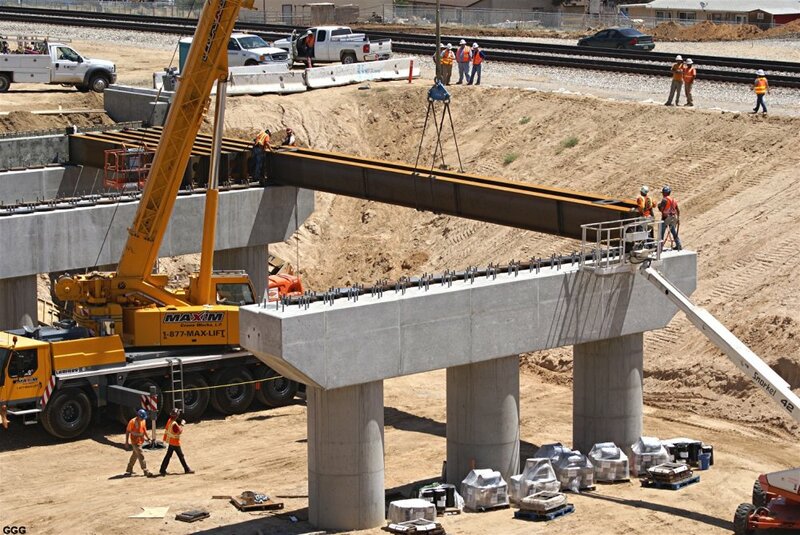 September 12, 2012: The First Train was rolling over the new Ranchero Road Bridge - see photos 2592 - 2594. 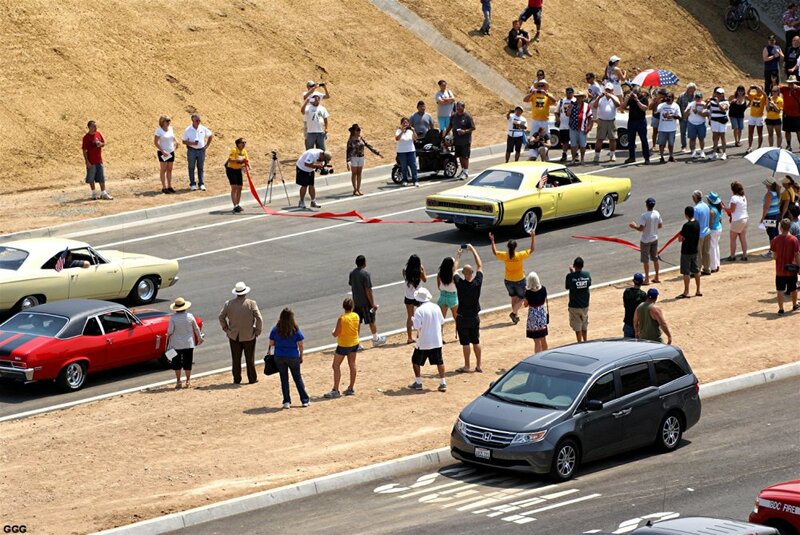 6/30/13: See the latest photos (2789-2803) of the Grand Opening at the end of this page! 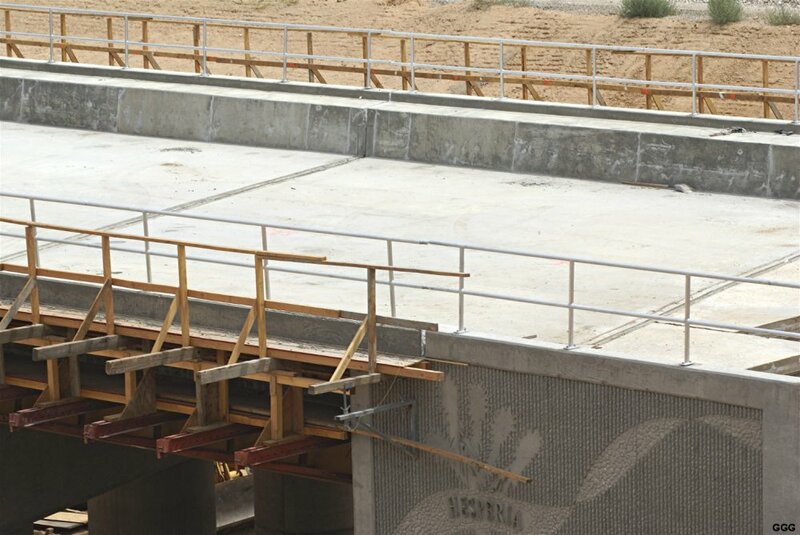 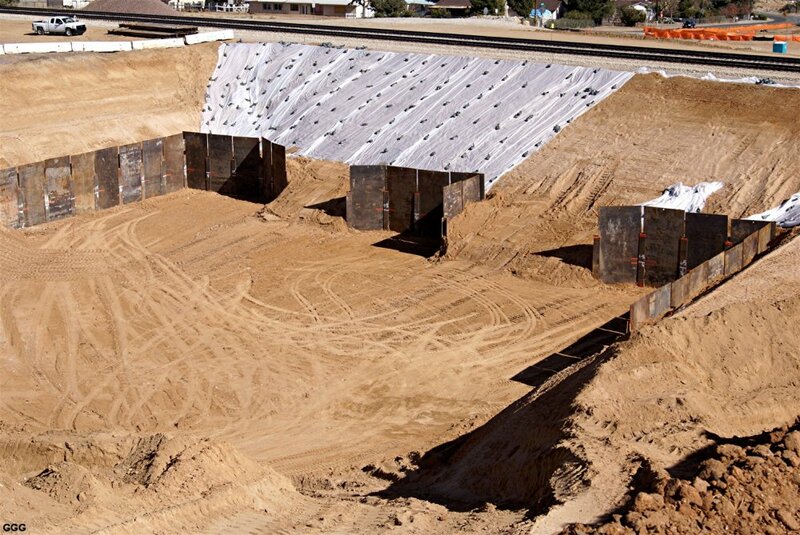 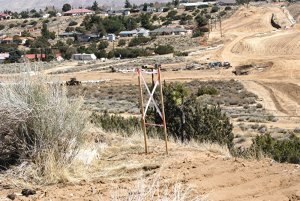 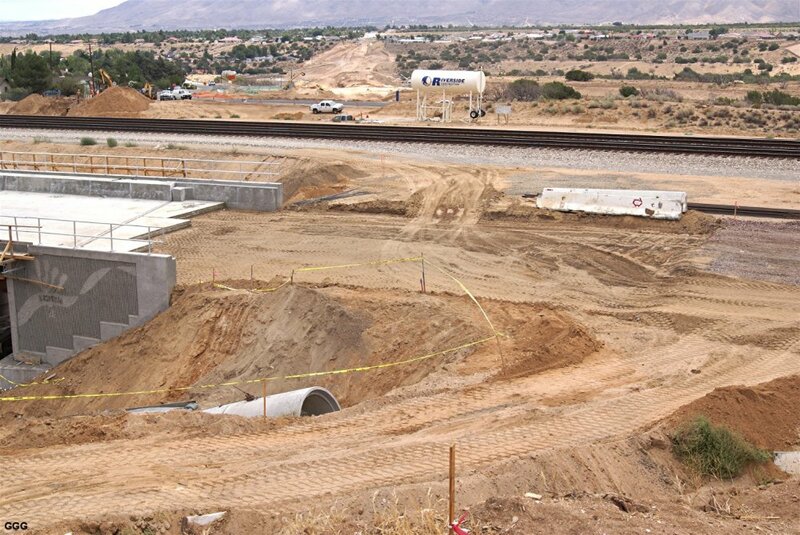 HESPERIA • For years, Hesperia residents have used the phrase "when pigs fly" as they have responded to news that the Ranchero Underpass would soon break ground. 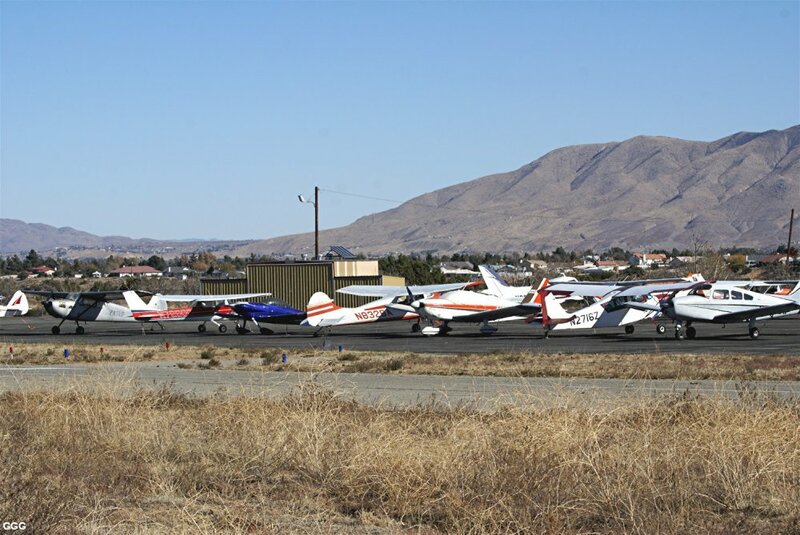 Get set for takeoff. 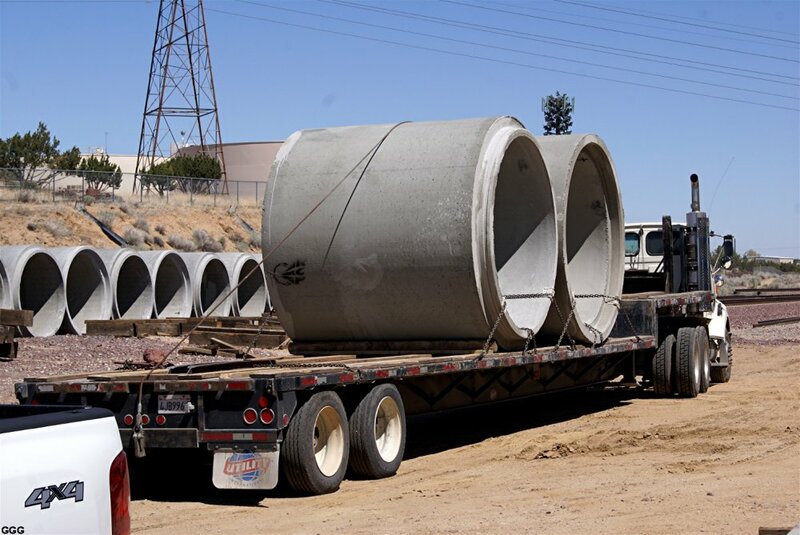 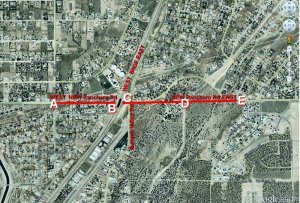 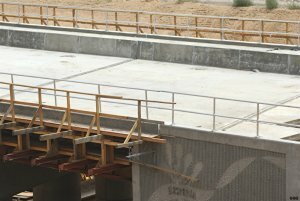 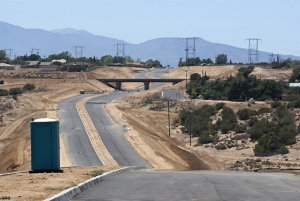 As part of the city’s 25th anniversary celebration, the City of Hesperia will cut the ribbon on the long-awaited Ranchero Underpass June 29. 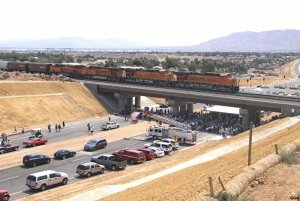 During its underpass groundbreaking Aug. 2011, the city used a flying pig theme on its invitations, buttons, pins, decorations and refreshments. 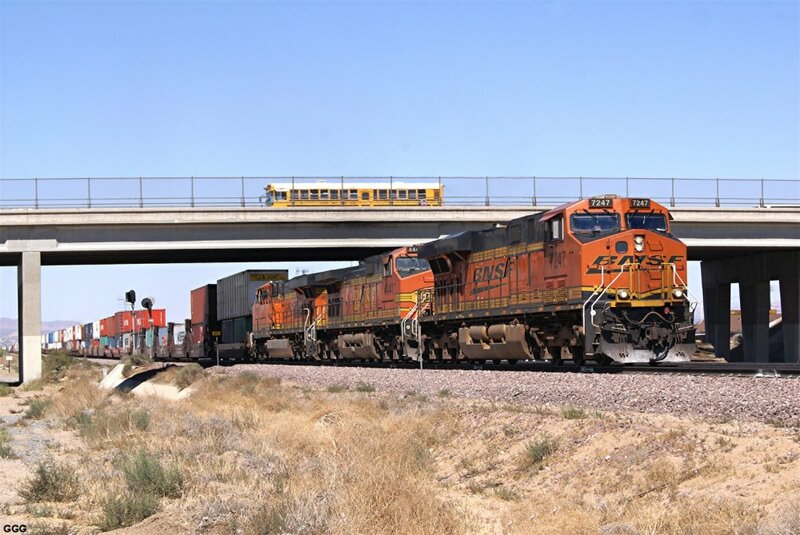 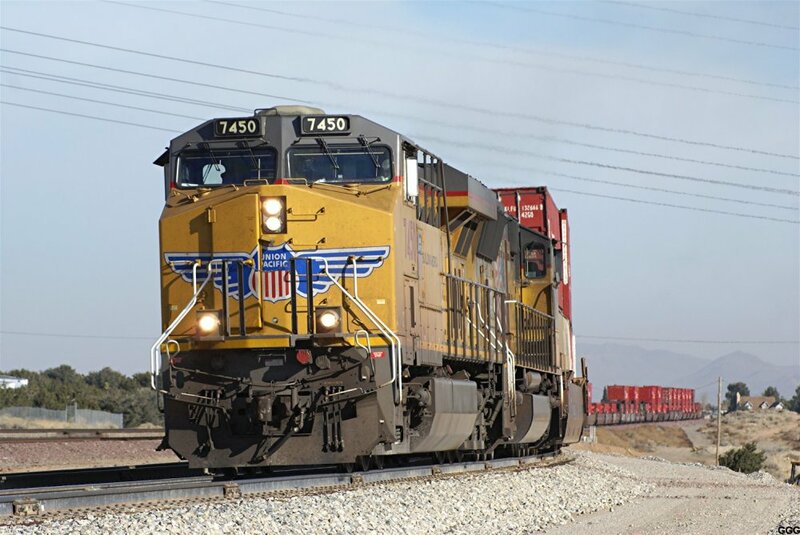 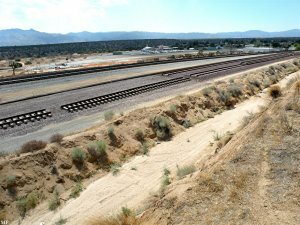 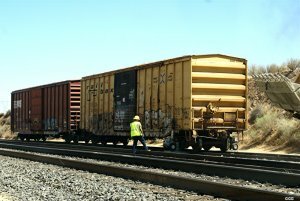 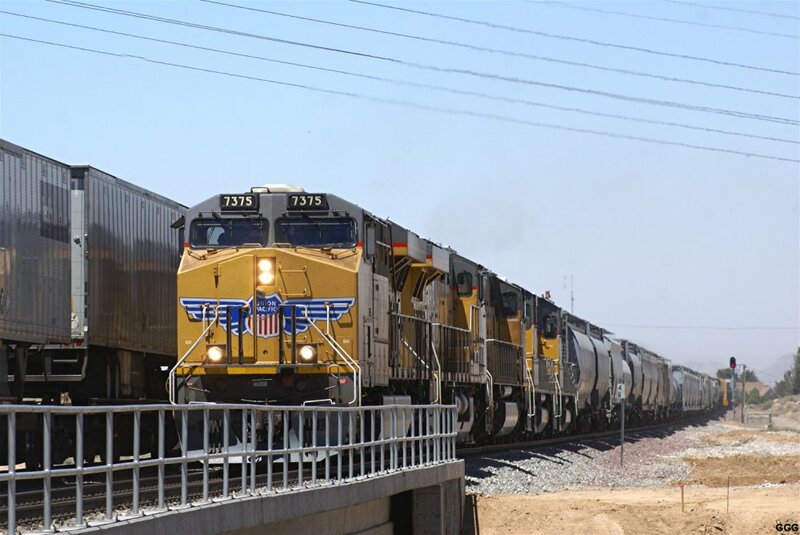 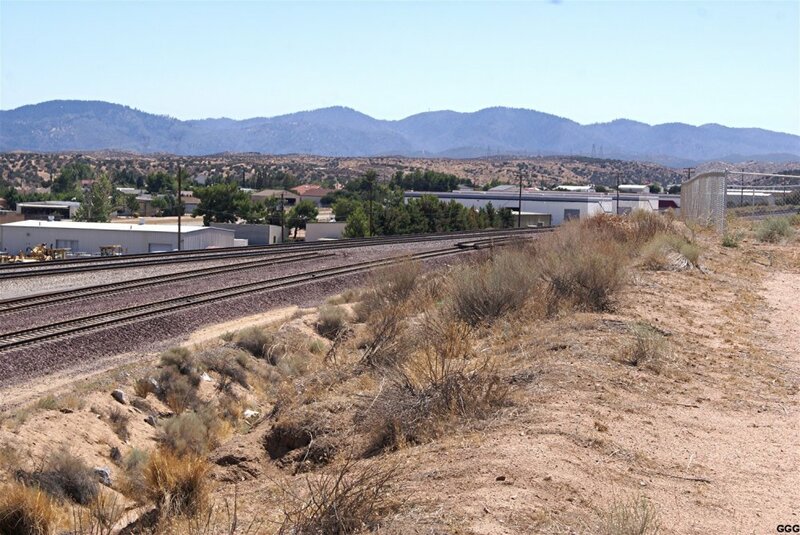 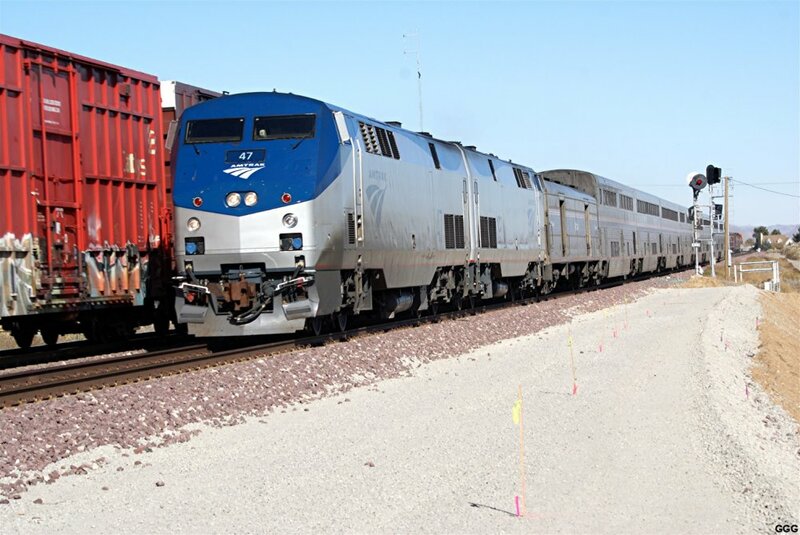 The $27 million underpass project, which was jointly funded through city, regional, state and federal dollars, will connect both sides of Ranchero Road under the Burlington Northern Santa Fe tracks. 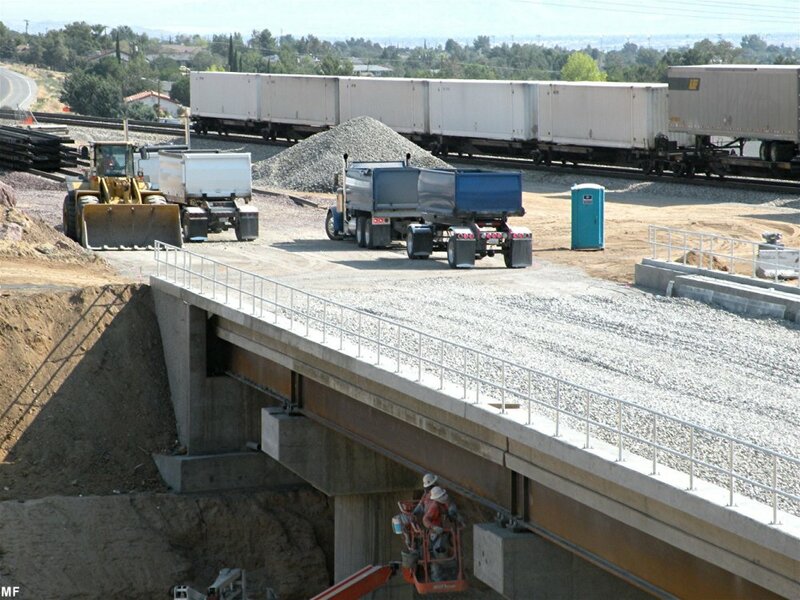 Larry McCallon, president of regional transportation authority San Bernardino Associated Governments, said the underpass’ funding includes $10.4 million in regional funds for a project that Hesperia’s city fathers envisioned years ago. 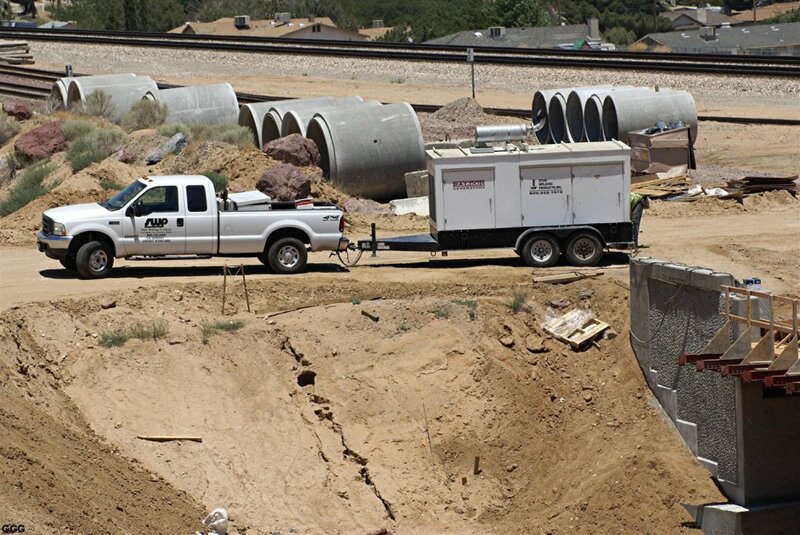 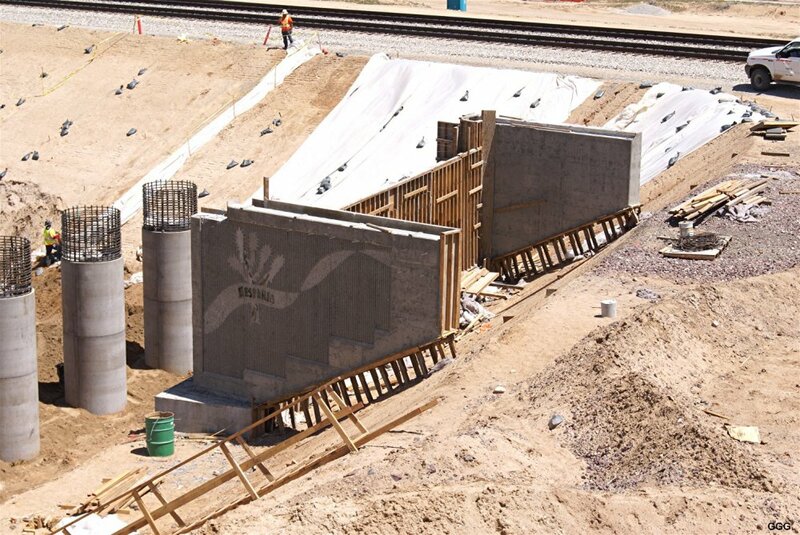 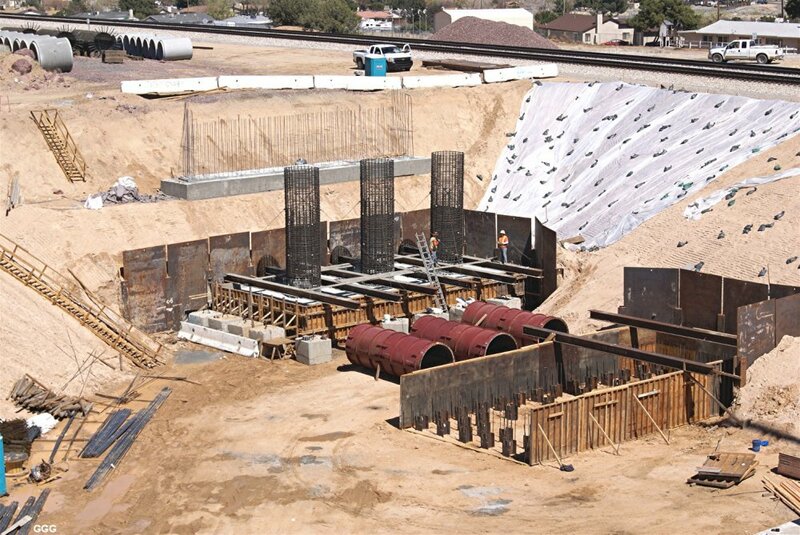 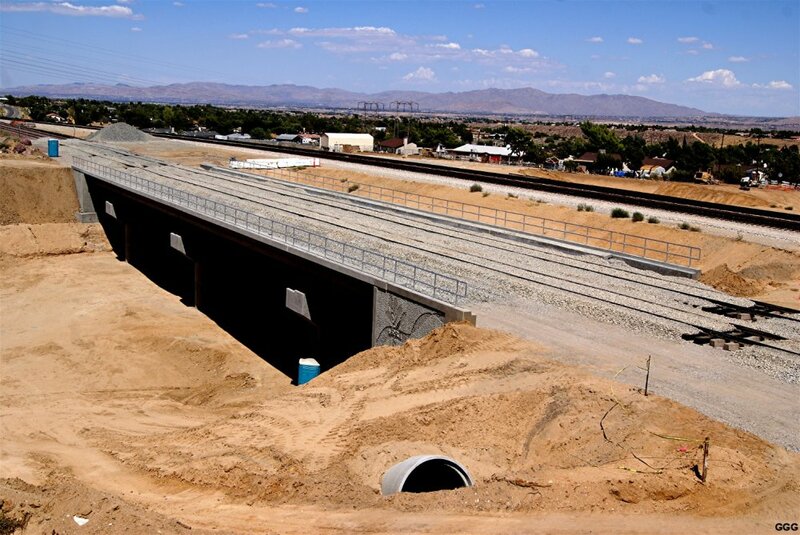 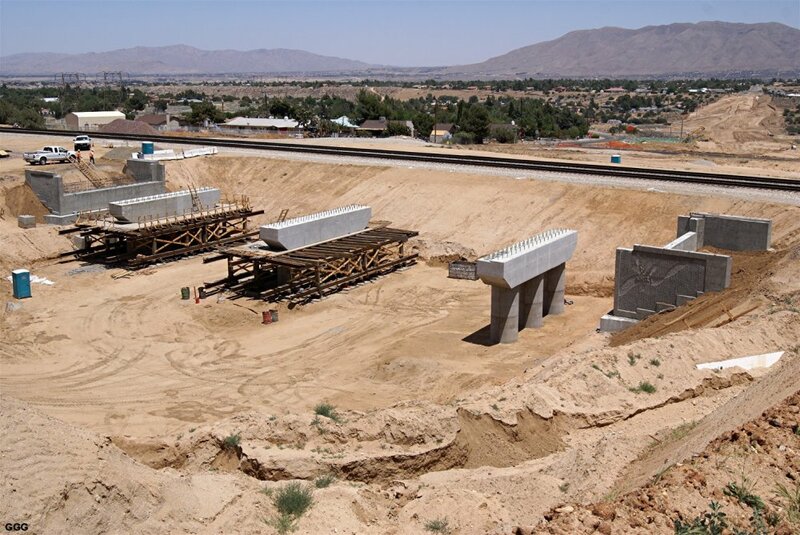 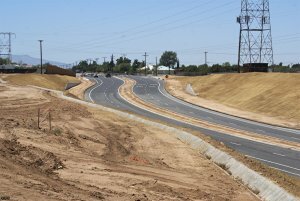 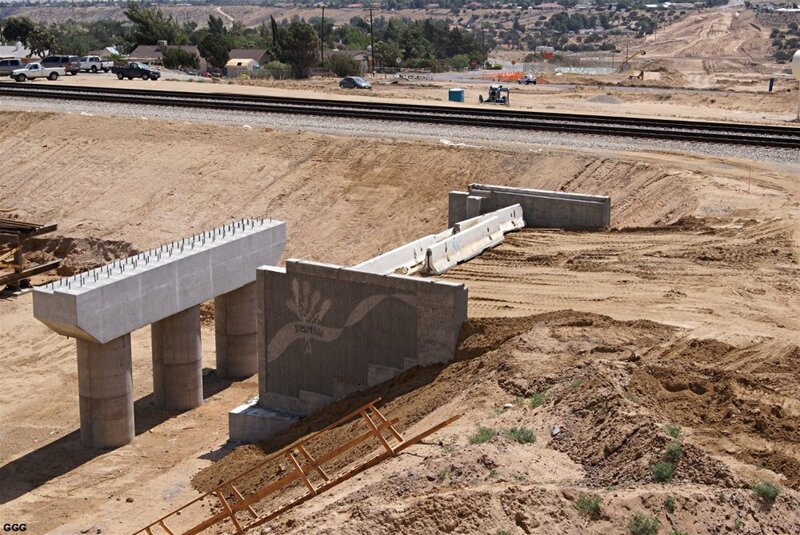 The underpass is the first phase of a planned three-phase Ranchero Road Corridor project. 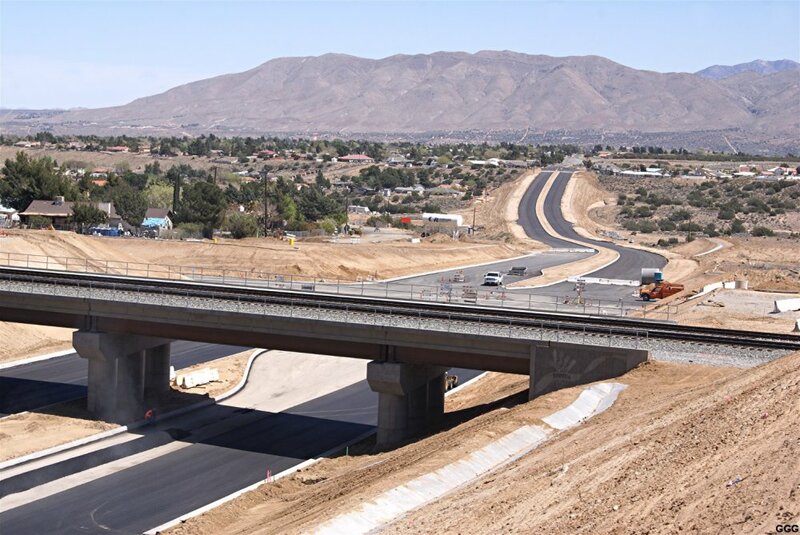 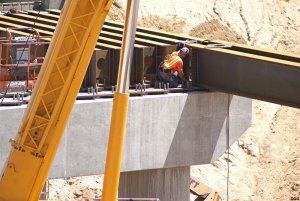 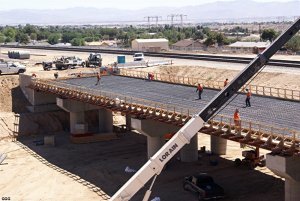 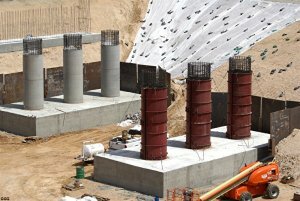 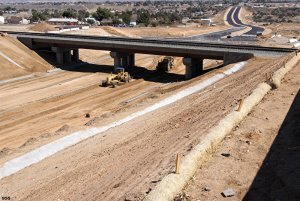 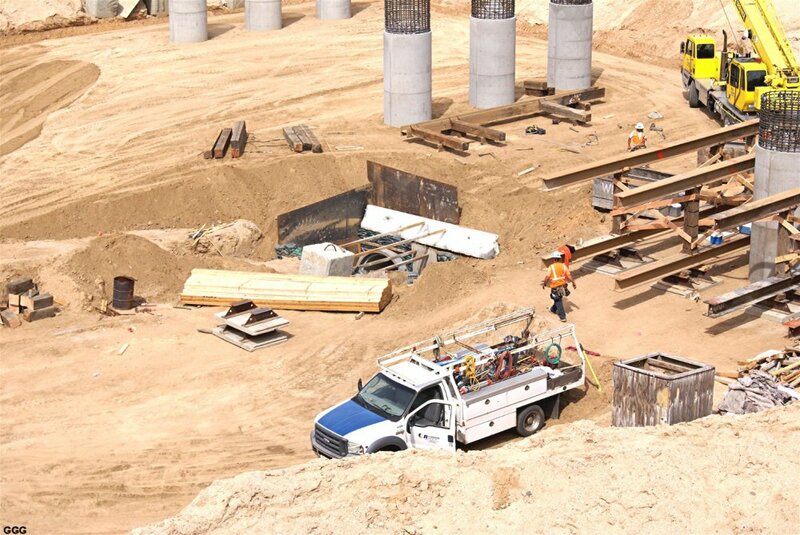 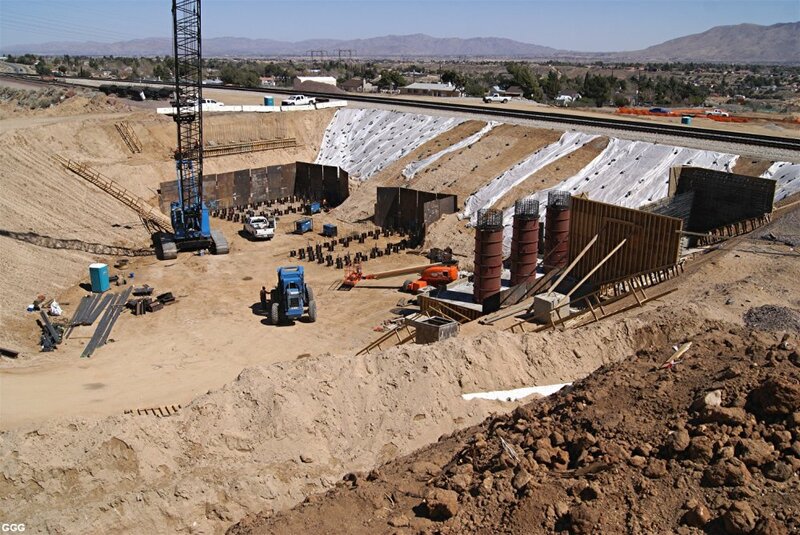 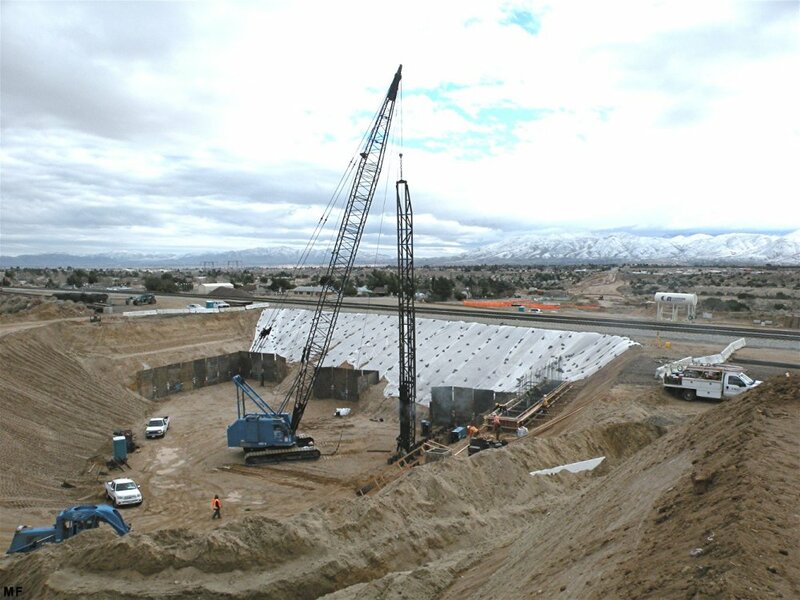 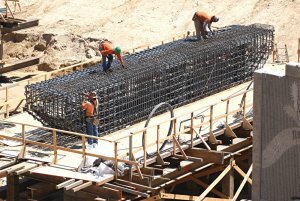 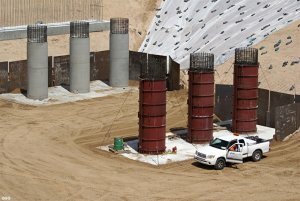 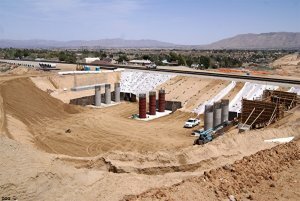 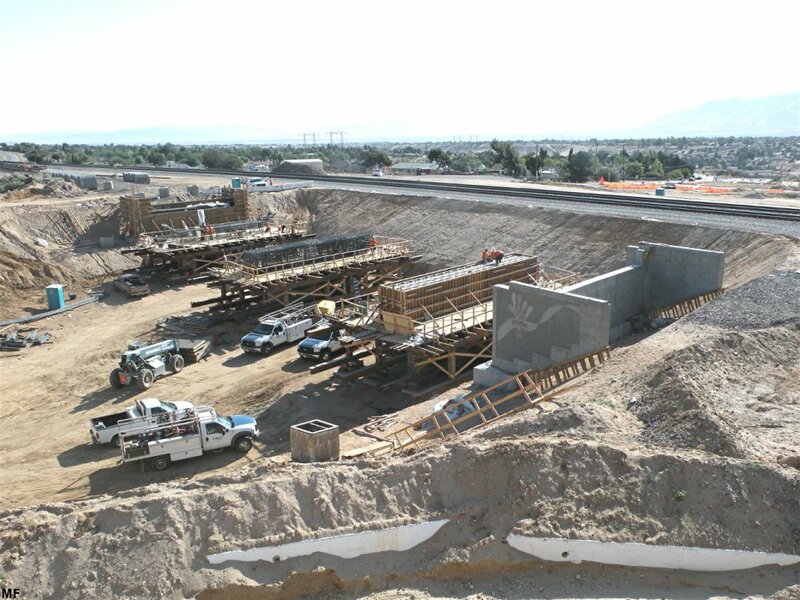 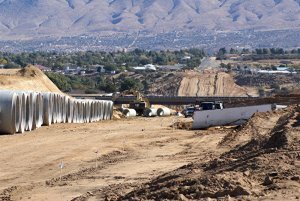 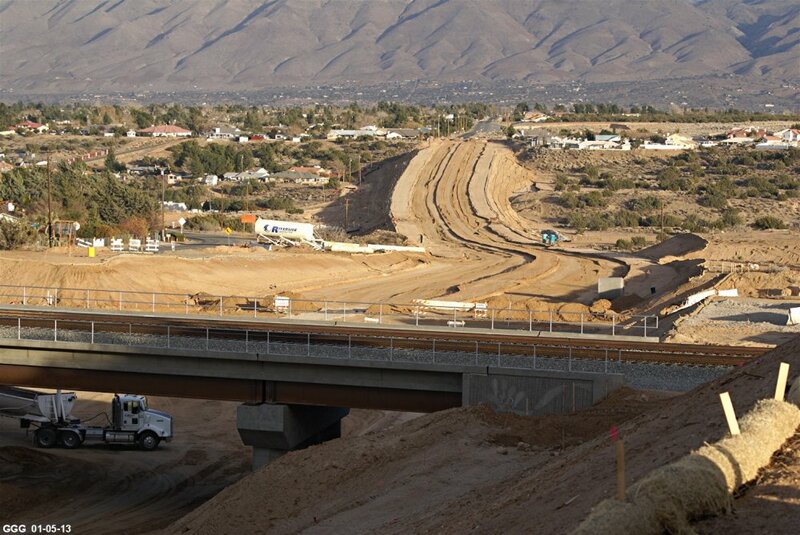 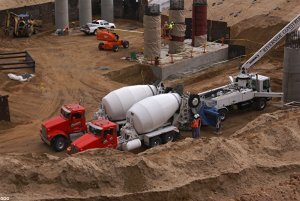 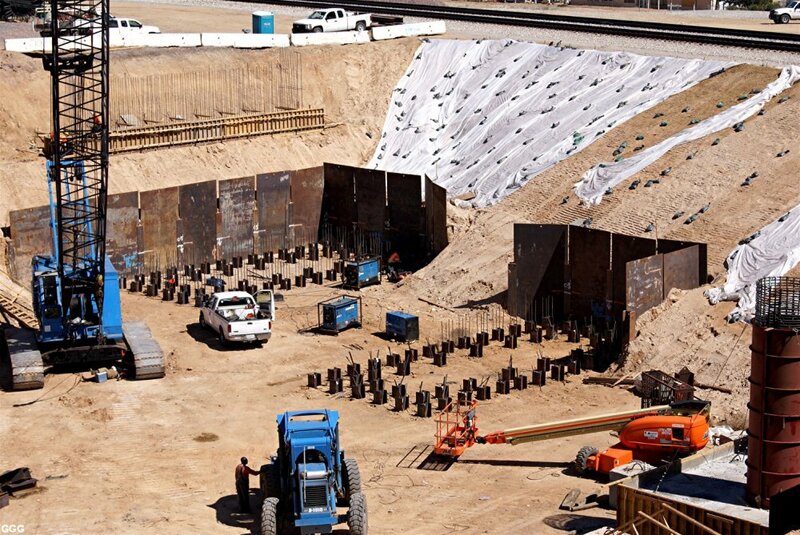 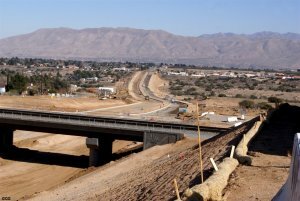 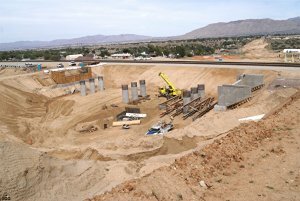 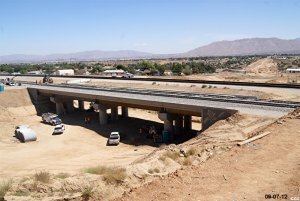 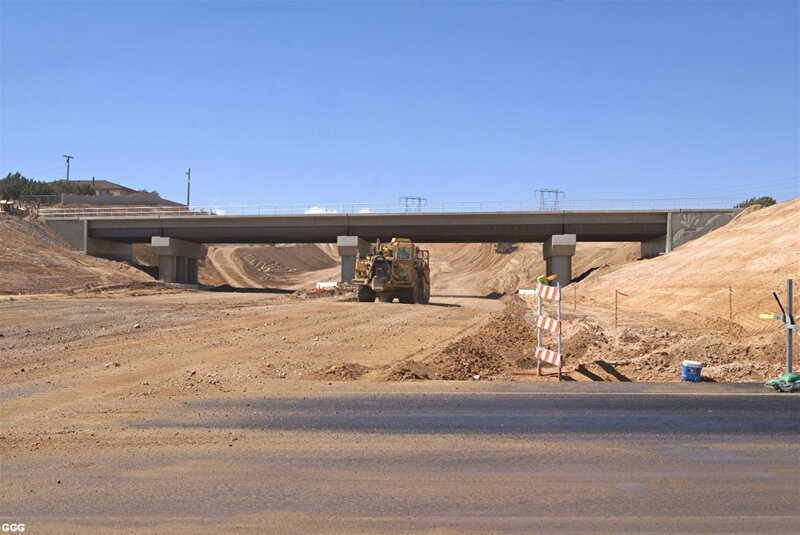 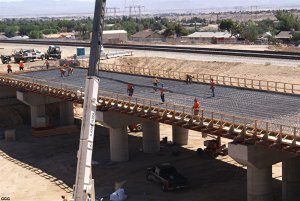 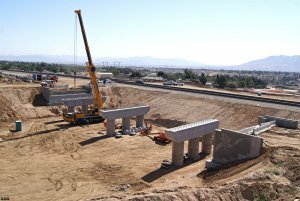 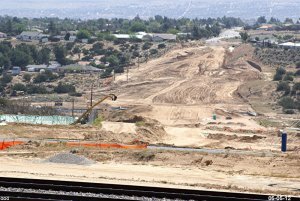 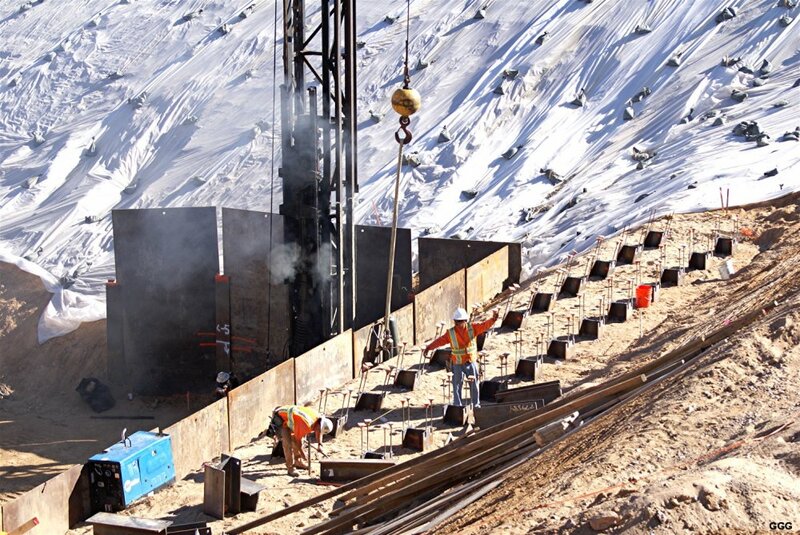 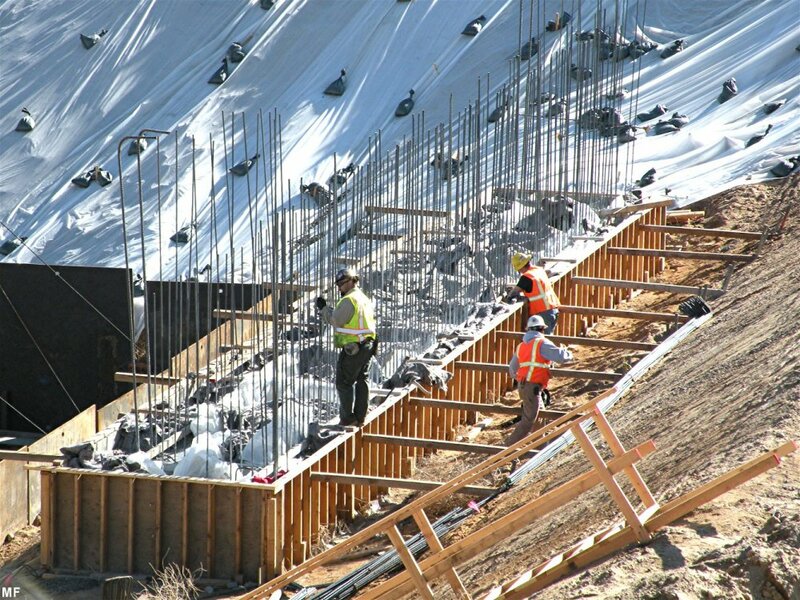 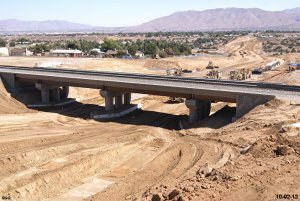 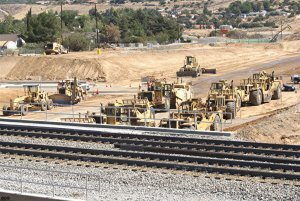 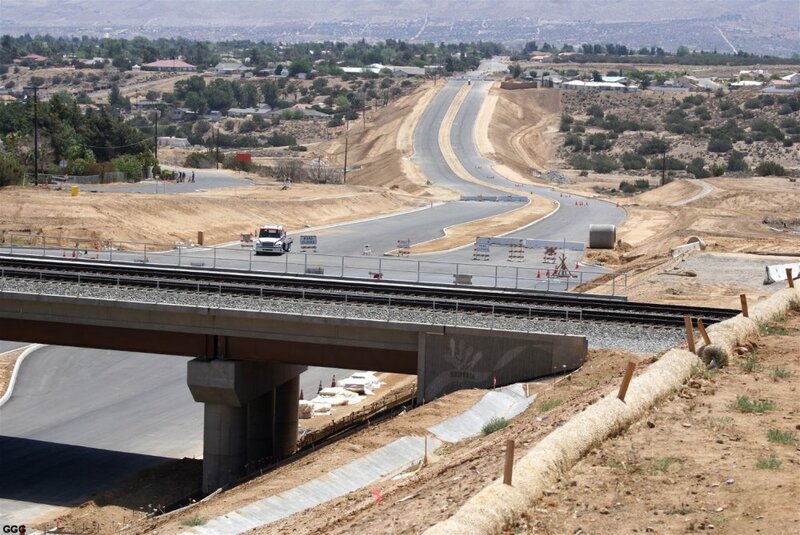 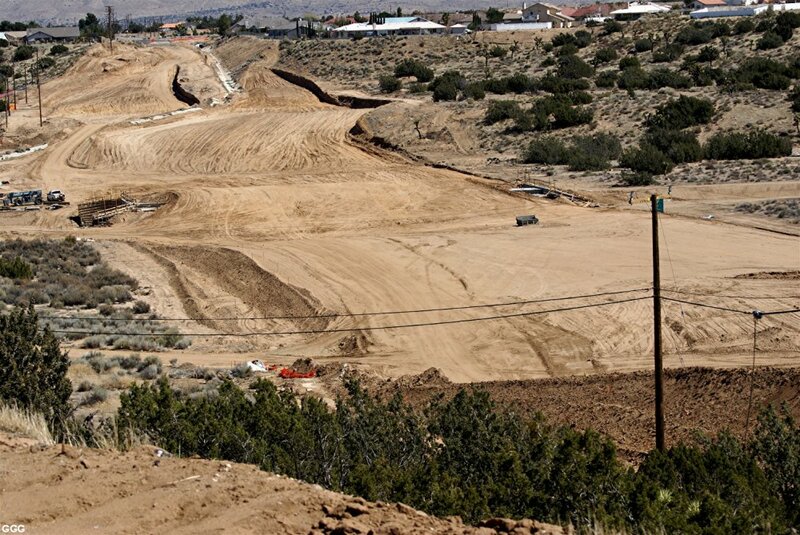 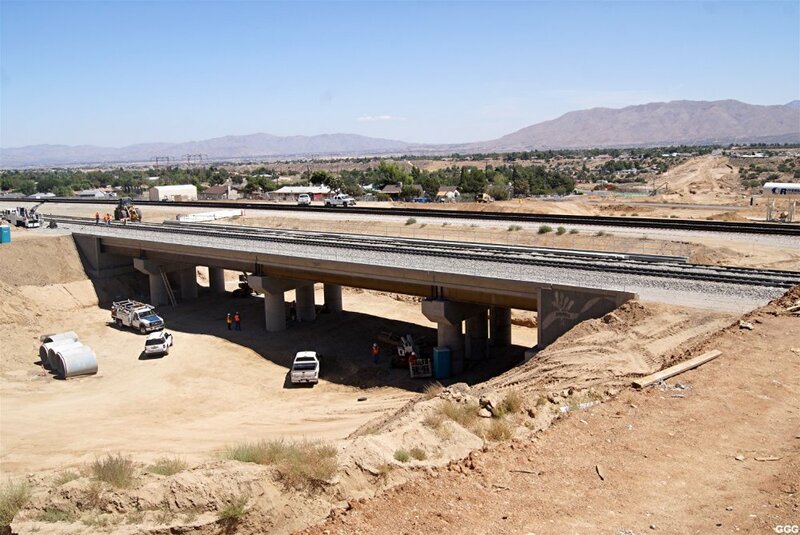 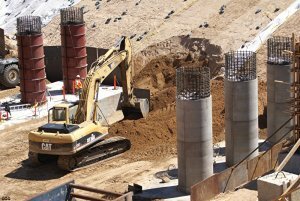 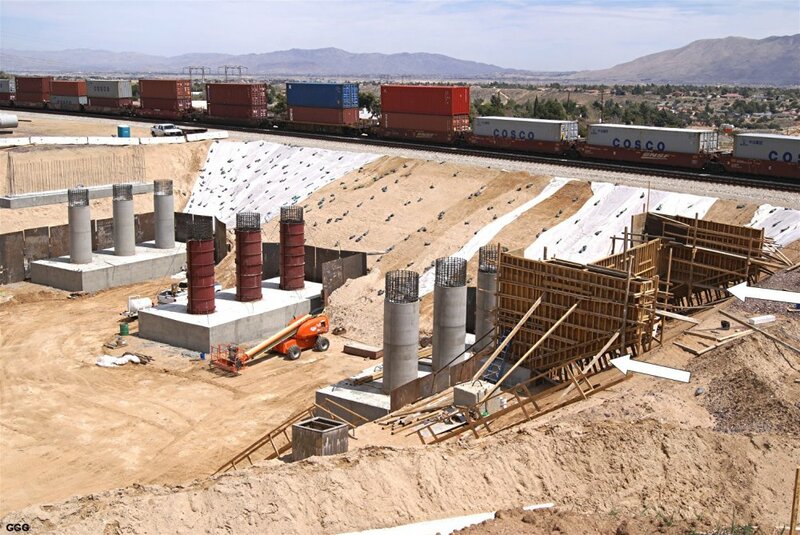 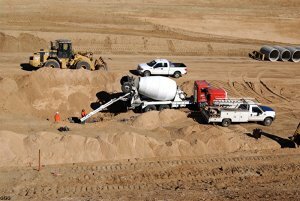 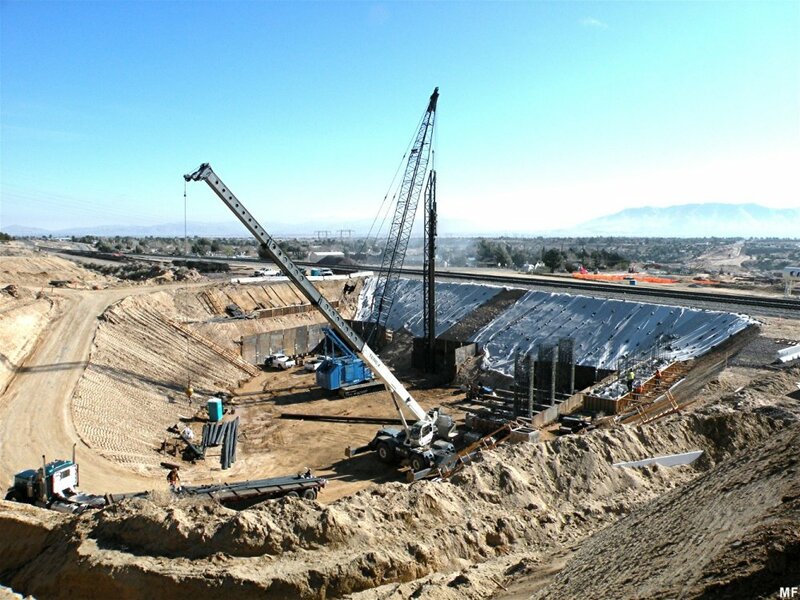 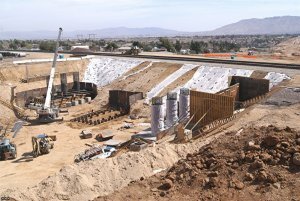 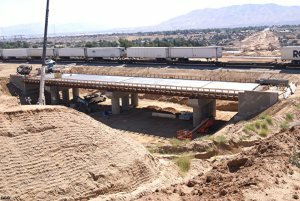 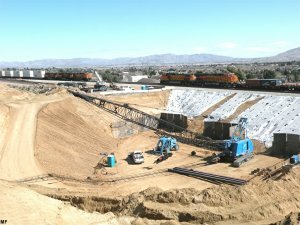 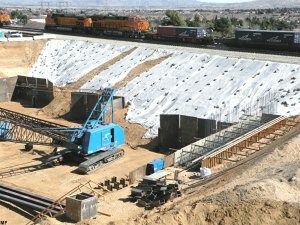 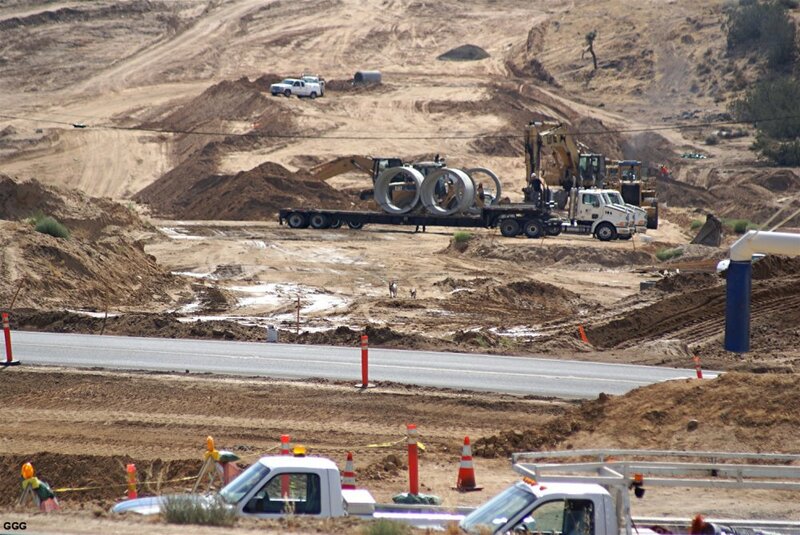 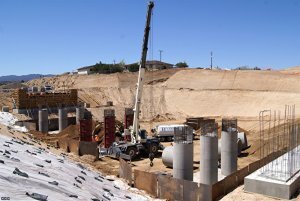 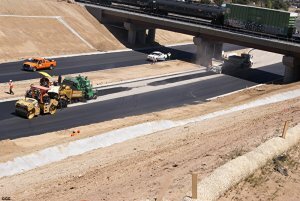 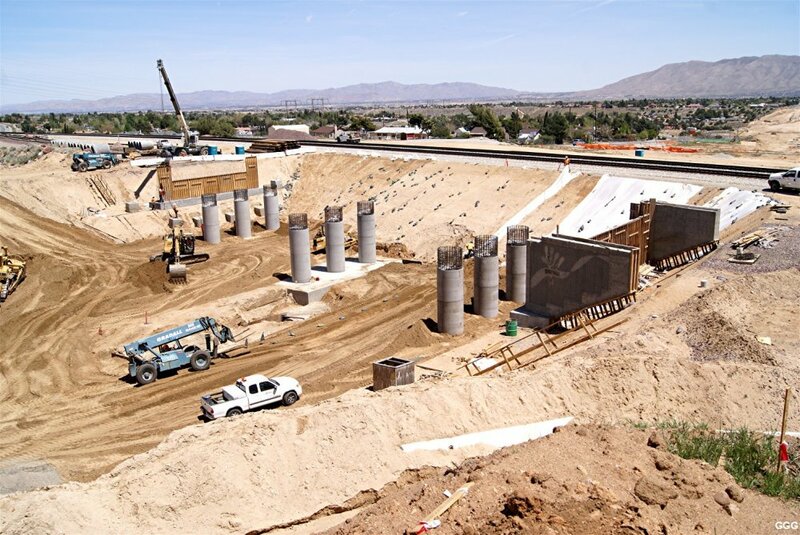 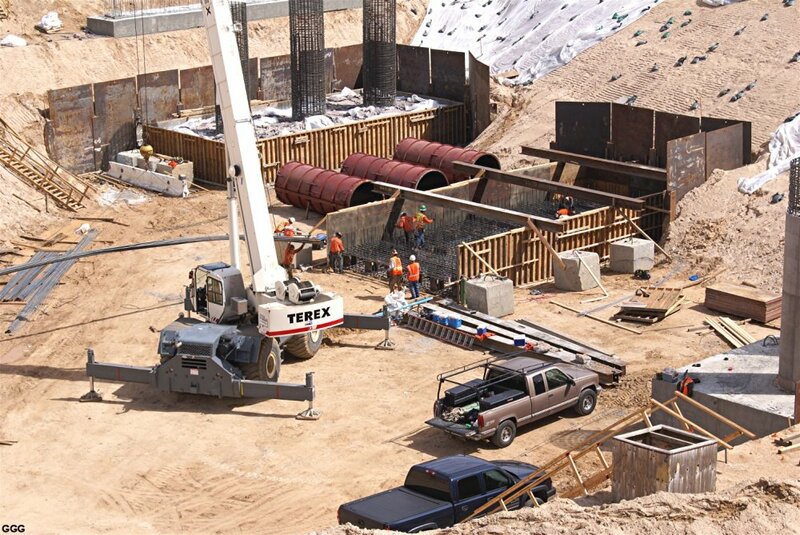 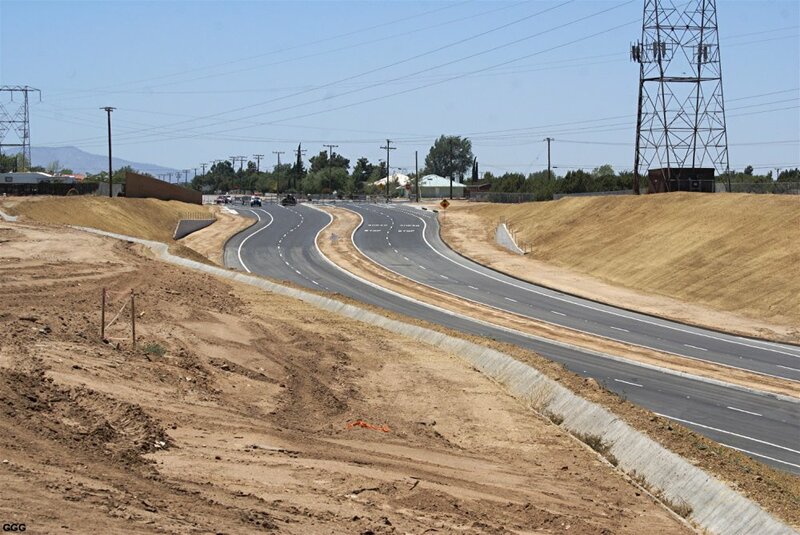 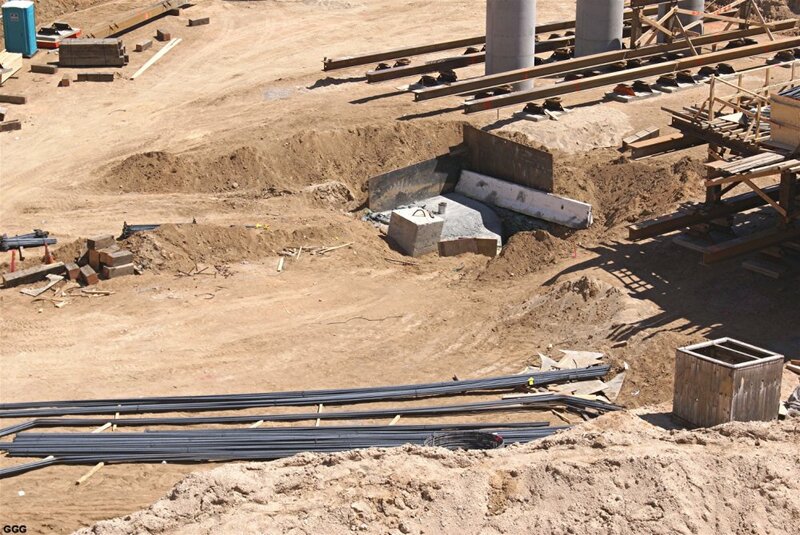 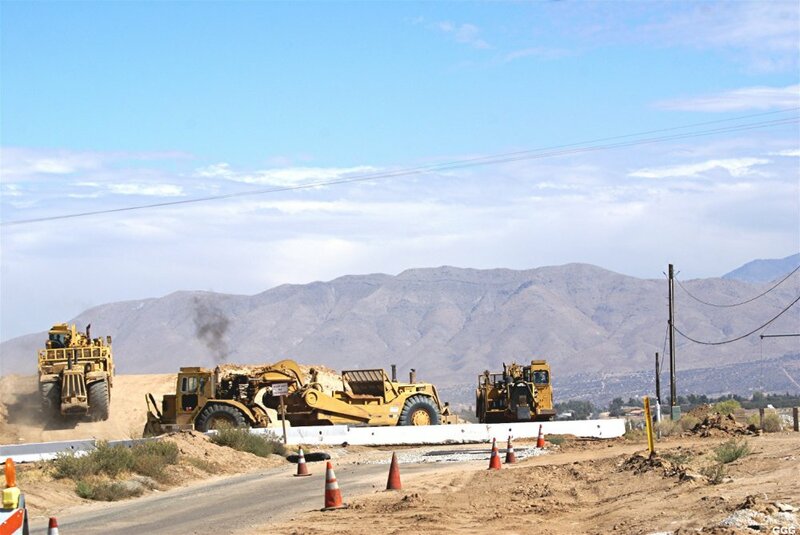 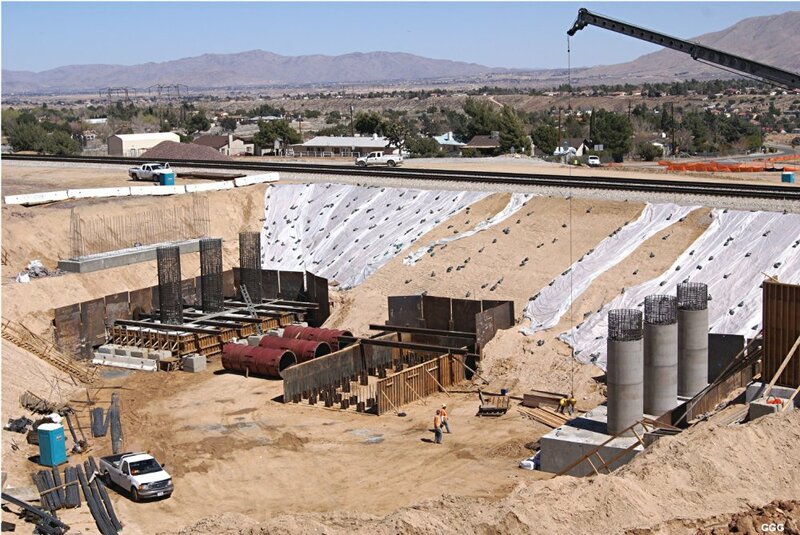 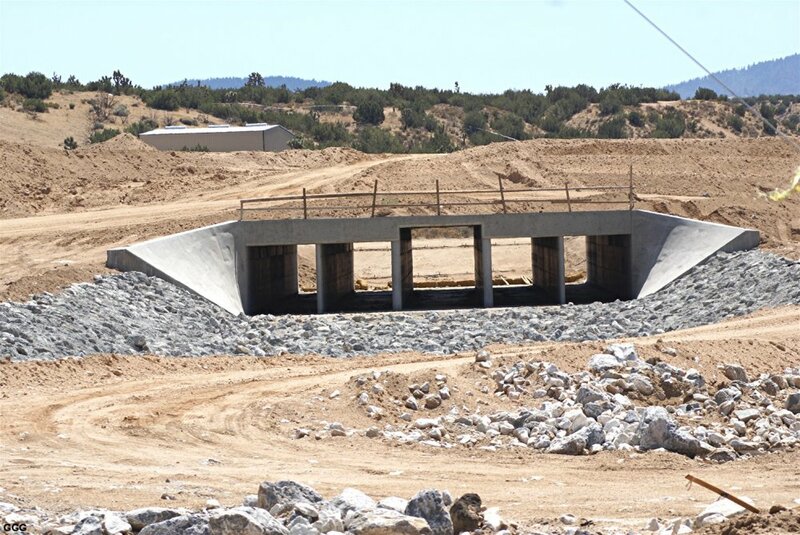 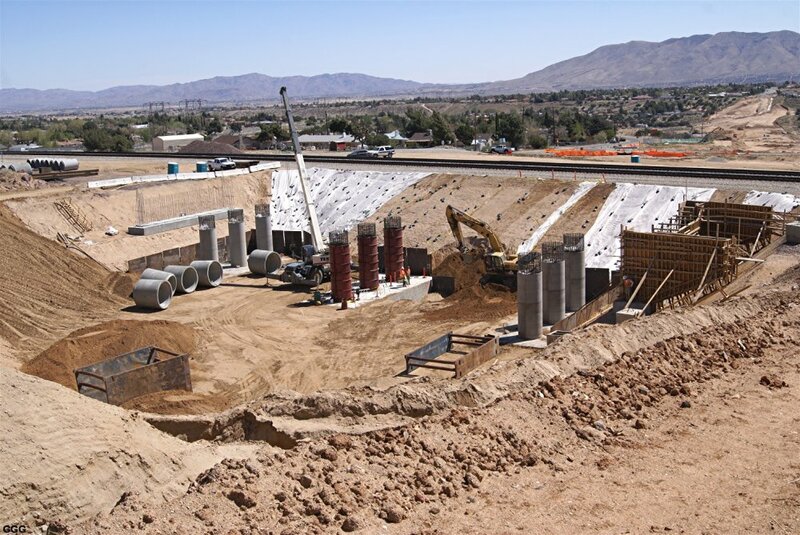 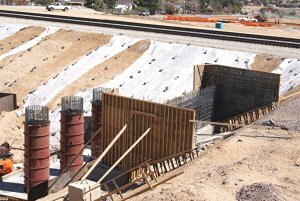 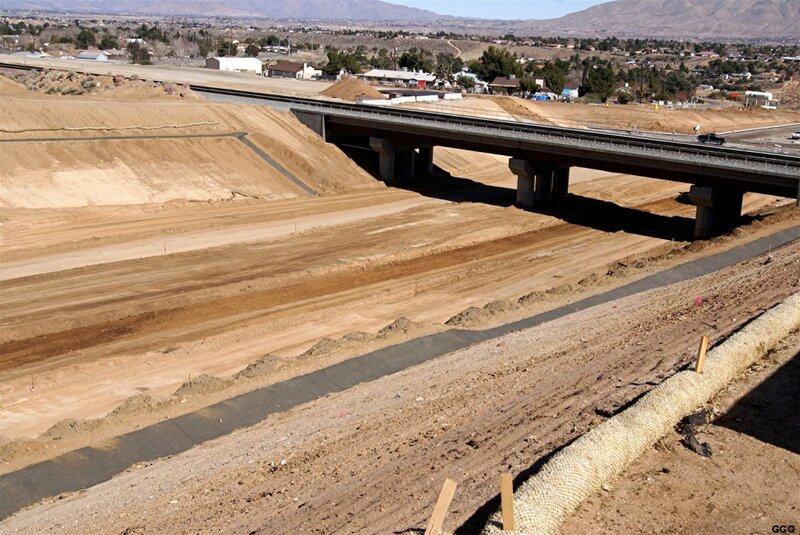 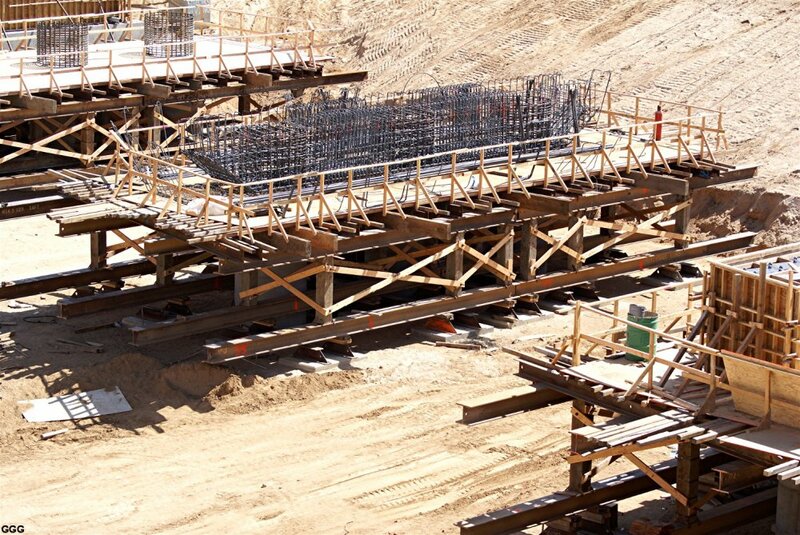 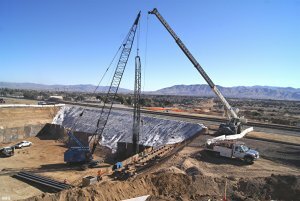 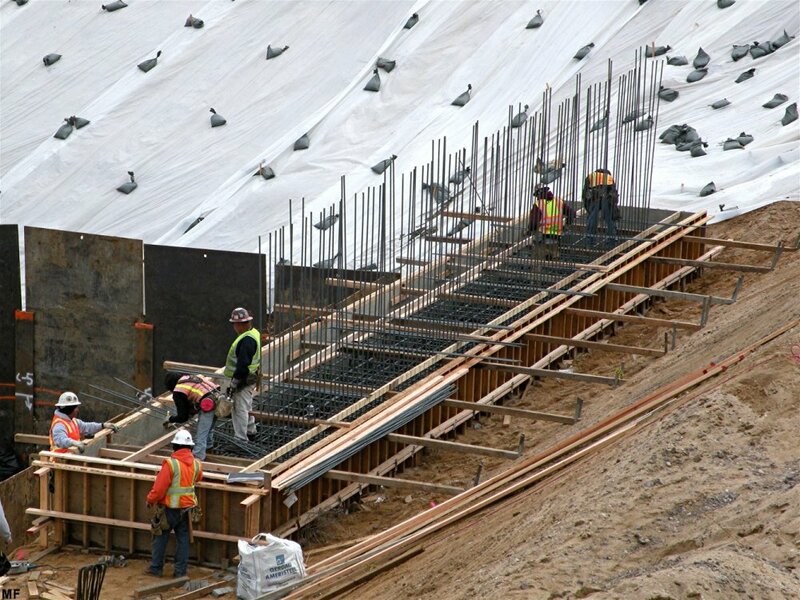 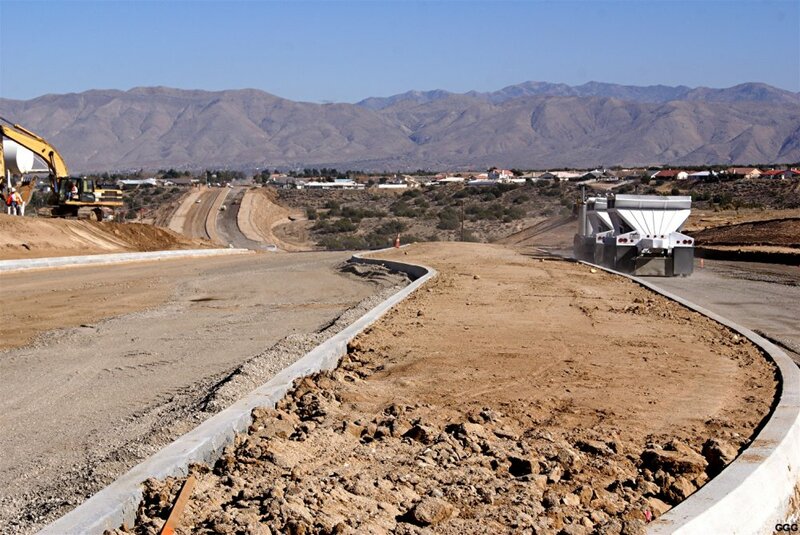 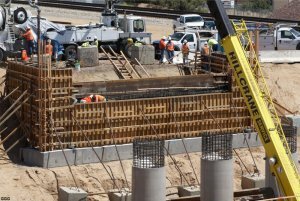 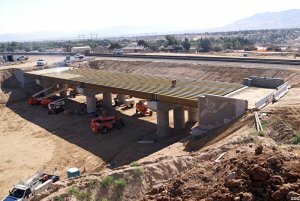 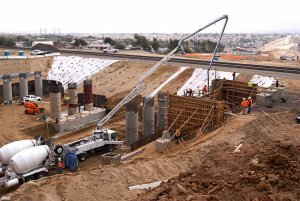 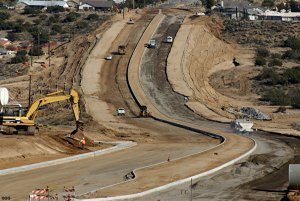 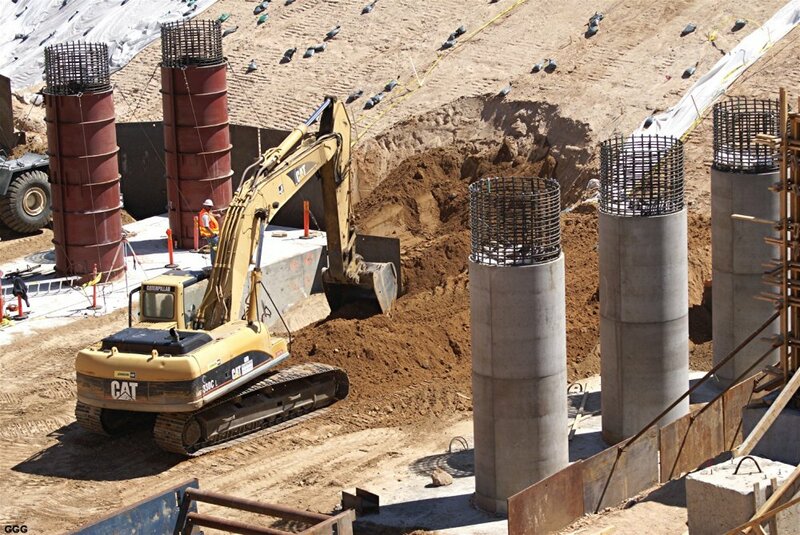 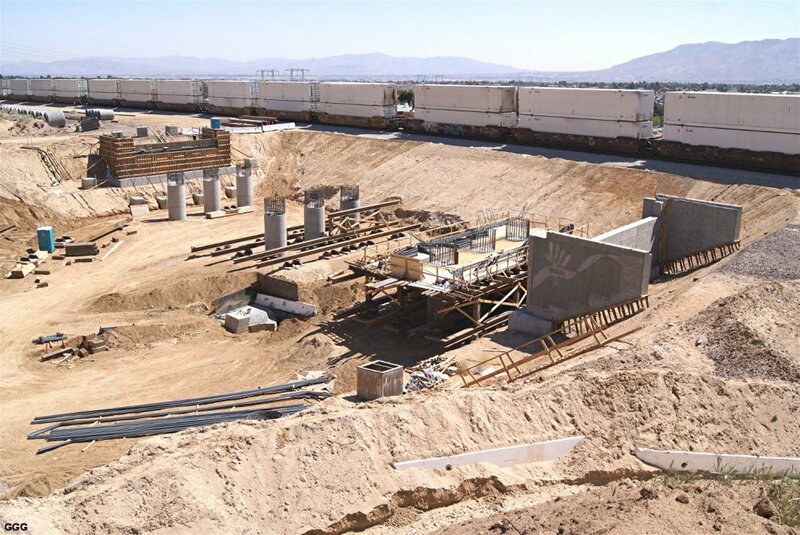 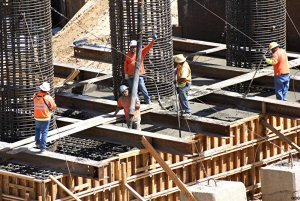 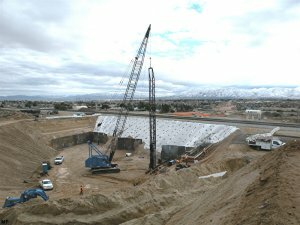 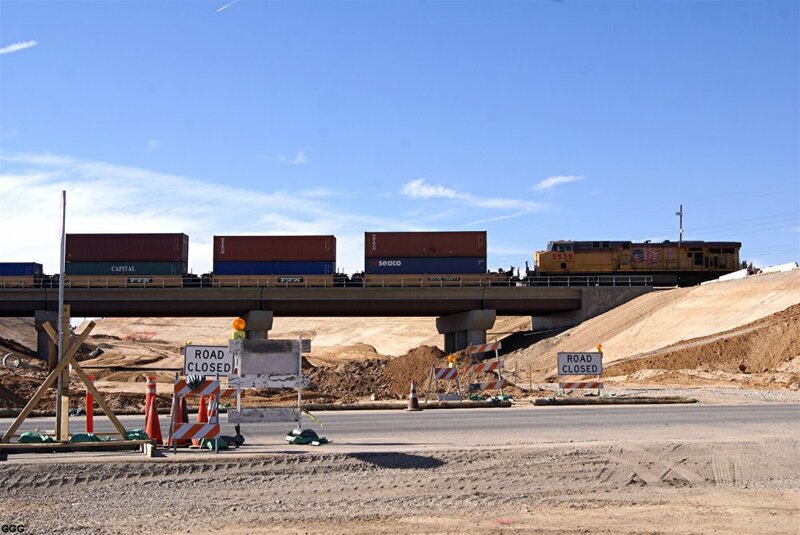 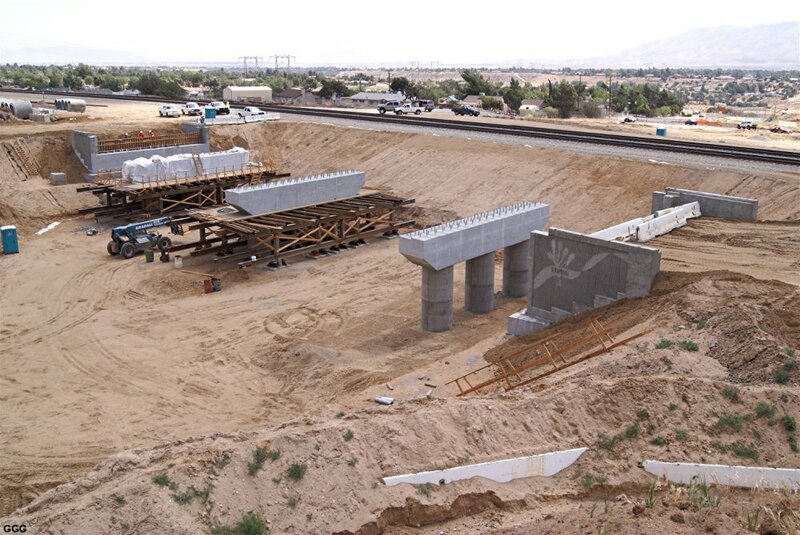 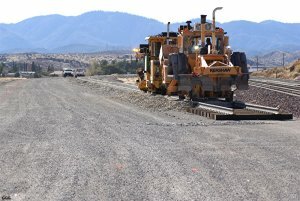 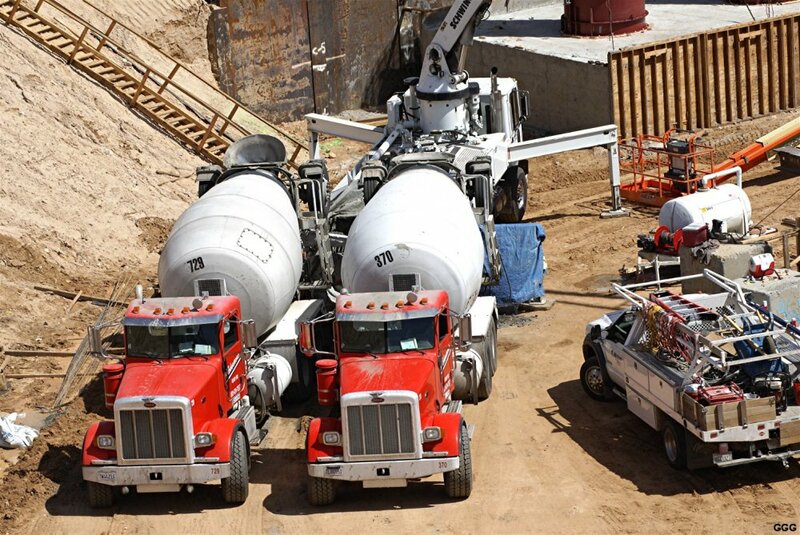 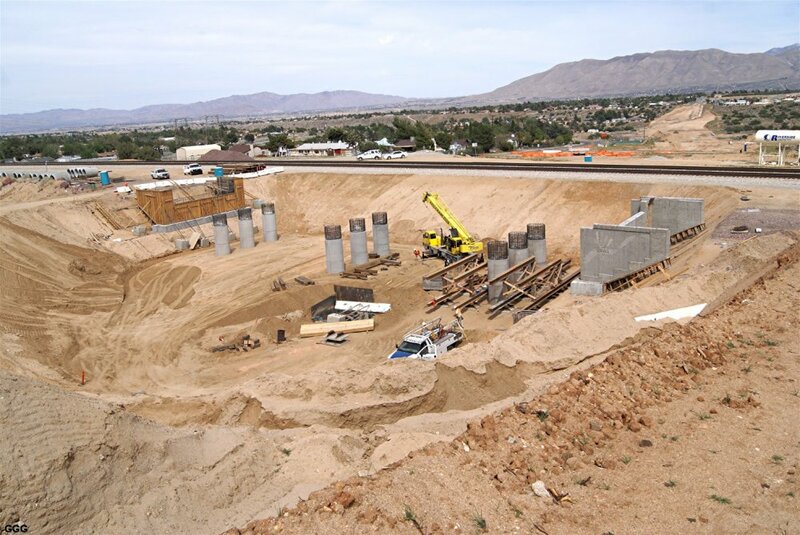 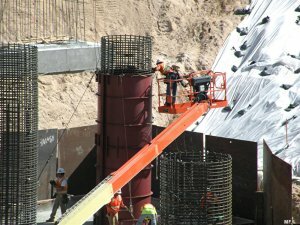 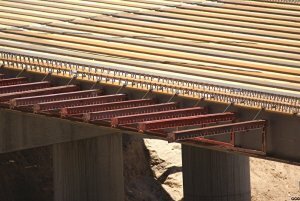 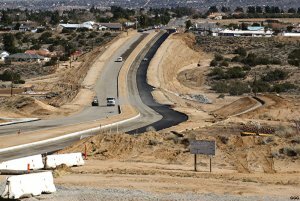 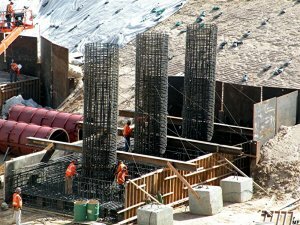 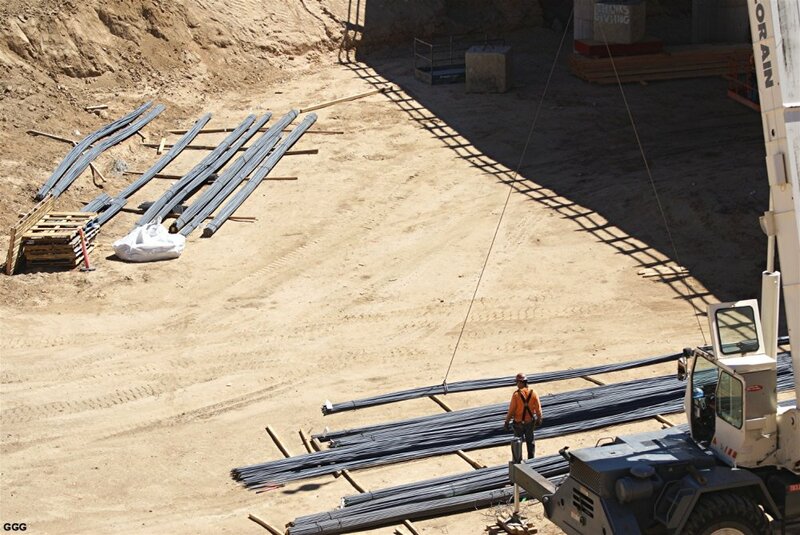 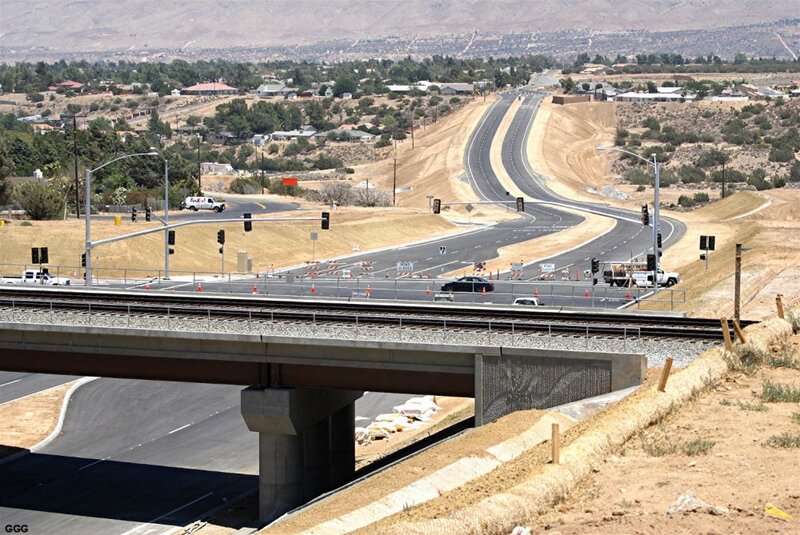 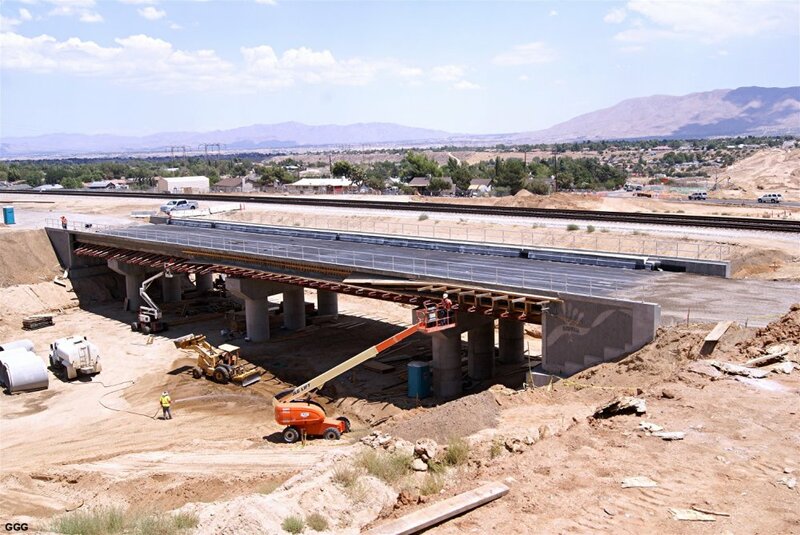 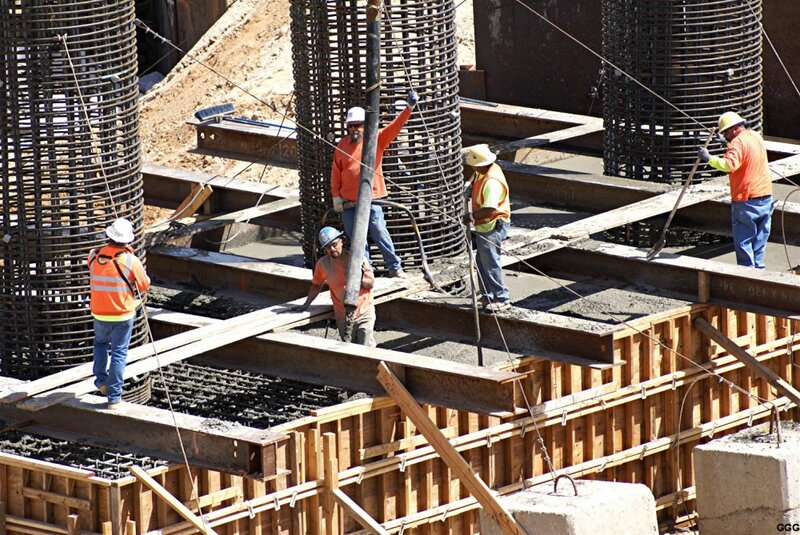 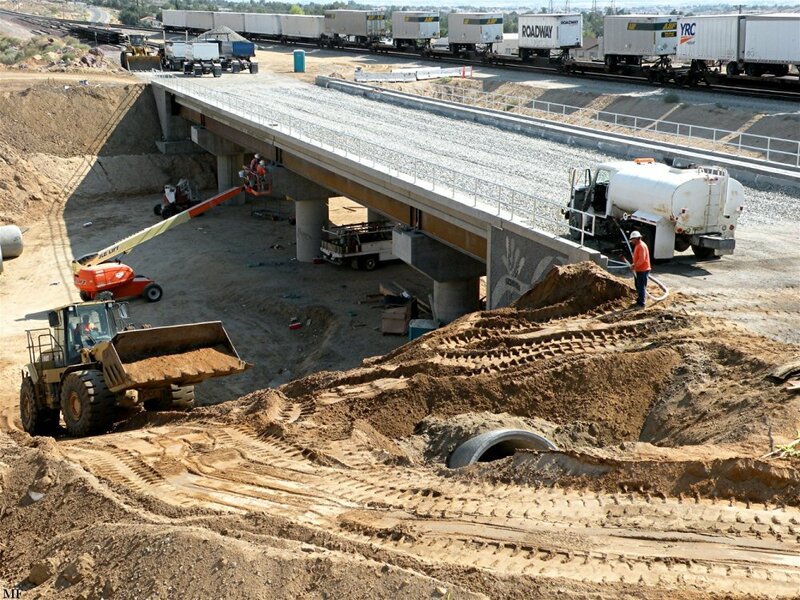 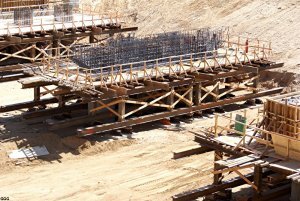 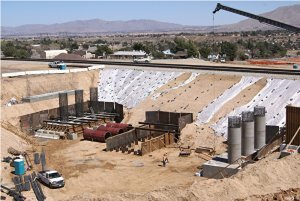 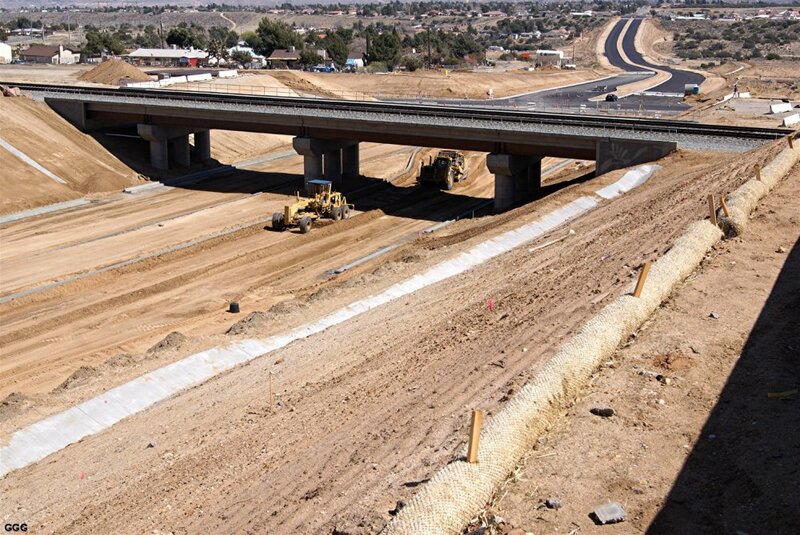 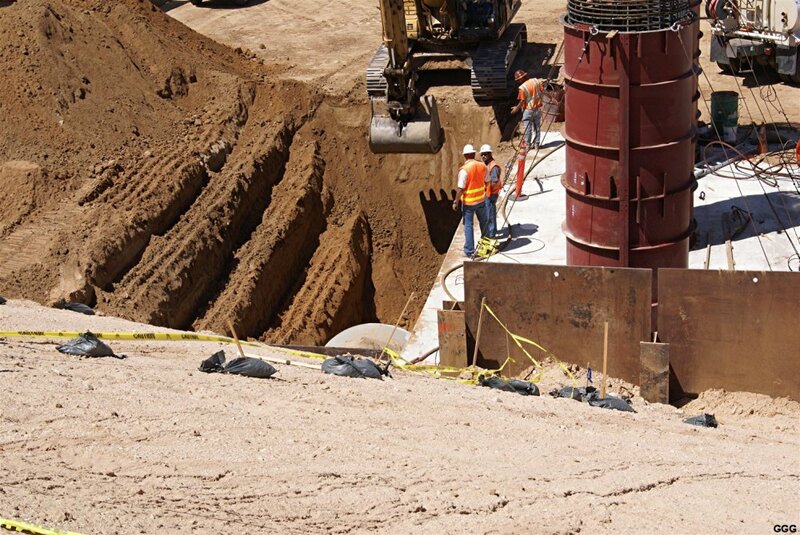 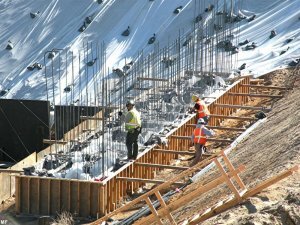 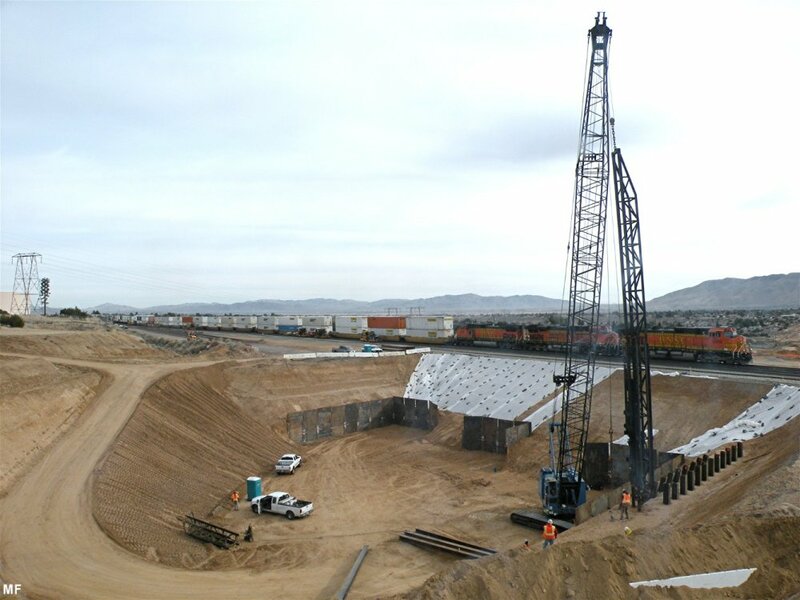 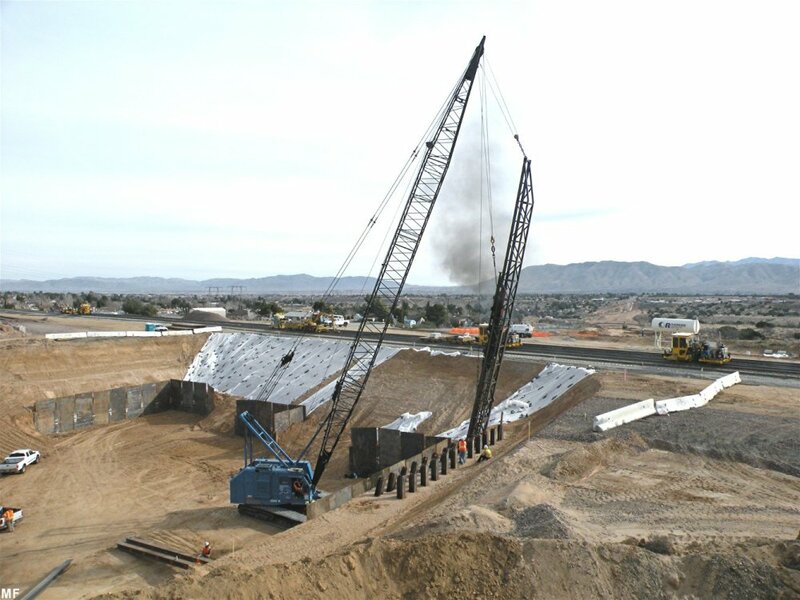 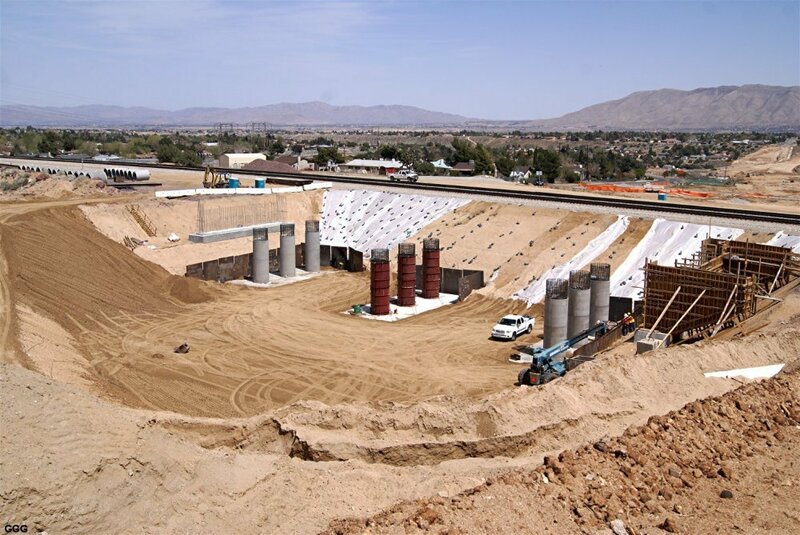 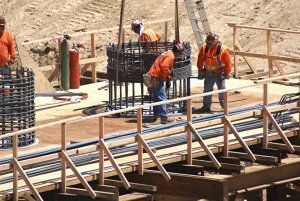 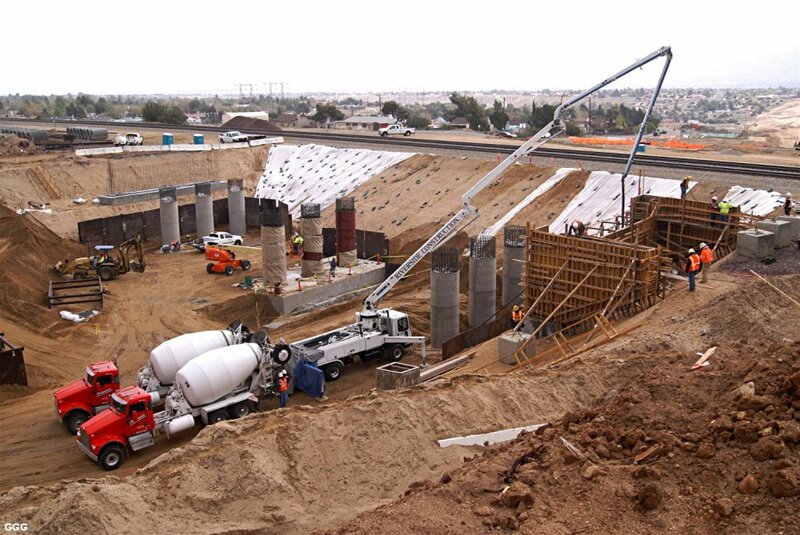 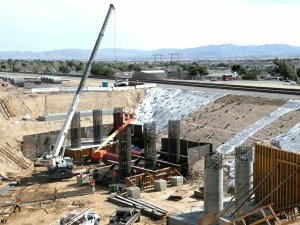 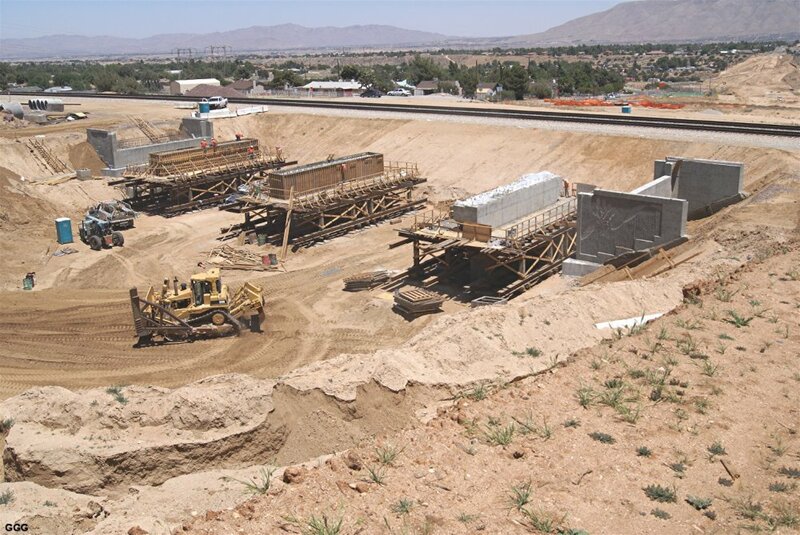 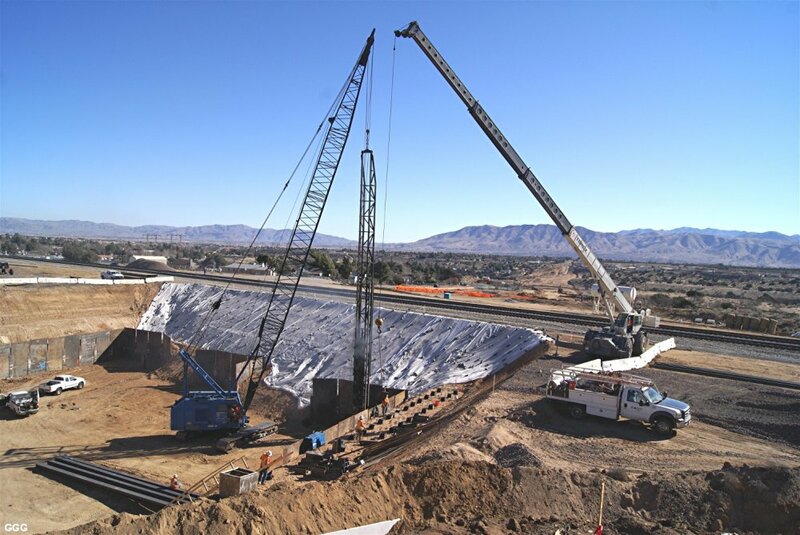 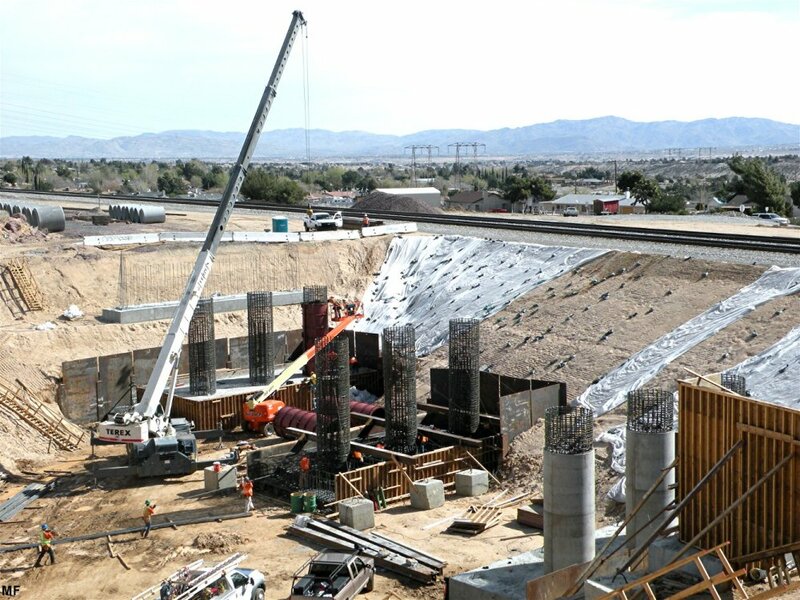 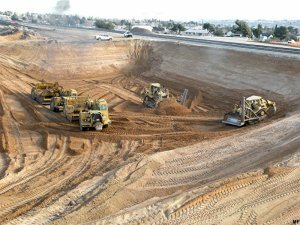 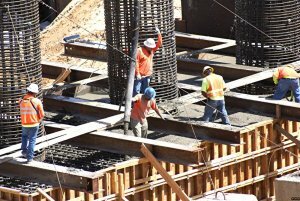 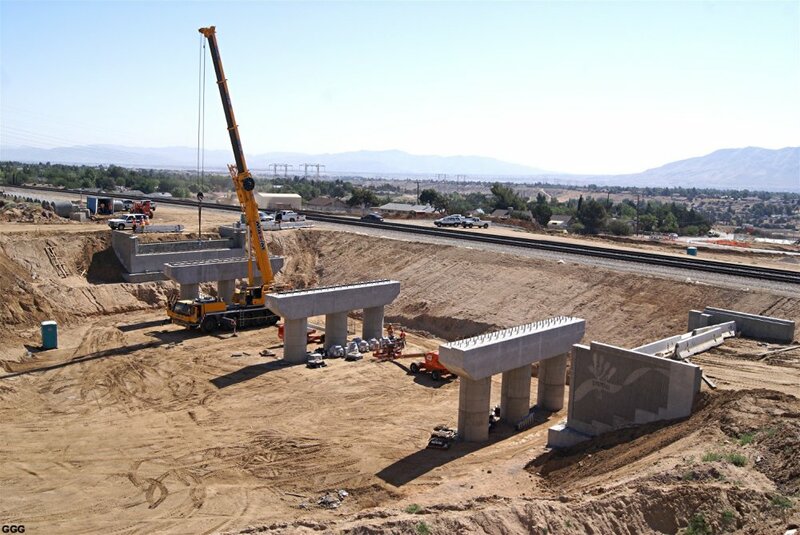 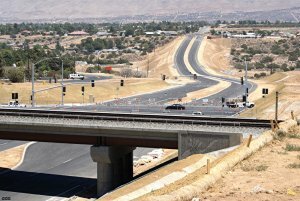 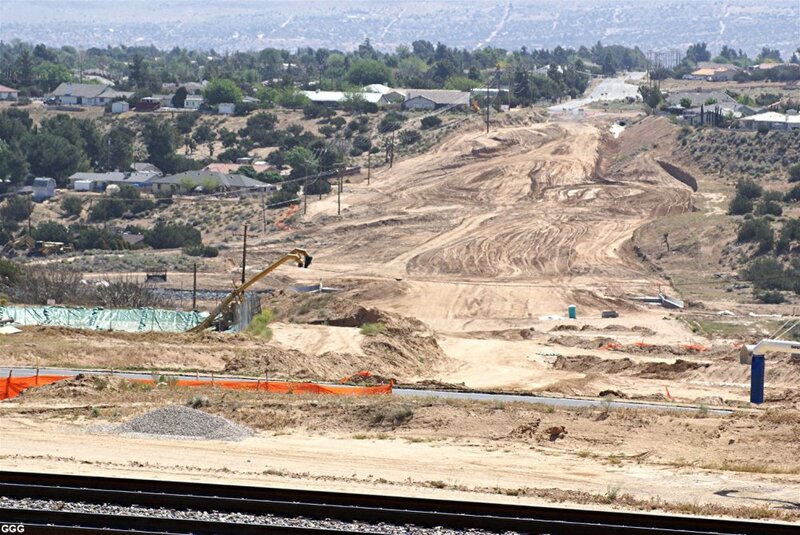 Construction of the Ranchero Road/Interstate 15 interchange, which broke ground in January, and the future widening of the road from the interchange to the underpass are also part of the multi-phase project. Jane Dreher, spokeswoman for SANBAG, said the $59 million interchange project is well on its way to a completion date in early 2015. 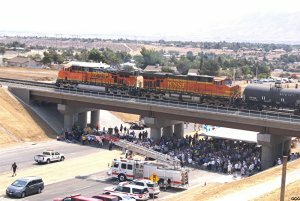 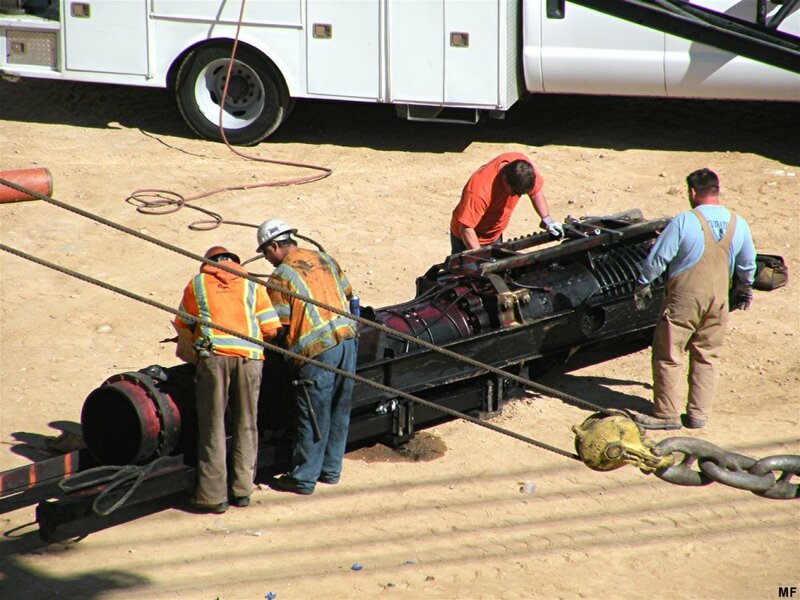 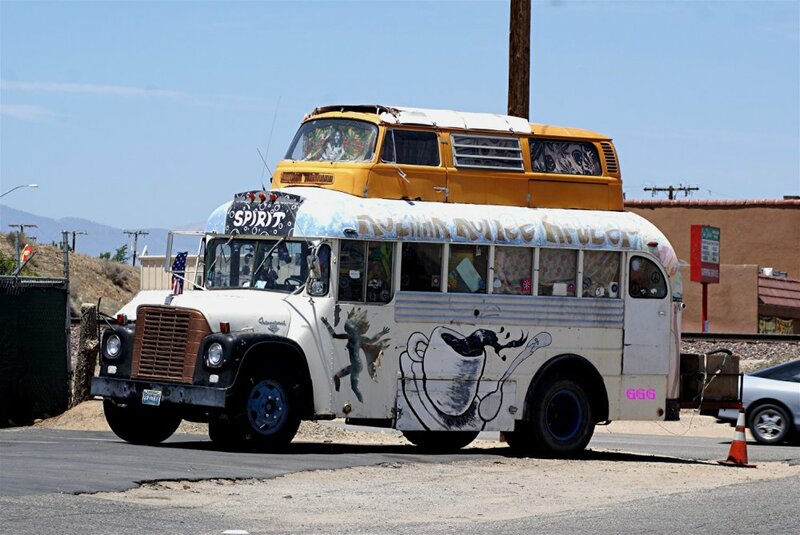 The city will continue to celebrate its anniversary in September, as it partners with the Hesperia Recreation and Park District to celebrate the district’s 65th Annual Hesperia Days festivities. 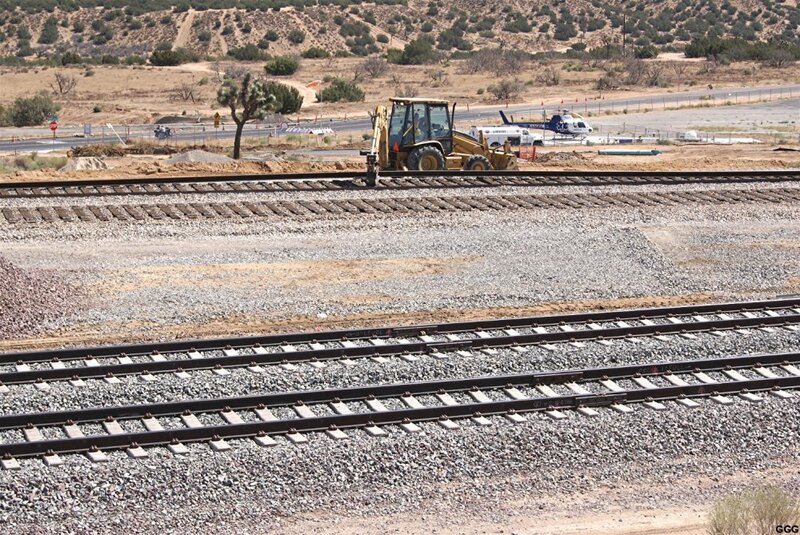 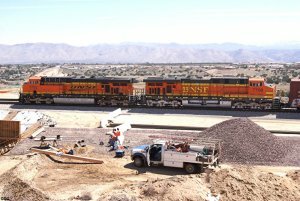 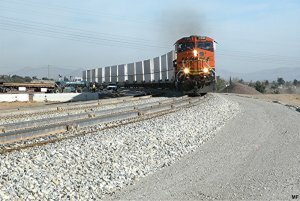 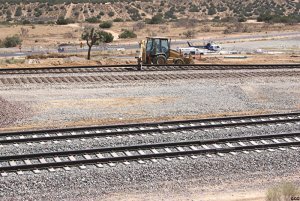 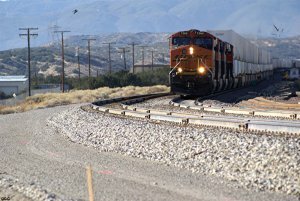 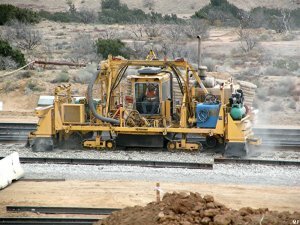 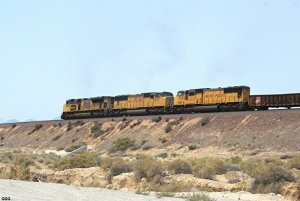 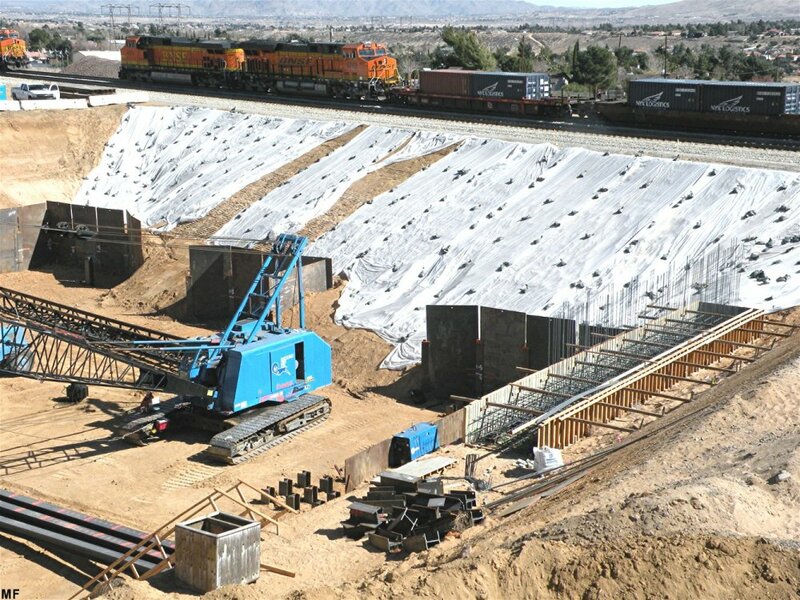 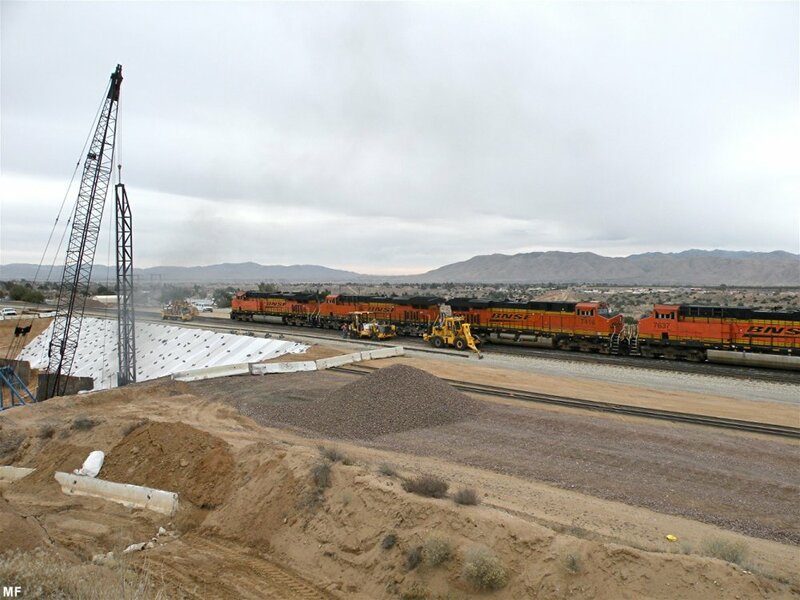 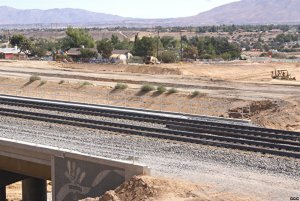 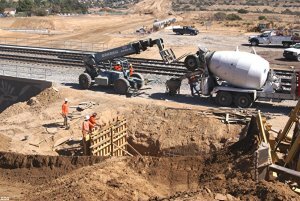 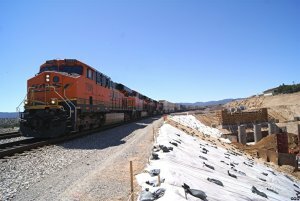 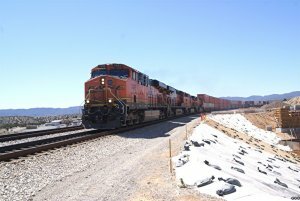 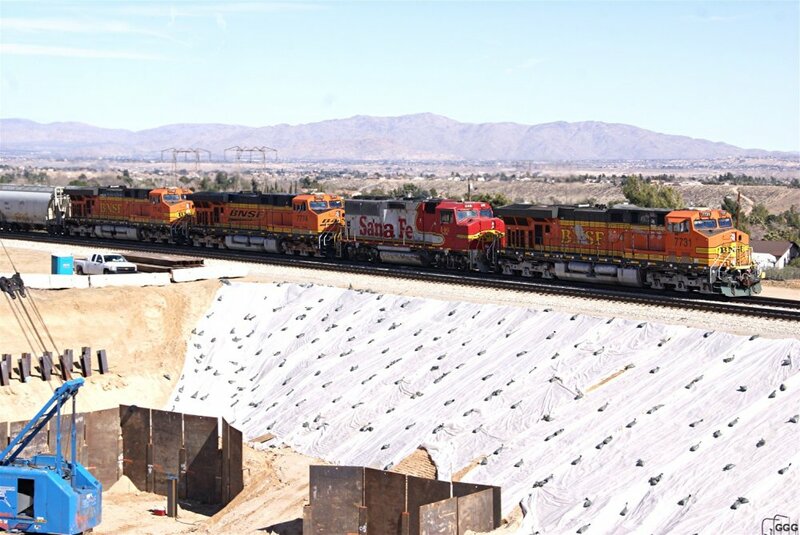 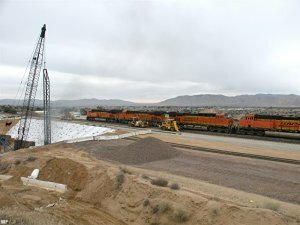 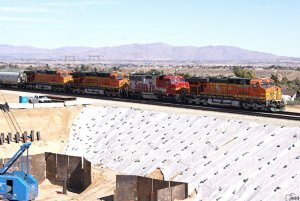 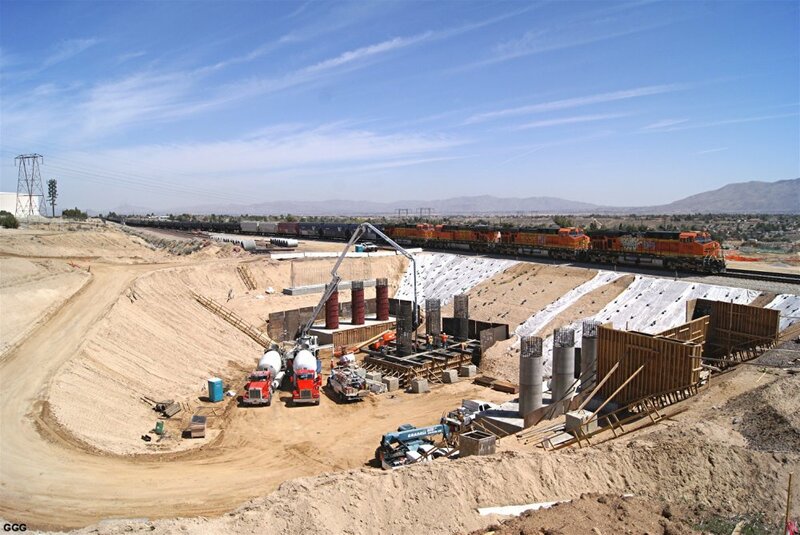 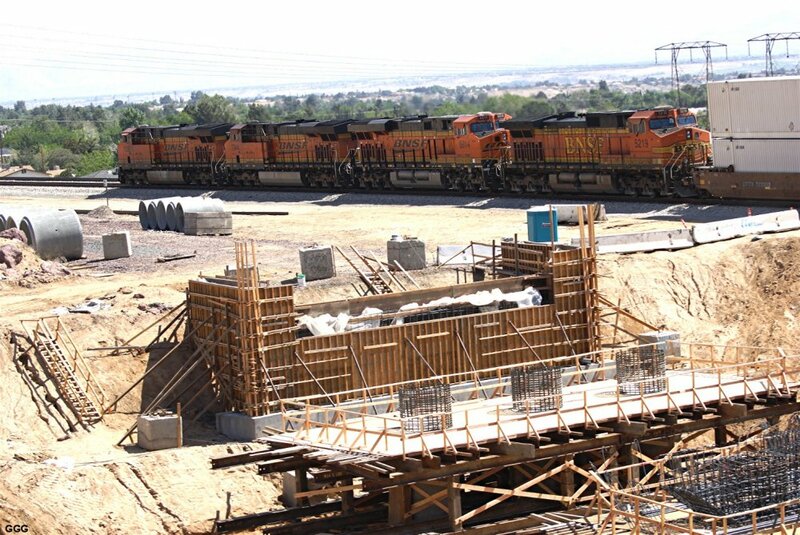 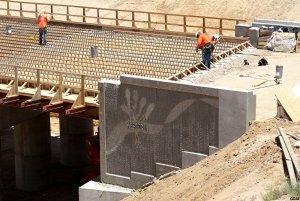 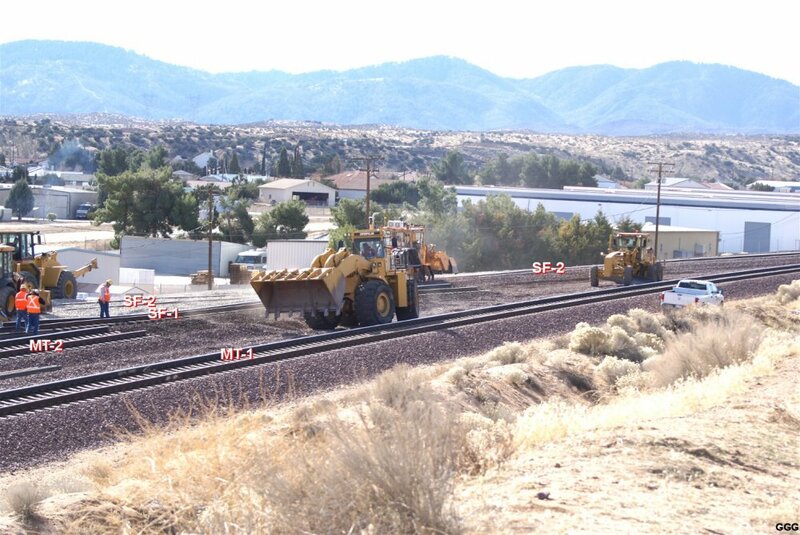 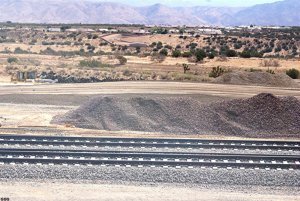 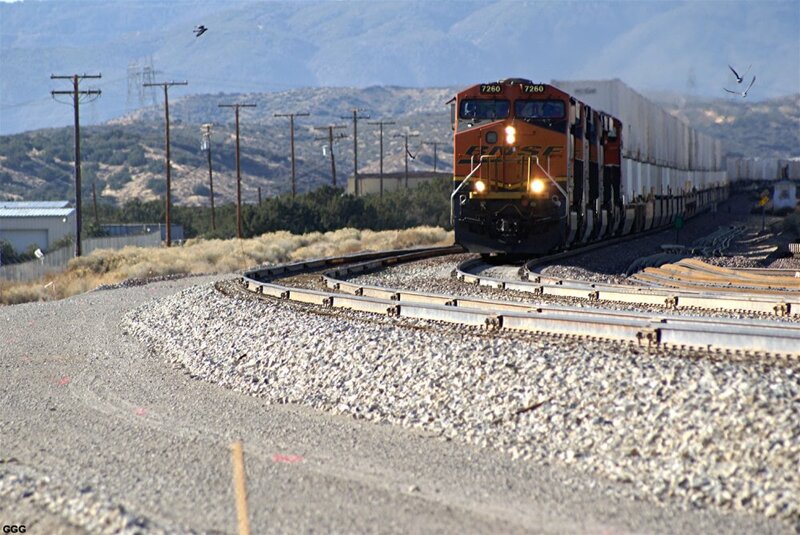 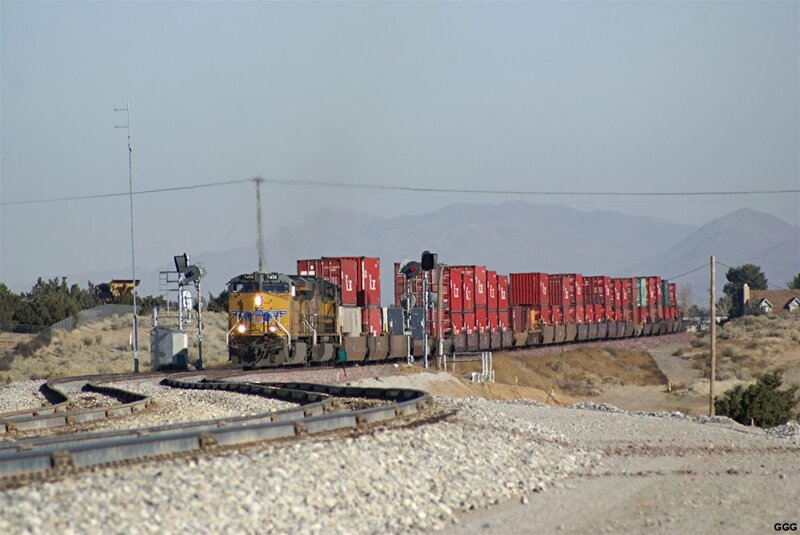 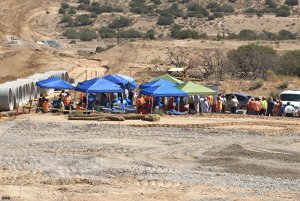 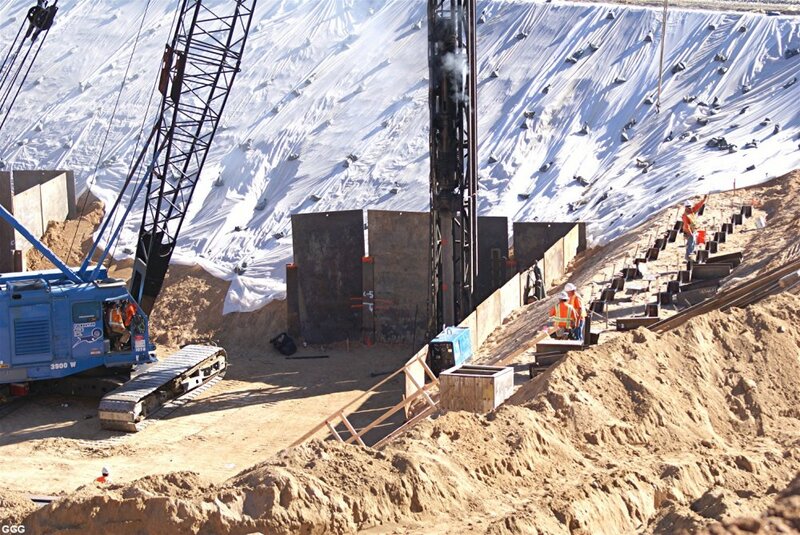 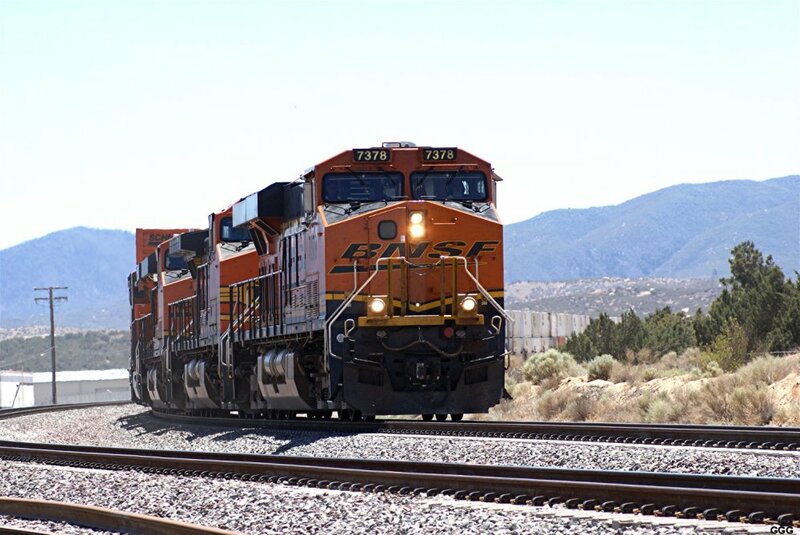 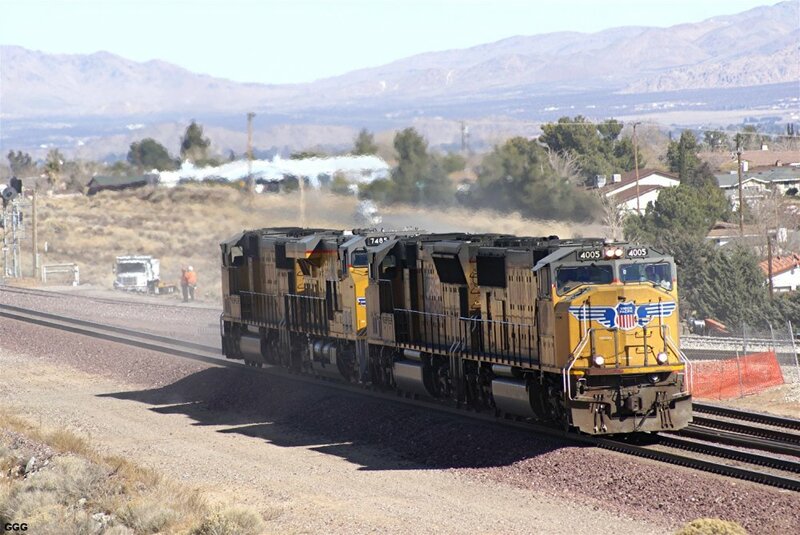 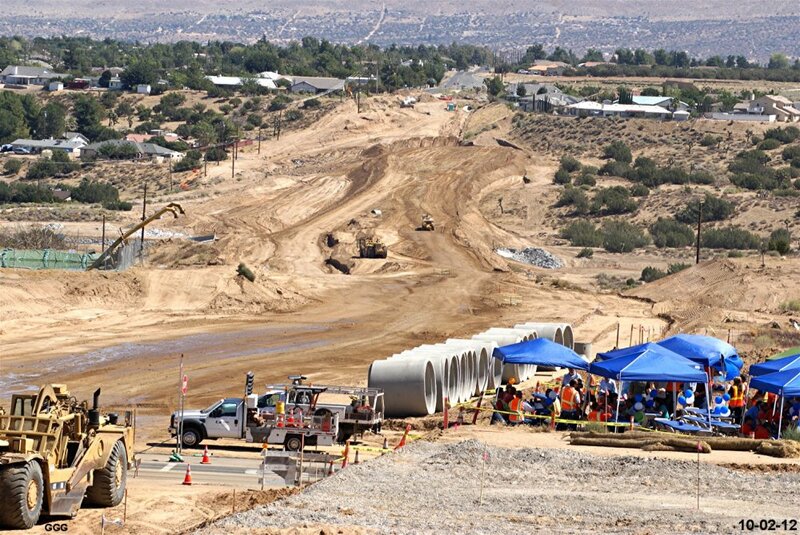 For bigger size photos - please click on the 4-digit number below each photo (the first letters specify the photographer)..
12/06/11: Progress is rapidly being made on the Ranchero Rd extension including the BNSF Shoo-fly in Hesperia. One of the major problems is storm water drainage. 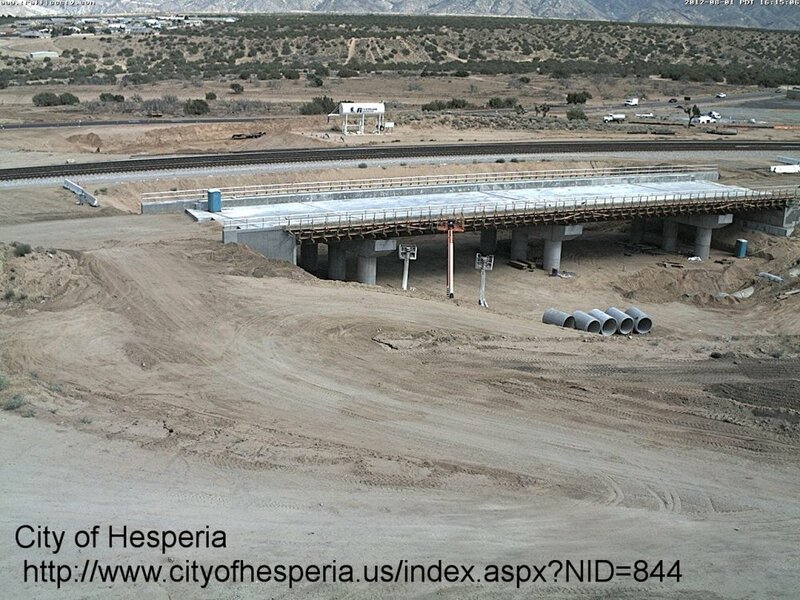 Hesperia has a long history flooding during our infrequent but very heavy rain storms. 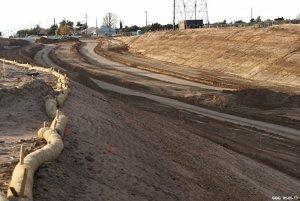 Yesterday, Marc and I surveyed the projects progress. Train traffic was very heavy. 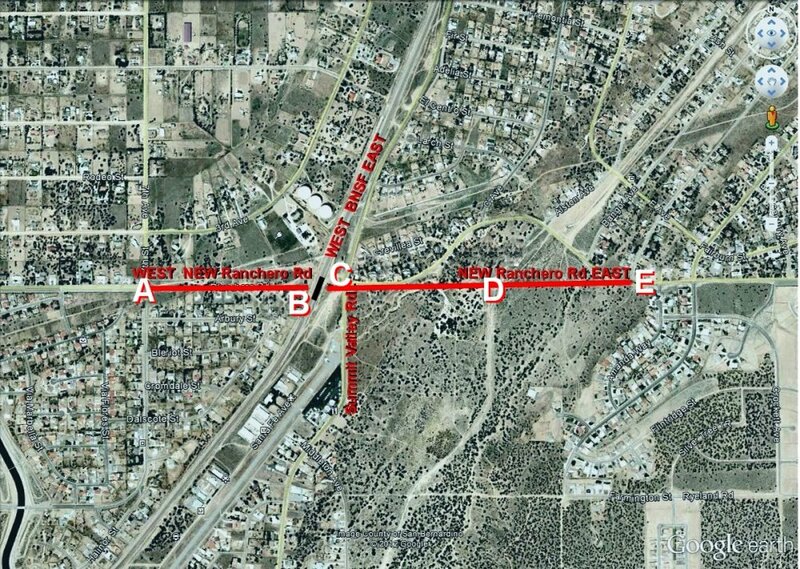 1284-1285: The eastward extension Ranchero Rd. 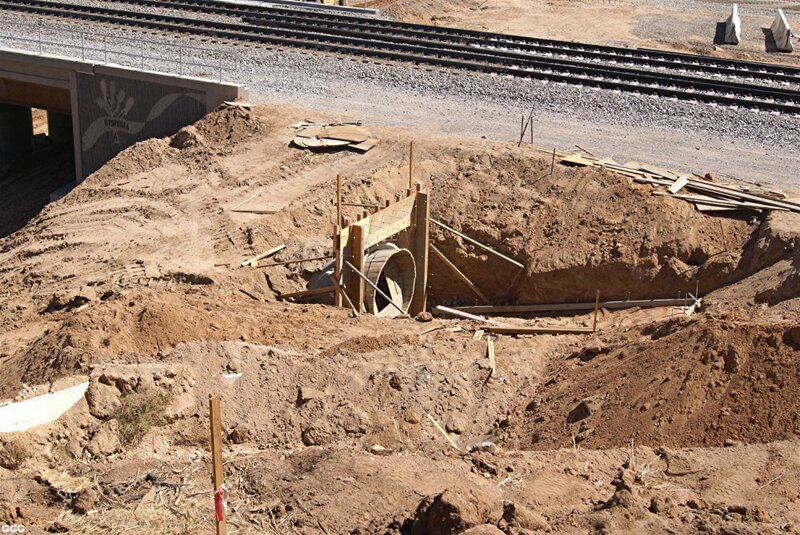 BTW, The storm drain is an eight foot pipe and will drain into the stream bed down near the box culvert. 1286-1287: Guess I caused some confusion with my comments about the Hesperia "International" Airport. 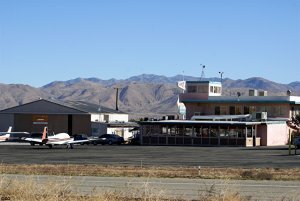 This airport is a small general aviation facility with a 3900 x 50 foot runway. 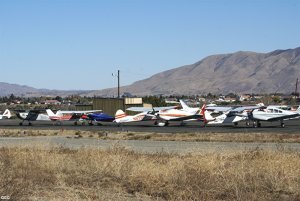 From the air, this runway looks like a sidewalk --- Here is the airport and its "fleet" of mostly unflyable aircraft. Here are three pictures of the construction as of last Friday (12-09-11). 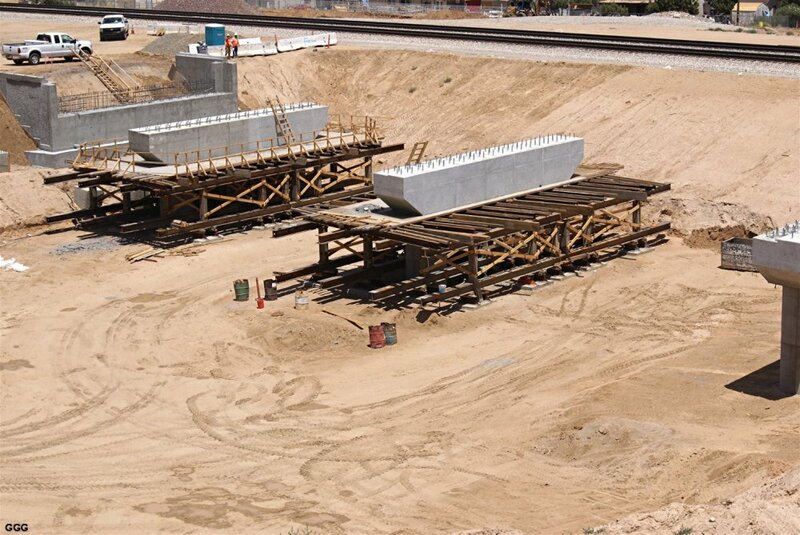 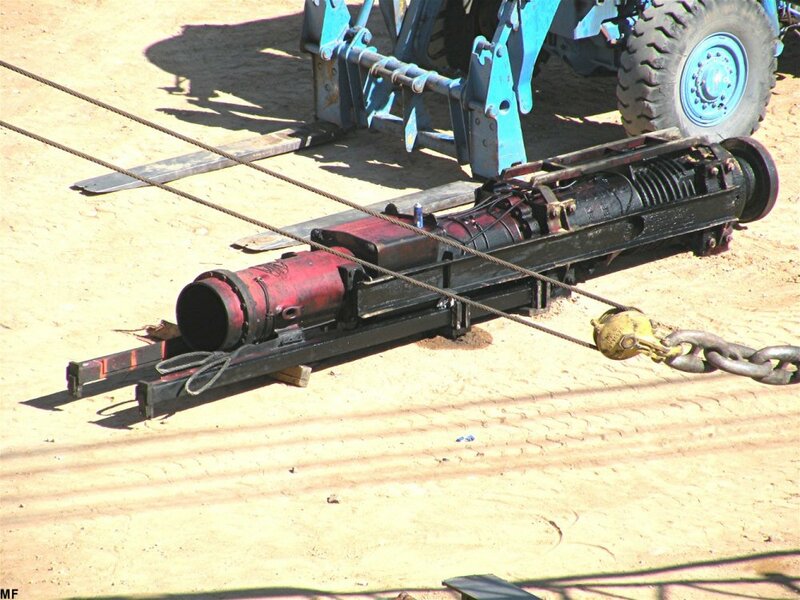 The twin Shoo-fly panel tracks are in-place (obviously not yet connected) and are being surfaced. 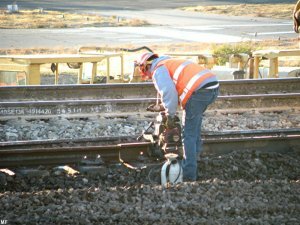 However, just as soon as the surfacing is completed, the 39 foot sections of rail will be removed and replaced with ribbon rail. 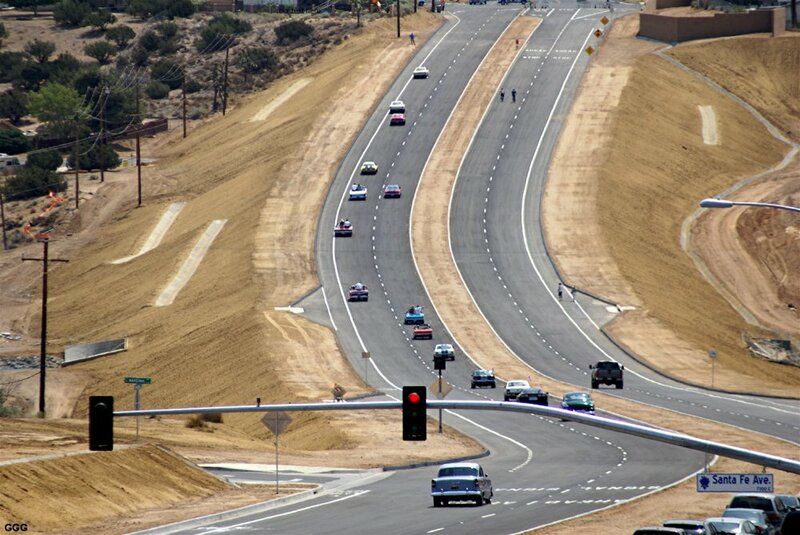 Normally the speeds through here are P = 75 MPH and F = 65 MPH. 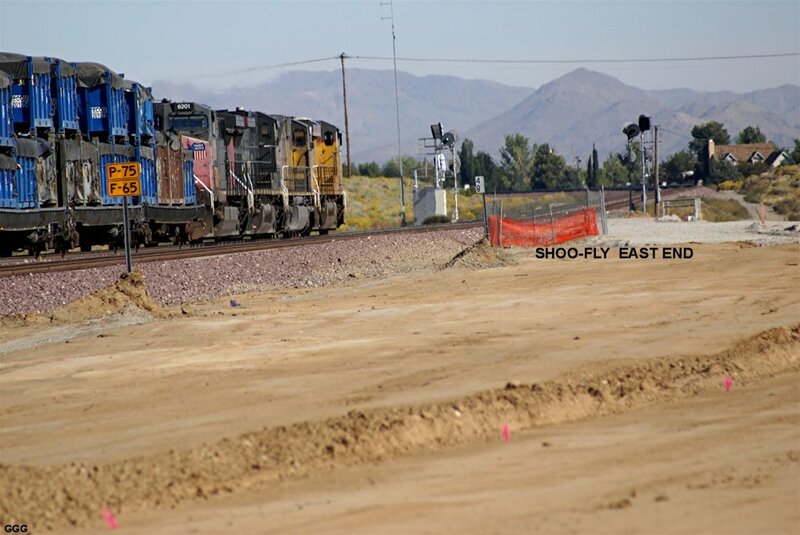 We have been told that the limit on the shoo-fly will be 50 MPH. 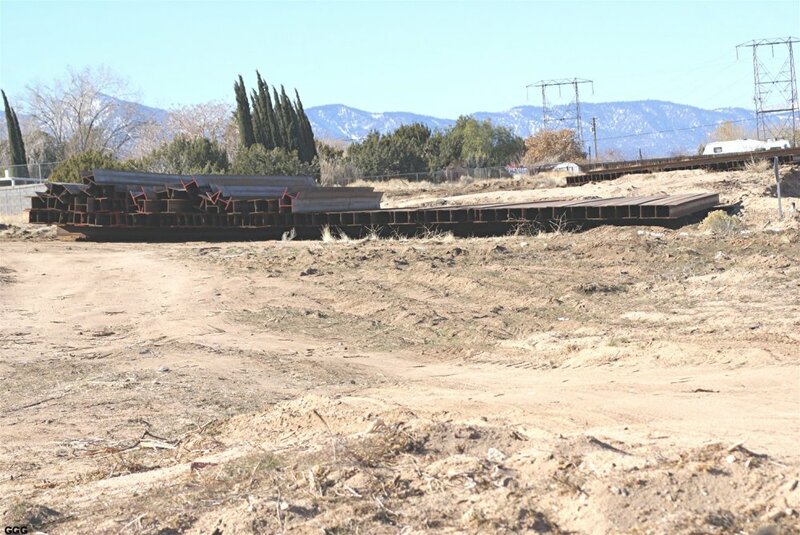 Bolted 39 ft sections of rail will evidently NOT hold up well under the stresses of Heavy trains on a somewhat tight curve at 50 MPH --- for two years. 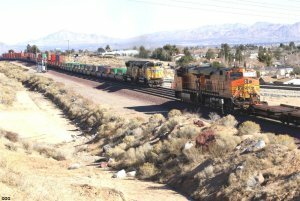 From Hesperia: 1294-1295: BNSF 6686/6715 are deadheading WB (pass Hesperia) for duty as the 2011 BNSF City of Hope Hospital Christmas Train. 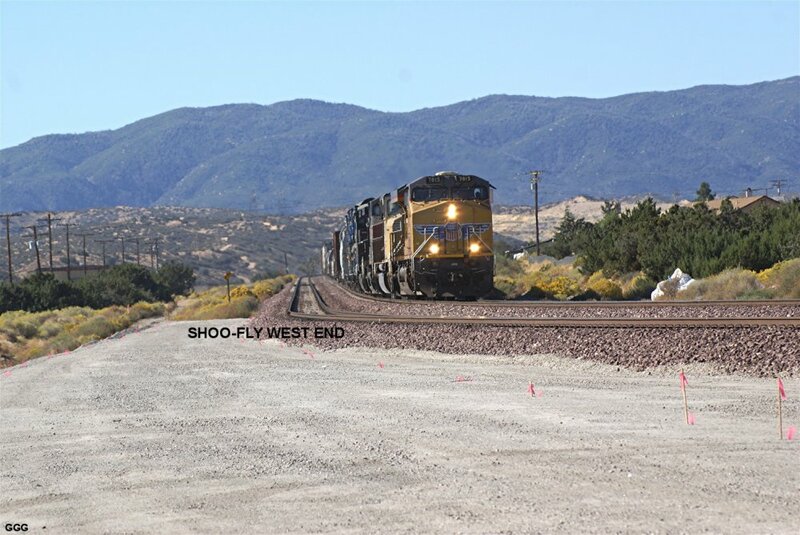 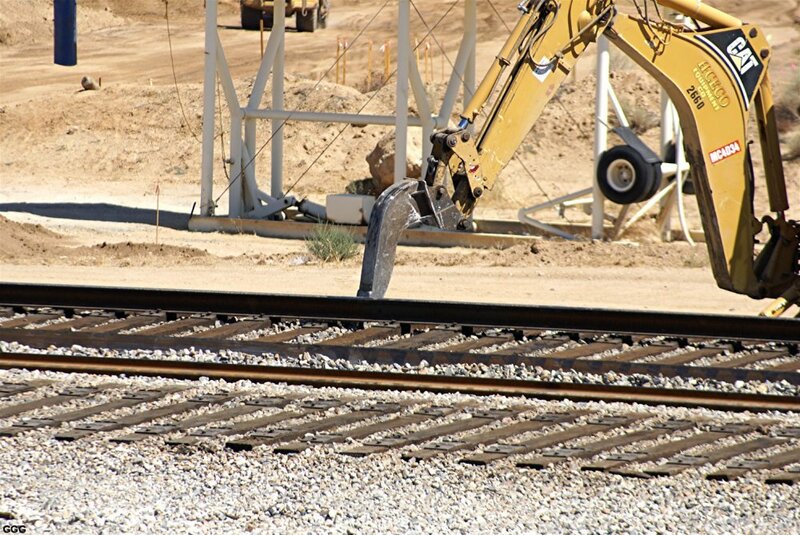 Thanks to DET, Marc & I were able to photograph the connecting of Main Track # 2 to Shoo-Fly track # 2 today at the Hesperia Ranchero Rd extension project. 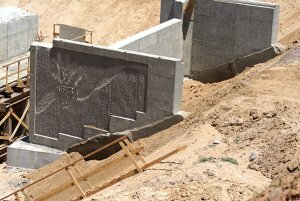 The job took about 10 hrs. 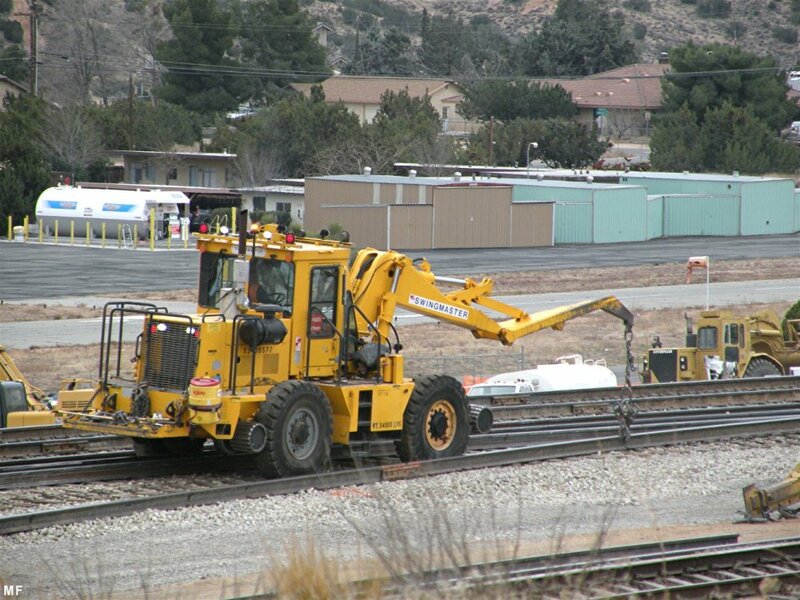 MT # 1 will be connected to its shoo-fly track tomorrow (Monday 1/09/12). 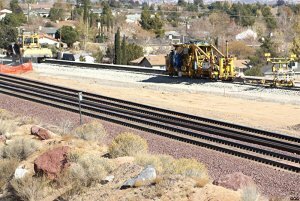 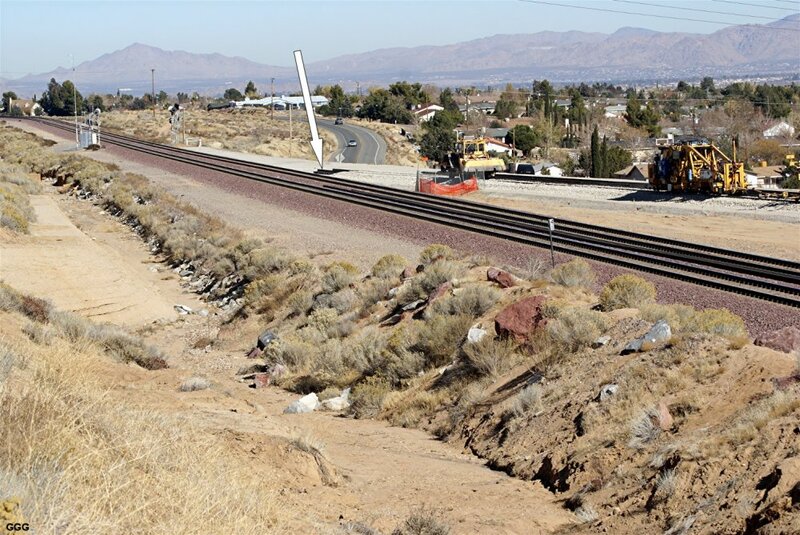 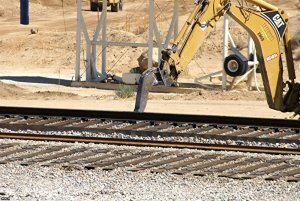 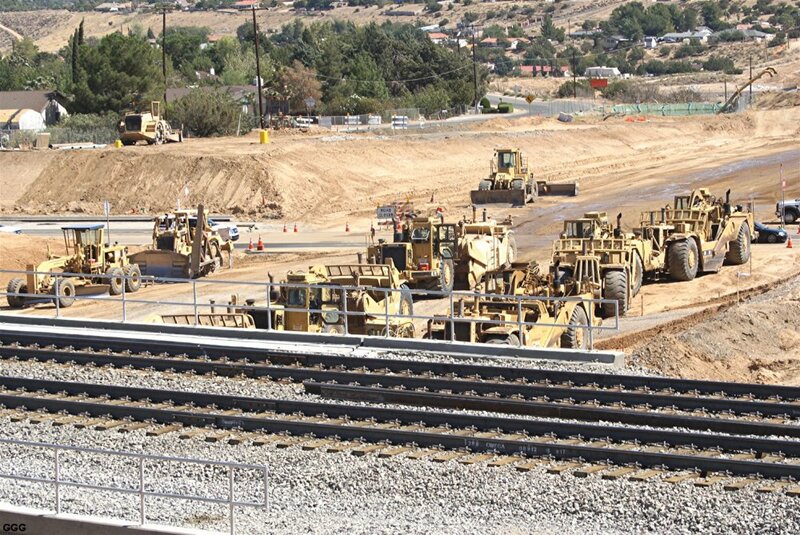 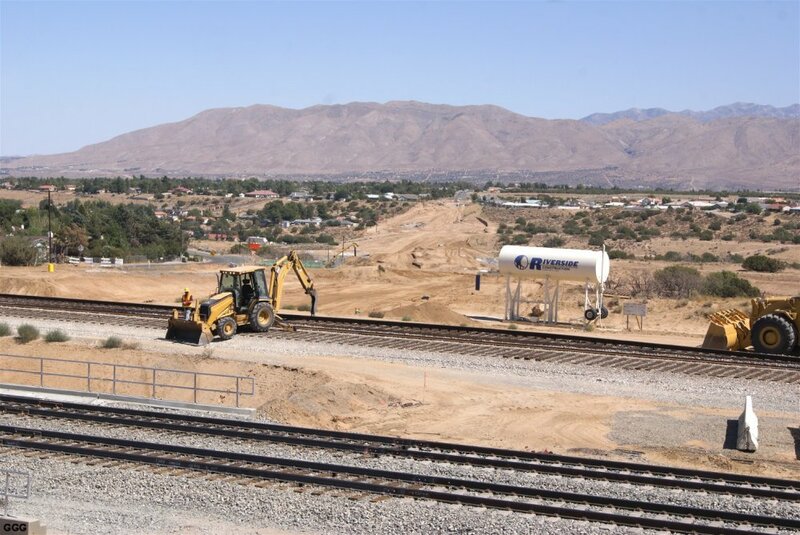 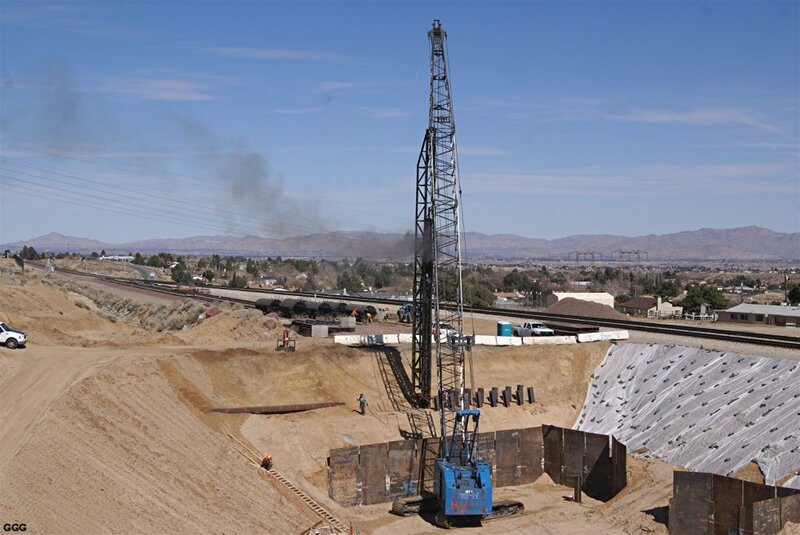 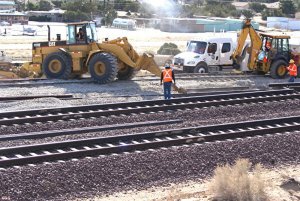 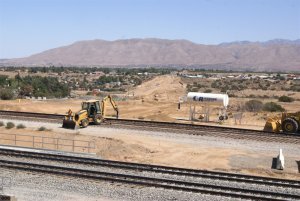 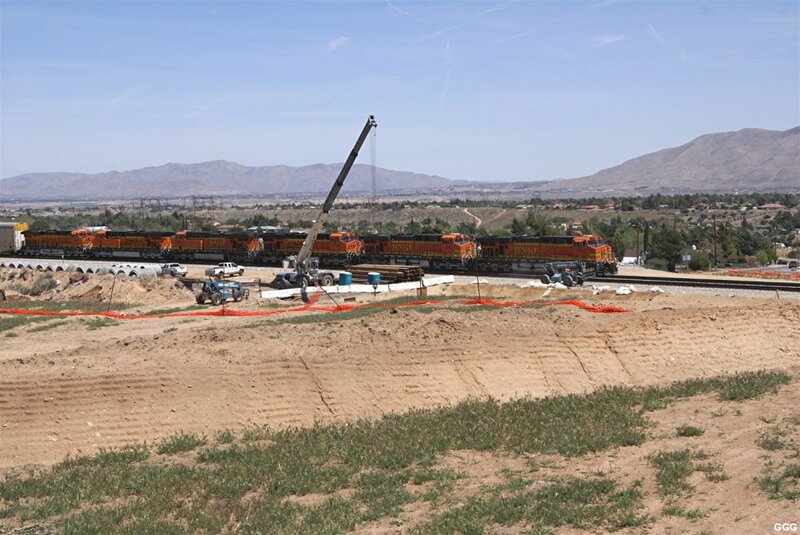 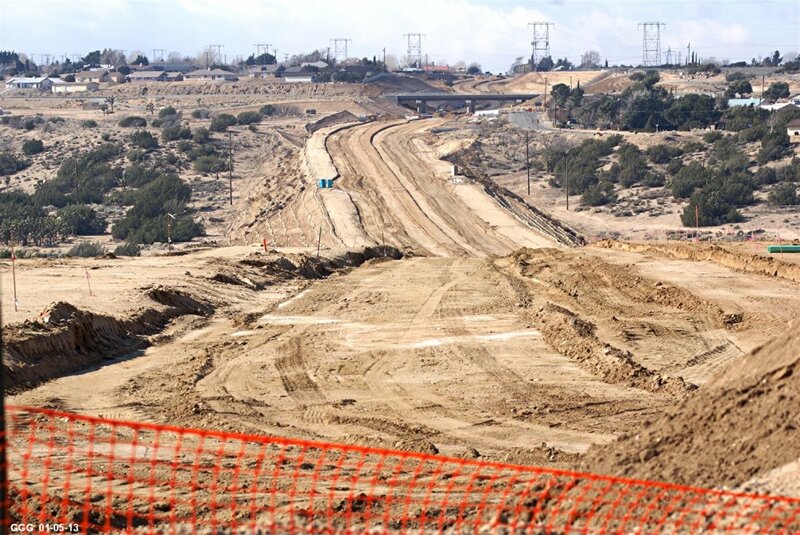 During the past week, Riverside Construction has made significant progress excavating the area where they will build the BNSF RR bridge over the extension of Hesperia's Ranchero Rd. 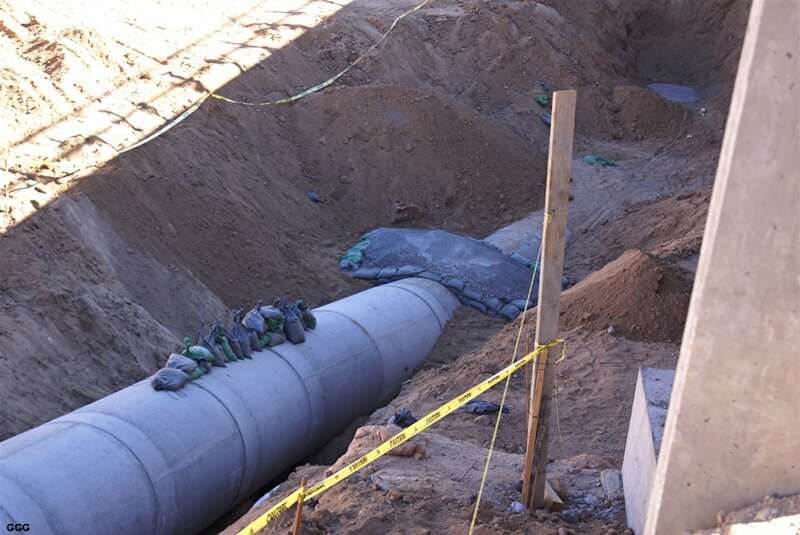 Marc & I "inspected" the project yesterday (Friday, January 20). 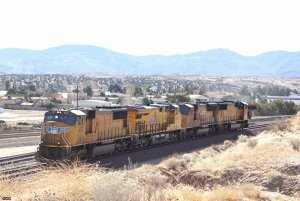 January 31: Don Toles & I had a very nice High Desert day. 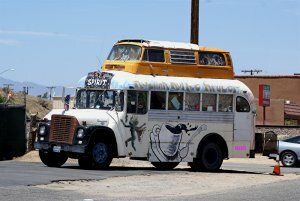 Marc joined us for lunch at da dump and afterward, we joined Jerry at the Shoo-Fly. 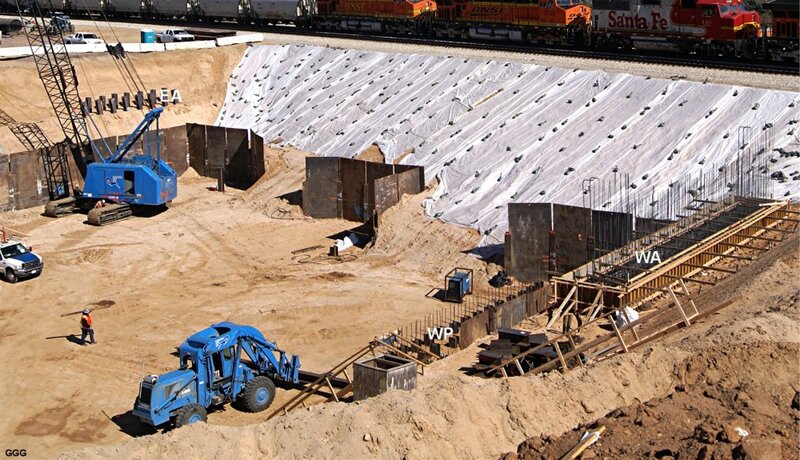 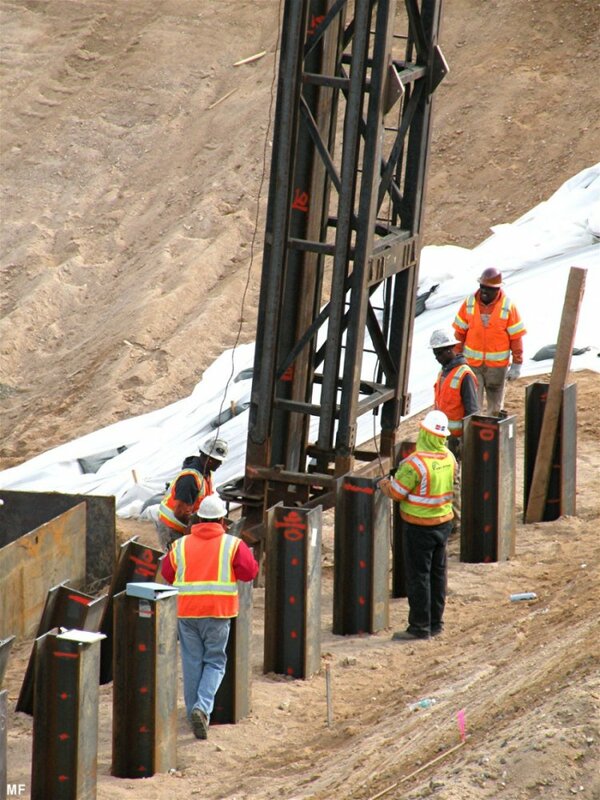 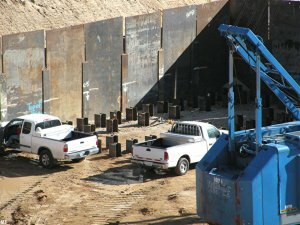 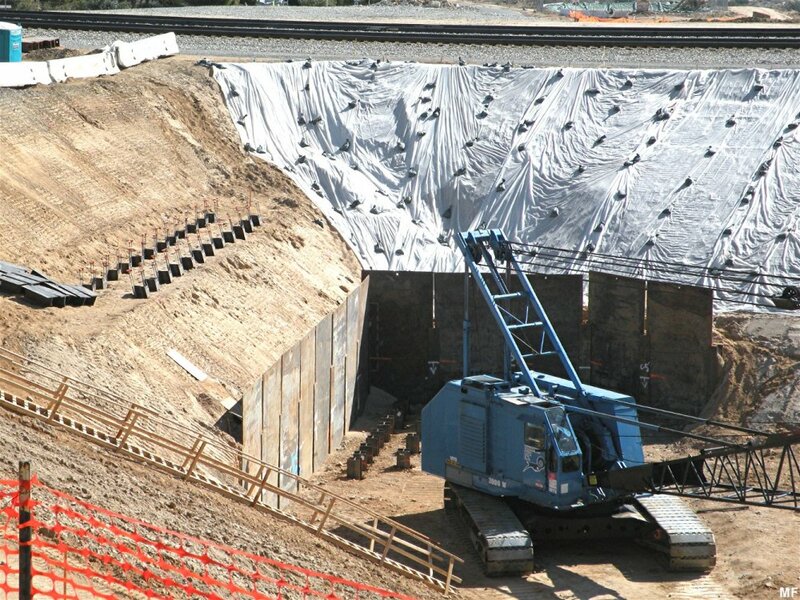 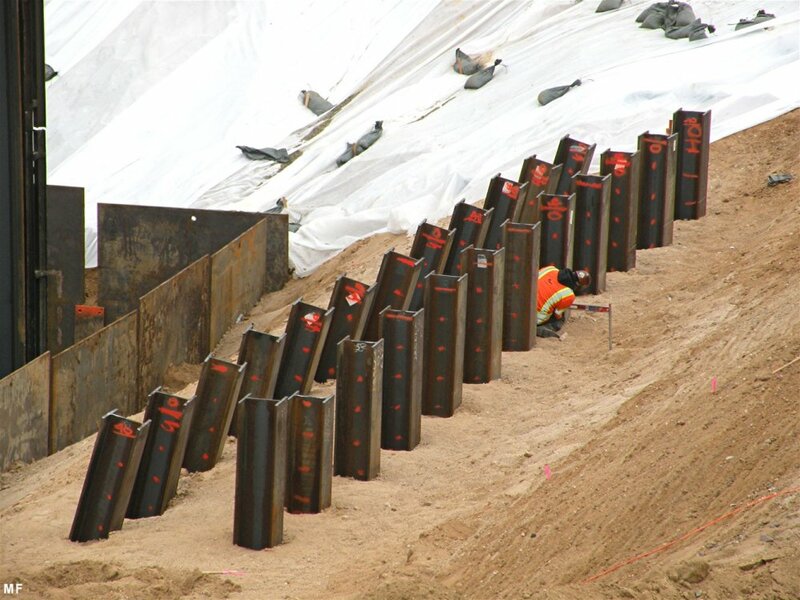 2064-2065: Steel "protective walls" have been erected in the pit that will host the RR Bridge. 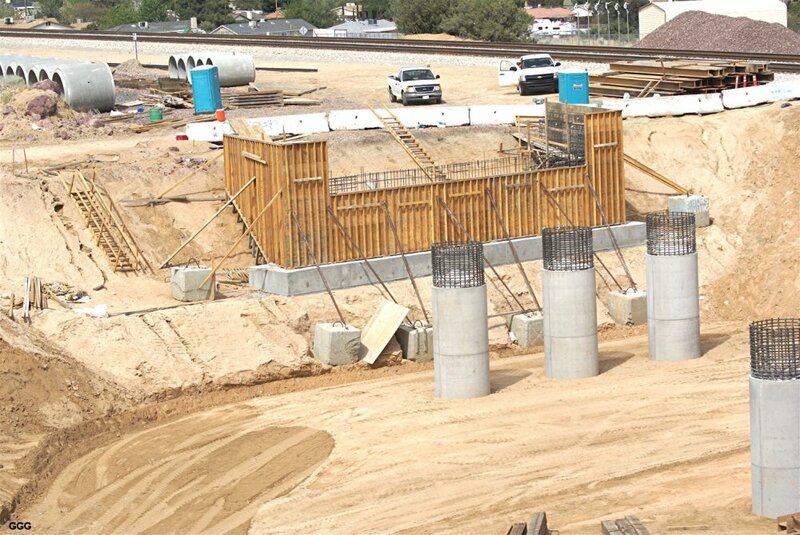 Pilings are next. 2066-2067: UP 7525 West and BNSF 6704 East traverse the Shoo-Fly. 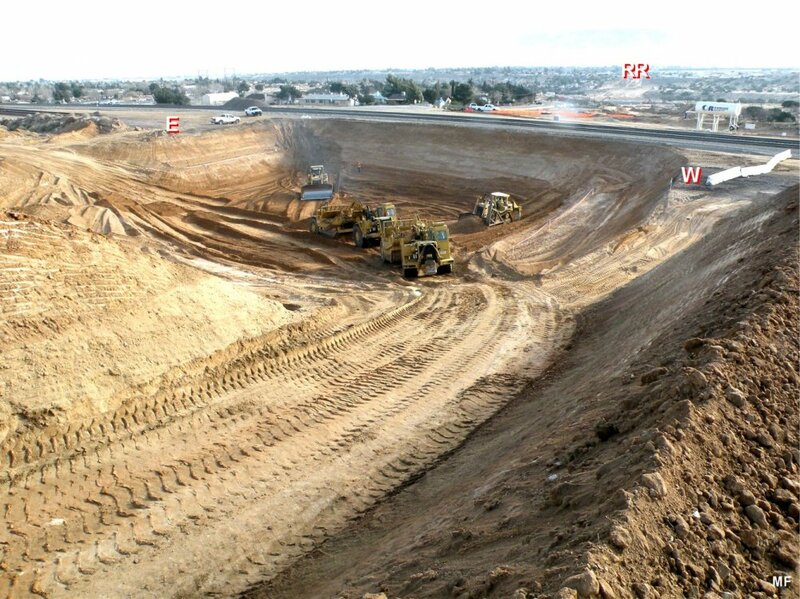 2068: The LARGE mound of dirt will be used to raise the Eastward extension of Ranchero Rd pictured in 2069. 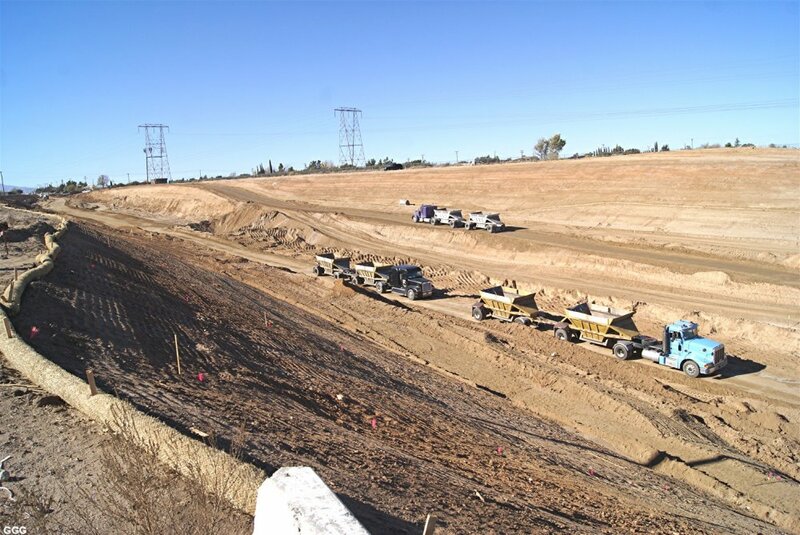 February 6: It has been a busy few days at the Ranchero Rd / Shoo-Fly project. 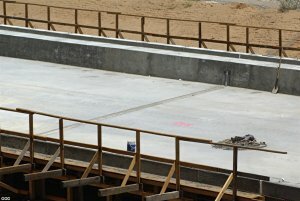 Marc has been busy documenting and talking to the contractors. 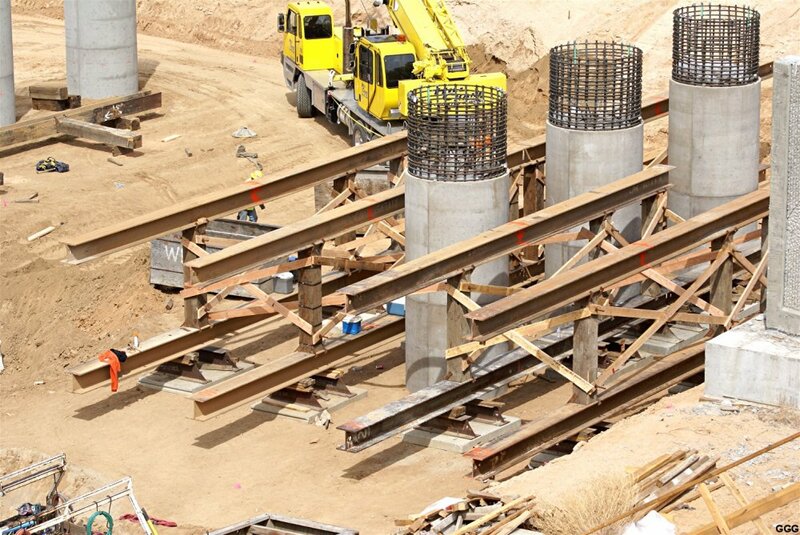 The pilings will be 40 & 60 footers. The 40 footers will be used for the abutments and driven 34 feet into the earth ---- as dictated by ground compaction studies. 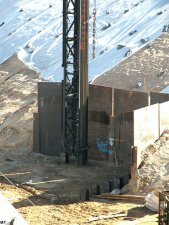 2097: The driving of the first 60 ft piling for the western pier was completed during my visit. 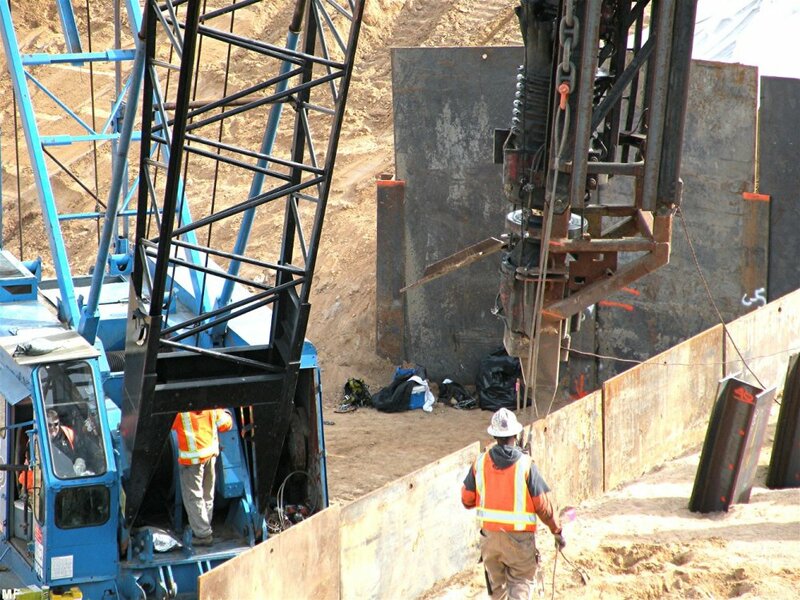 The smaller crane was moving the cut (waste) pieces of the Western abutment pilings. 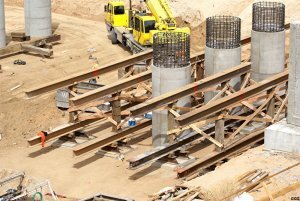 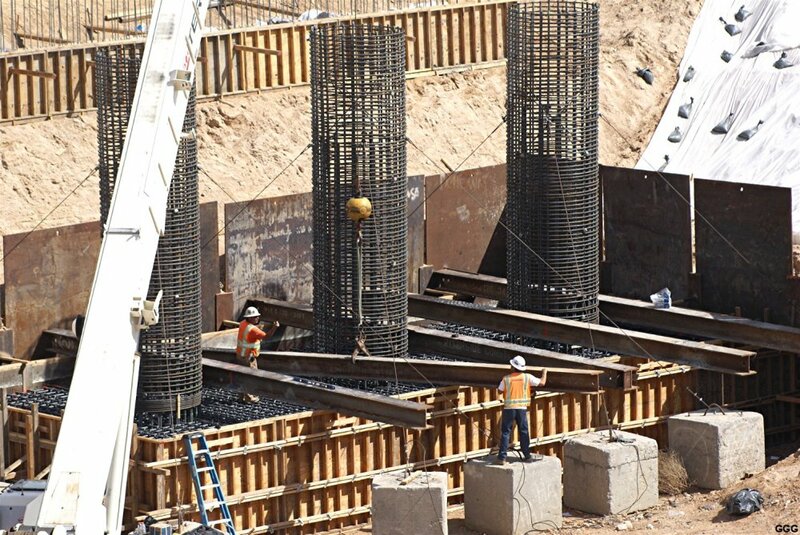 2098-2099: The pilings for the western abutment have been cut to height and the beginings of rebar cages have been welded to the "I" beams. 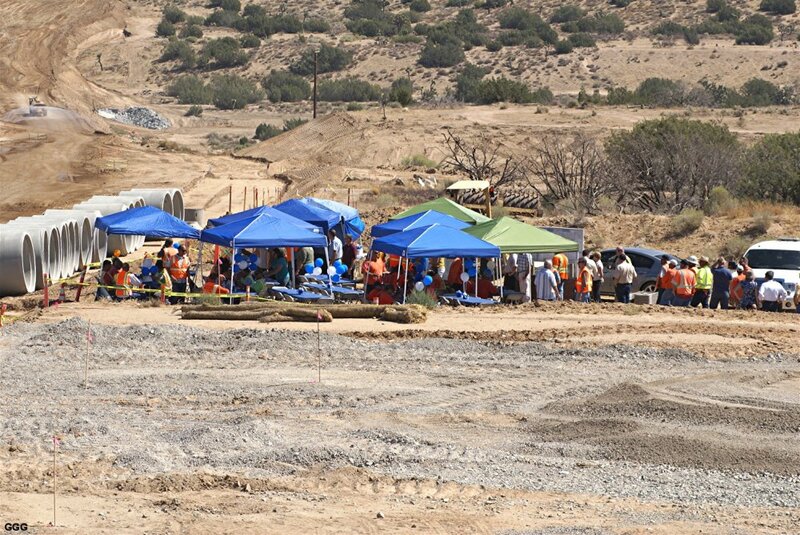 Today (February 17), we had a great AM on Hill 582 followed by a visit to the Shoo-Fly and lunch at Da Dump. 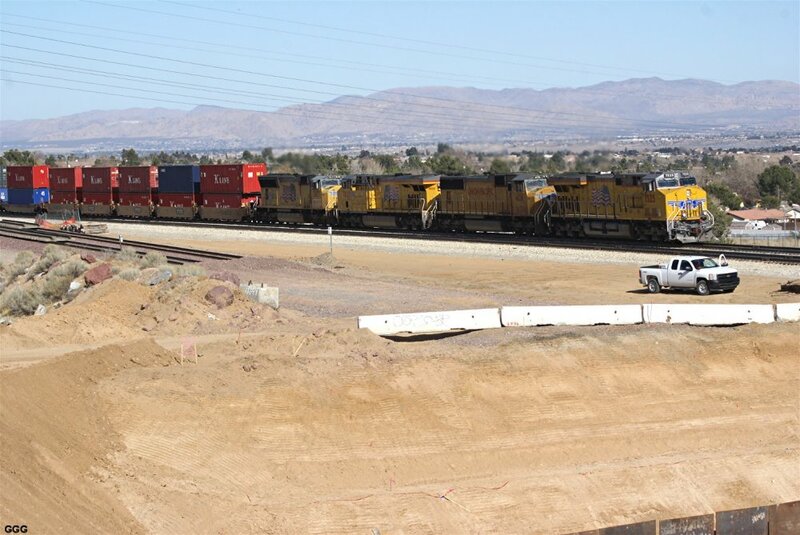 March 9: Spent a train-less hour at the project today. 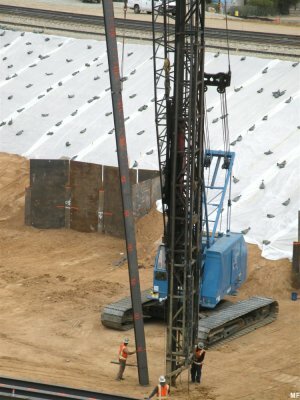 The driving of the pilings is complete. 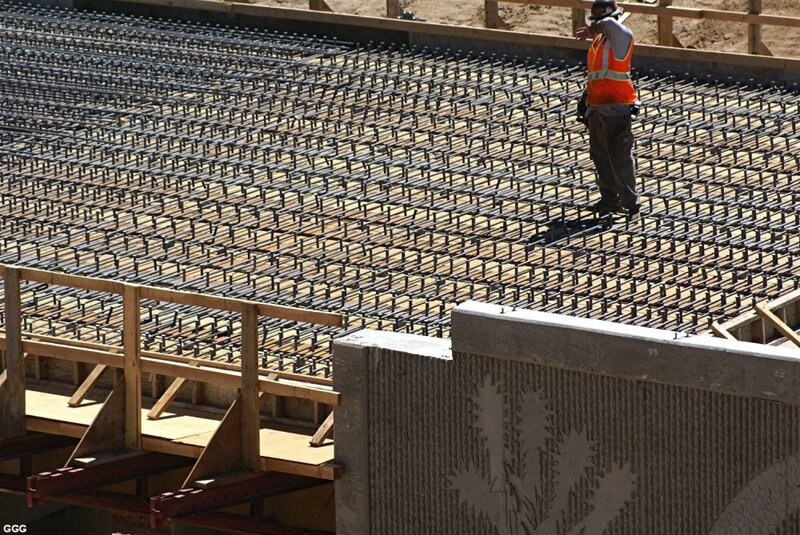 Rebar and concrete form installation is progressing very rapidly. 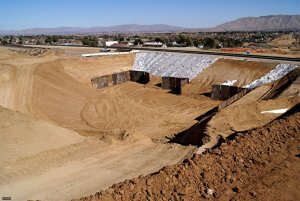 2151: The base forms for both the Western abutment and pier have been removed and moved to their corresponding eastern positions. 2152: Close up of the Western pier and abutment. 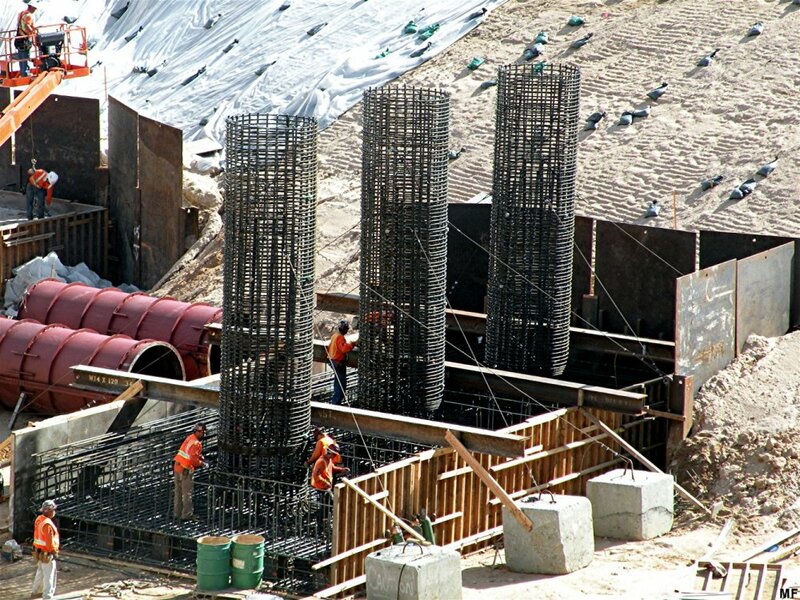 2153: Middle pier pilings and beginnings of rebar cage. 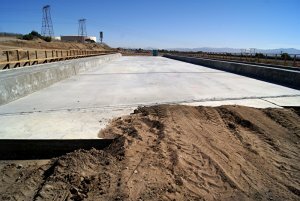 2154: Eastern pier almost ready for concrete. 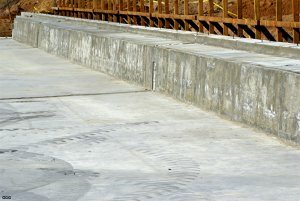 2155: Close up of Eastern pier. 2156: Rebar cages for the middle pier and pre-cast concrete storm runoff culverts are stockpiled. 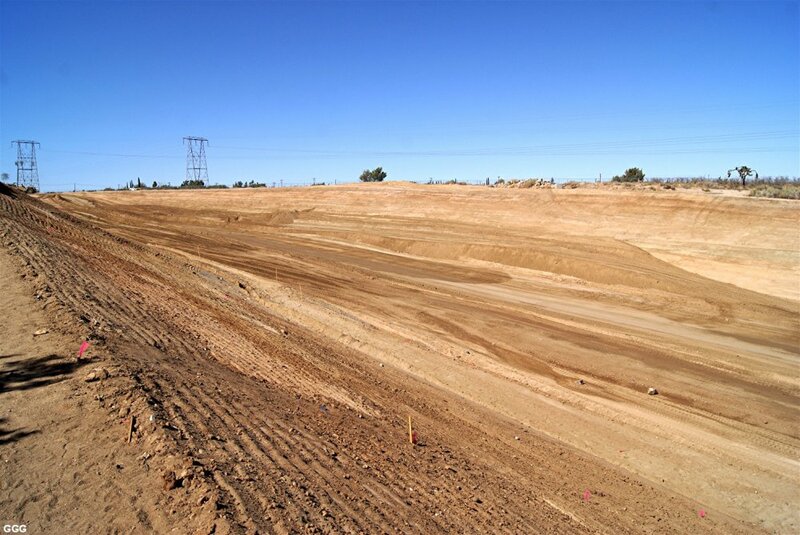 March 23: Never one to waste a chance for documentation, I made, what was going to be, a quick trip to the project. 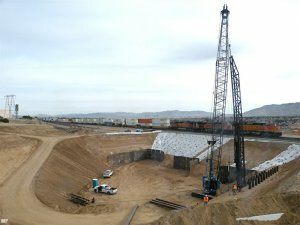 2166: Overview -- all of today's activity was focused on forming and installing the rebar for the base of the middle pier. 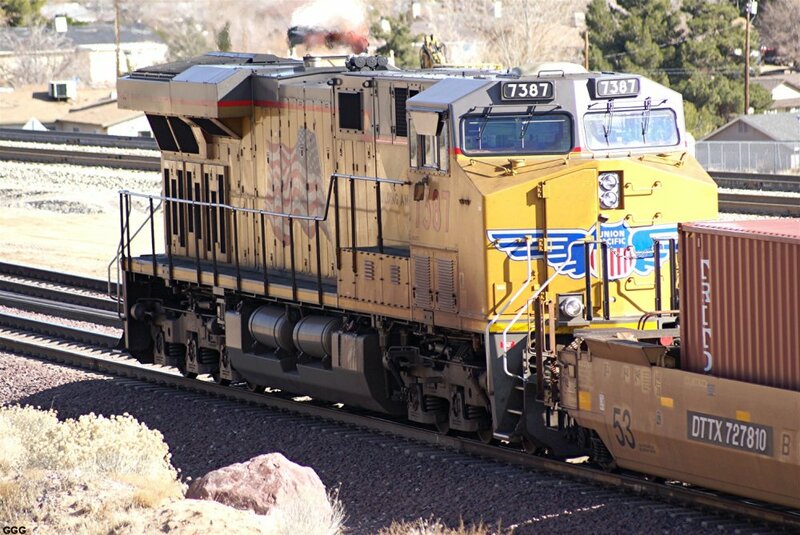 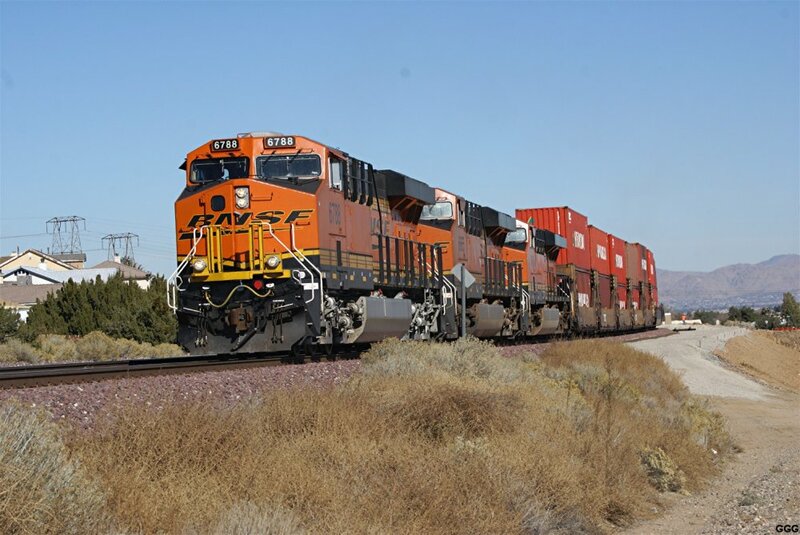 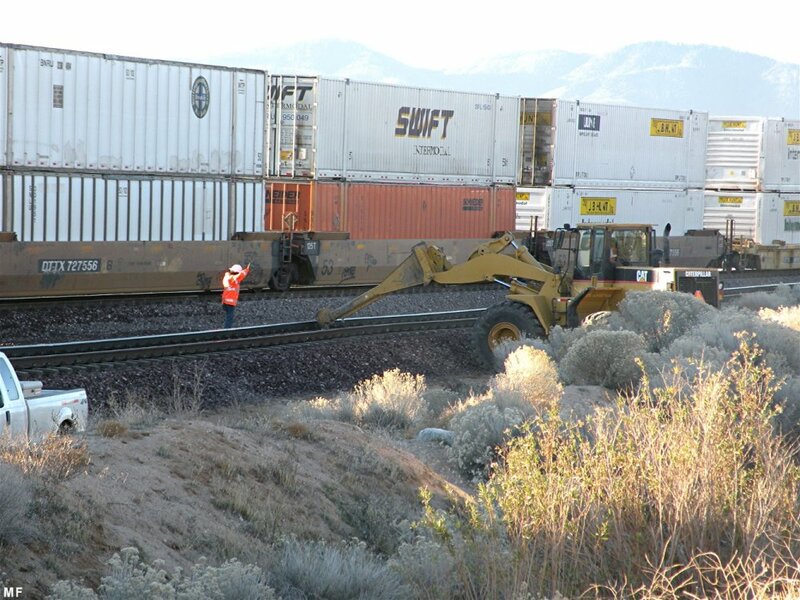 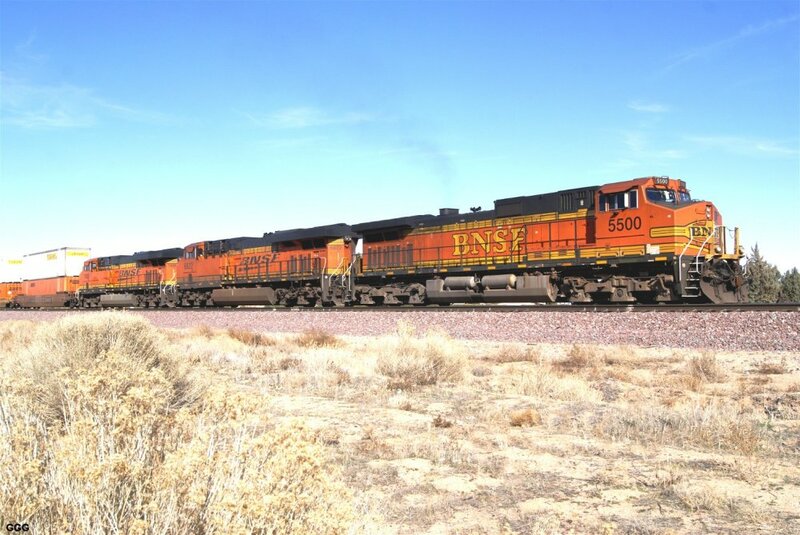 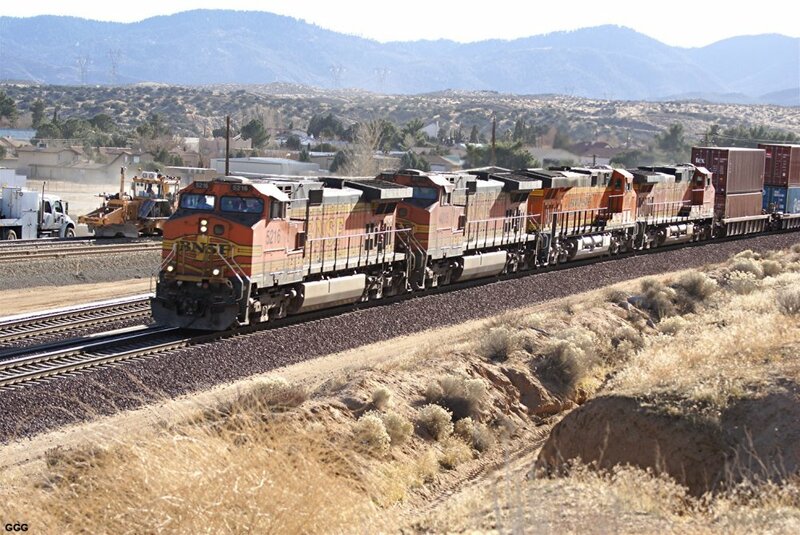 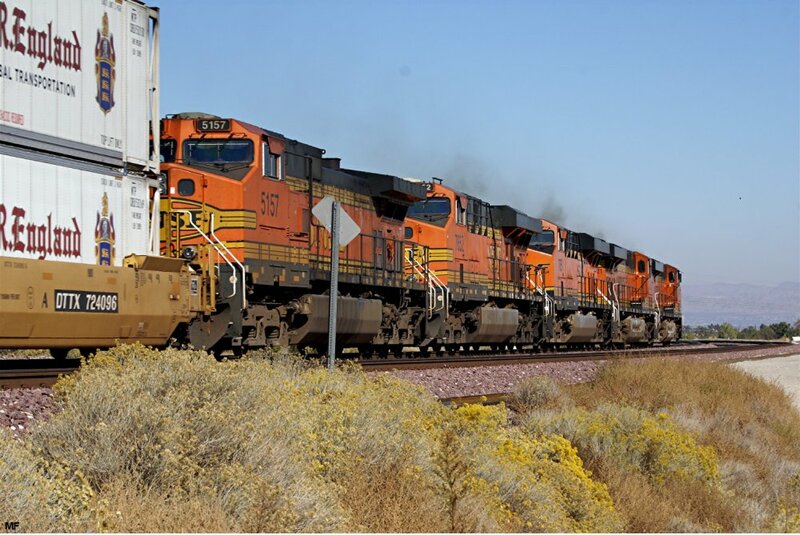 2167: BNSF 7555 is EB at track speed ---Shoo-fly limit is 50 MPH. 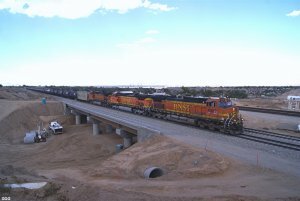 2168: After visiting the Contractor's office, I caught UP 7601 WB thru Hesperia. I've had so many questions concerning this project, that I decided to consult the experts. 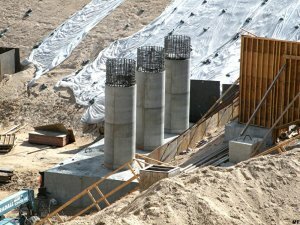 The construction engineers, after I barged into their offices, were super and explained several "burning" issues --- HE HE. 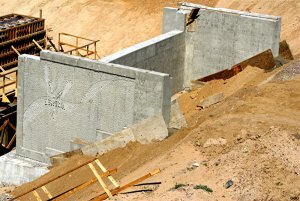 All volumes are approximate but very close. 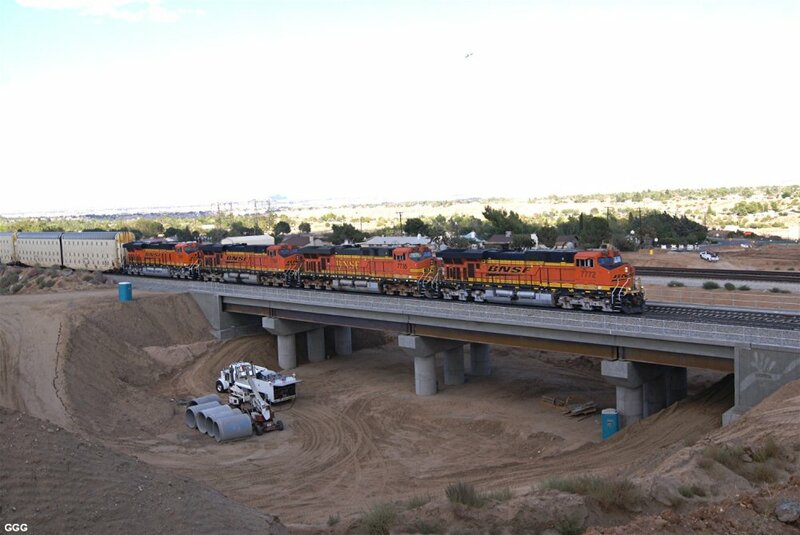 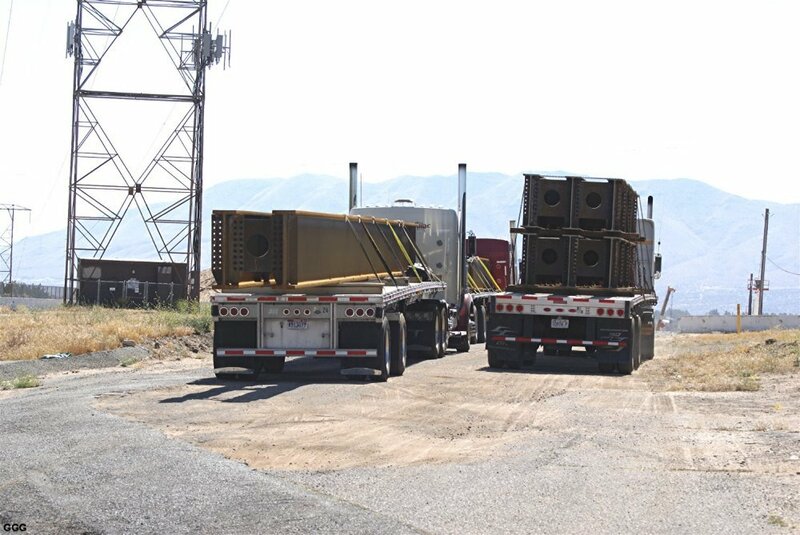 * The bridge is being built strictly to BNSF standards - slump and later compression tests are performed on each BATCH (not each truck) of concrete delivered. 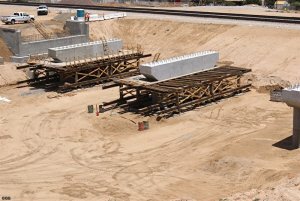 * The Eastern and Western pier bases consumed 150 cubic yards (cu yds) of concrete each -- The middle pier base will use 200-250 cu yds. 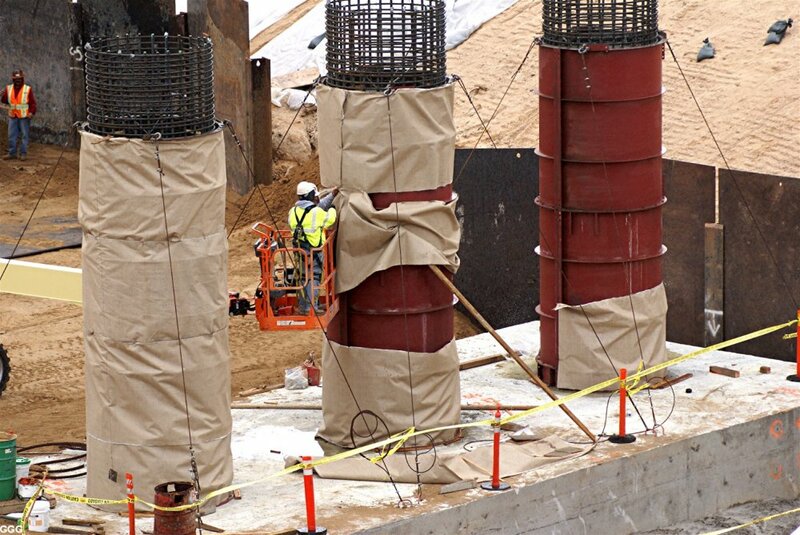 * Each of the nine round vertical columns will take 60 cu yds. * According to temperature and humidity, the forms may be removed in 72 hours. 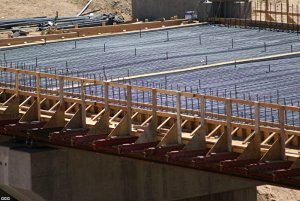 Curing concrete is covered with plastic to slow water loss and retard curing--if the concrete cures too quickly, it loses strength ---. 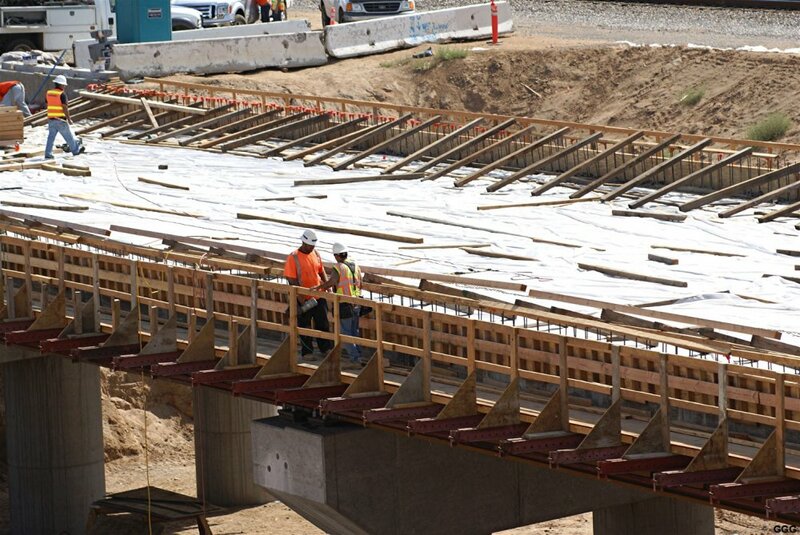 The bridge deck will be formed and poured IN-PLACE. 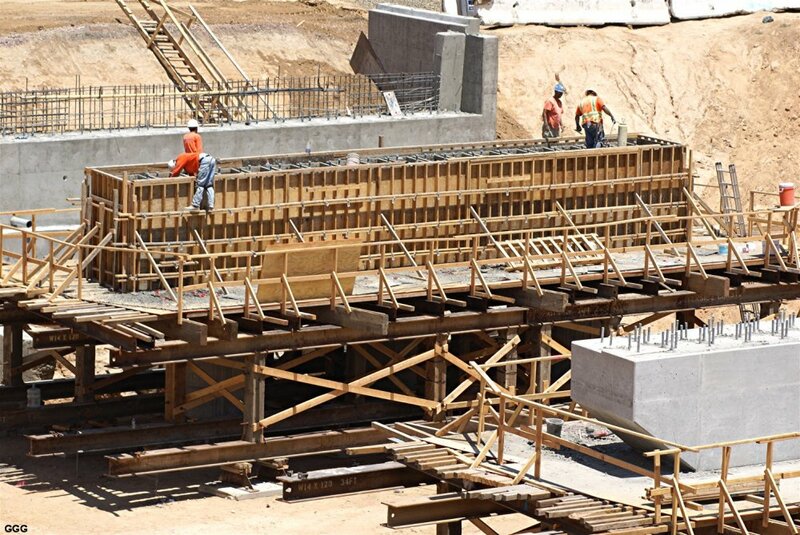 The building of the supporting structures and forms for the bridge deck will be something to see. 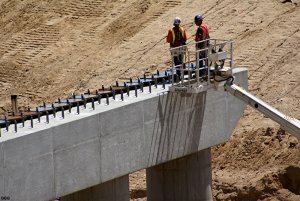 Look forward??? to numerous future reports. The middle pier base and Eastern columns will be poured next Wednesday, weather permitting --- and we'll be there. 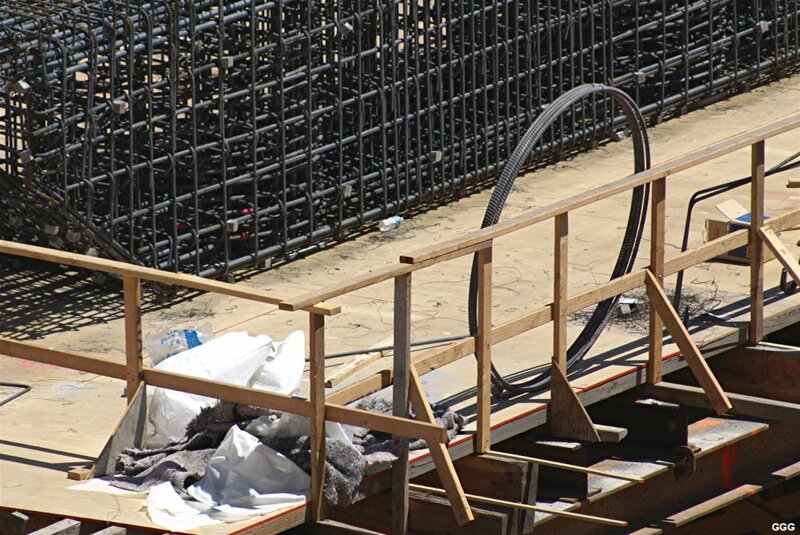 March 28: It was Marc's turn at the project today. 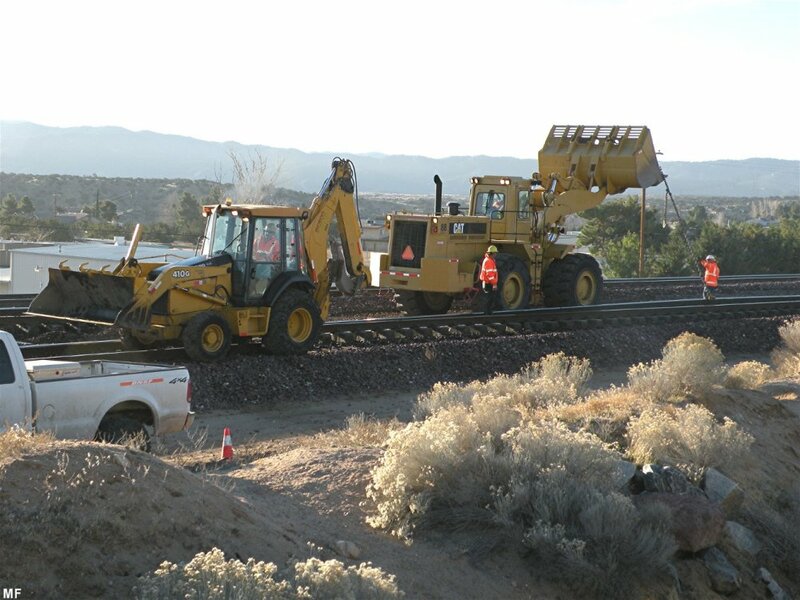 The crews lost two work days due to last weekends storms. 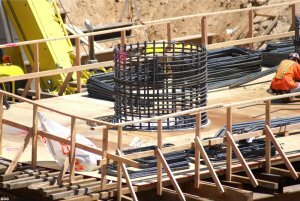 Today they were busy finishing the rebar for the base of the middle pier and placing the round steel forms for the Eastern Columns. 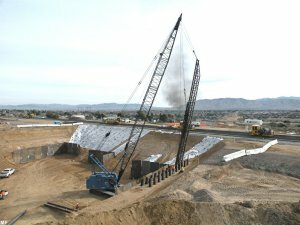 2169: Project overview. 2170: Finished Western base and column -- Awaiting cap and decking forms. 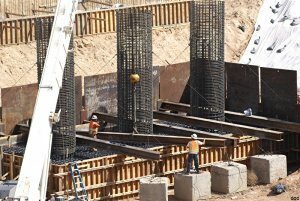 2171: Lifting and placing the round forms for the Eastern columns. 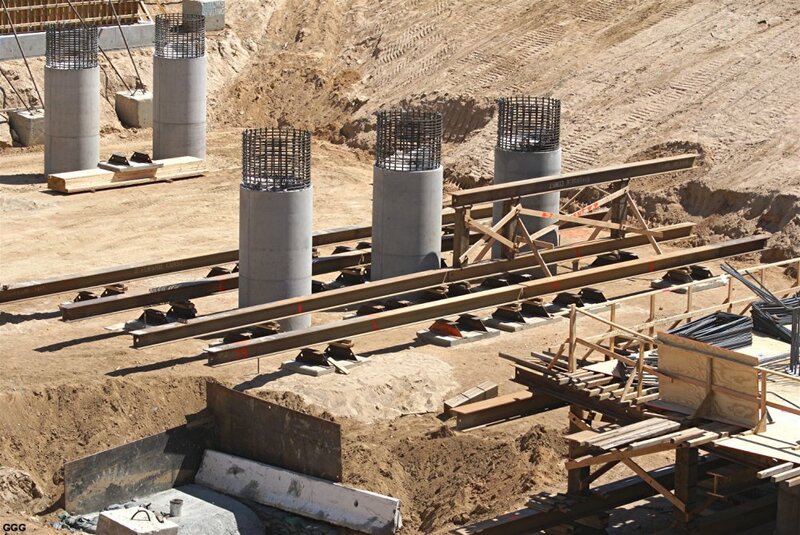 2172: Centering and truing the form & rebar for one of the Eastern columns. 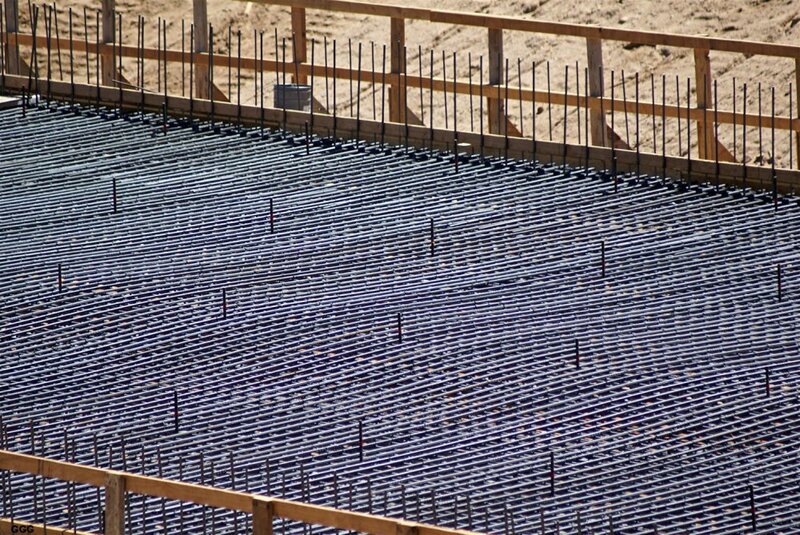 2173-74: Rebar detail for the middle base and columns. 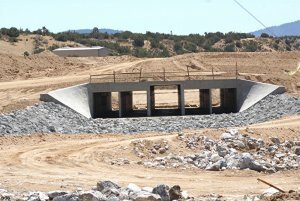 April 6: Today, Laura & I had a fun "Da Dump" lunch with Don, Marc, Doc Jones and the Westovers (Tehachapi). After lunch I took Laura and the Westovers over to the project where we ran into the construction engineer I met a few weeks ago. 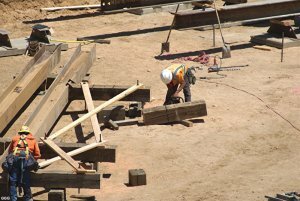 The engineer was, again, very friendly and answered all of our questions. 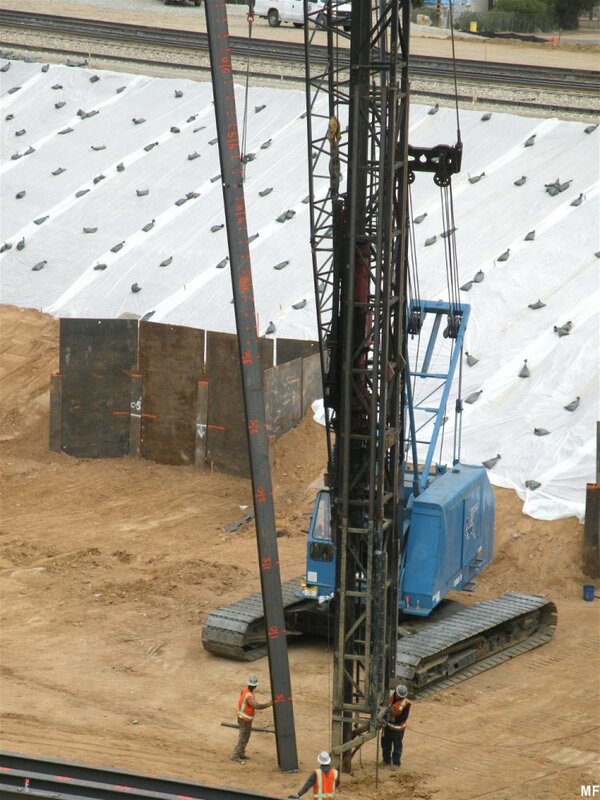 2208-09: The floor of the "pit" has been raised about 5 feet to a level equal to the tops of the pier bases. 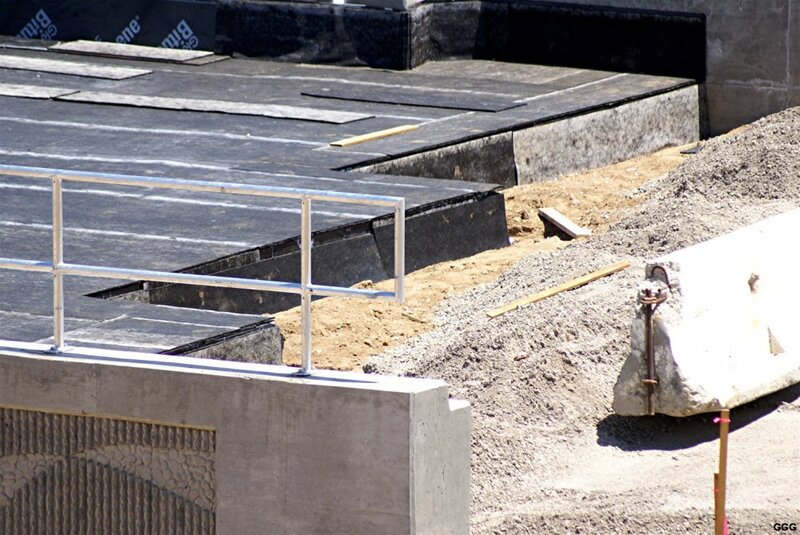 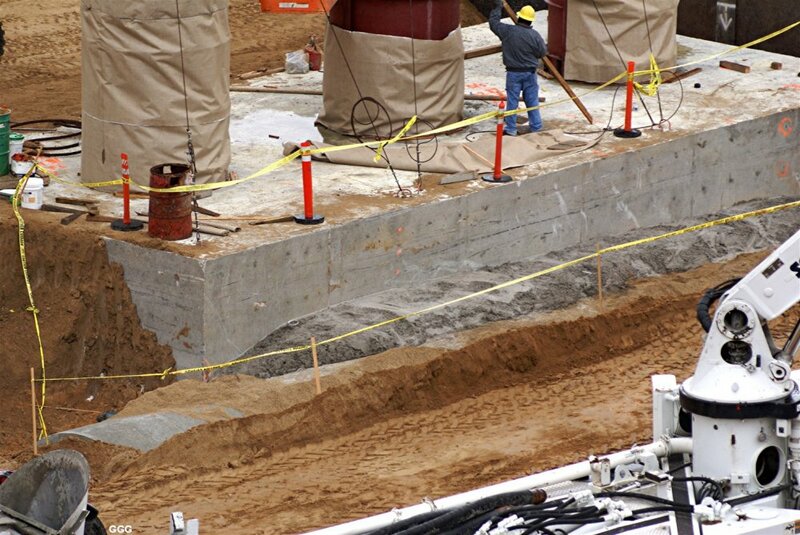 The pier base tops will be made "islands" and will have devices installed to protect the columns from road traffic. 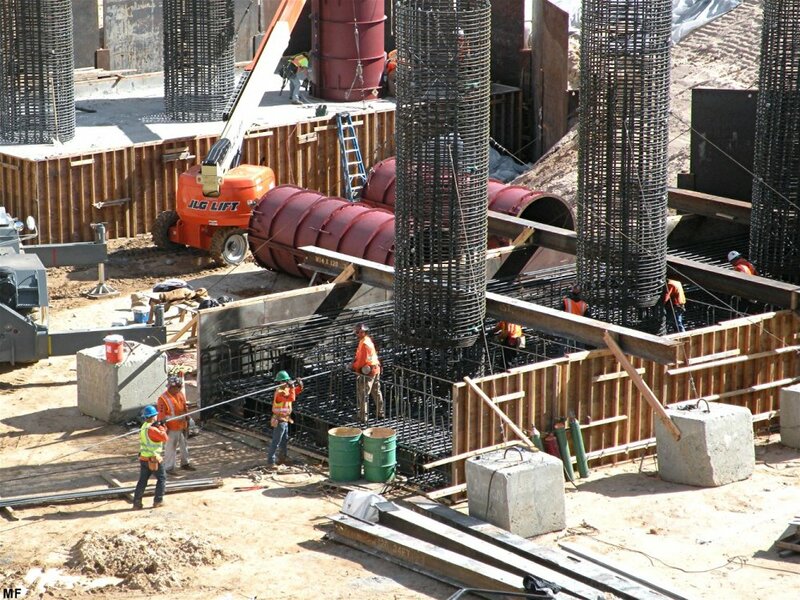 The middle columns will be poured next week. 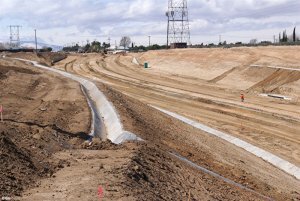 April 10: Got to both the compass West & East sides of the project today. 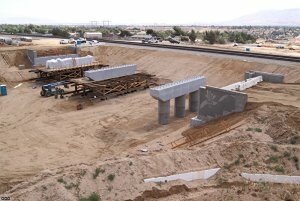 2220: Looking West into the construction site, the first section of the culvert can be seen. 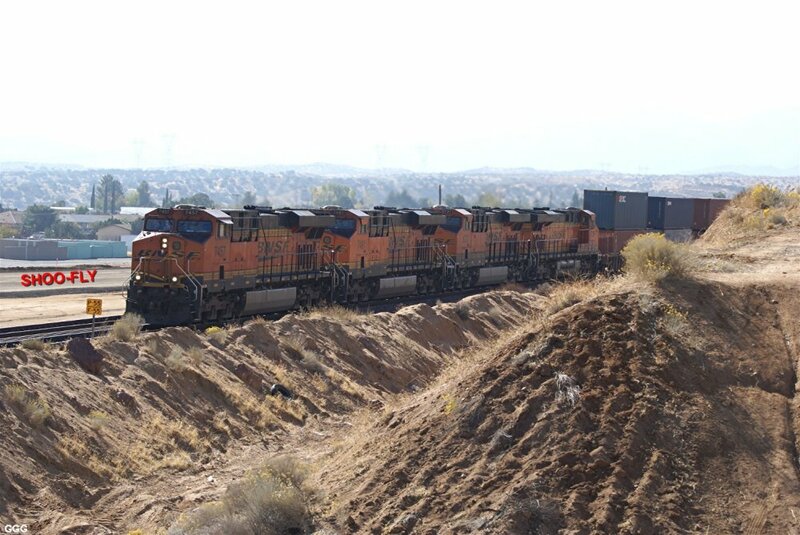 2221: BNSF 7775 is WB at MP 47. 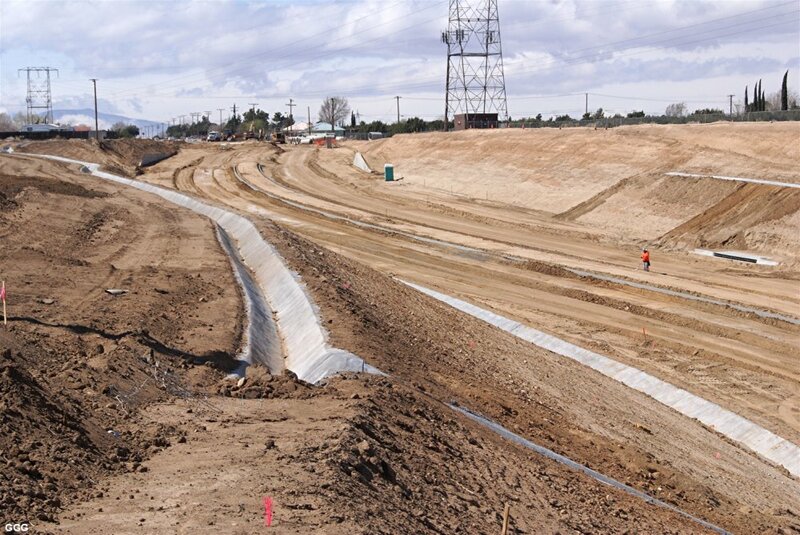 April 13: Cold, Windy & Wet in the Victor Valley today and so it was the perfect day to visit the project. 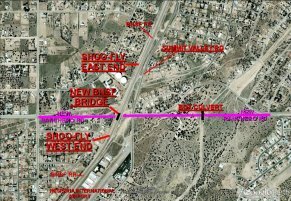 2223-24: Overviews of the project. 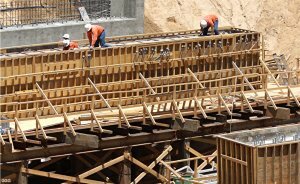 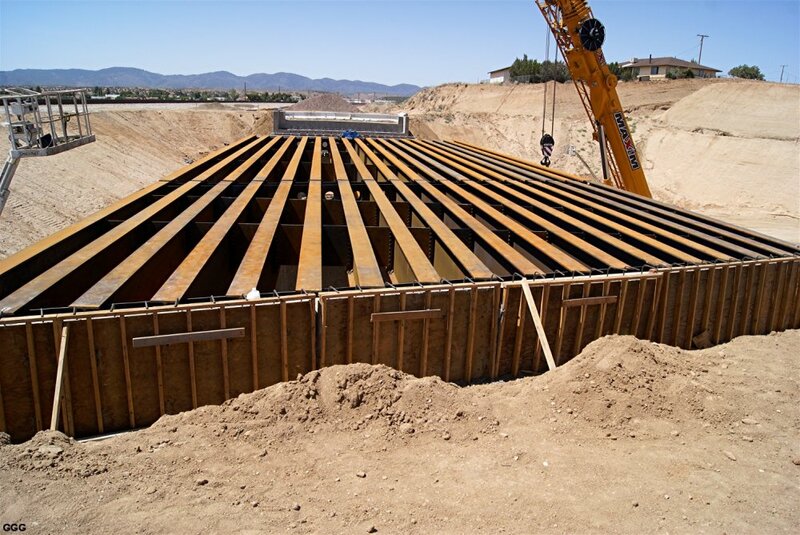 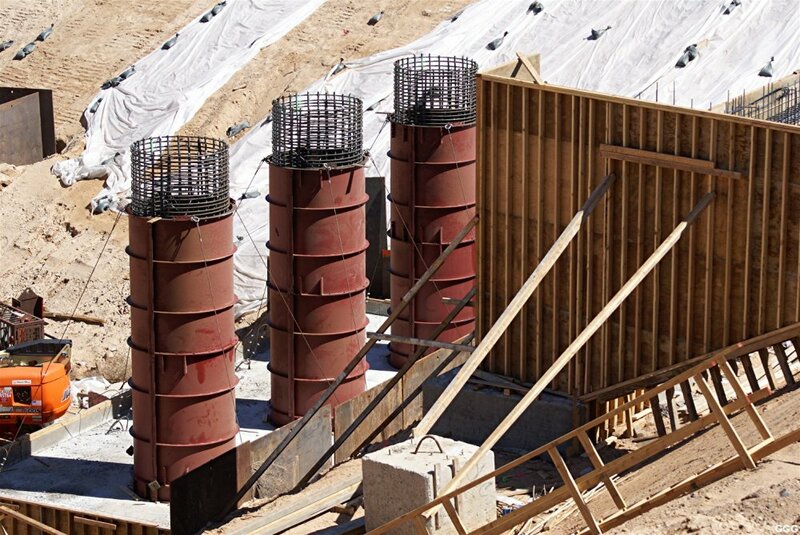 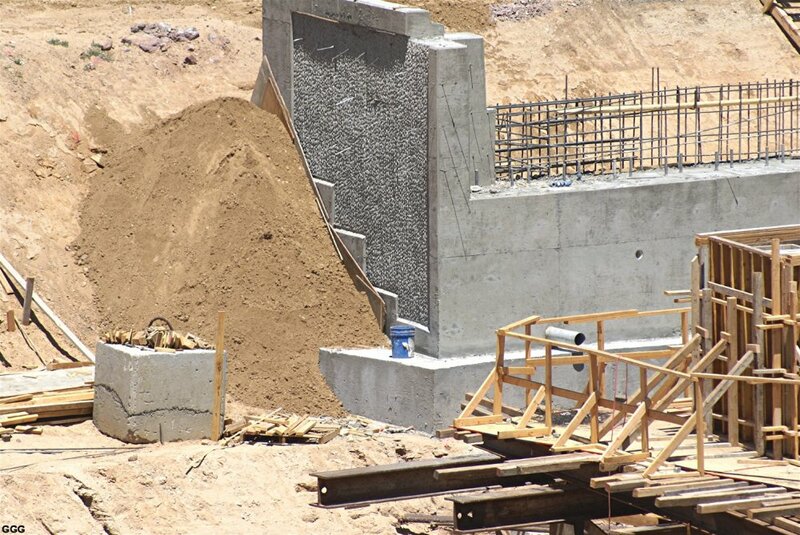 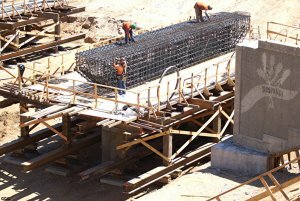 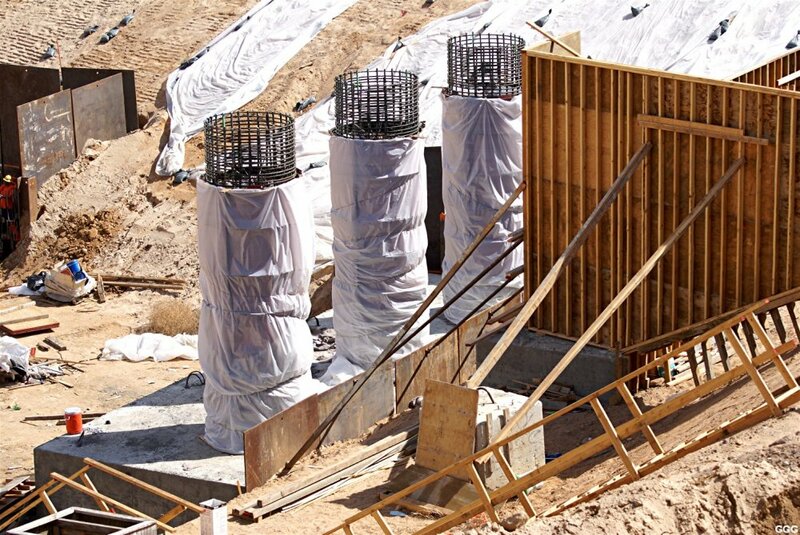 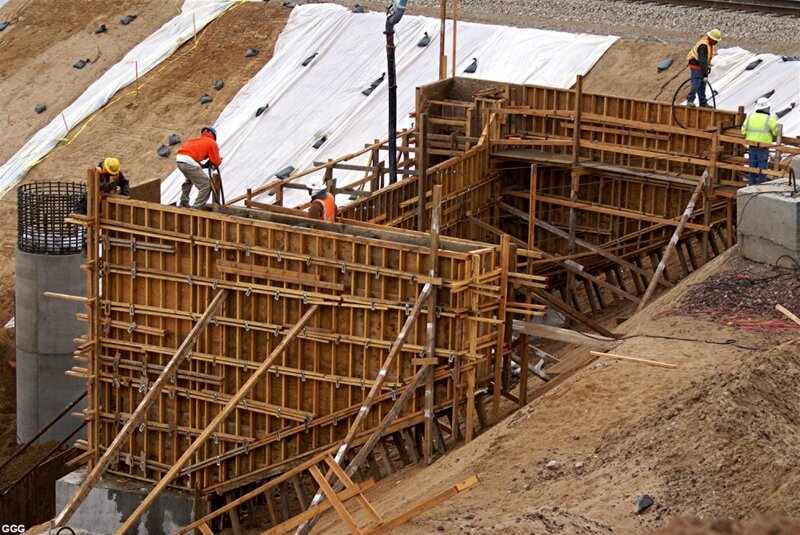 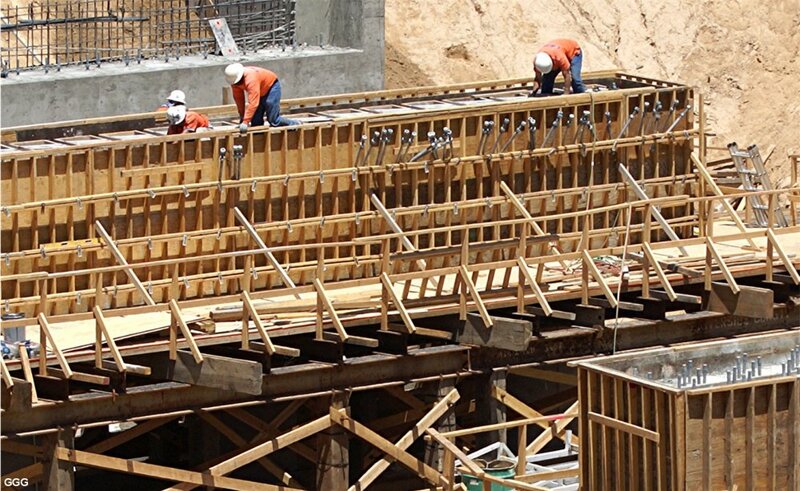 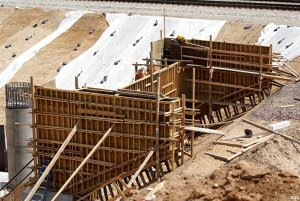 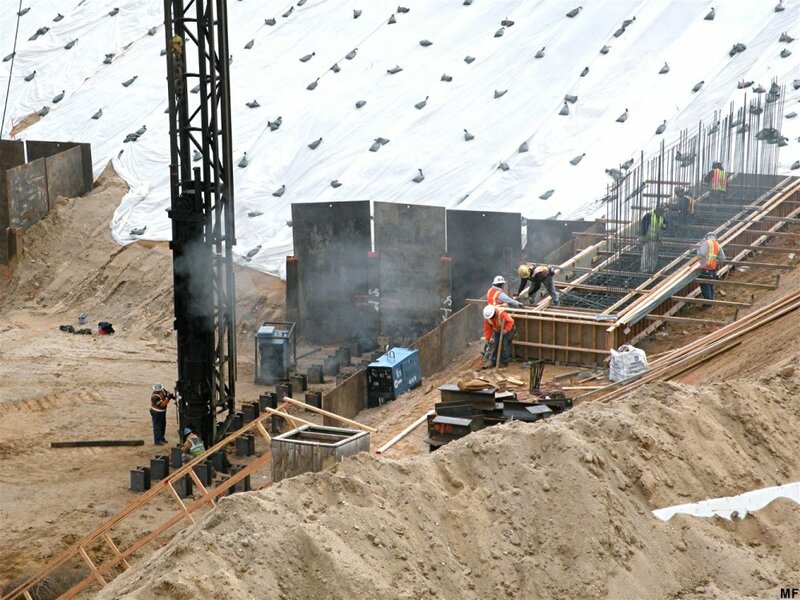 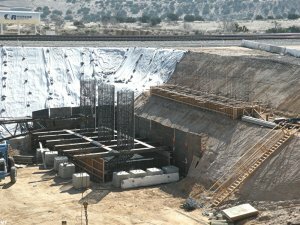 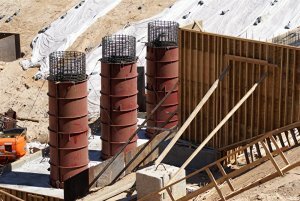 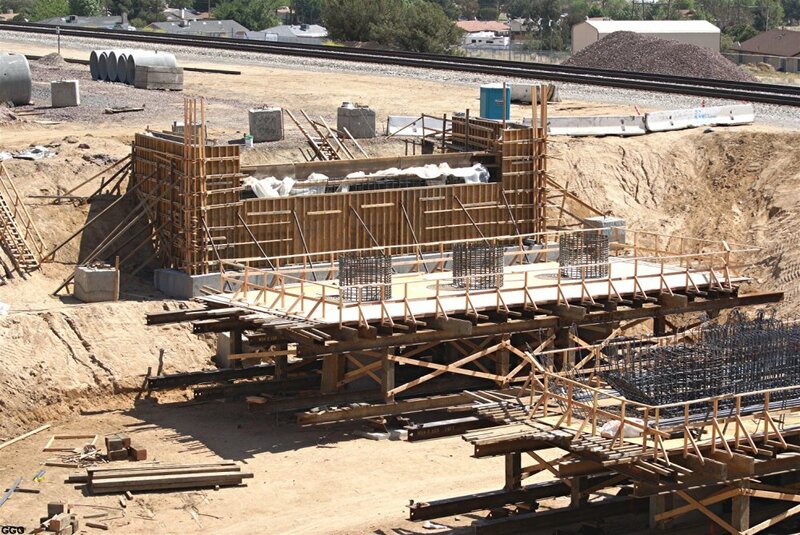 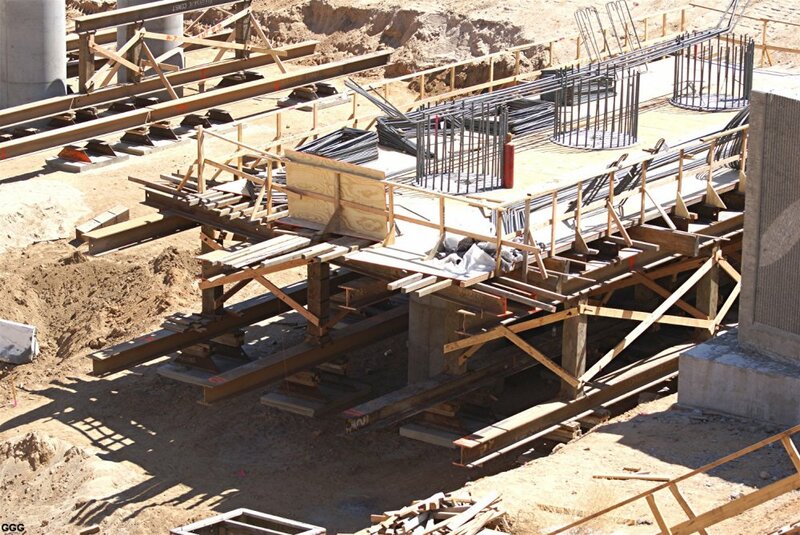 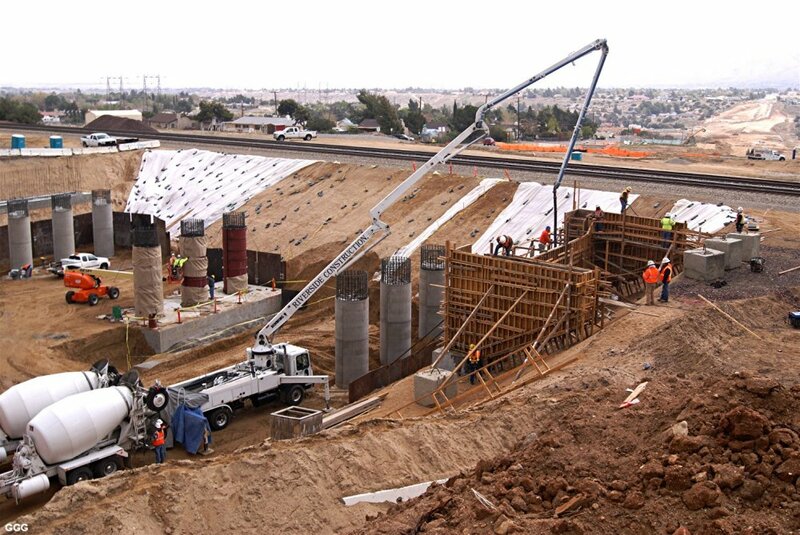 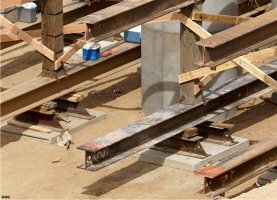 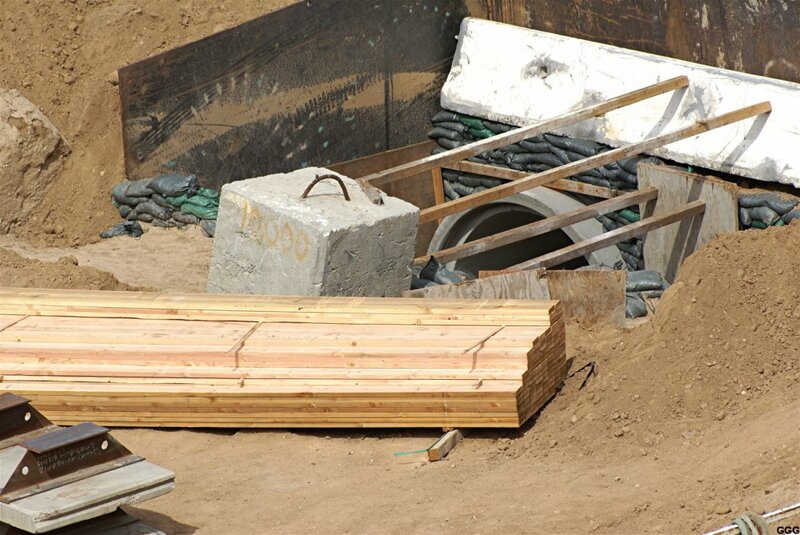 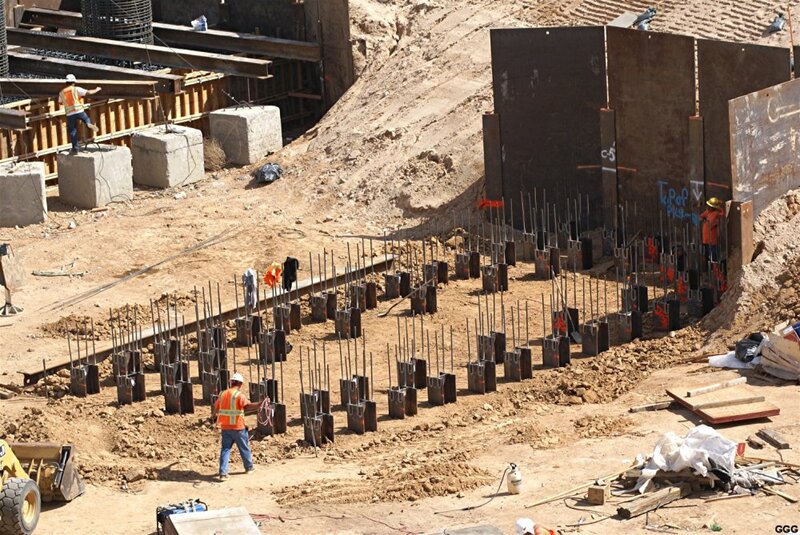 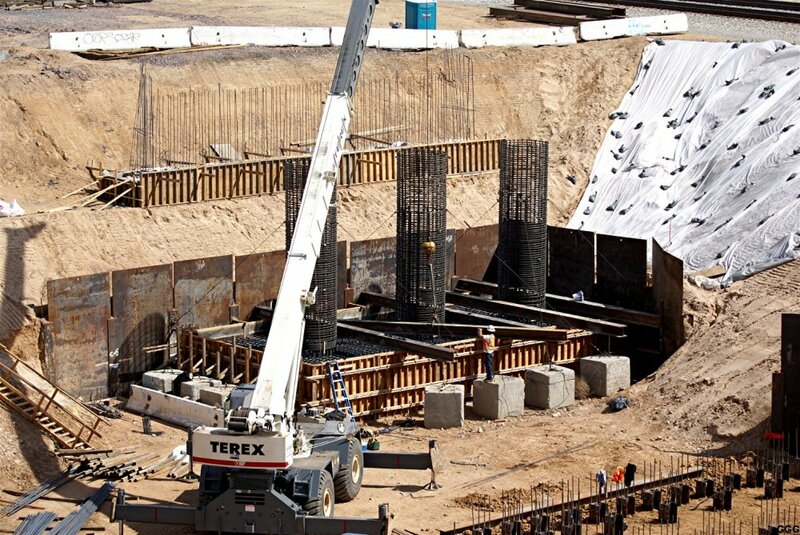 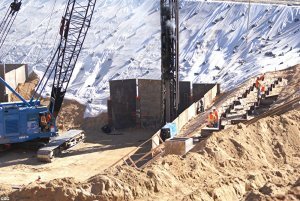 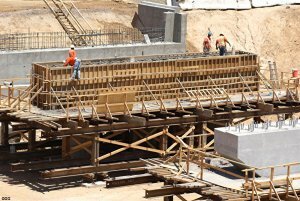 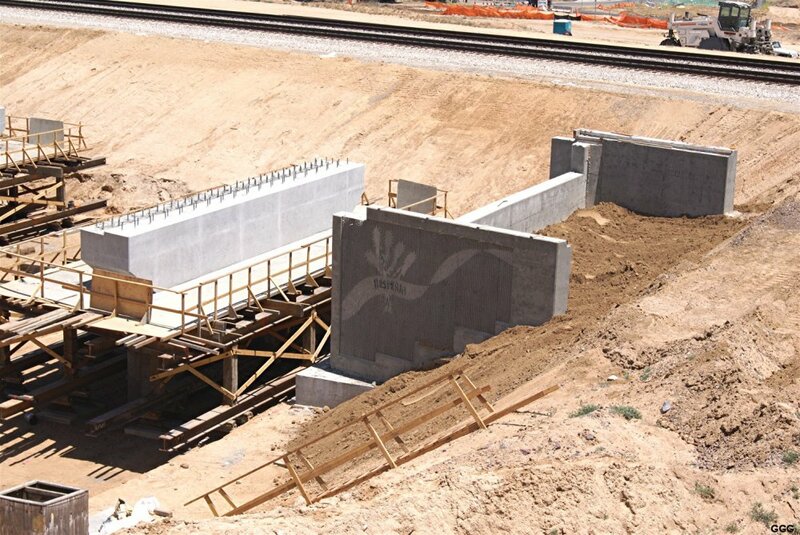 April 19: MEANWHILE, AT THE RANCHERO RD PROJECT: 2244: The Western wooden abutment forms are being removed and rebuilt to support the Eastern Abutment superstructure concrete pour. 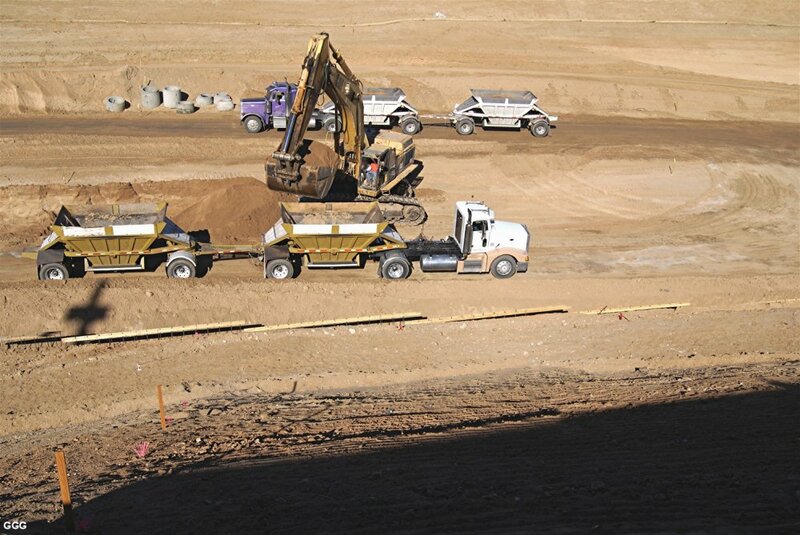 The dirt floor of the "pit" is being raised about a foot. 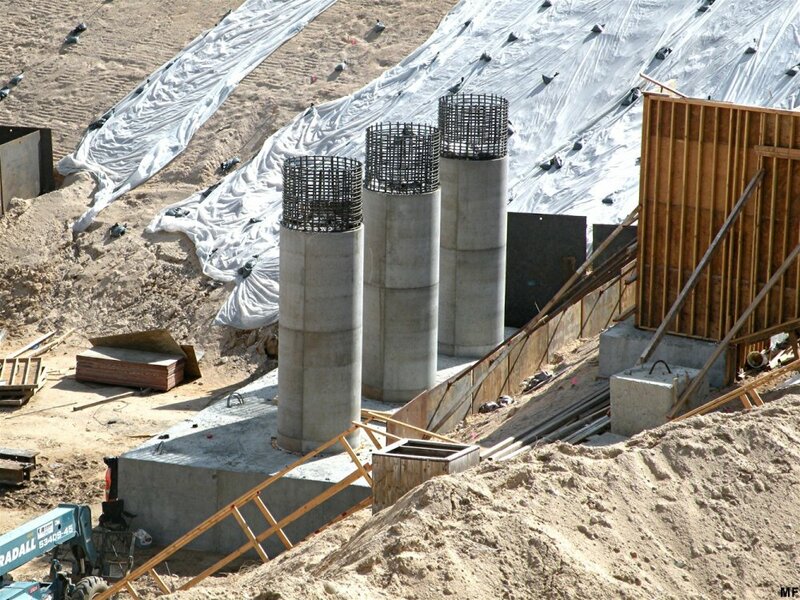 Later, protective islands will be built to protect the columns. 2245: Close up of the City of Hesperia artwork in the concrete. 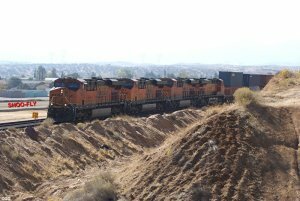 2246: BNSF 7712 with BNSF 6968 (mentioned on 2012 page, photos 2238-43) is finally WB at MP 48. 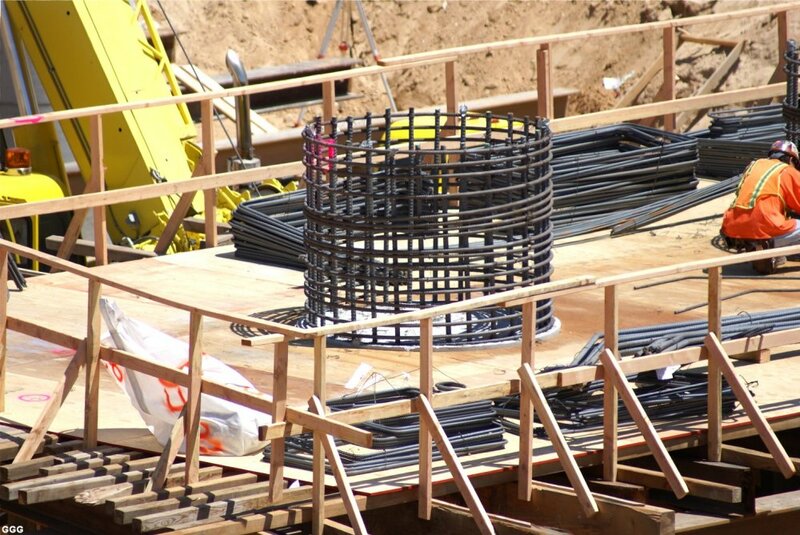 -- The round steel column forms were in six half round pieces (in this case) and bolted together. 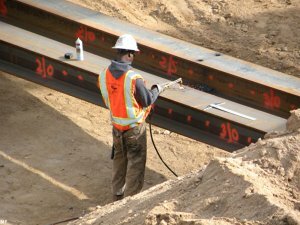 -- The steel forms were wrapped before the pour because the ambient temperature was forecasted to fall below 40 F.
-- The steel retaining walls, pilings and protective plastic have been / are being removed. 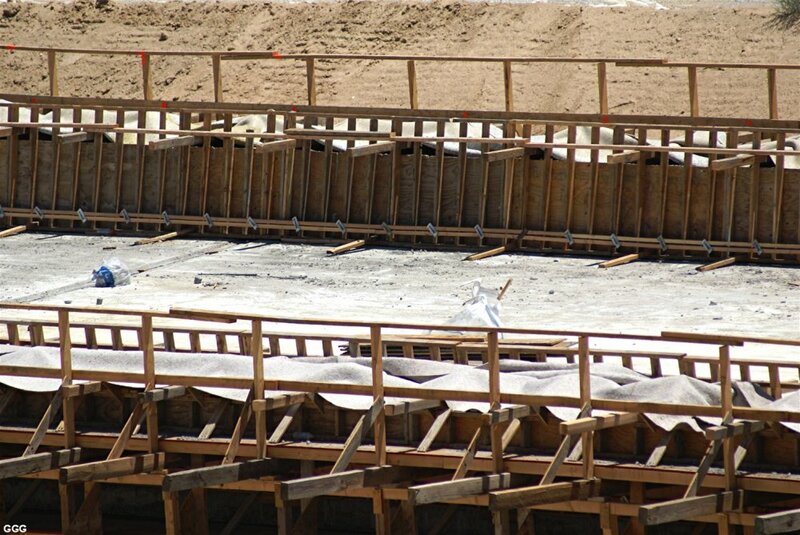 The dirt floor has been raised and walls of "the Pit" are considered strong enough to stand alone. 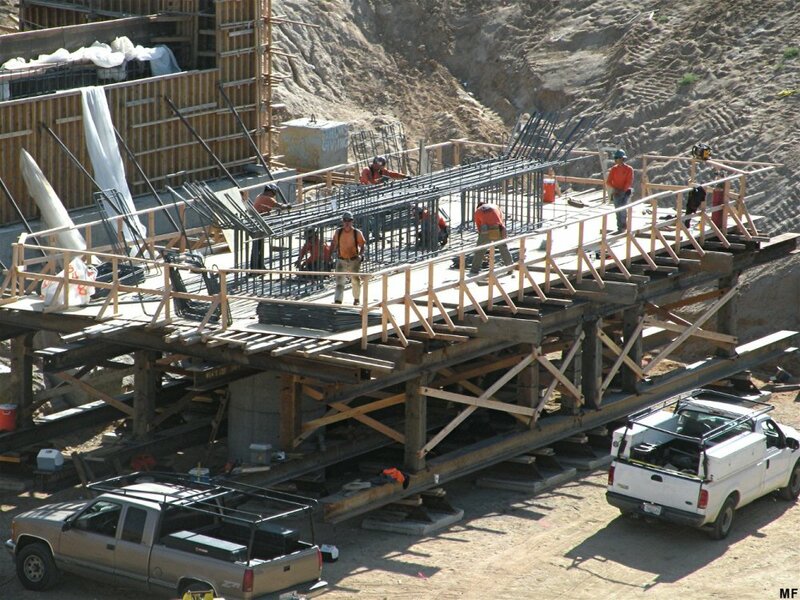 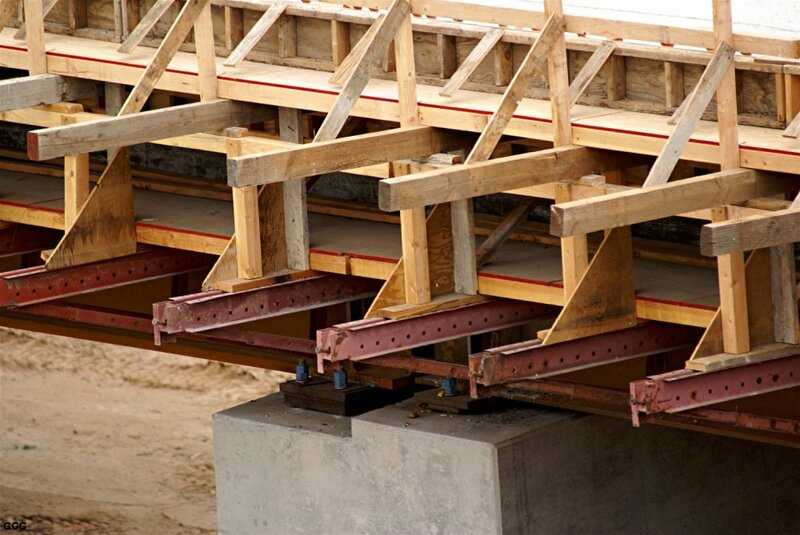 -- Construction of the falsework (support and forms) for the bridge deck should begin in the next week ---- or so. 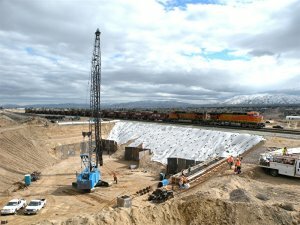 April 28: 2259: Project Overview. 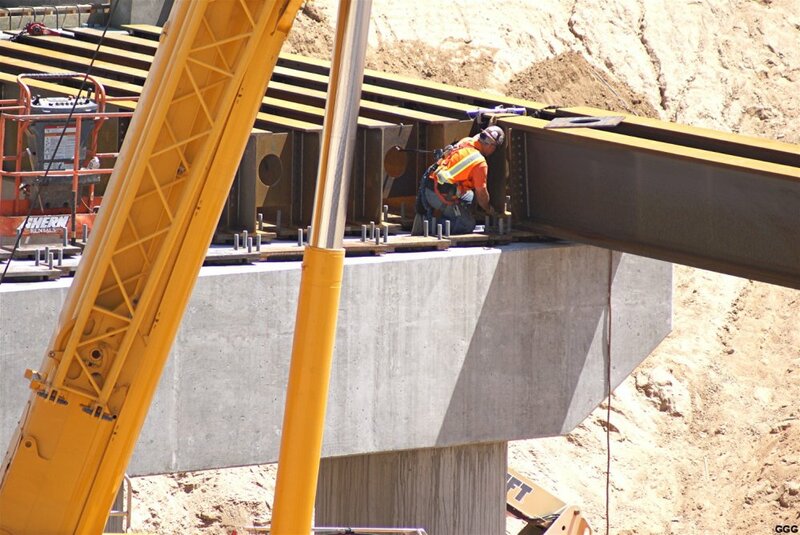 The support structure surrounding the Western columns now has a platform. 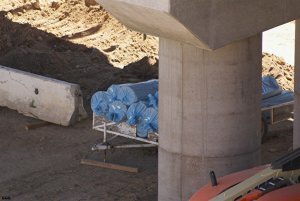 The same structure is being built for the middle columns and the "gap" in the six foot storm drain appears to have been "closed". 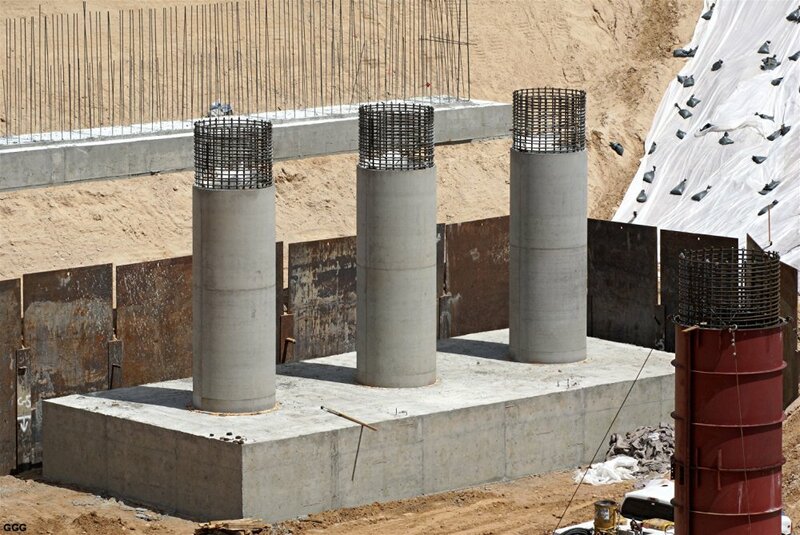 2260-61: Close up of the Western support structure and the start of the same structure for the middle columns. 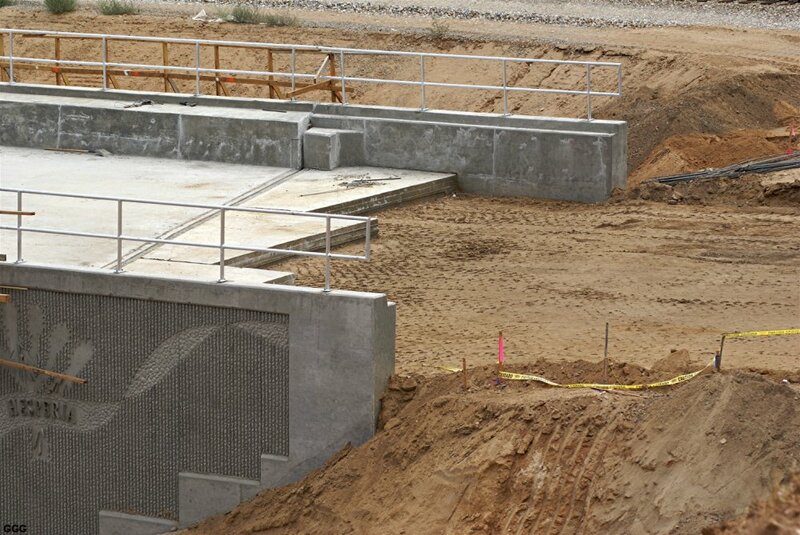 2262-63: Close up of the storm drain & the Western support structure. 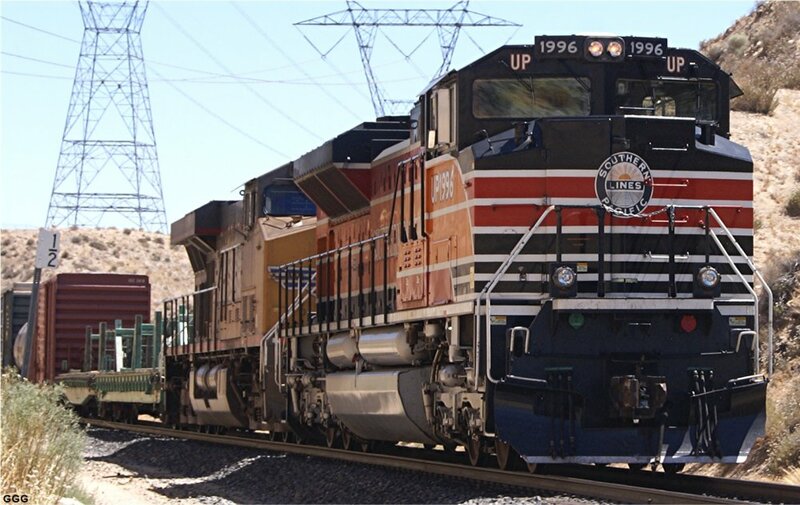 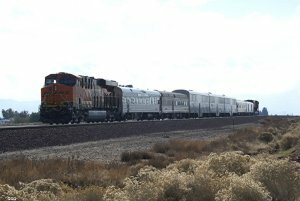 2264: BNSF / UP meet at MP 48. April 8: Marc, today, made an early visit to the bridge project. 2280-81: Marc did some trudging through the loose dirt to get the different views. 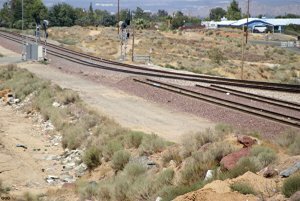 2282-83: Western pier cap. The function of the metal pieces being installed atop the rebar is unknown at this time. May 5: Hope we're not inundating you with pictures but this project has taken on "a life of it's own" among the 60+ World-WIDE folks on this list. 2289: Column caps (West & Middle) appear to be formed and ready for concrete. 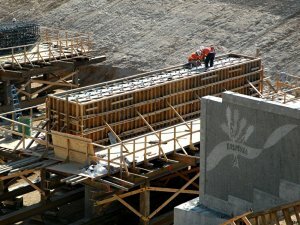 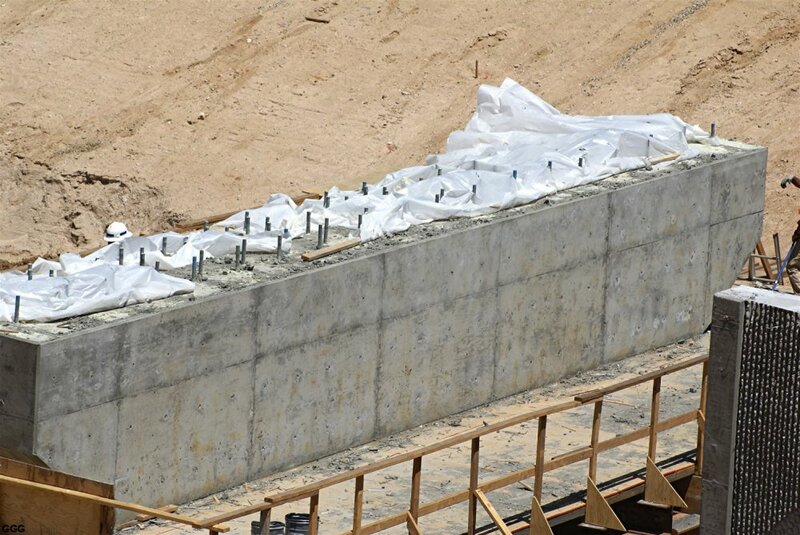 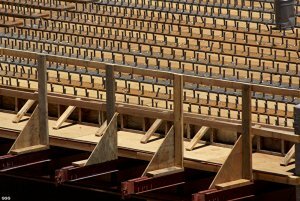 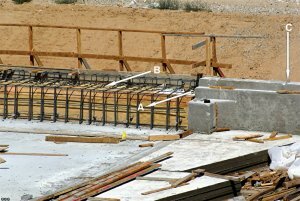 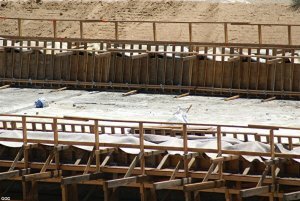 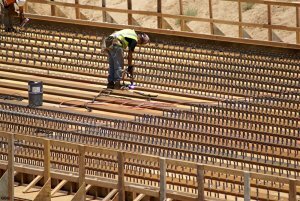 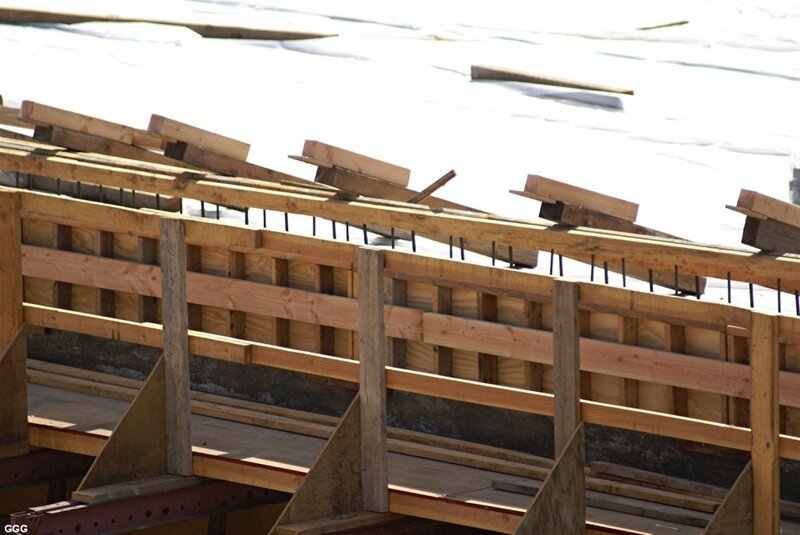 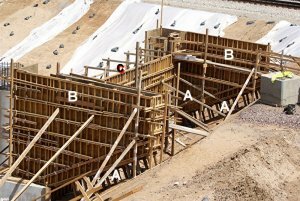 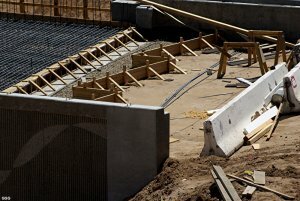 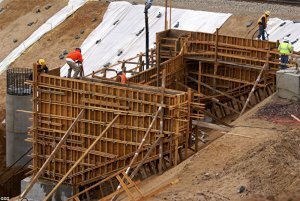 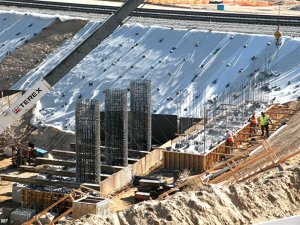 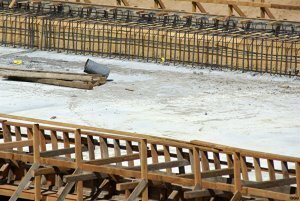 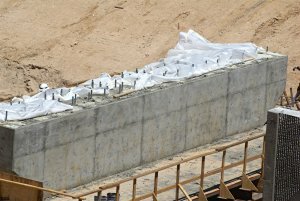 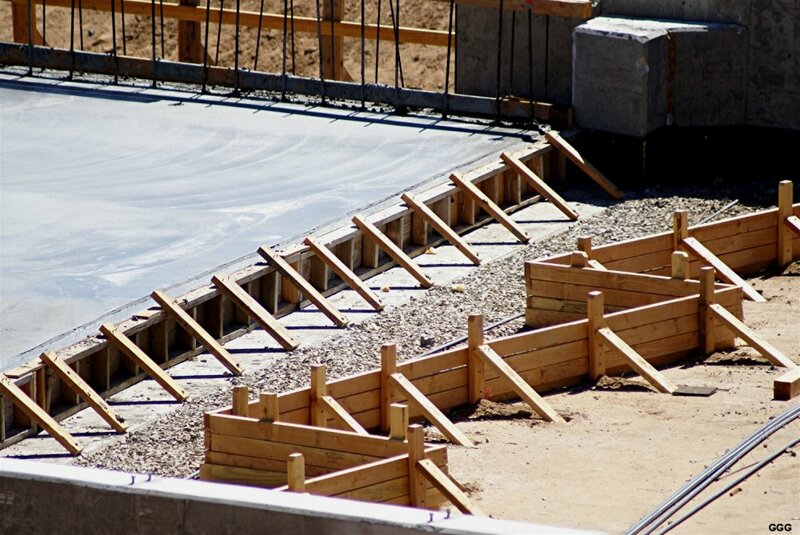 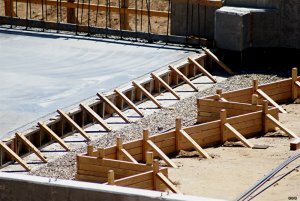 2290: From April 19 --The abutment wing walls were formed and poured with their bases supported by wooden forms -- giving the appearance of "floating". 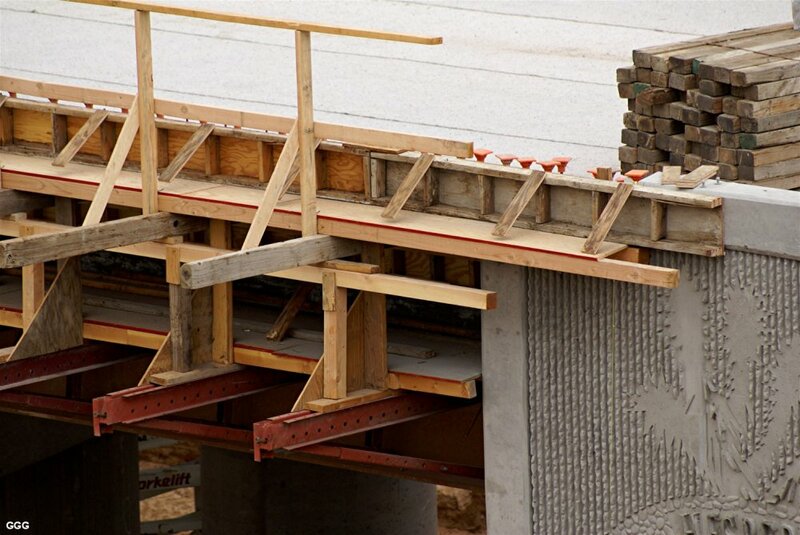 This construction technique has generated many questions -- to say the least !!! 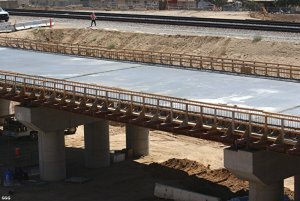 Today, my neighbor and good friend needed a ride and the bridge was mentioned during the drive. 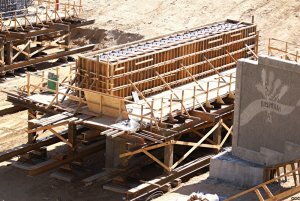 I had not intended to take any pictures until I noticed that "after the fact" foundations had been poured under the wing walls of the Western abutment. 2292: Overview - The Western Column Cap forms have been removed along with the footing forms below the Western abutment wing walls. 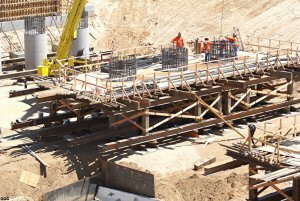 Forms for the Eastern Pier Cap are nearly complete and it APPEARS that we will shortly see the start of bridge deck construction. 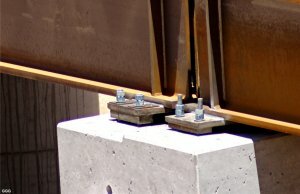 2293: From Marc's 8 May picture, questions arose concerning the purpose of the metal plates that were being installed atop the forms of the column caps. 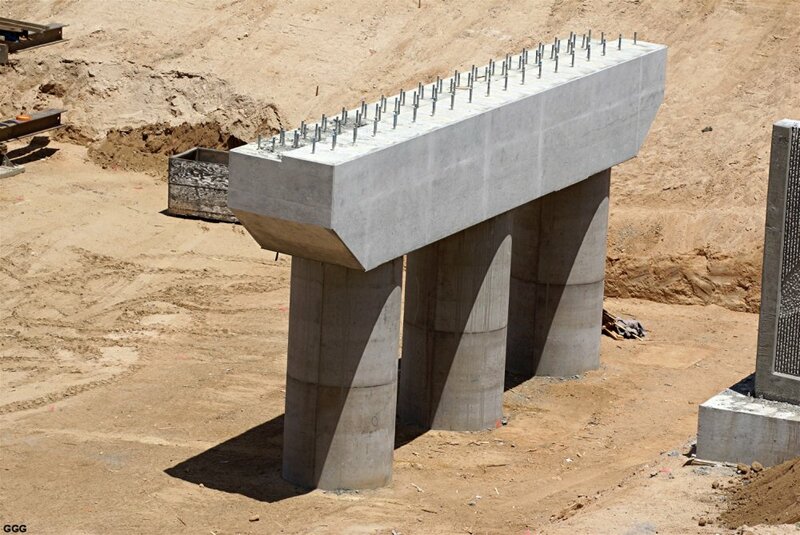 2294: The finished Western Column Cap with steel bars protruding about one foot above the concrete. 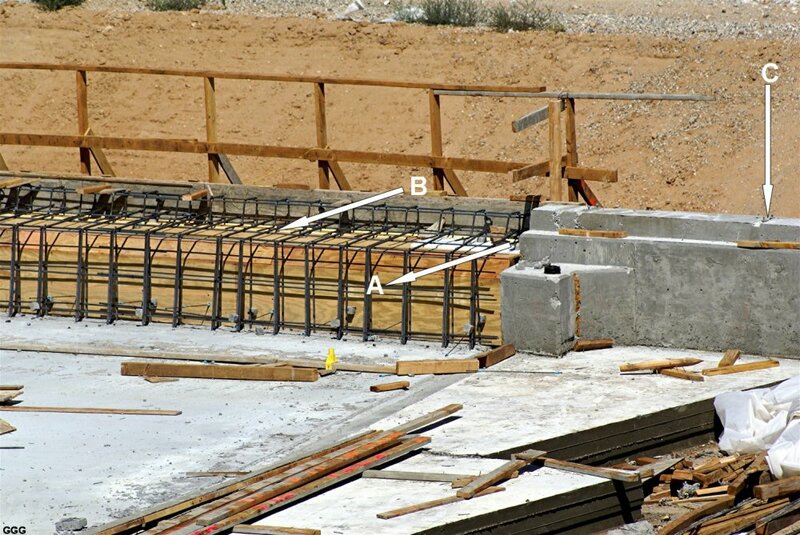 2295: At lower right is the poured Middle Column Cap with those steel bars installed. In the middle, workers are attaching the aforementioned steel plates and bars to the forms of the Eastern Column Cap. 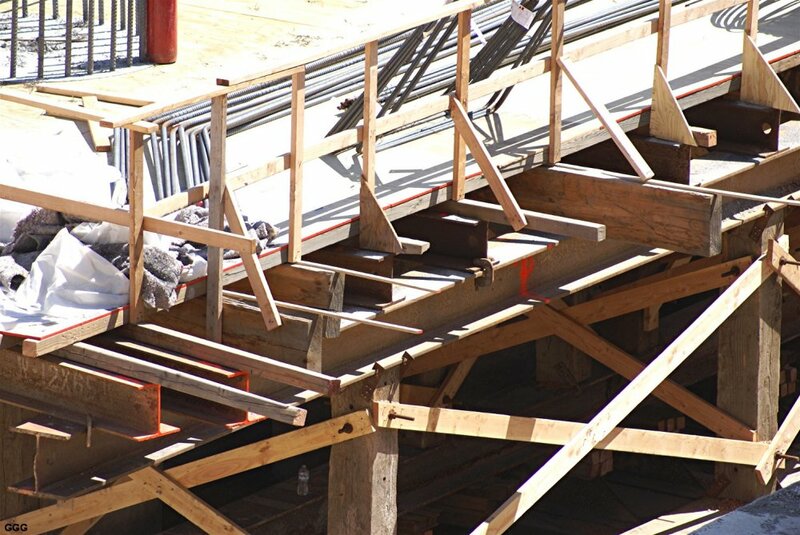 Hanging on the outside of the forms are several of the steel bars which will become part of Pier Cap. 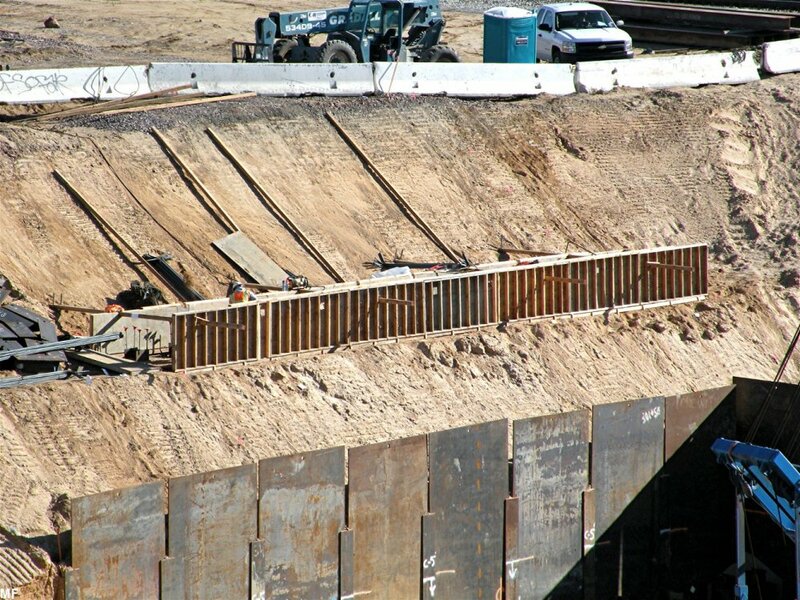 At the top is the Eastern Abutment with corresponding steel bars. 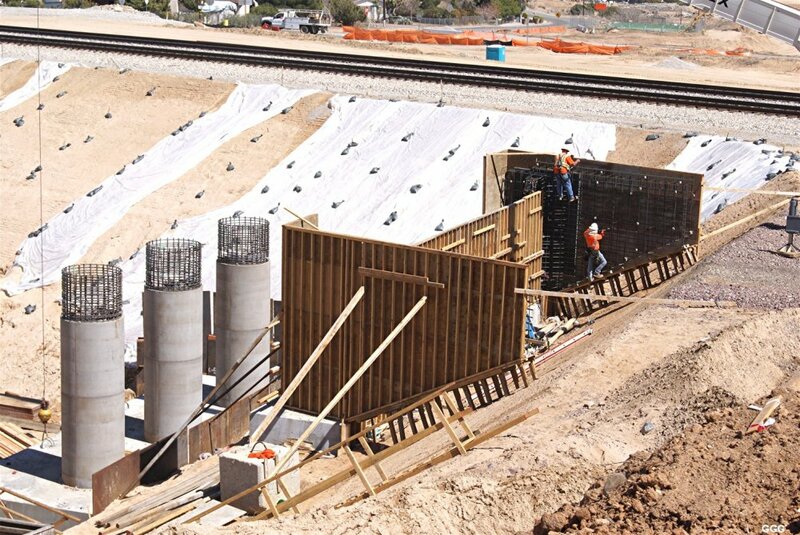 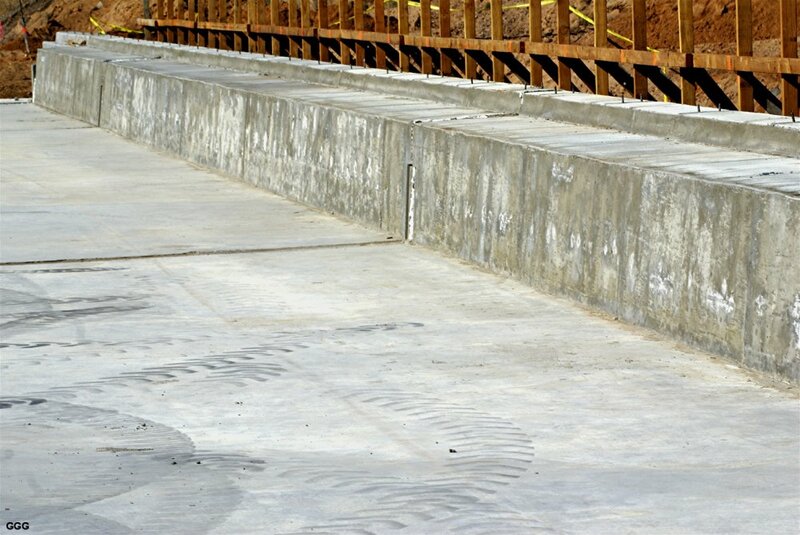 2296: It APPEARS that there was a bit of a problem in pouring the footing below the Western Abutment Wing Wall. 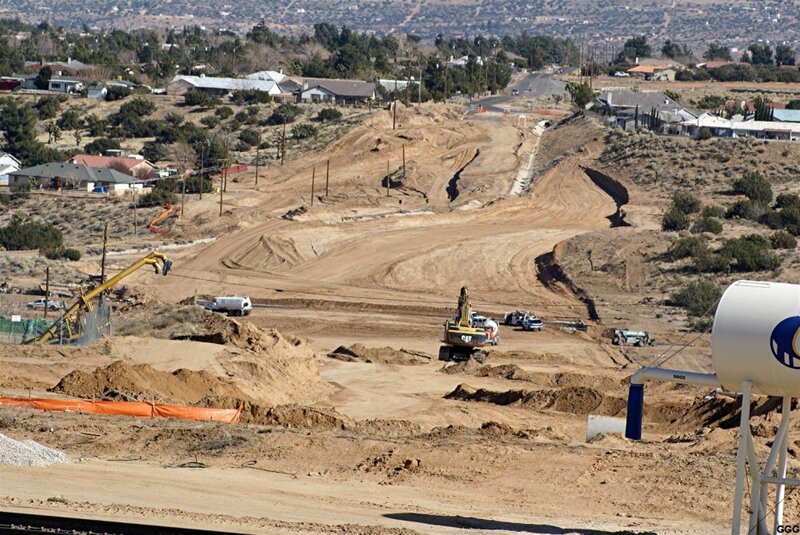 May 25: 2328: Overview from 5/25/12. 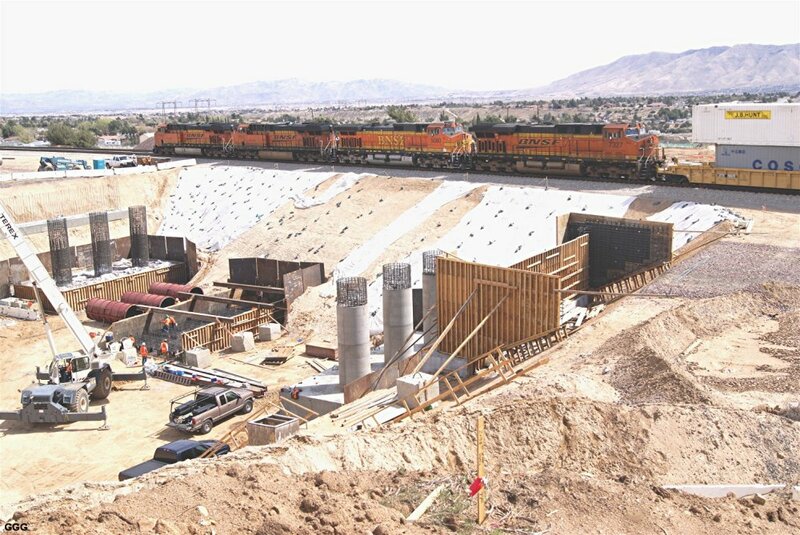 2329-30: The "fill" behind the Western Abutment has been raised and compacted to near old roadbed level. 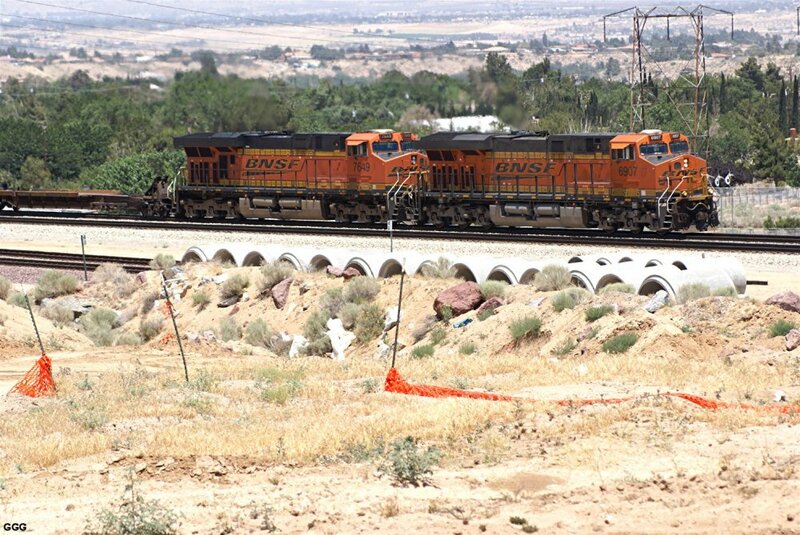 June 16: Howdy from a very warm Mojave Desert. 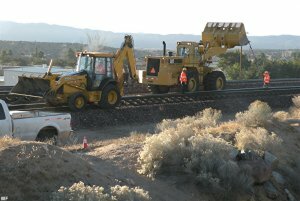 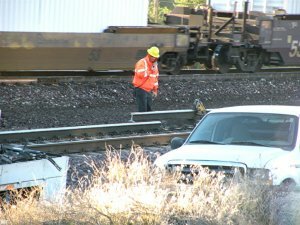 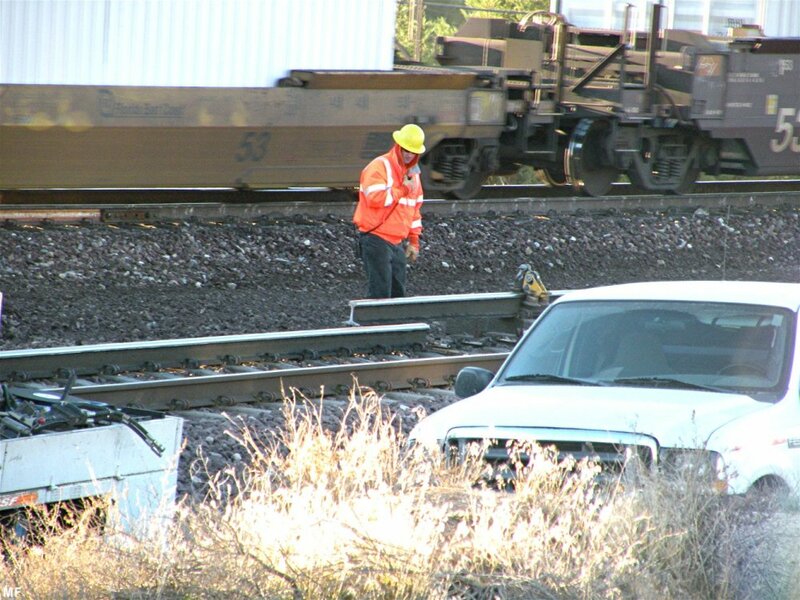 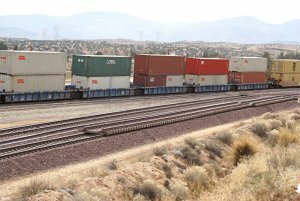 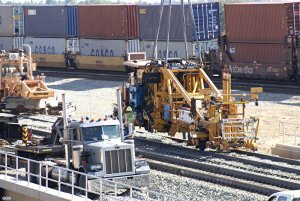 There have been some interesting developments at the BNSF Bridge/Ranchero Rd project over the last week. 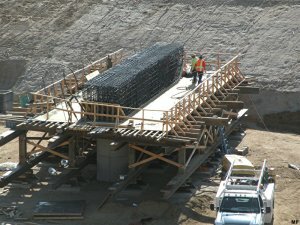 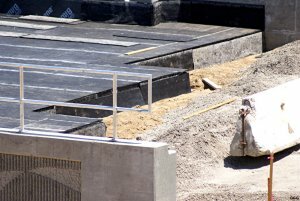 June 18: One of my Construction Engineer friends spotted me on the photographic "overlook", drove up and spent half an hour answering your questions. 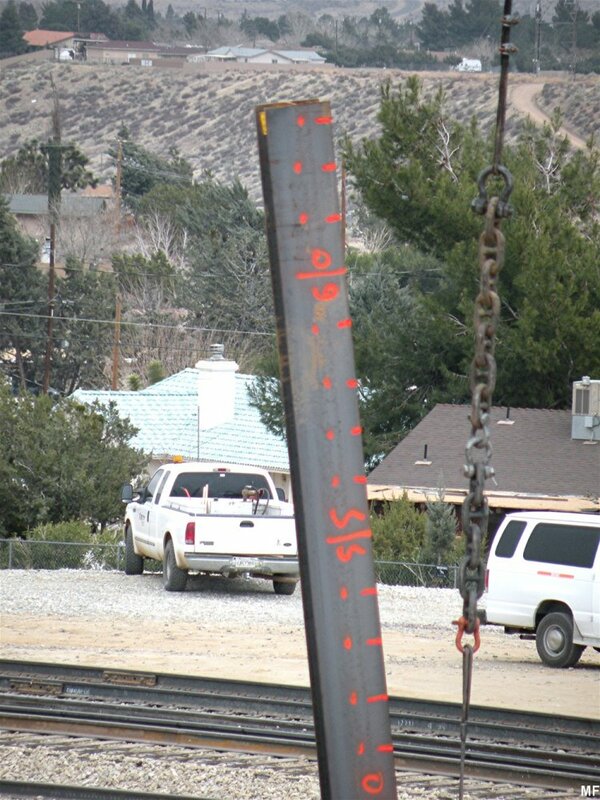 2385-86: The vertical "anchors" welded to the "I" beams are called SHEAR STUDS. 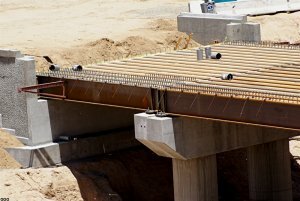 The studs will lock the NINE INCH THICK concrete deck to the supporting structures and insure that the bridge becomes one rigid structure. 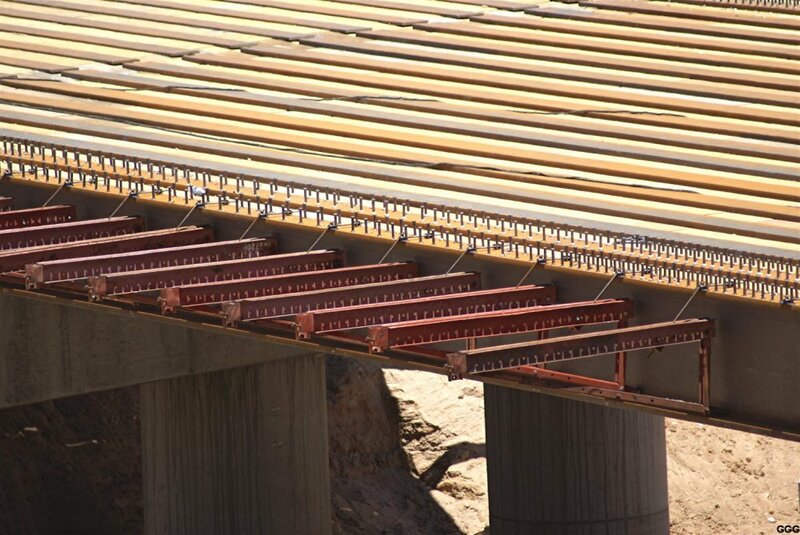 The "Wings" being welded to both sides will support the bridge side-walls and two thee foot wide walkways. 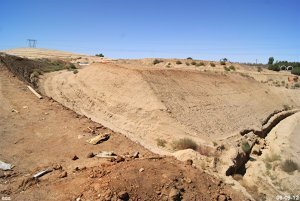 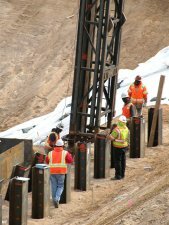 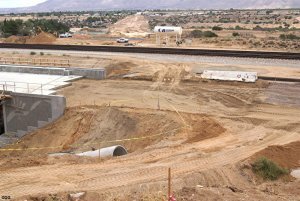 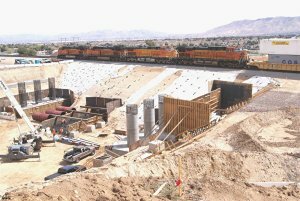 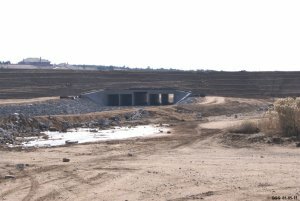 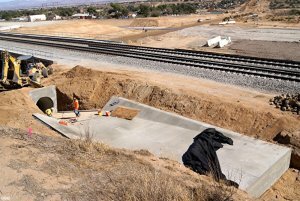 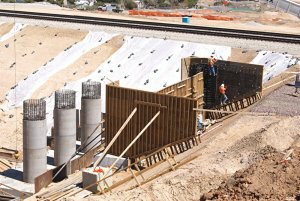 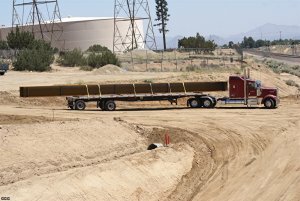 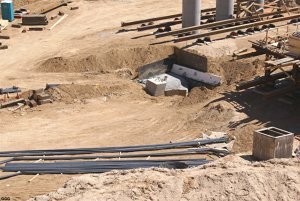 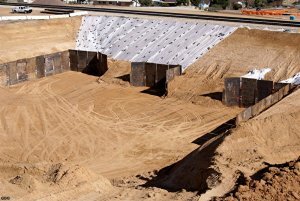 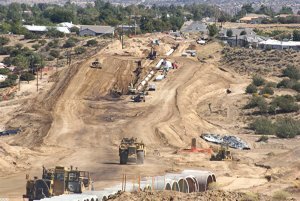 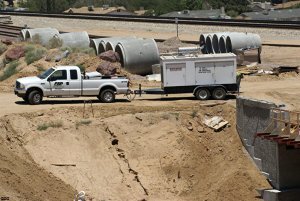 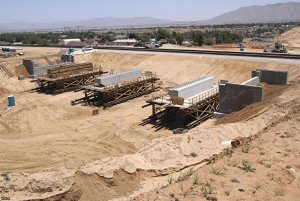 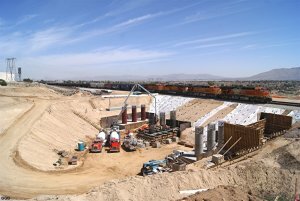 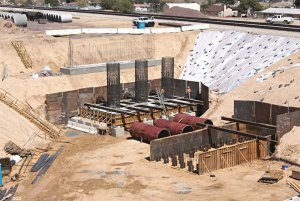 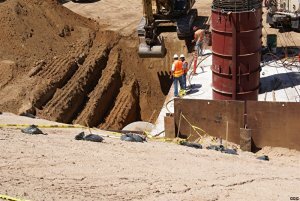 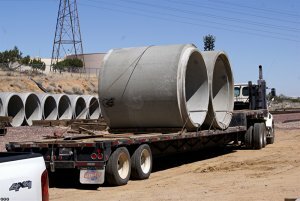 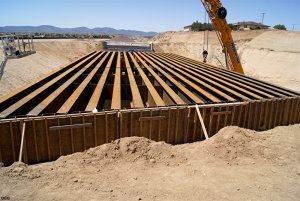 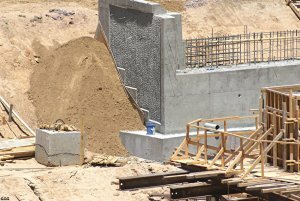 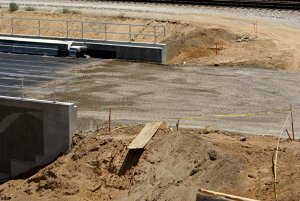 2387: As you may remember, an eight foot box culvert was built at the lowest point of the Eastward extension of Ranchero Rd. 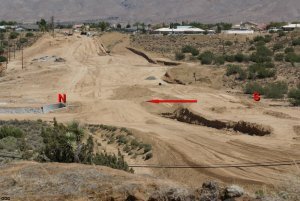 The culvert portal is just to the right of the CAT boom near the bottom of the picture and is now covered by about 15-20 feet of earth. 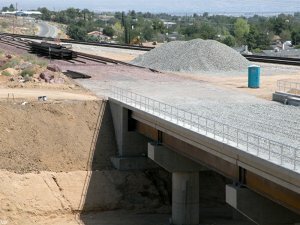 I am told that the road will eventually be raised to thirty feet. 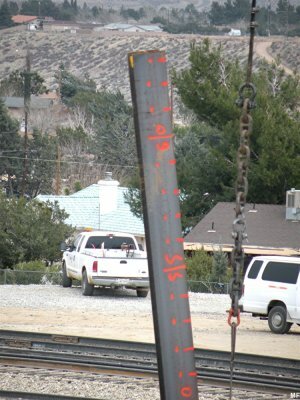 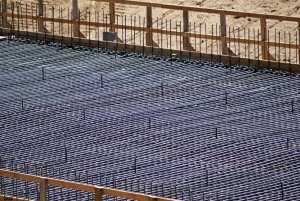 The rebar used varied from .25 to 1.25 inches in diameter---according to position and expected loads. 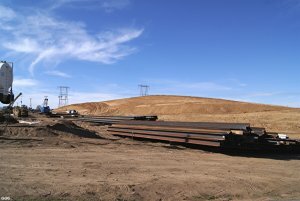 The DOUBLE "I" beams were of two lengths ---33' 8" @ 23,000 pounds and 71' 4" @ 47,000 pounds. 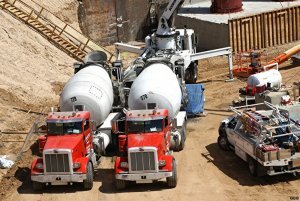 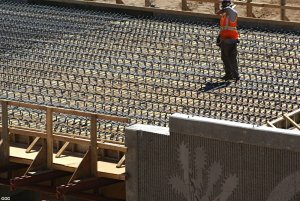 The concrete used will reach 90% of its end strength in 28 days. 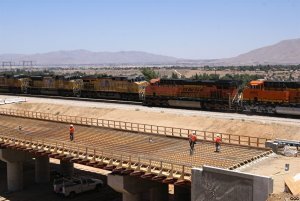 The bridge is being built wide enough to accommodate a FUTURE third main track --- which means that potentially, nine BNSF/UP diesels at 430,000 pounds each could meet on the bridge - all traveling at 60 MPH. 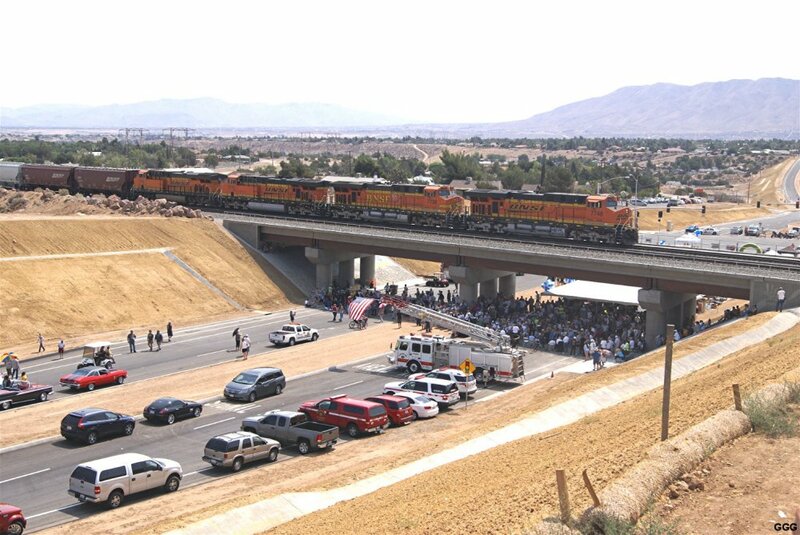 Add in California Earthquake Standards and the fact that this bridge will span one of four emergency railroad crossings in the Valley. 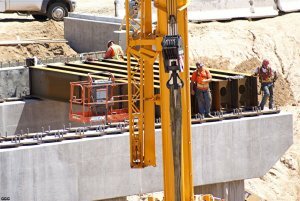 June 22: Spent a bit of time at the "project" for some close ups. June 30: I had not planed to visit the project this weekend but something ??? caught my attention on the web-cam images. 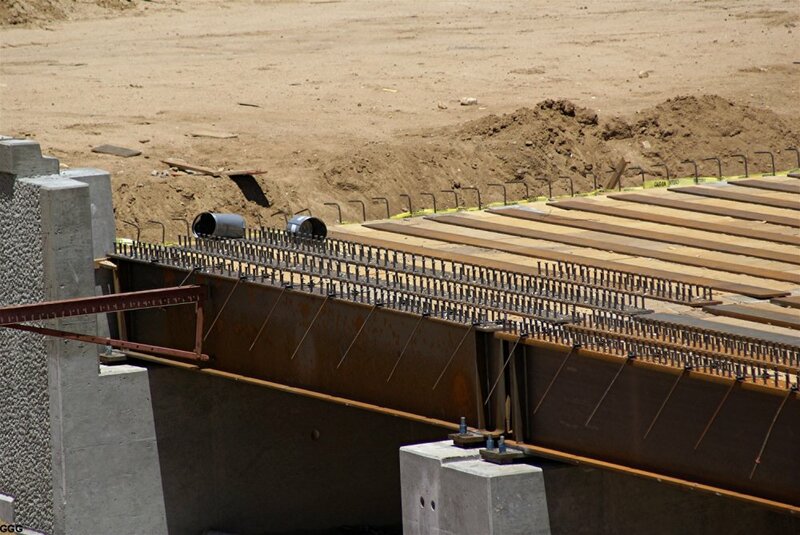 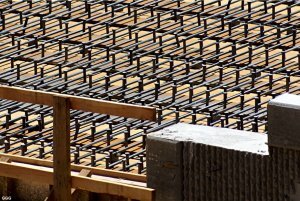 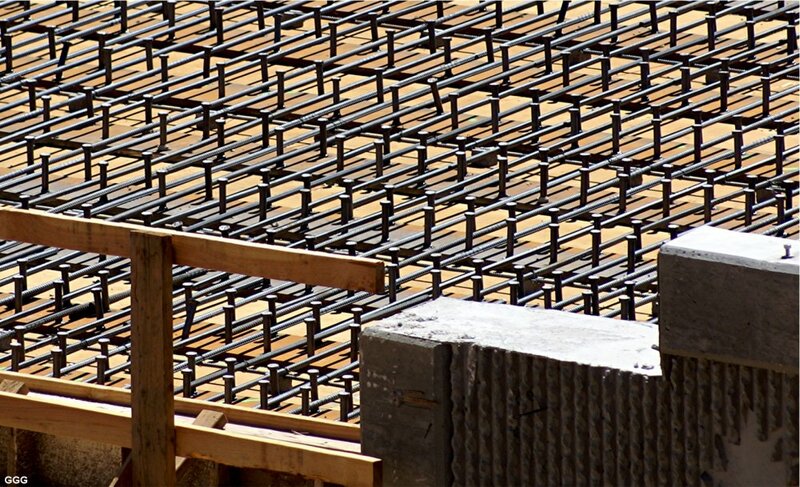 2410-12: The amount of rebar installed to reinforce the bridge deck is amazing. 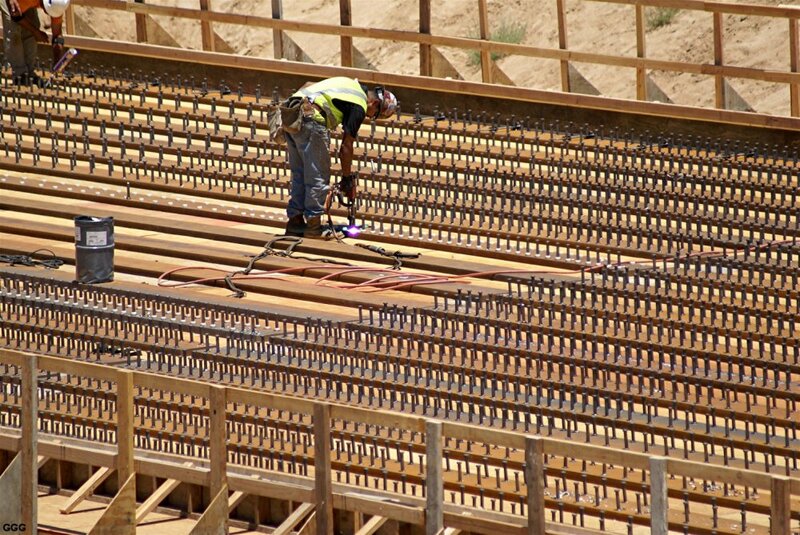 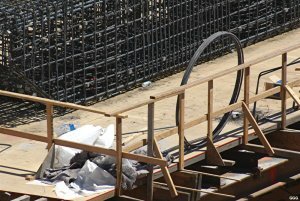 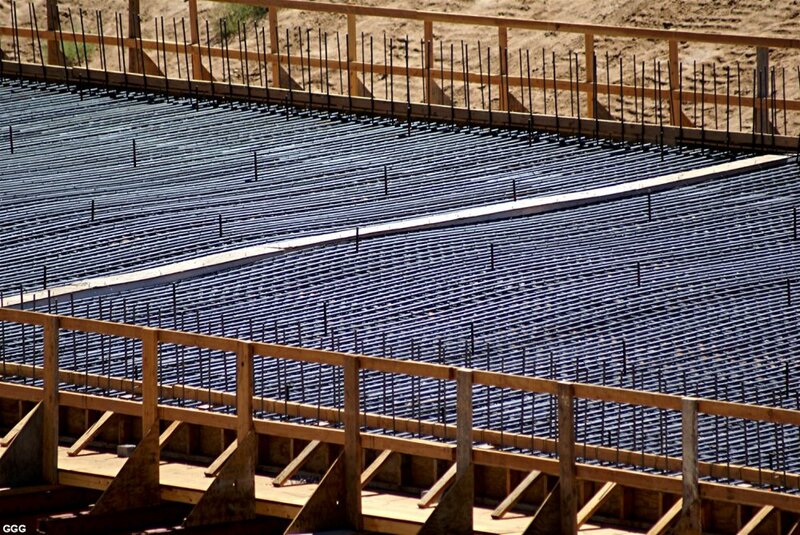 However, I do not understand the undulations in this rebar compared to the uniform rebar installations in the pier bases, the piers and the pier caps. 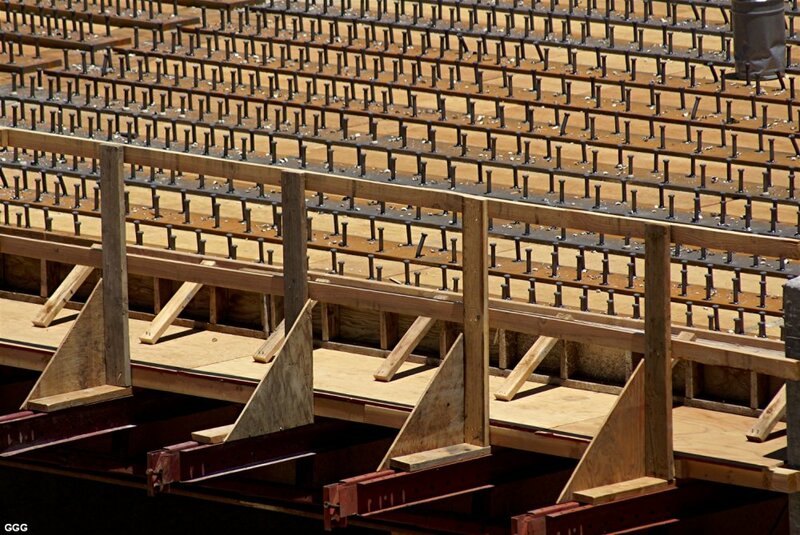 The vertical "spikes" have red marks sprayed on them which I GUESS indicate the top level of the deck pour ??? 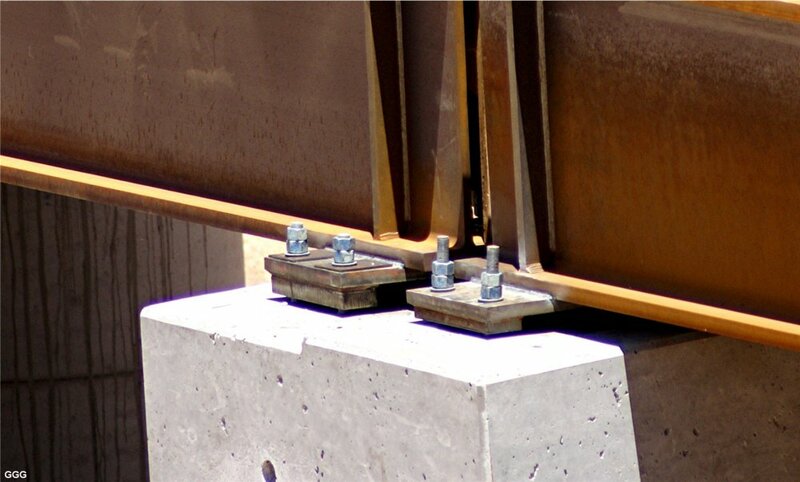 I also GUESS that the white materials placed across the bridge have something to do with expansion joints. 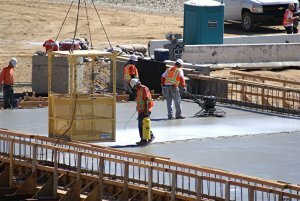 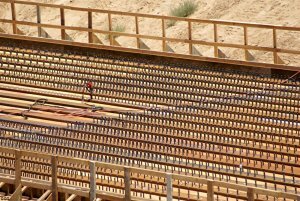 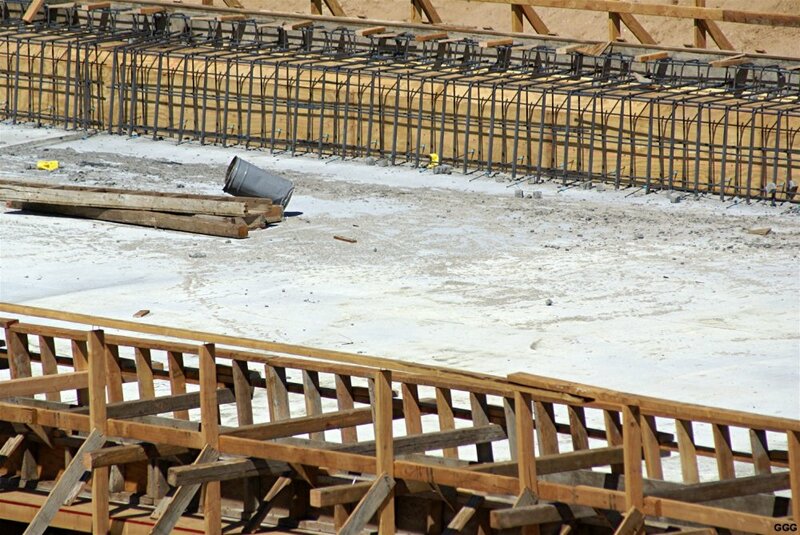 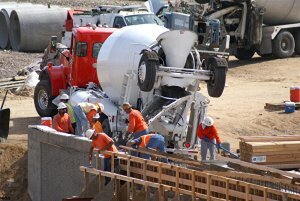 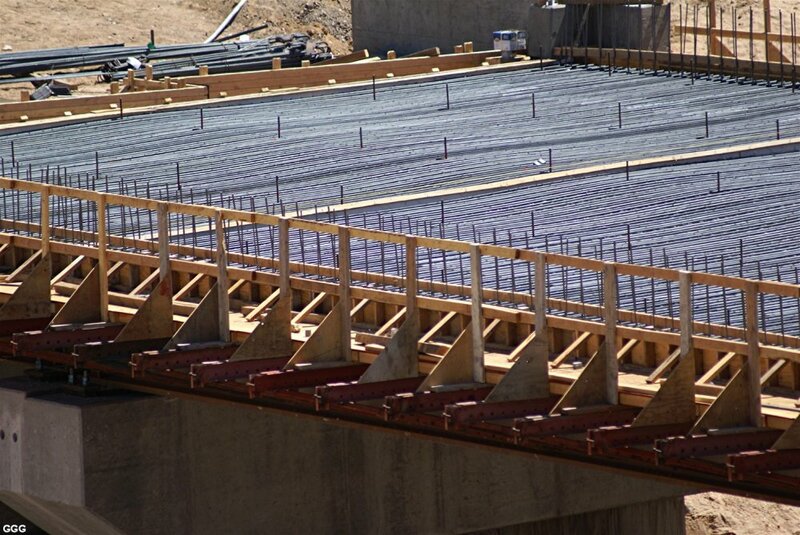 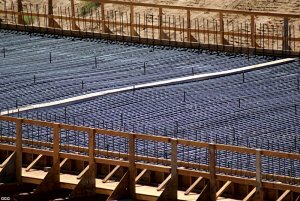 July 6: Starting very early this AM, to "beat" the Mojave Desert heat, and under construction lights the main deck concrete pour was finished around 0900. July 10: I am still surprised at how many on this list are interested in this bridge project. 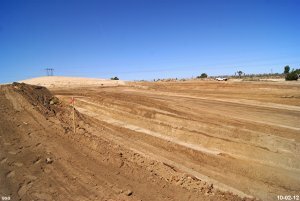 So, I thought I'd better get over to the project and get some pictures before the semi-nasty e-mails start again --- HE HE. 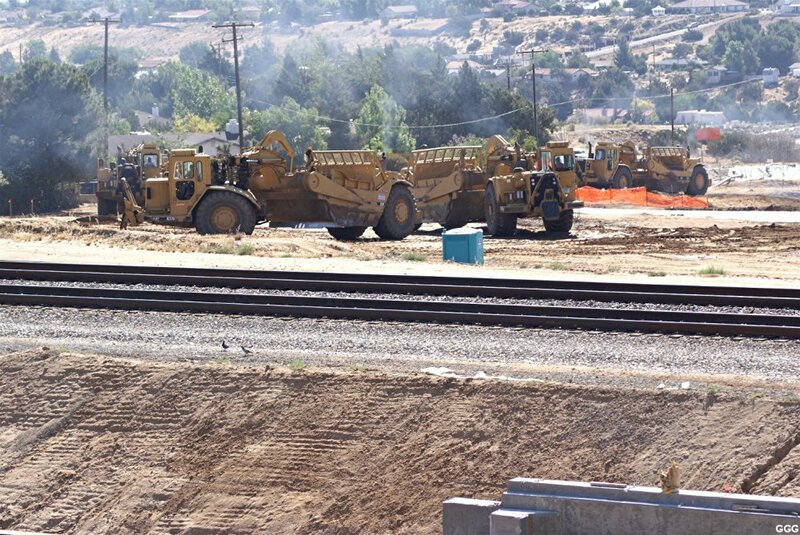 I had to have some feelings for the construction workers since the temperature hit 110 F in the Valley yesterday. 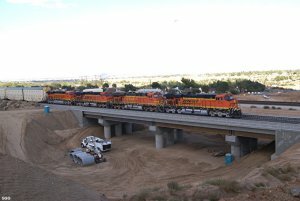 To answer another question --- Although the new bridge is oriented in compass directions North & South, we always use the BNSF "Transcon Rule" that any train headed from Chicago to Los Angeles is a WEST BOUND --- no matter where it is and what direction it may be traveling at any given moment --- and vice versa. 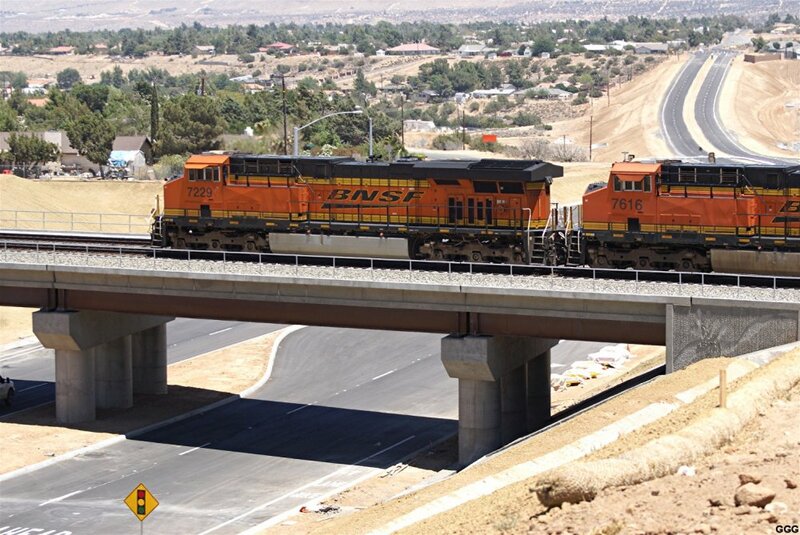 Therefore, in line with BNSF tradition, the bridge runs RR East & West. 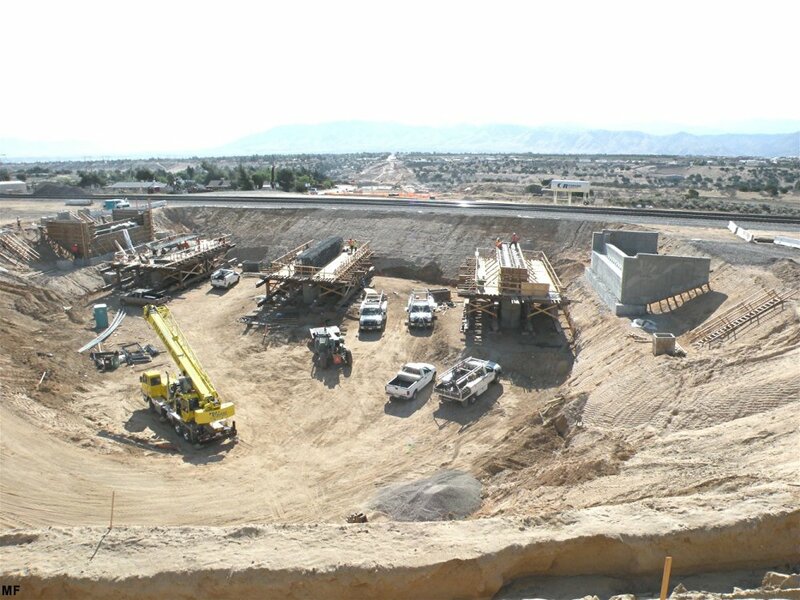 July 17: Stopped at the project while returning from a trip "down the Hill". 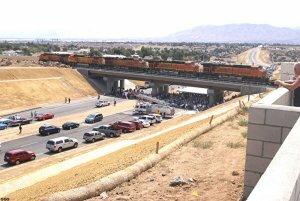 For you non Mojave Desert types, "Down the Hill" means driving over Cajon Pass and winding up anywhere in the very large triangle formed by Palm Springs, L. A. and San Diego. 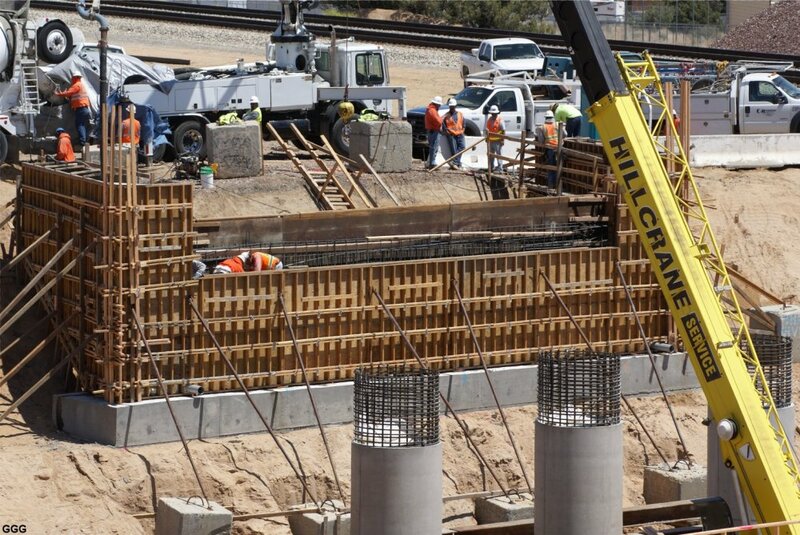 2445-46: Construction crews are building the "False Work" and installing the rebar for the bridge side walls, the walk-ways and the safety railings. July 19 - July 27: The last ten days of Bridge construction have been somewhat busy but not very photogenic. 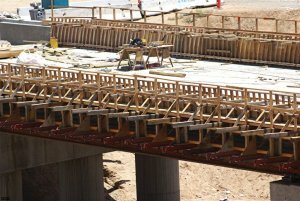 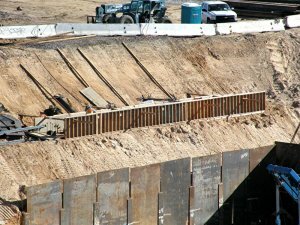 2491-93: The intricate forms for the bridge sidewalls, walkways and safety railings were completed, poured and covered. 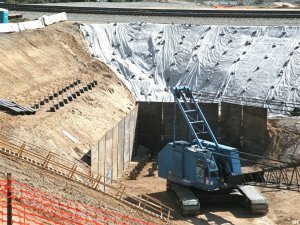 2494-95: Last Friday (7/27), the sidewall forms were removed revealing the final configuration of the upper bridge surfaces. 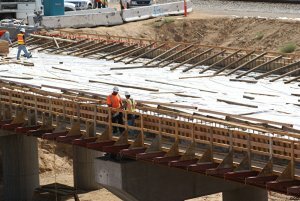 July 28: On Saturday, I decided that I really needed to walk across the new bridge. 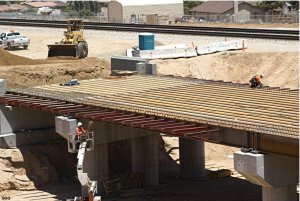 As often as I've been near this structure, I was still surprised at how massive it really is ---- considering that it's a railroad bridge in the middle of the Mojave Desert ! 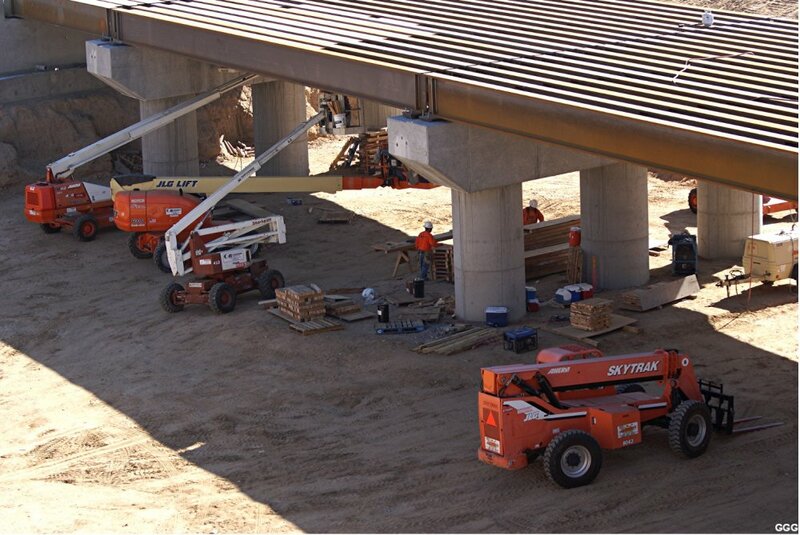 August 1: (A/O Wednesday) 2503-05: A contractor installed safety railings on both bridge sides. 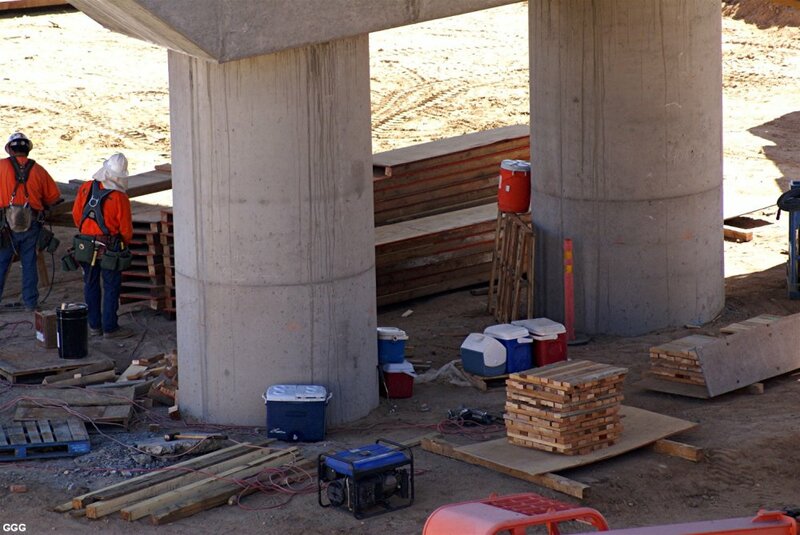 Riverside Construction crews removed the wooden forms, which supported the deck pour, from under the bridge. 2506: The excavated area, between the concrete approach and the "old" ROW will support HEAVY sub-ballast. 2507: I've had several questions concerning the saw-toothed, zig-zag configurations of the concrete approaches to the bridge. 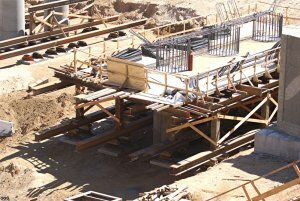 I visited my Construction Engineer friends yesterday, and after a long session, I THINK they MADE me understand the design and the process. 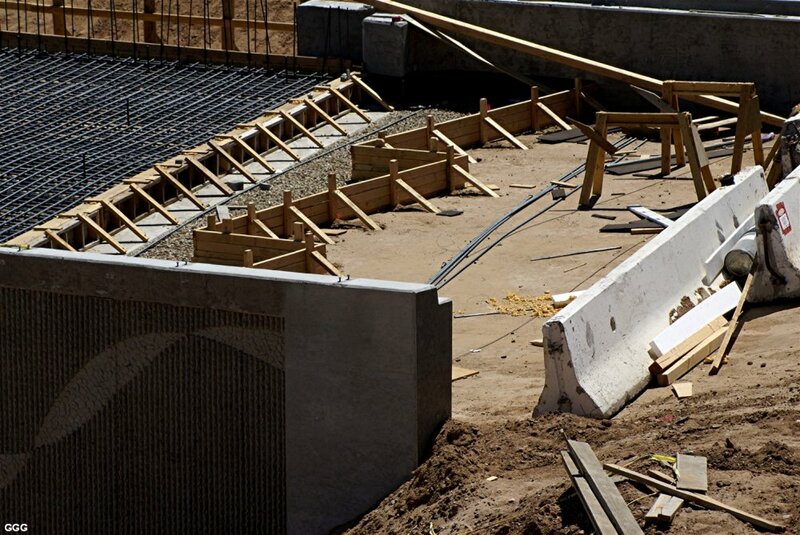 It's all in the architectural design!!! The new Ranchero Rd will run compass East & West under the new BNSF bridge, which was designed to run compass North & South. 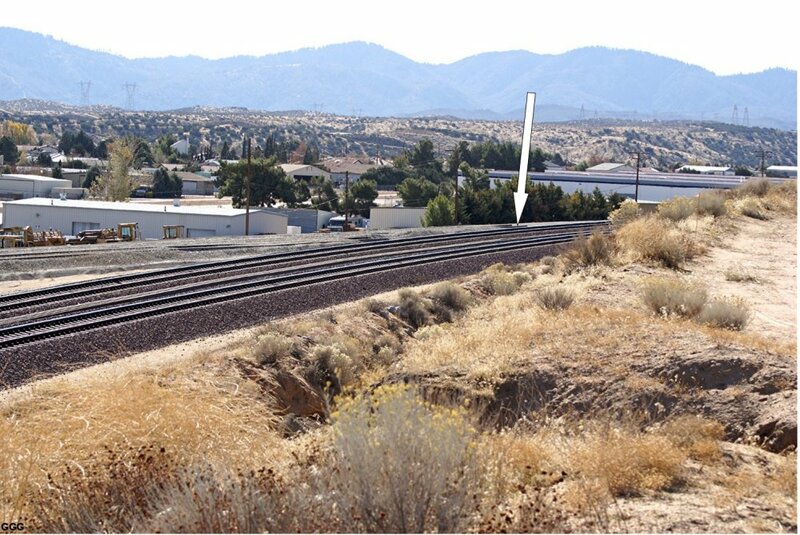 However, the BNSF ROW does not run exactly COMPASS North & South in this area. 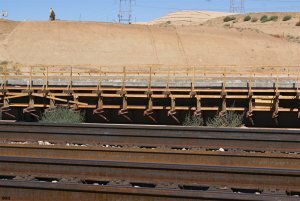 And so, the design was to build the bridge FIFTY FEET wide so that the tracks can and will cross the bridge at an angle. 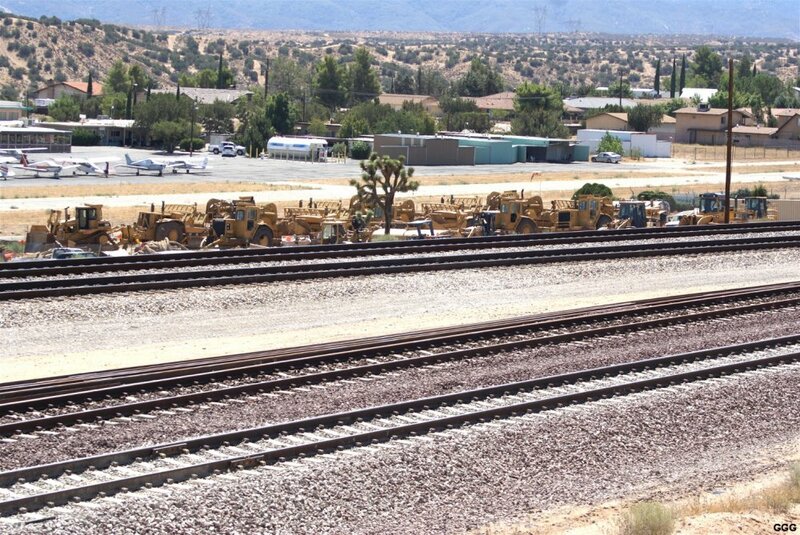 2508: From the City of Hesperia Web Site (CofH) showing that the zig-zag configuration does meet the "old" ROW at the desired ninety degree angle. I asked many questions such as why the designer didn't "stagger" the bridge supports to align the bridge with the RR ROW --- which would have allowed for a more narrow bridge. 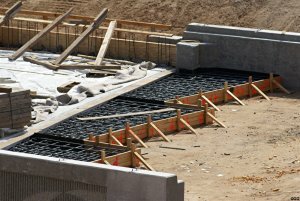 Of course, I was talking to the builders and not the architects. We also spoke of the stockpiled dirt, the earth that must be removed to lower the Western extension of Ranchero Rd and the Shoo-Fly itself. My engineer friend stated that the Eastern extension of the Rd must be raised by another eight feet and that they just may have enough fill --- after compaction. 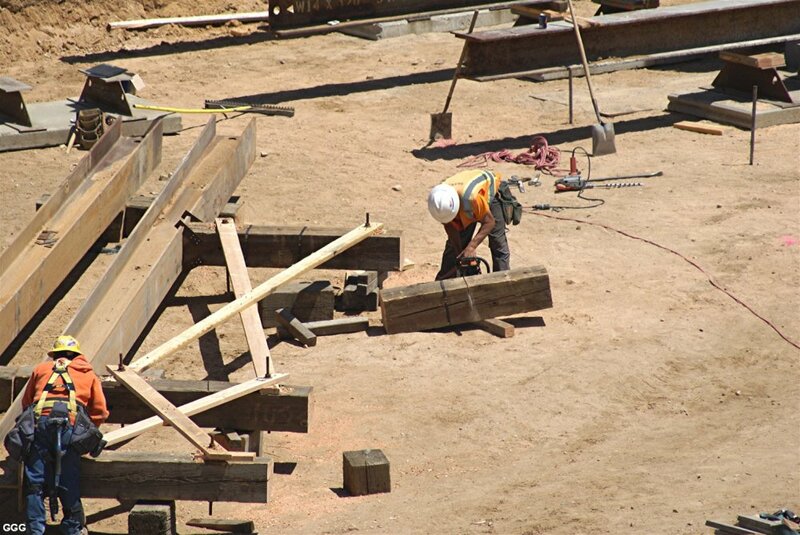 August 8: Pics 2521-22: All wooden and steel forms and supports are being removed. The storm joint access pit has been refilled and compacted. 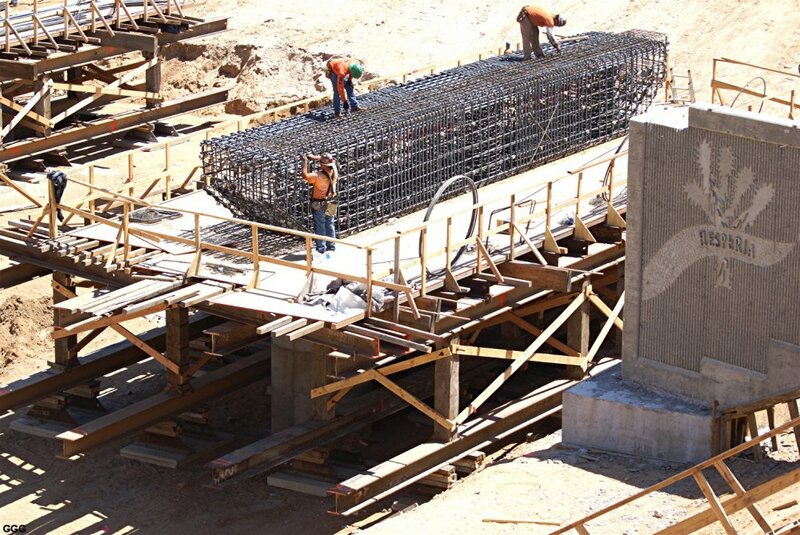 August 14: While Laura & I were making our way to Skagway Alaska to ride the White Pass & Yukon RR, Marc continued to document the BNSF Bridge project. 2530-31: Double dumps delivered and dumped ballast on the bridge while workers applied a "finish" to the structural concrete. 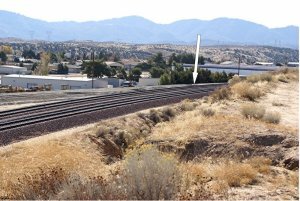 2532: The area around the RR Western extension of the drainage system was "groomed". 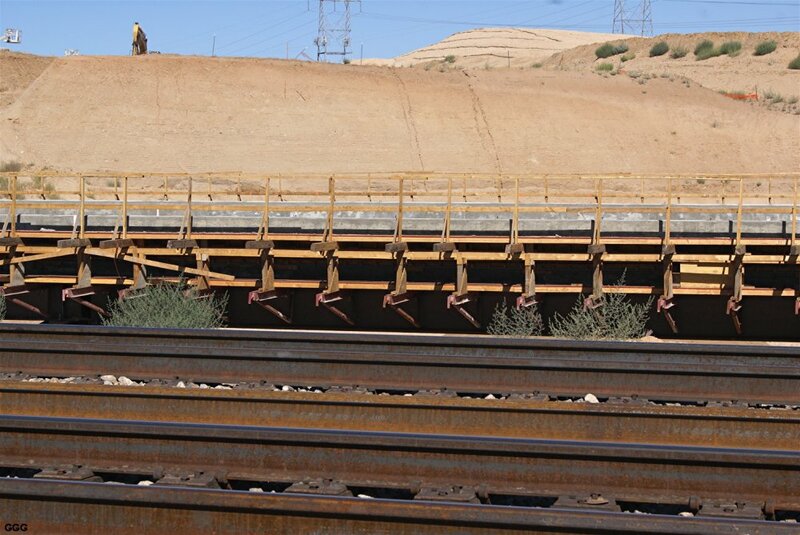 August 24: TRACK ON THE BRIDGE 2536: Noticed on the City of Hesperia web-cam that the 39 foot sections of wooden tied "snap track" had been aligned. 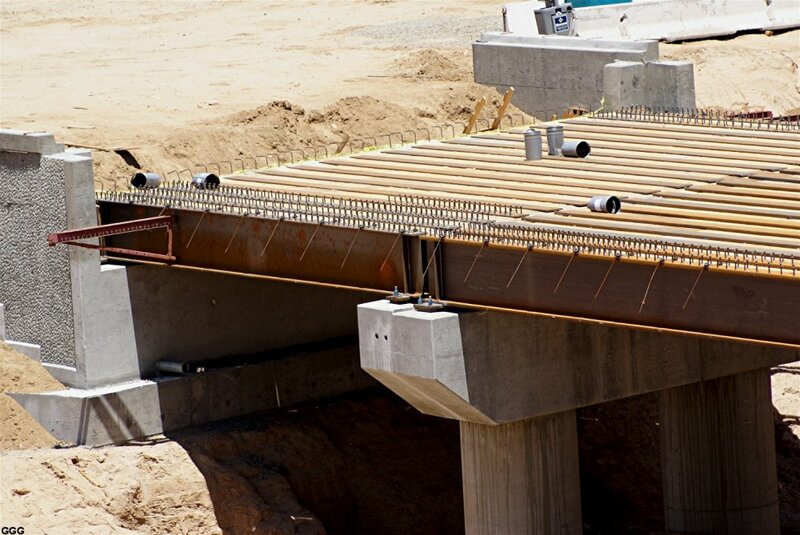 Actually, those sections have been bolted together AND bolted to the concrete tied main line sections that ultimately will cross the new bridge. 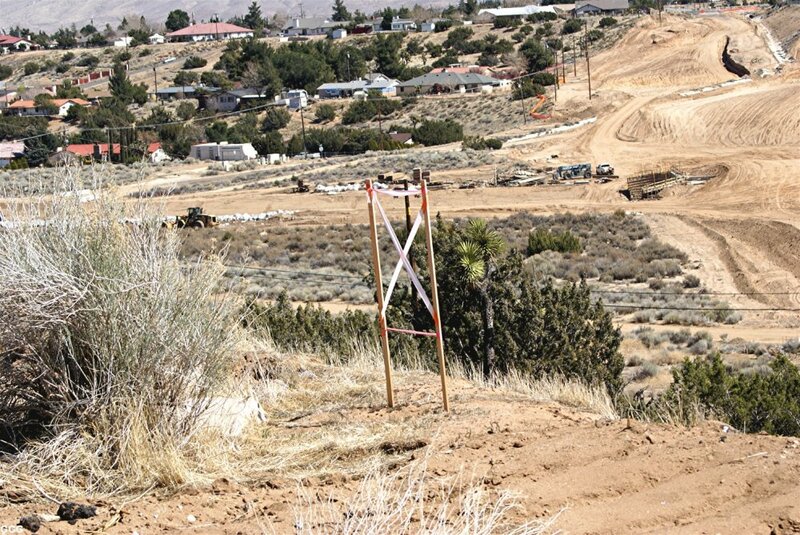 September 7: On Friday (9/07/12), I spent a couple of hours catching up with DET on Hill 582. 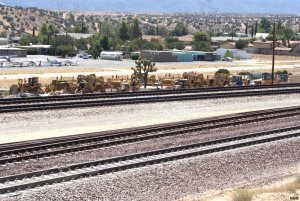 Saw a fair number of trains --- but nothing new or different. 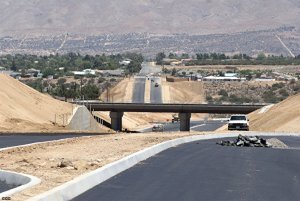 Decided to take the USFS road next to the UP Palmdale cutoff to get to the bridge project. 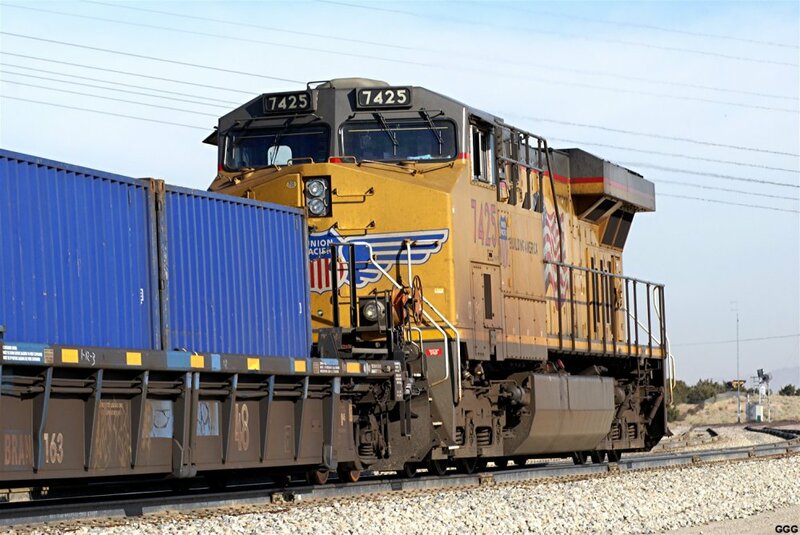 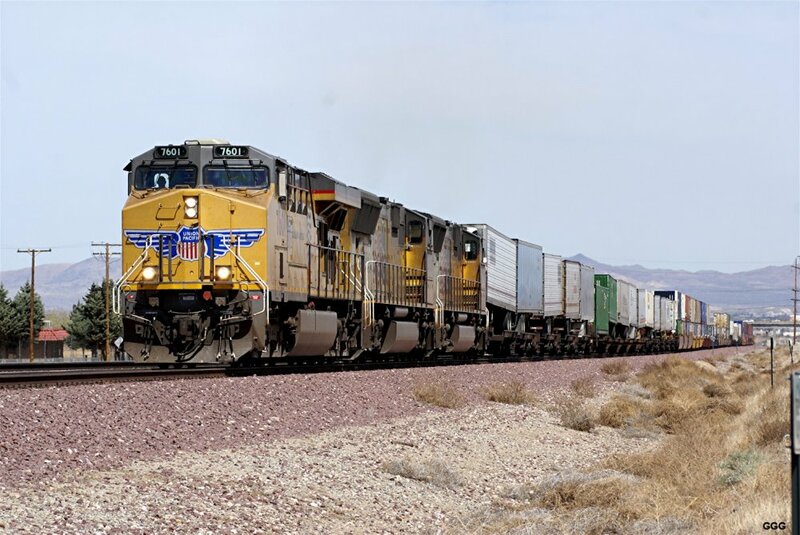 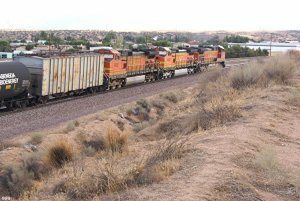 Usually, the only problem with that very narrow route occurs when the UP is performing MOW. 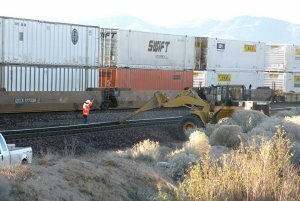 2575-76: Well, no MOW but they were changing out a defective wheel set. 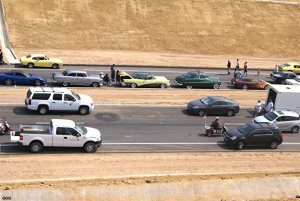 The guys were super and mentioned that they would be finished in twenty minutes --- so I decided to watch. 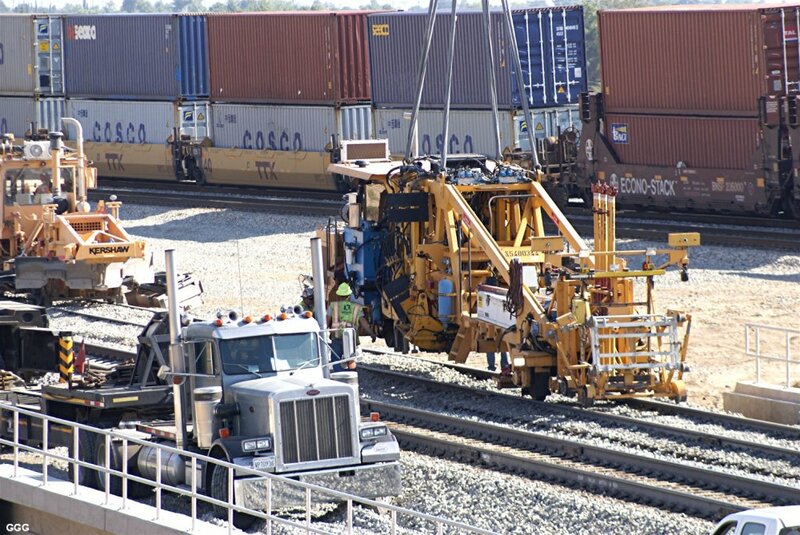 It was interesting watching the huge machines, manipulated by PRO's, do their thing. 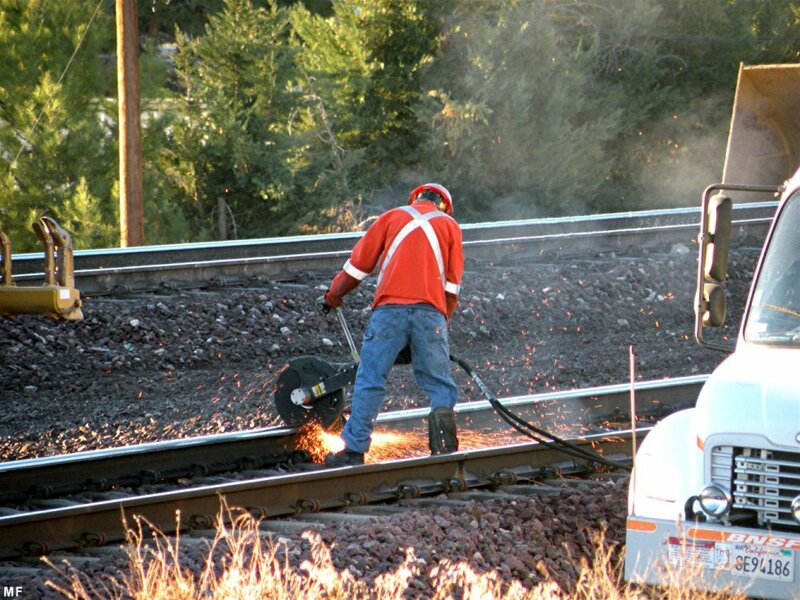 September 12: This week was the perfect time to cut-in the # 1 track over the bridge since there was a 5 mile long tie gang working on Main Track # 1 RR East of the bridge. 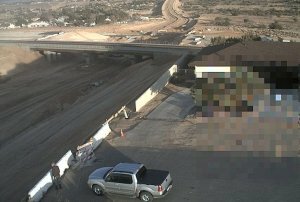 Obviously, the # 1 was "closed". 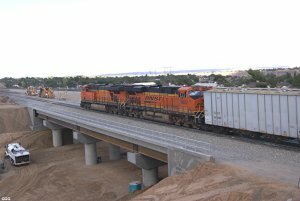 Last evening, after the tie gang had "hidden" their 20+ machines in the siding at Thorn (MP 41), the # 1 was opened for rail traffic over the bridge at restricted speed, ---- for the first time. Thanks to John (Wash., DC), who evidently watches the Hesperia web cam more than I do, for the heads-up. 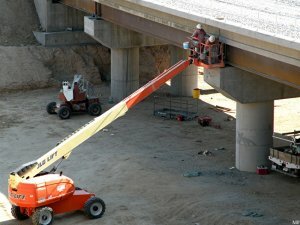 This AM, I drove over and talked to the tie gang foreman who gave me the plan for today. 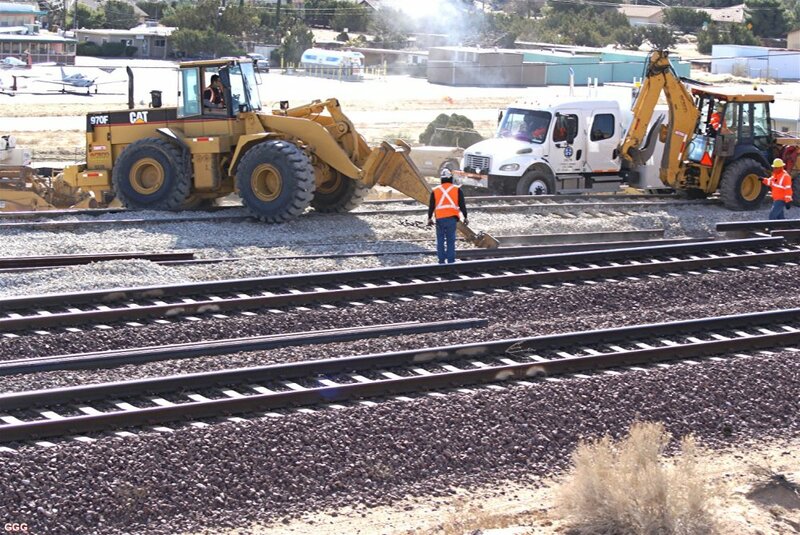 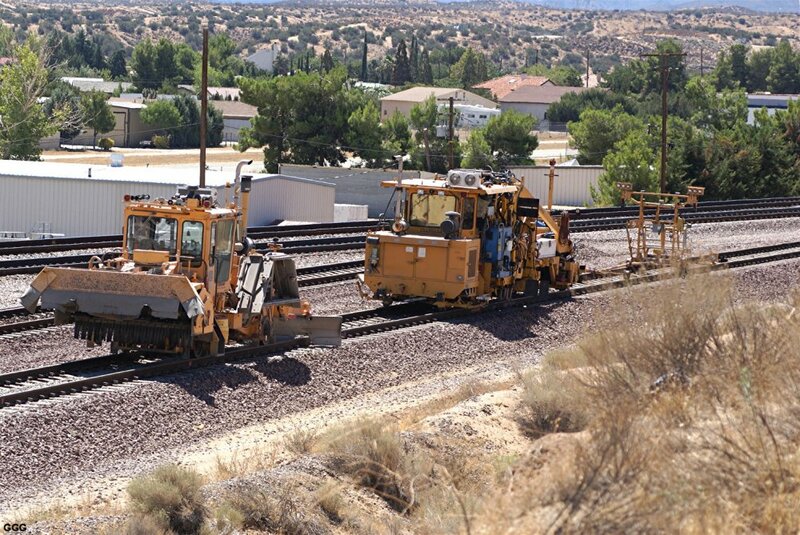 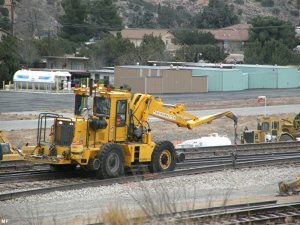 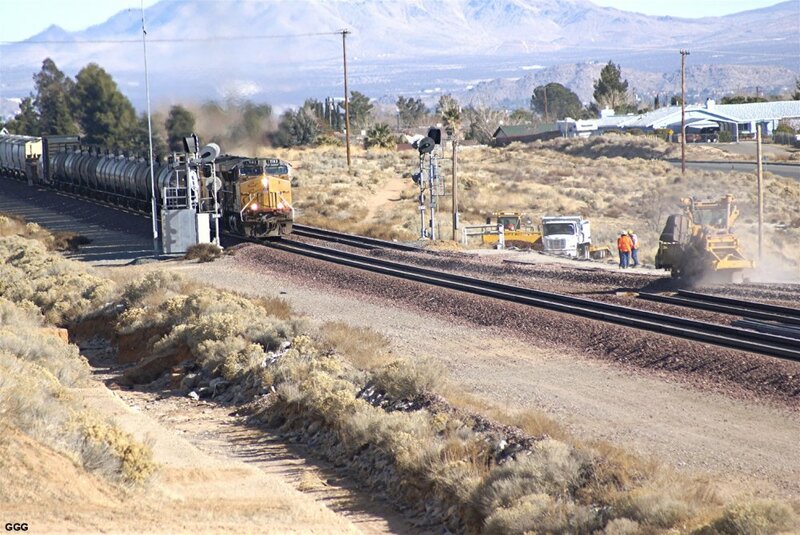 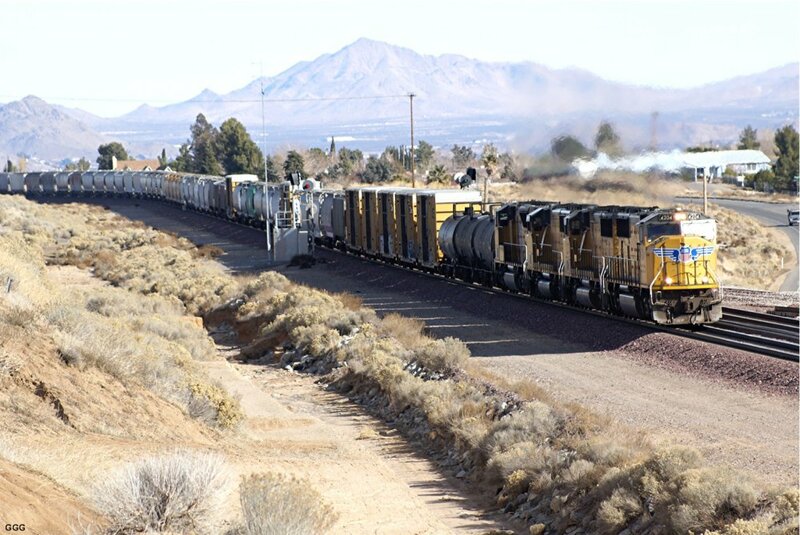 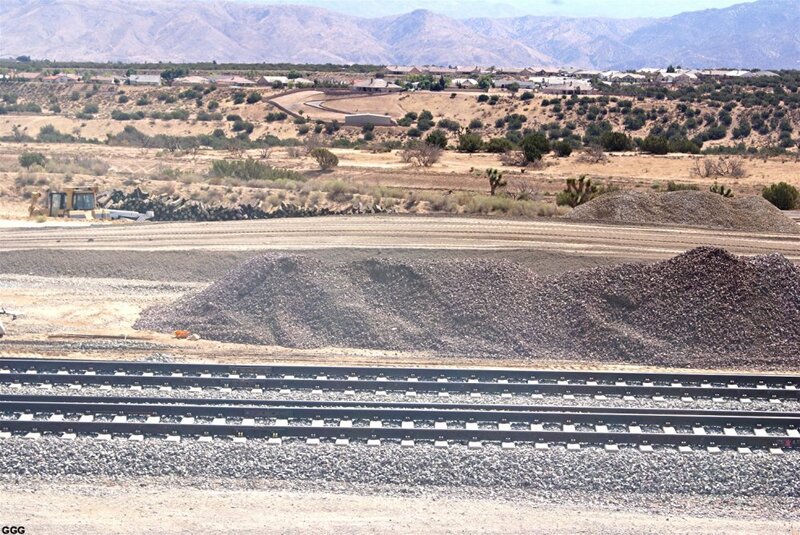 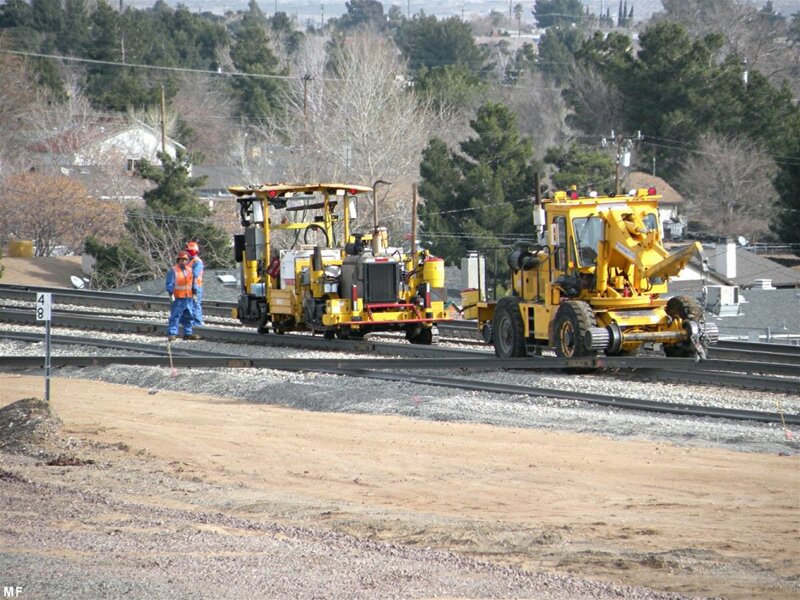 This afternoon the tie gang finished MT # 1, drove all the machines West to Lugo, transitioned onto the # 2 track, moved East to the Hesperia siding and started their "weekend". 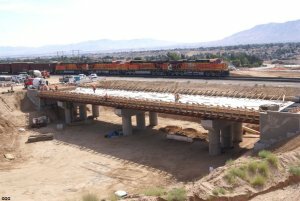 2587-90: From early this morning --- Bridge Main Track # 1 is "tied in" and groomed however, the tie gang still works to the East. 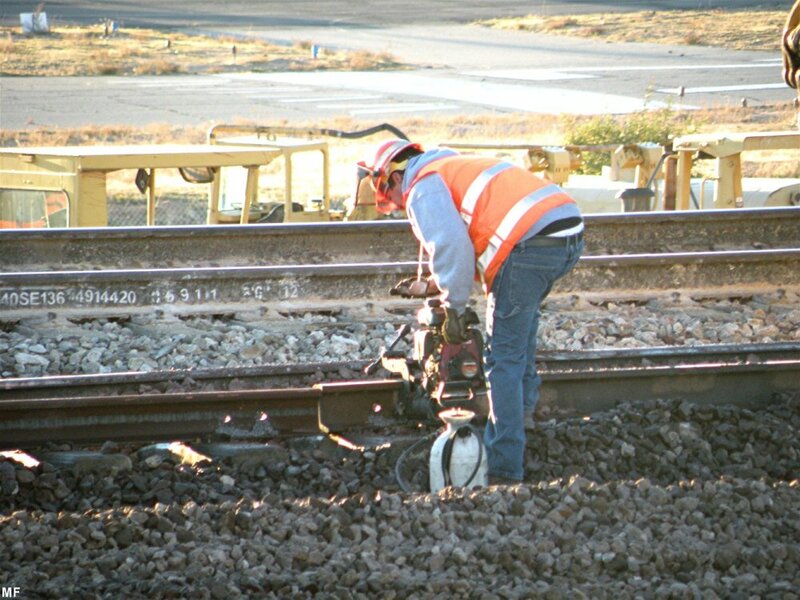 The MOW machines were lifted to unconnected Bridge # 2 track. 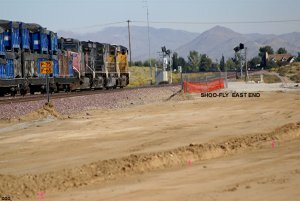 Two WB's use the shoo-fly # 2 track. 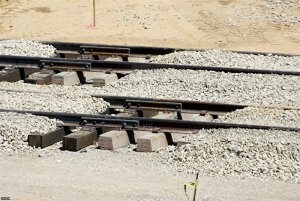 2591: From this afternoon --- The # 1 track is ready for service. 2592-94: Just in time for my first train over the bridge, a GIANT PUFFY DARK Cloud moved in. 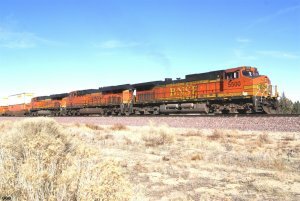 BNSF 4382 and its DPU's are WB with the BOMB (ethanol). 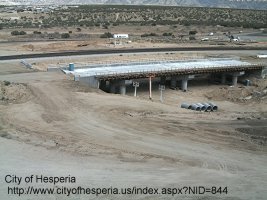 September 29: Here are 3 photos provied by the Web Cam of the City of Hesperia (COH) to see the current situation looking South. 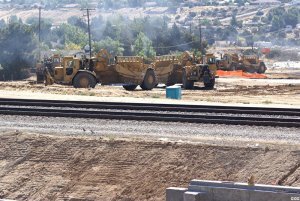 Heavy machinery is removing the soil down to the new Ranchero Road street level. The Summit Valley road has been lowered as well. October 3: Periodically, I'll continue to photograph the Ranchero Rd project but this will be the last set I will send to this RR group --- unless requested by those who may be interested in the rest of the project. 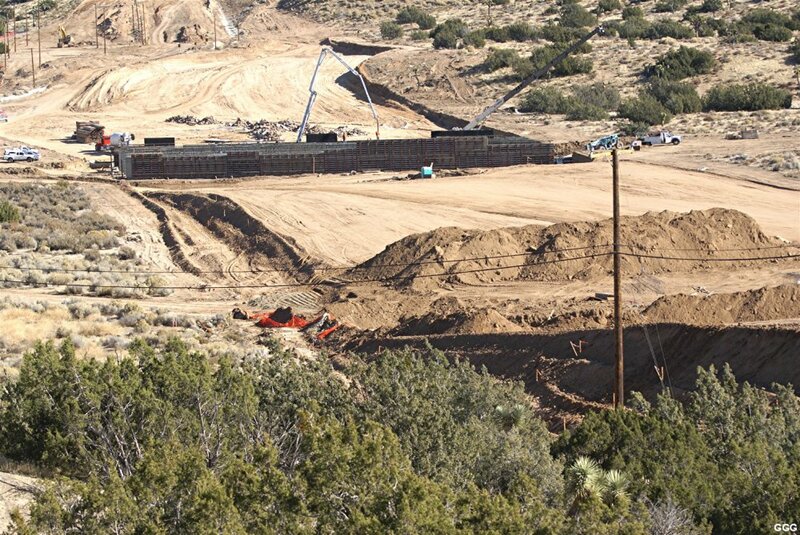 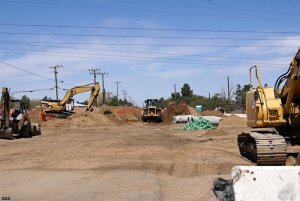 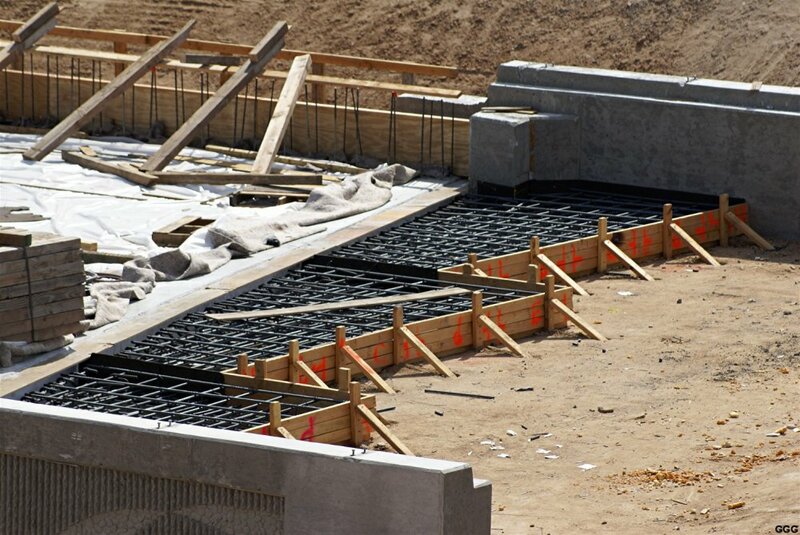 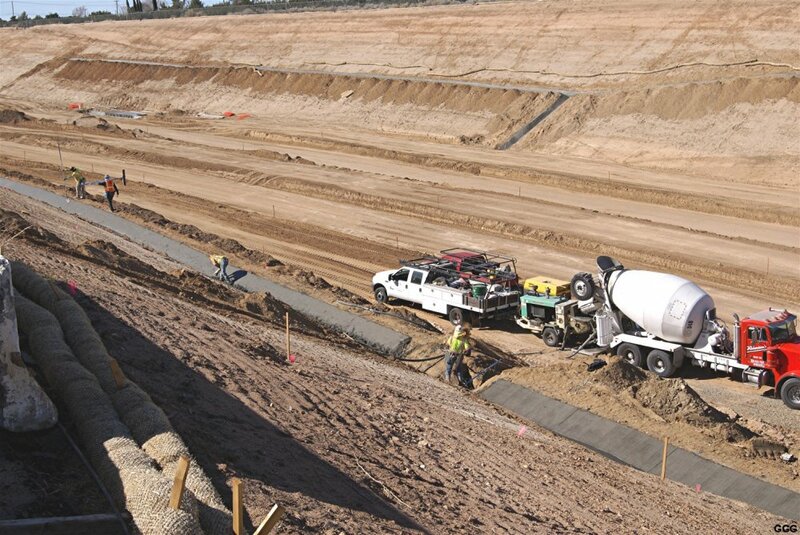 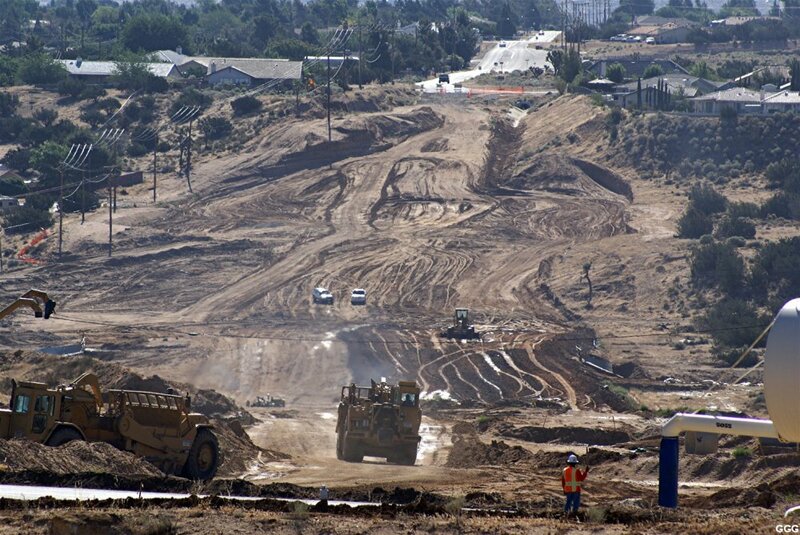 Of course, we (on this page) continue to show the progress of the Ranchero Road construction. Pictures 2655, 2657 & 2659, no matter the date on the image, represent how the project appeared on 24 September. 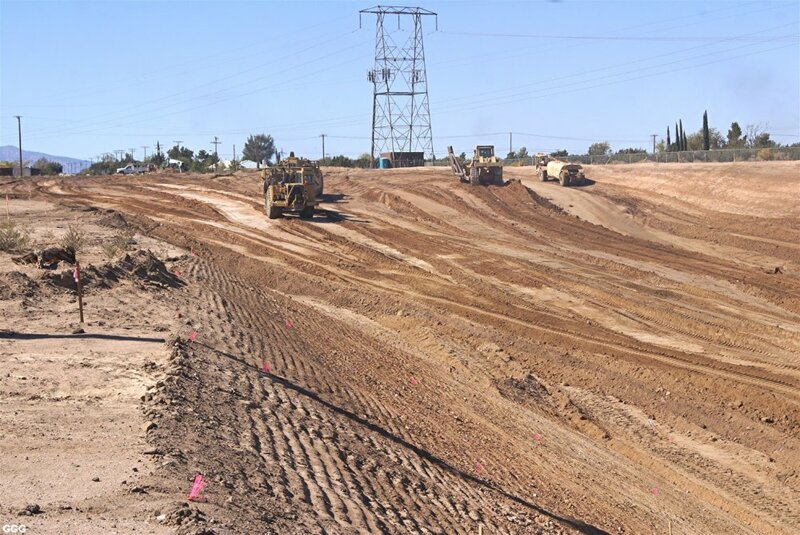 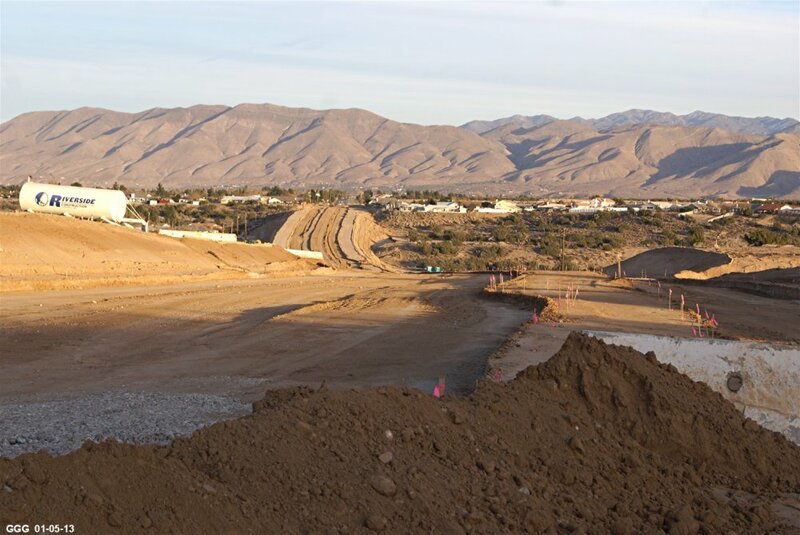 Pictures 2656, 2658 & 2660 show the projects progress over the last 10 days --- the Shoo-Fly berm was removed, the Eastern extension of Ranchero Rd raised, and grading of the Westward Road extension was started. 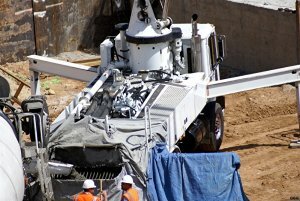 2661-62: The construction workers parked their machines and, evidently, were served lunch. 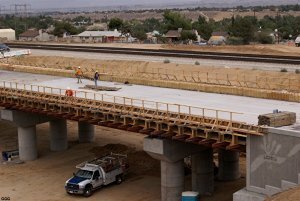 October 10: After visiting Hill 582 and West Summit Island, I stopped by both sides of the BNSF Bridge @ MP 48 to view the Ranchero Road construction progress. Riverside Const. 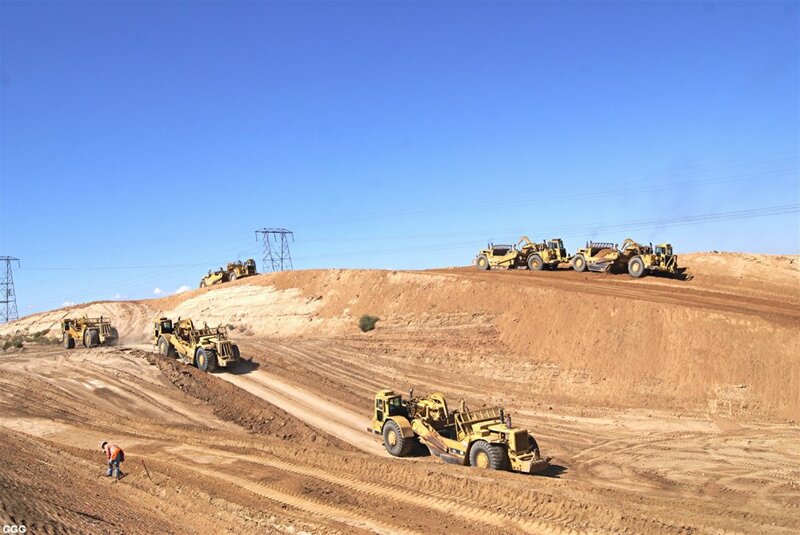 was using eight huge earth movers to move the mountain of stockpiled dirt and to cut down the Western natural earth contour to the final road grade. Of course, the excess dirt is used to raise the level of the Eastward extension of Ranchero RD. 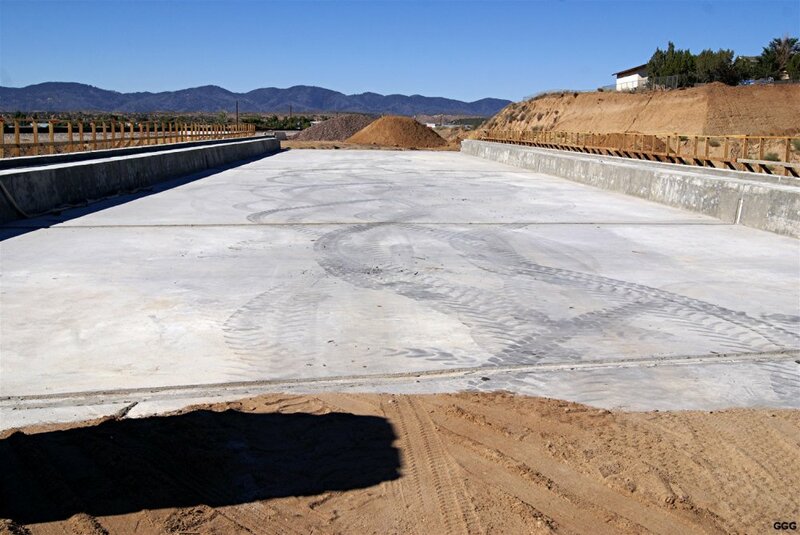 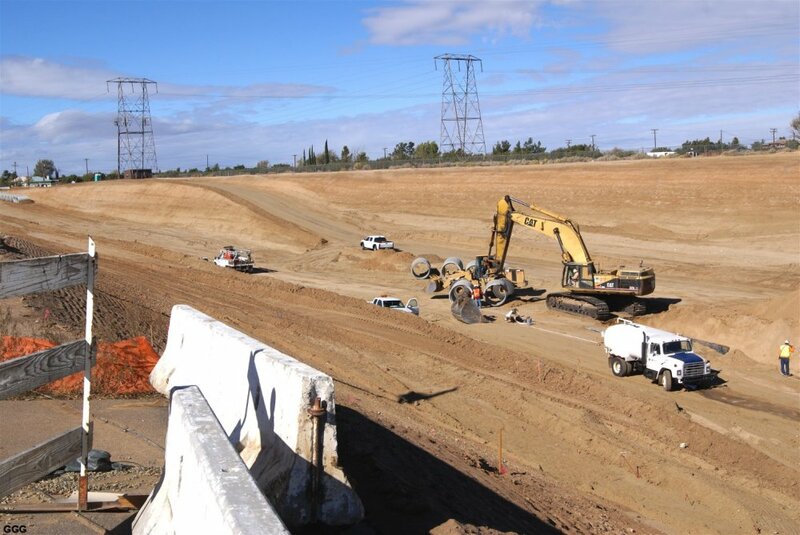 October 24: Photos 2679-81: The construction folks are into their third week of grading the 1/2 mile Western approach to the Ranchero Rd underpass. 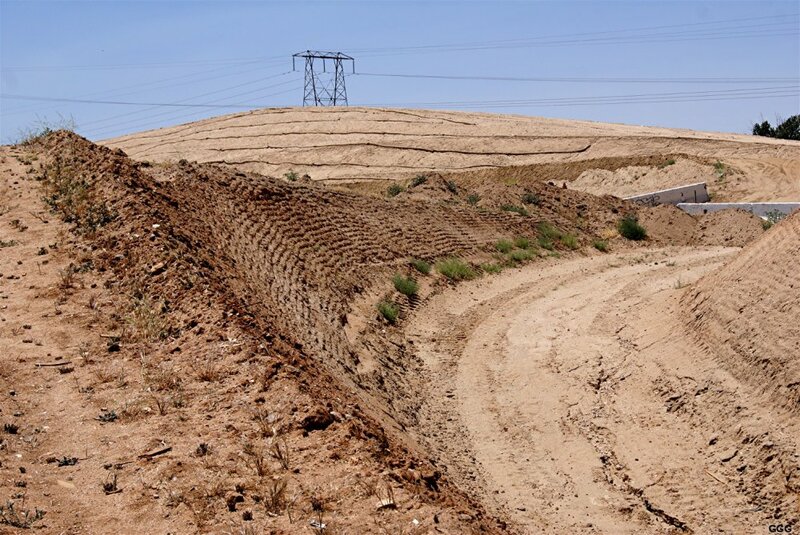 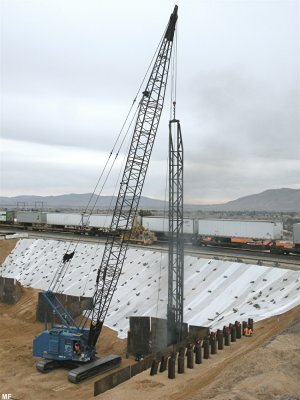 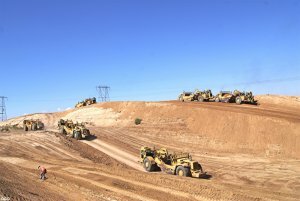 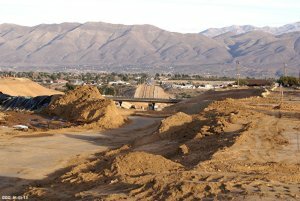 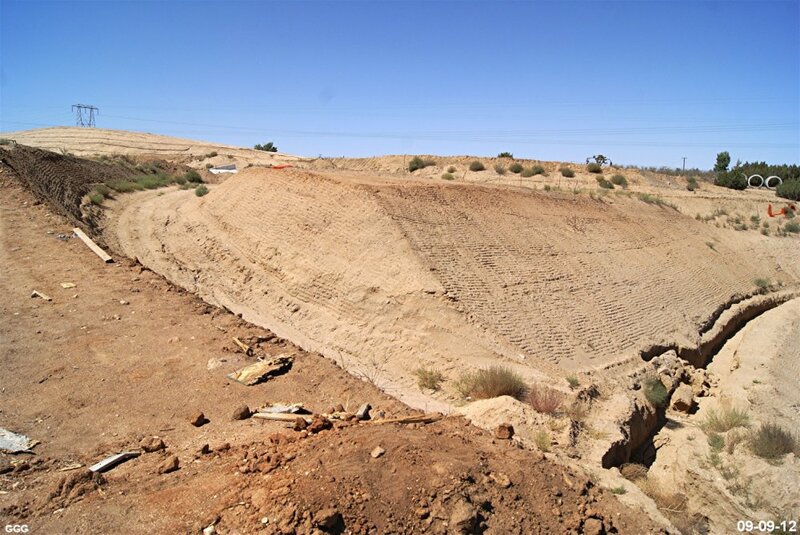 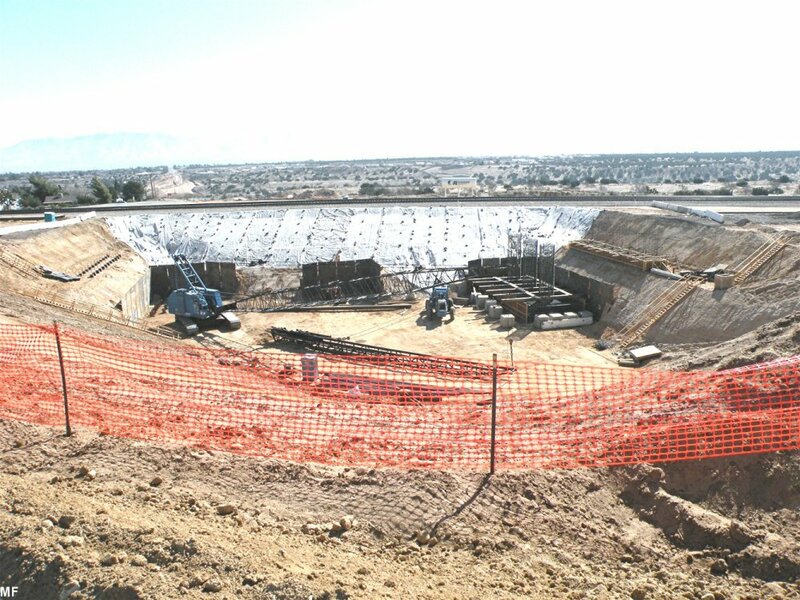 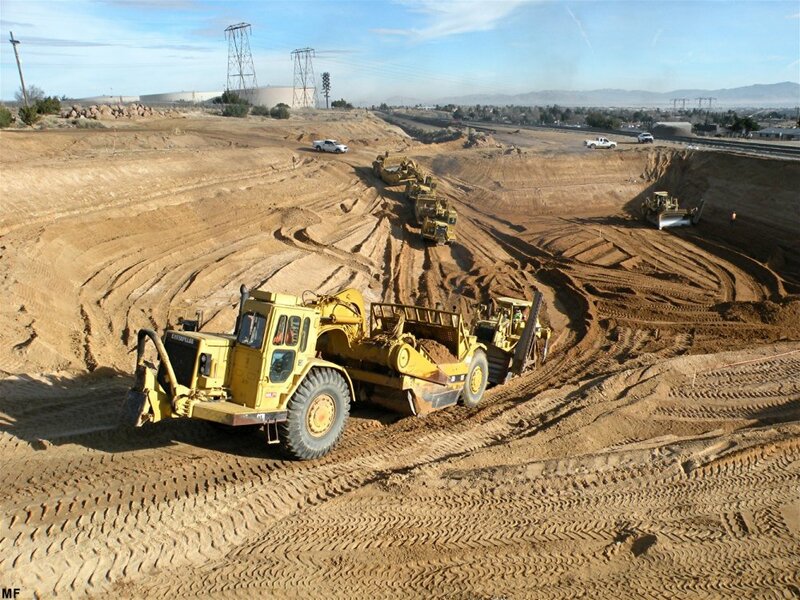 The "mountain" of stored fill has been graded and moved to buildup the Eastern extension of Ranchero Rd using ten earth scrapers. 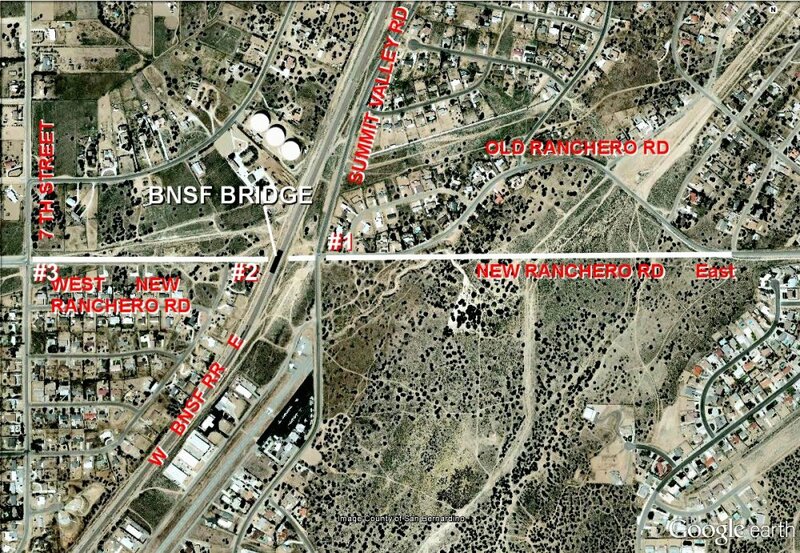 2682: The built up Eastward extension of Ranchero Rd. The 6 foot concrete pipe, which will drain the pictured hill into the huge box culvert, is being completed. 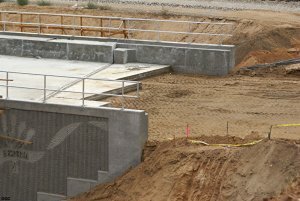 2683: This rather elaborate concrete catch basin will funnel storm runoff from the ditch which runs South to North along the BNSF. 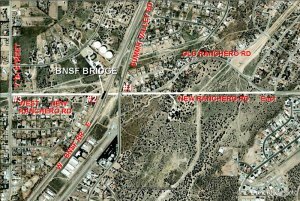 November 16: It has been three weeks since I checked the progress on the Ranchero Rd / BNSF bridge project and so yesterday (Friday), I ventured the eight miles. 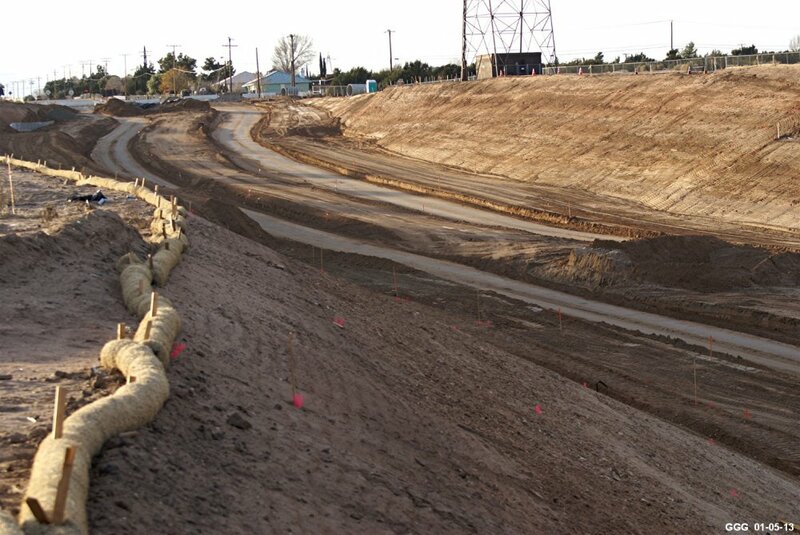 The "gross" removal of a huge amount of dirt fill has been completed and the 'near final' road grade achieved. 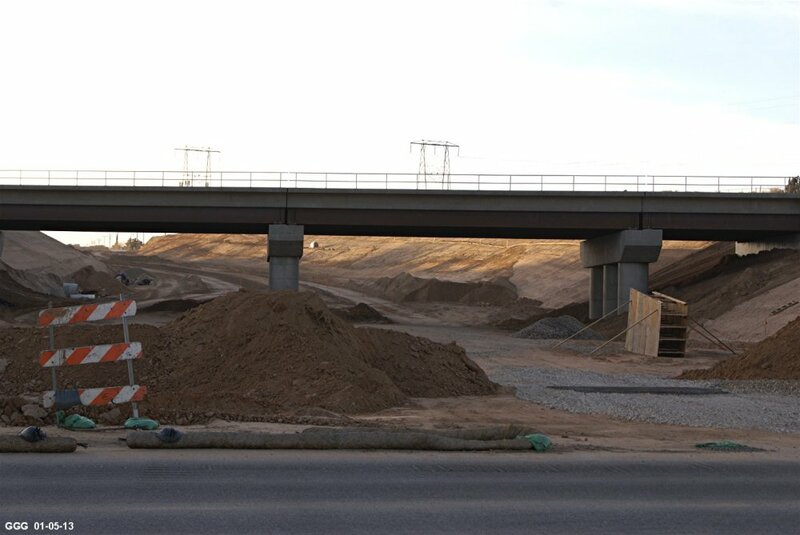 December 10: There has been little VISIBLE change in the road project over the last two weeks. 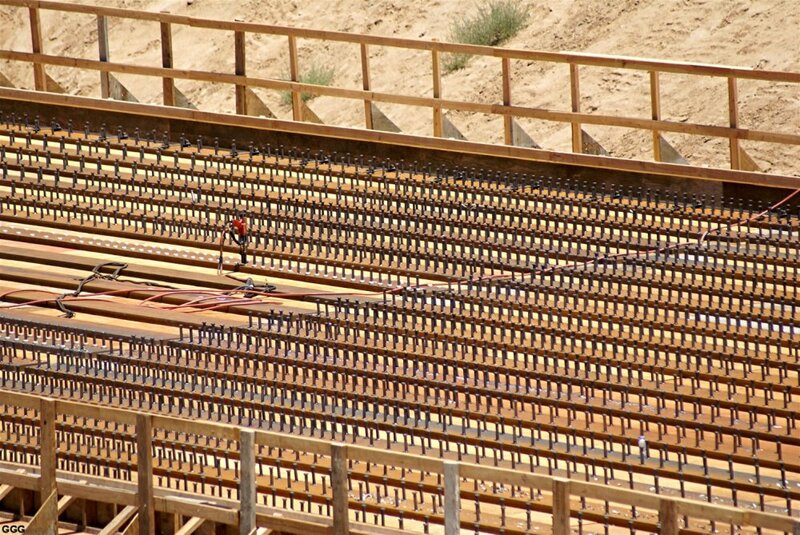 2726: Looking NE: The 39 foot sections of "snap track" rail, on the BNSF bridge, have been replaced with welded ribbon rail. 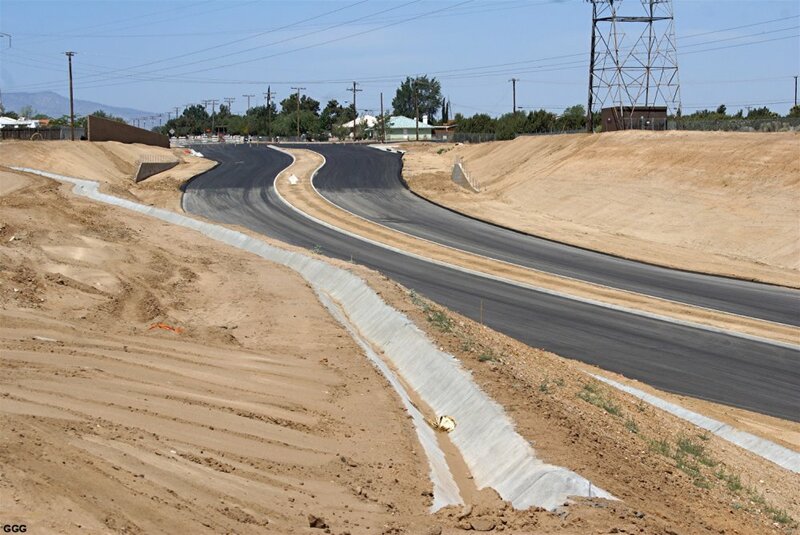 The Eastward Ranchero Rd extension has been built up to its near final elevation. 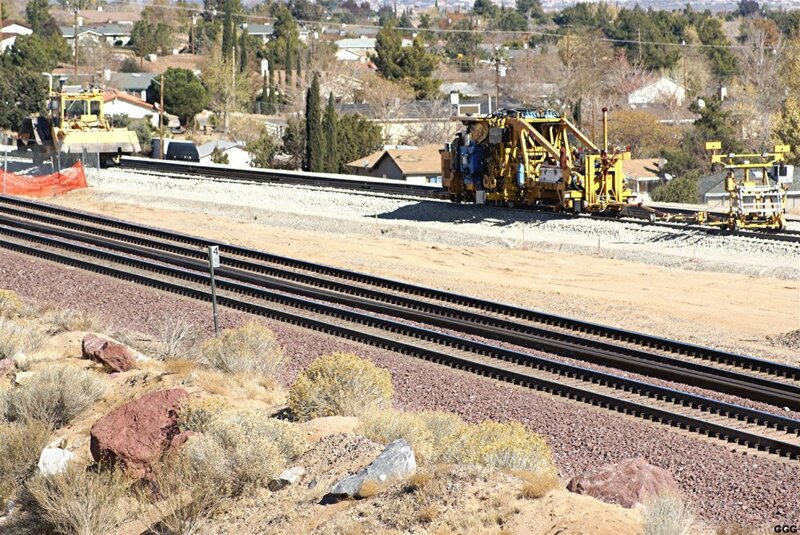 # 2738: After taking the Holiday month off from railfaning and visiting the Ranchero Rd project, this last weekend I decided to visit all available project areas. 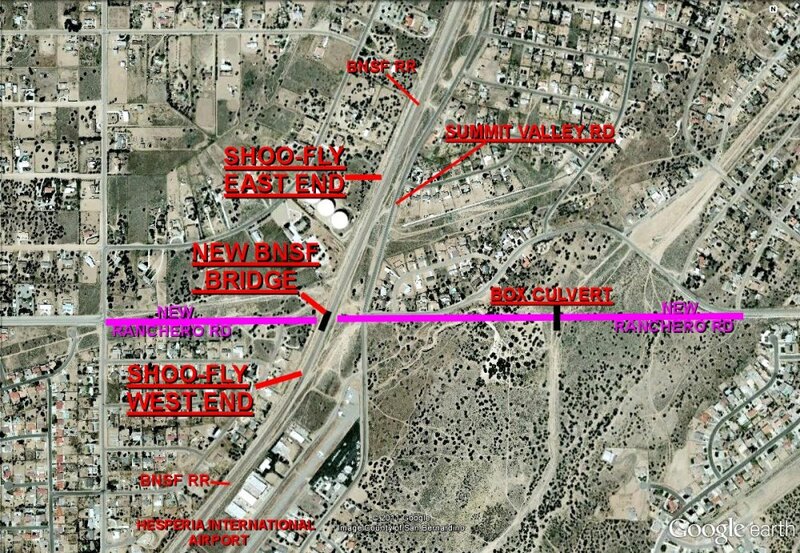 The only real way to explain my travels is to quickly label another Google map. 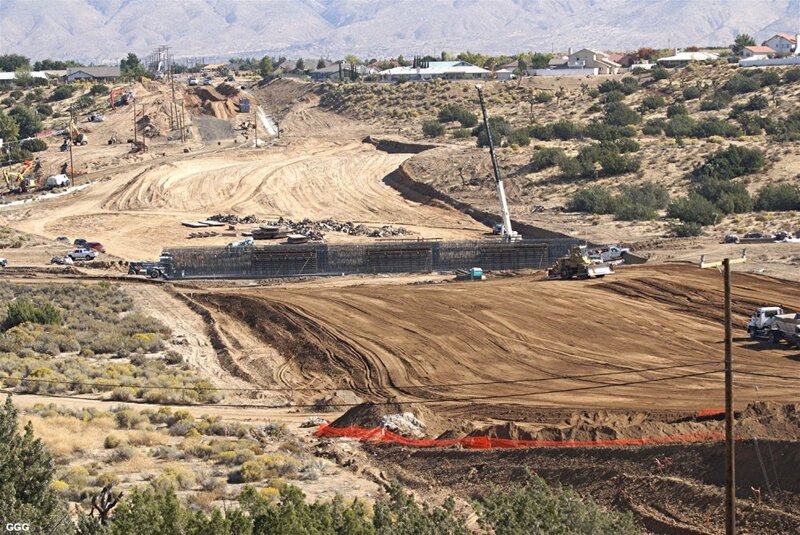 # 2739: The entire road project from Position “A” --- looking East from the far Western end of the project. # 2740: You can’t hide! 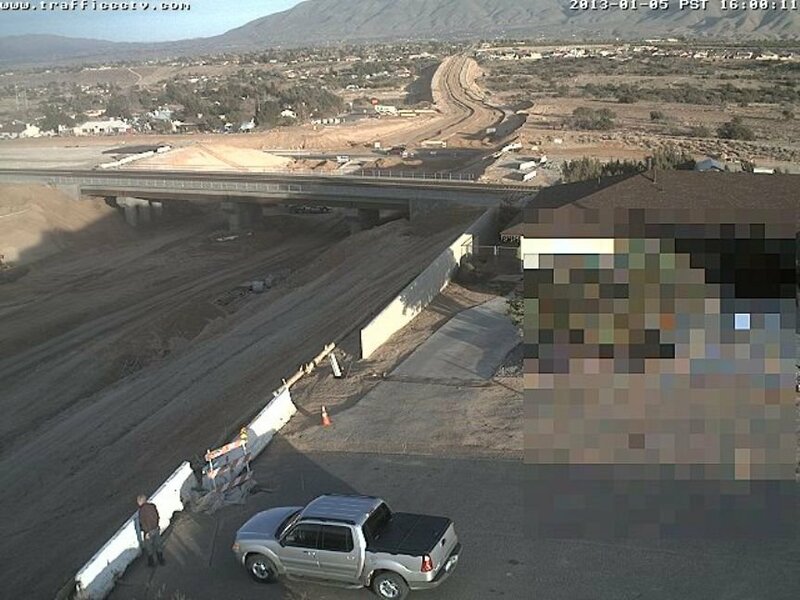 The Hesperia Web Cam caught me and the Cajon MUD-mobile at Position “B" --- our usual photographic location. # 2741: Looking back West from Position “B”. 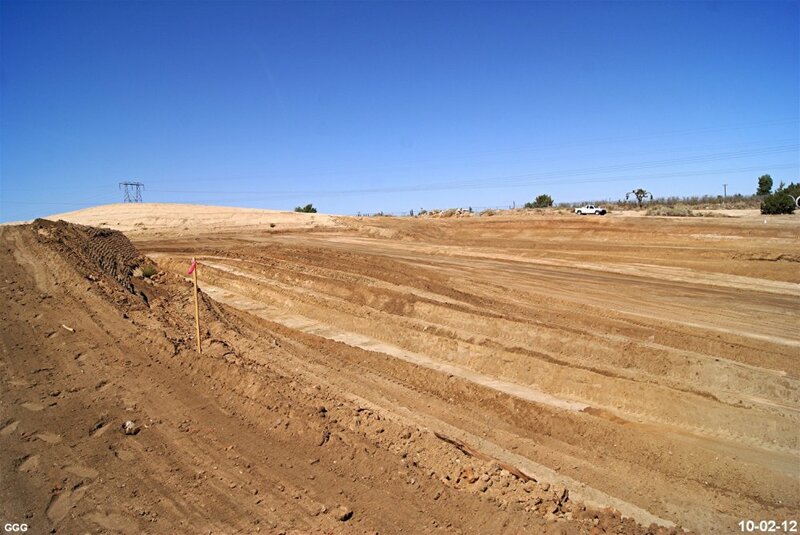 # 2742: Looking East from Position “B”. 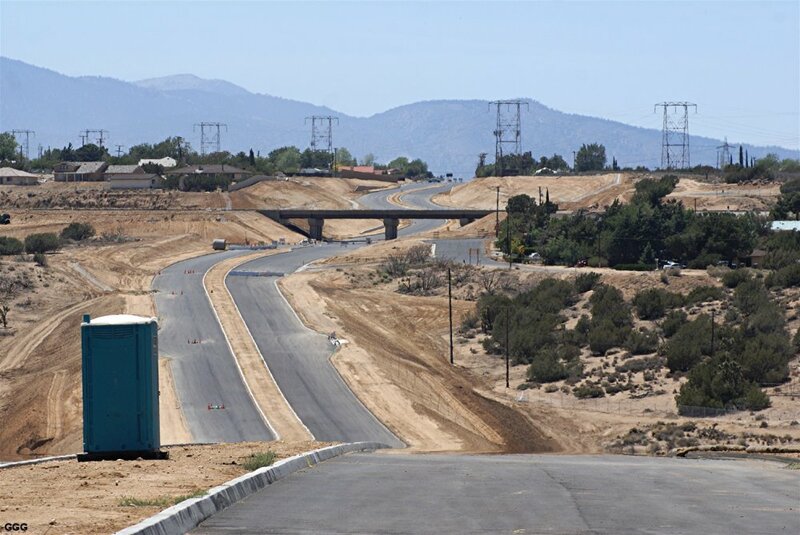 # 2743-44: Looking West and East from Position “C” (Summit Valley Rd). 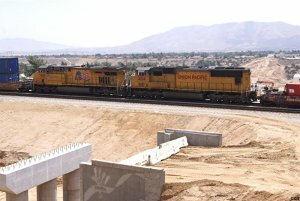 To get from “B” to “C” (about a quarter mile) required a drive of about six miles --- one of the reasons for the project. 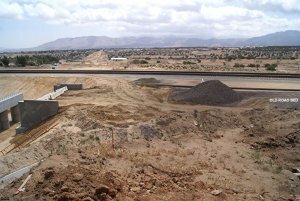 The position and shape of the future traffic control islands can be seen. 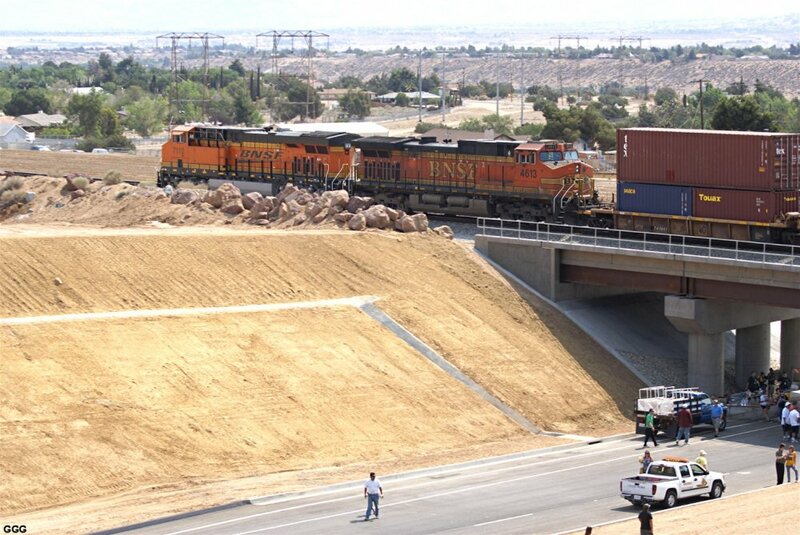 # 2745: Shows the “fill” above the “ANTELOPE VALLEY WASH” from Position “D”. The middle box culvert is fifteen feet square and the other four are ten feet square each. 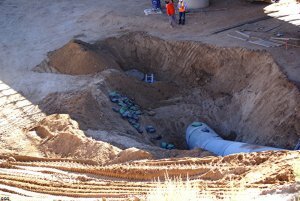 Obviously, the “wash” handles a tremendous amount of runoff during our infrequent but heavy storms. 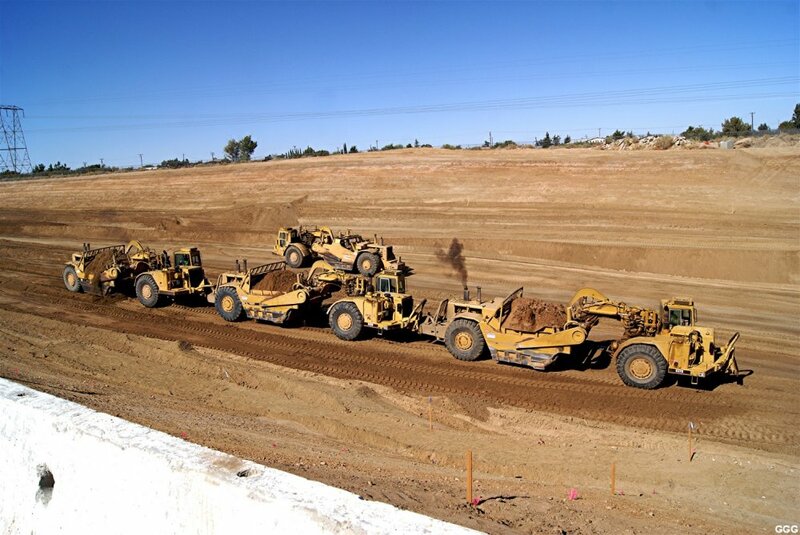 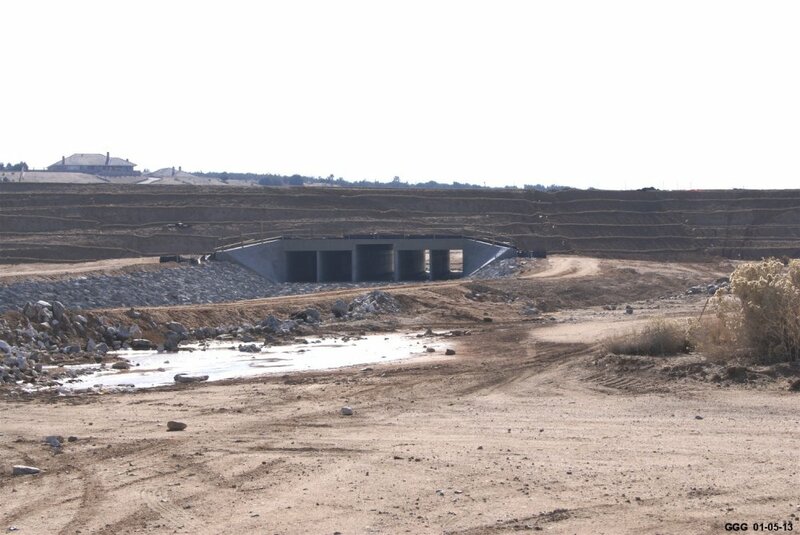 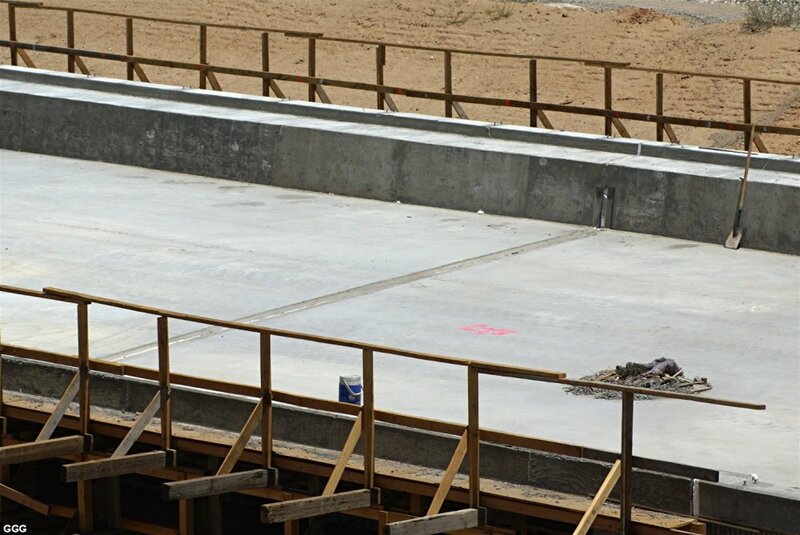 February 5: Got over to the Ranchero Rd Construction Office and to the road project on 2/05/2013. 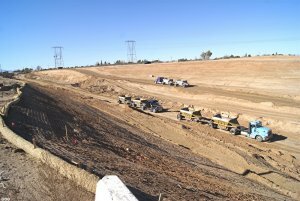 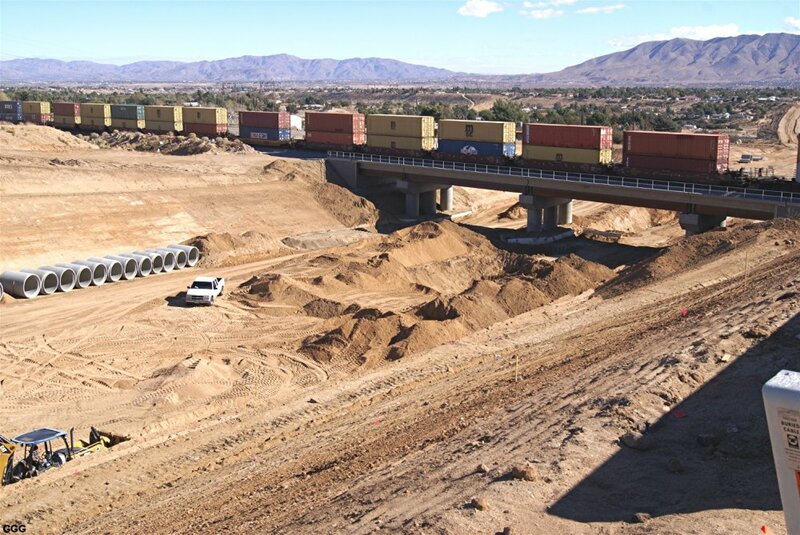 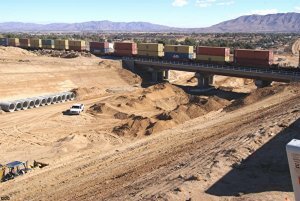 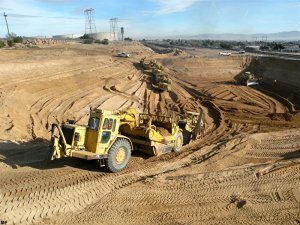 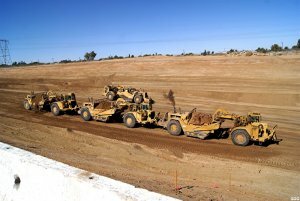 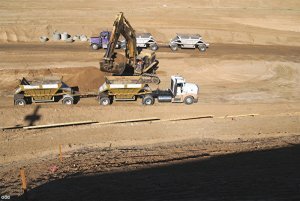 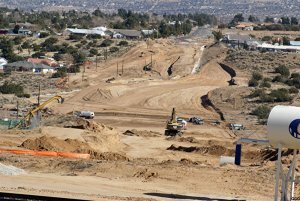 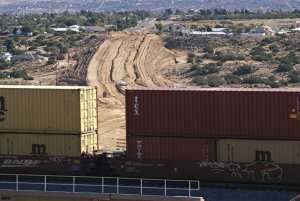 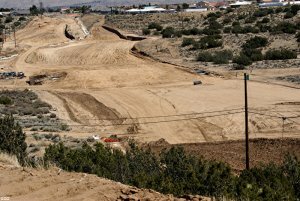 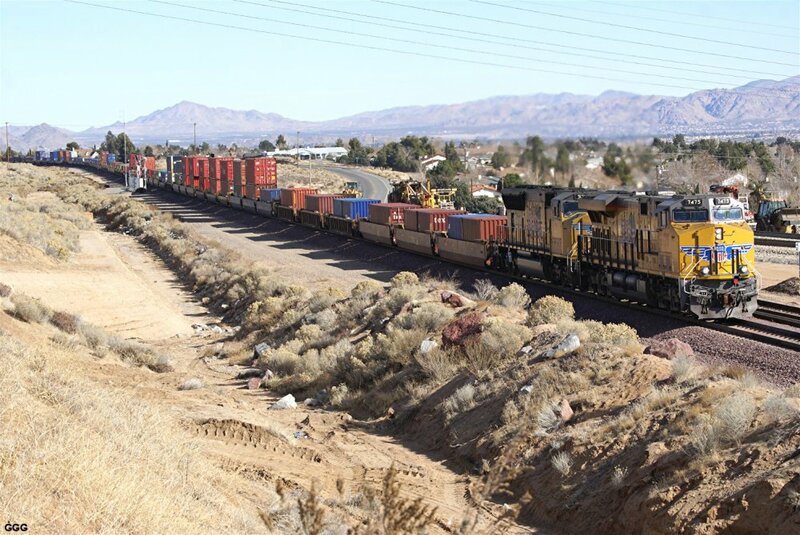 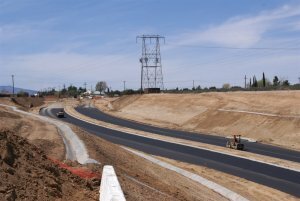 To cut the western Ranchero Rd extension down to final grade level, approximately 628,000 cubic yards of dirt was moved to buildup the Eastern extension. 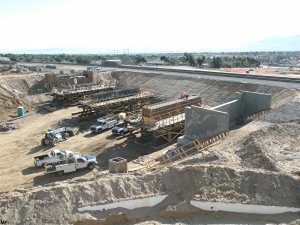 57,000 cubic yards of crushed rock will be used to build a sub roadbed which will be approximately 5 inches thick at 95% compaction. 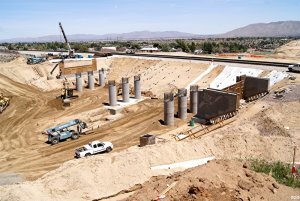 The project is scheduled for completion in June of this year. 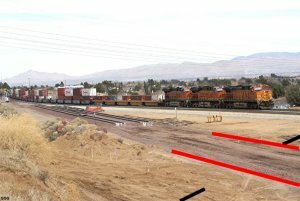 # 2759: Google Map indicating photographic locations. From "C"---Summit Valley / Santa Fe East Rd # 2760: Ranchero Rd Eastward extension. 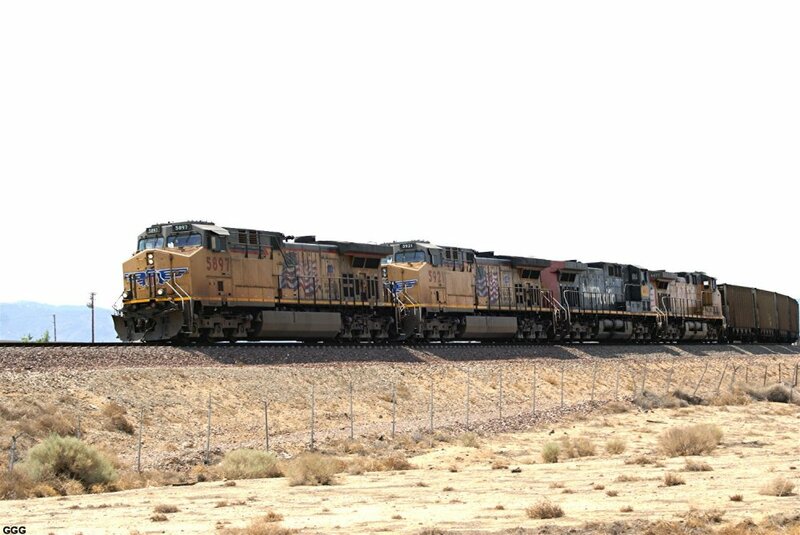 February 15: This Friday @ BNSF Cajon Sub MP 48 (Ranchero Road). 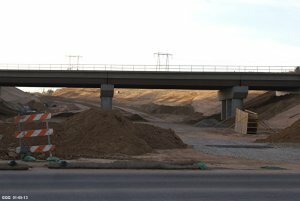 # 2765: One lane of the Eastern extension was paved. # 2766-2767: Concrete "eyebrow" water runoff control ditches were being installed along the Western extension of Ranchero Rd and the final road grade was being established. 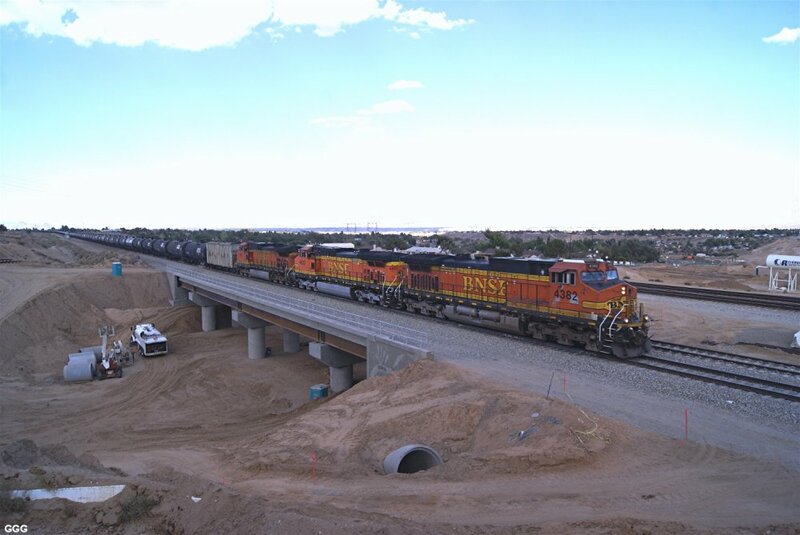 # 2768-2769: UP 7661 & BNSF 7560 are WB on the Ranchero Rd overpass. 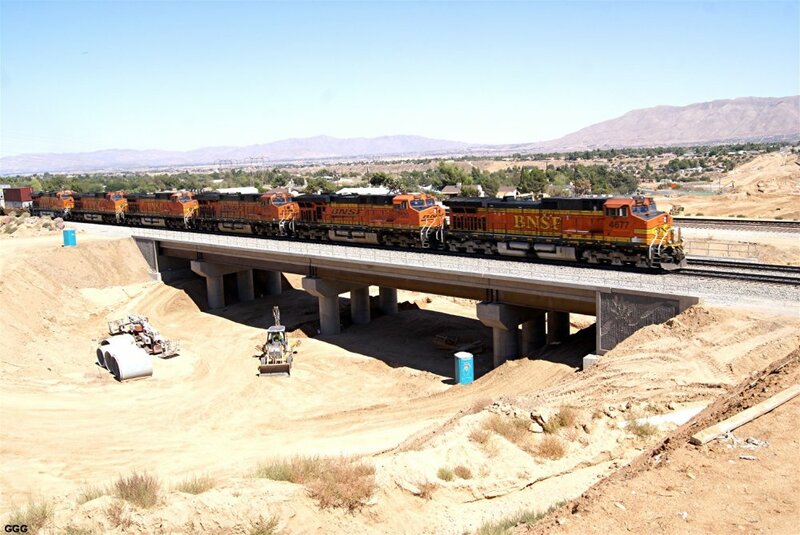 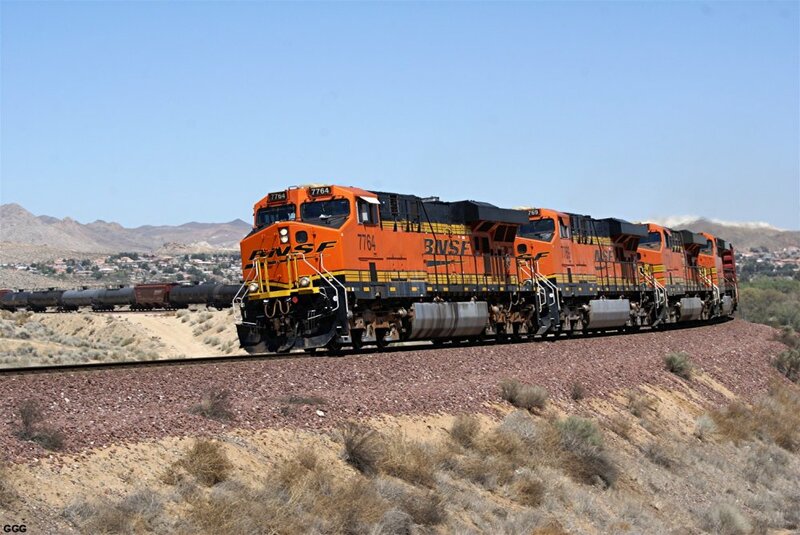 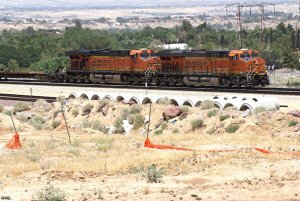 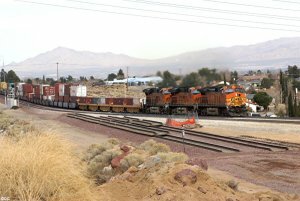 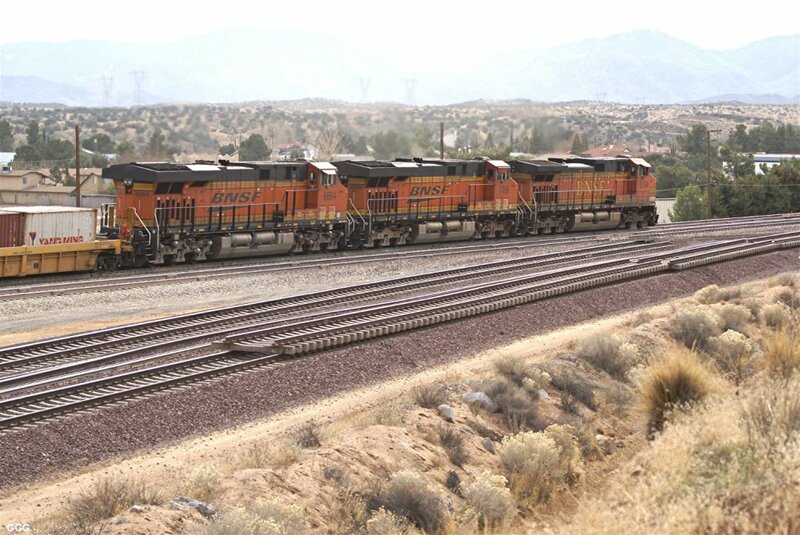 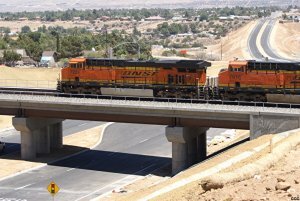 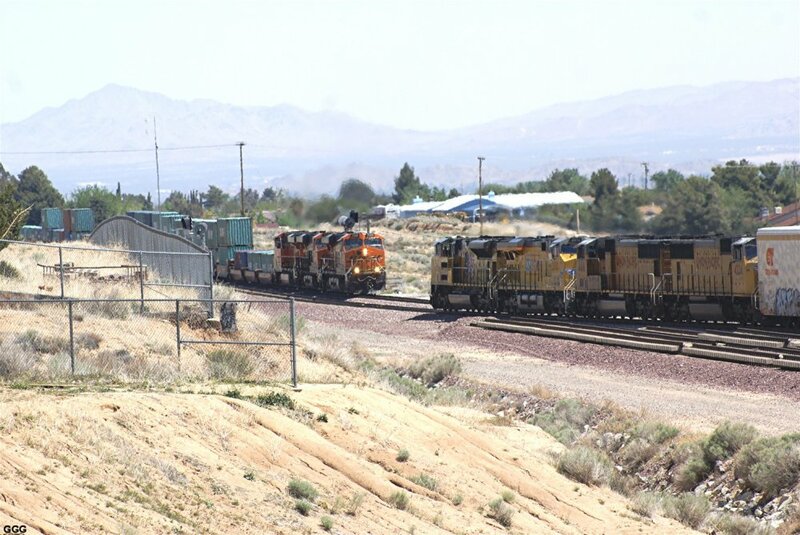 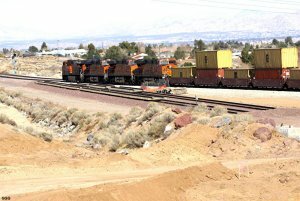 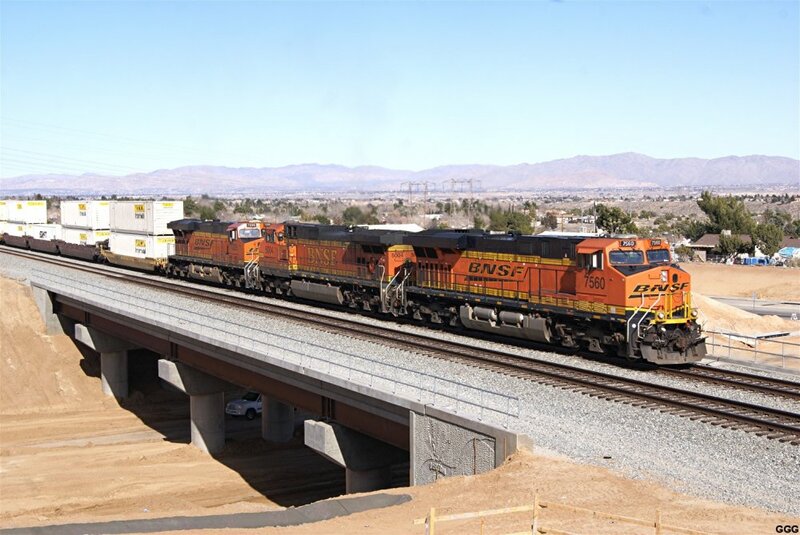 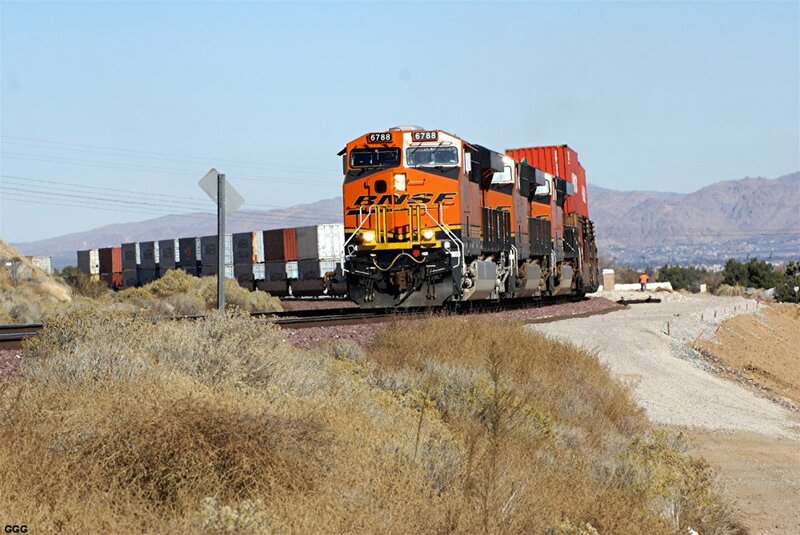 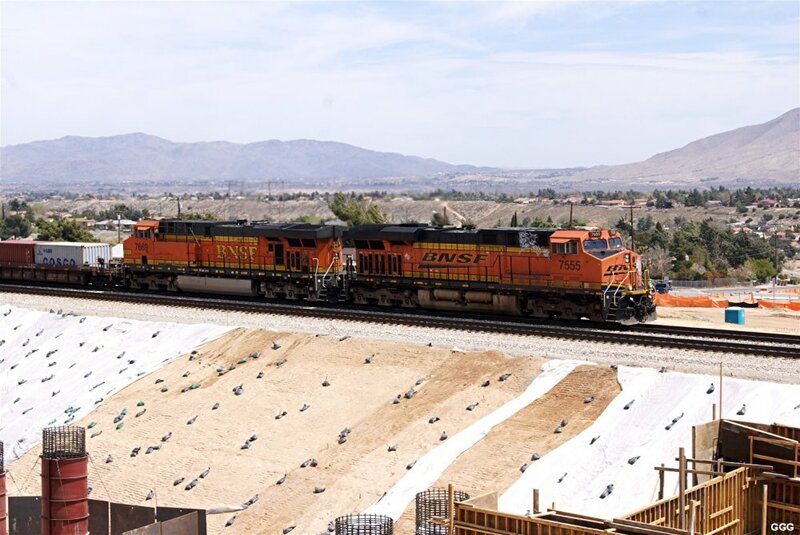 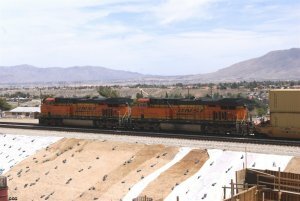 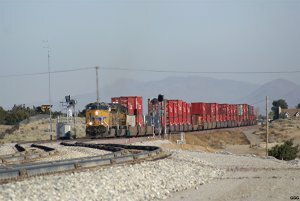 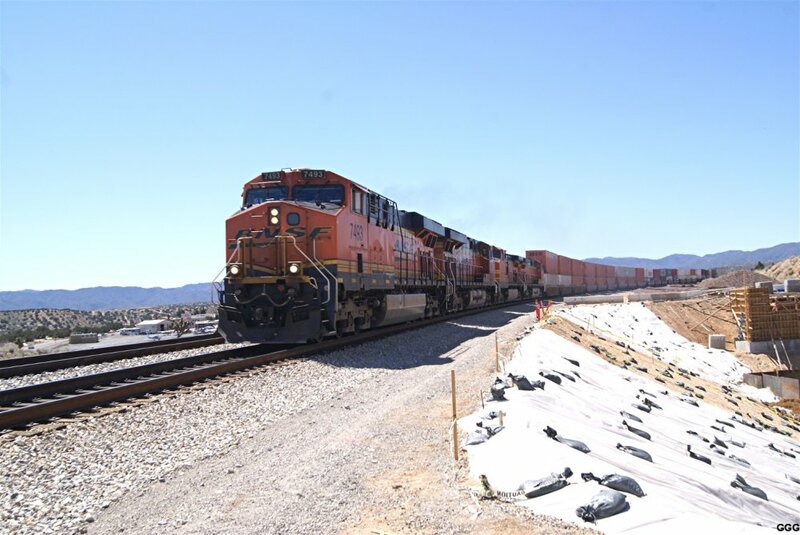 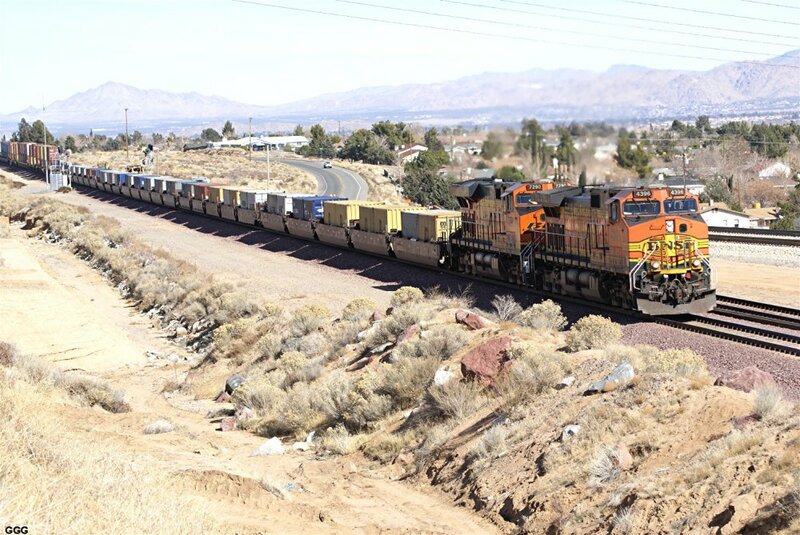 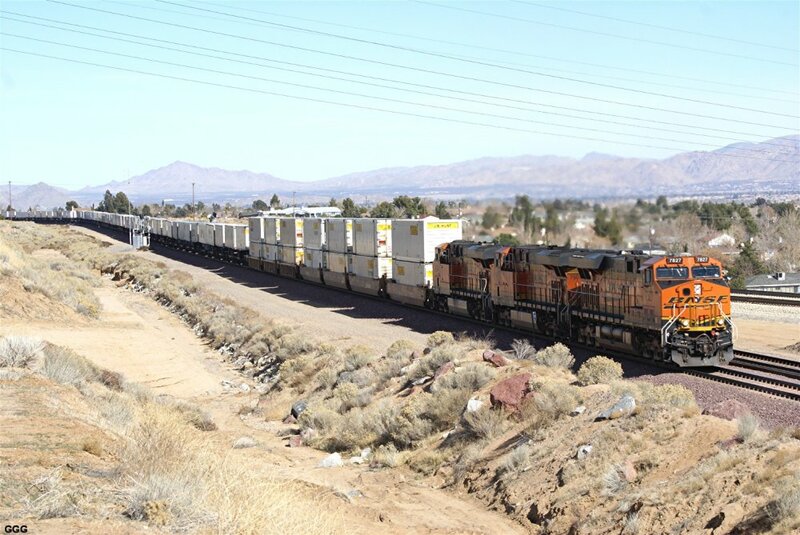 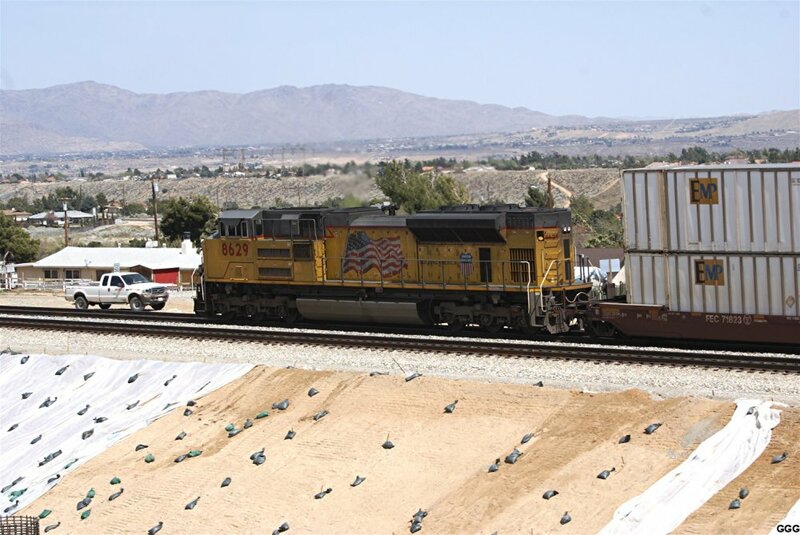 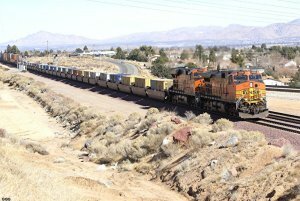 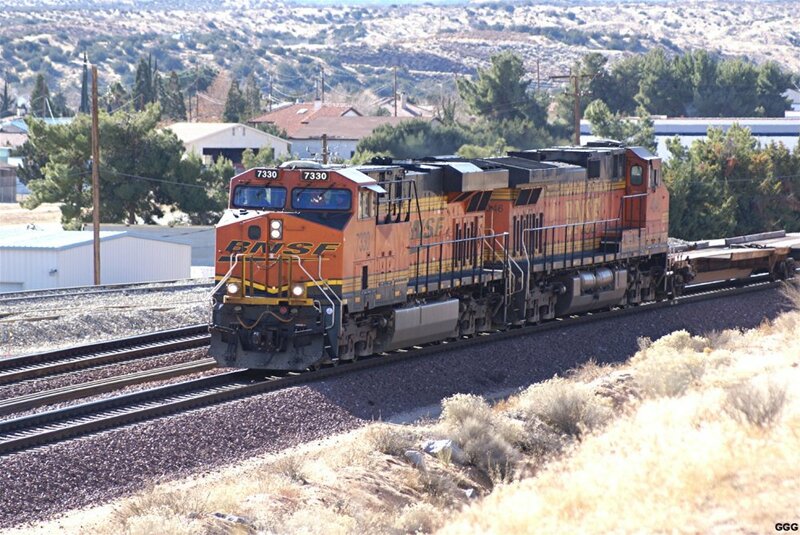 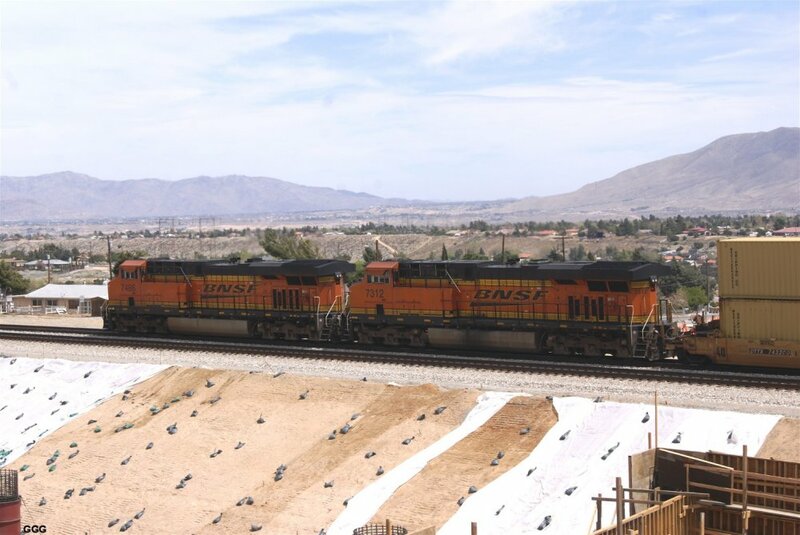 # 2770: BNSF 5500 West approaches the new bridge through East Hesperia. 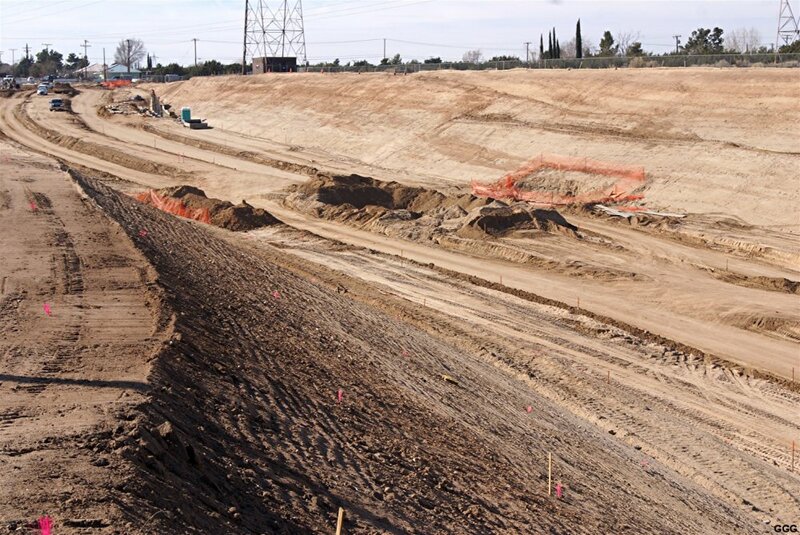 March 6: For any still interested ---- There is real and visible progress on the Ranchero Rd project. 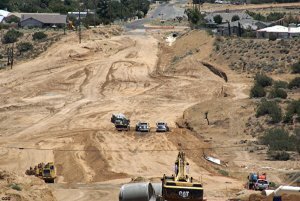 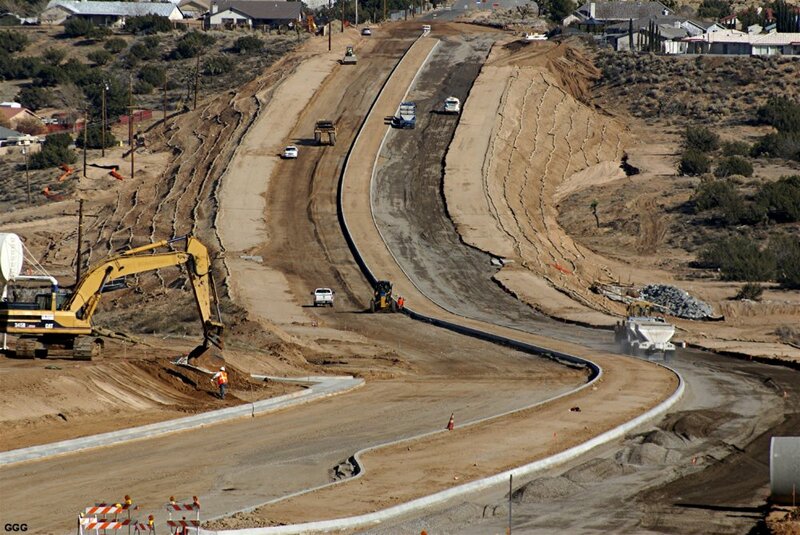 April 3: I just noticed on the Hesperia CA web cam that the construction forces were paving the Westward extension of Ranchero Rd --- from Santa Fe Rd WEST & uphill to 7th Street. 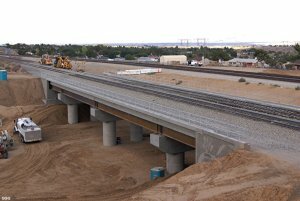 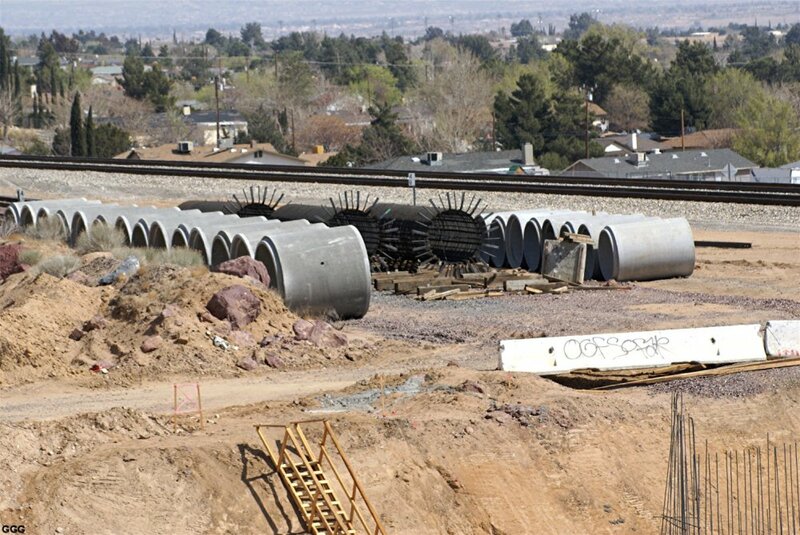 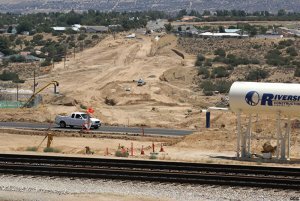 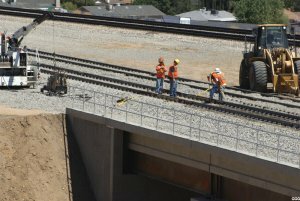 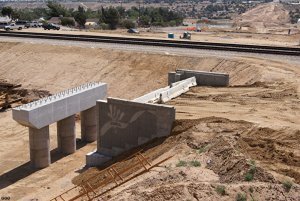 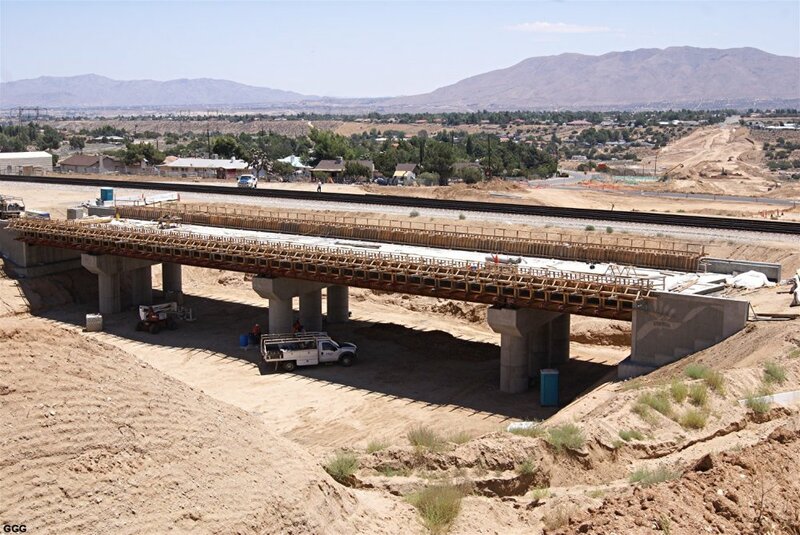 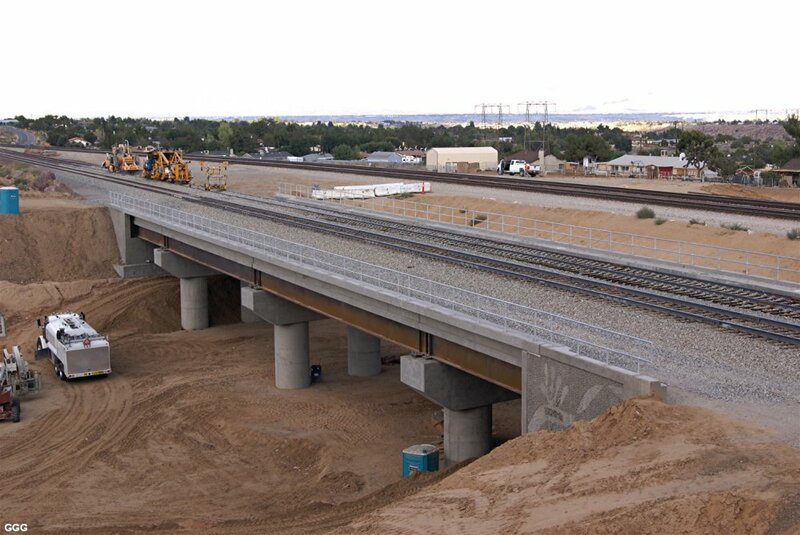 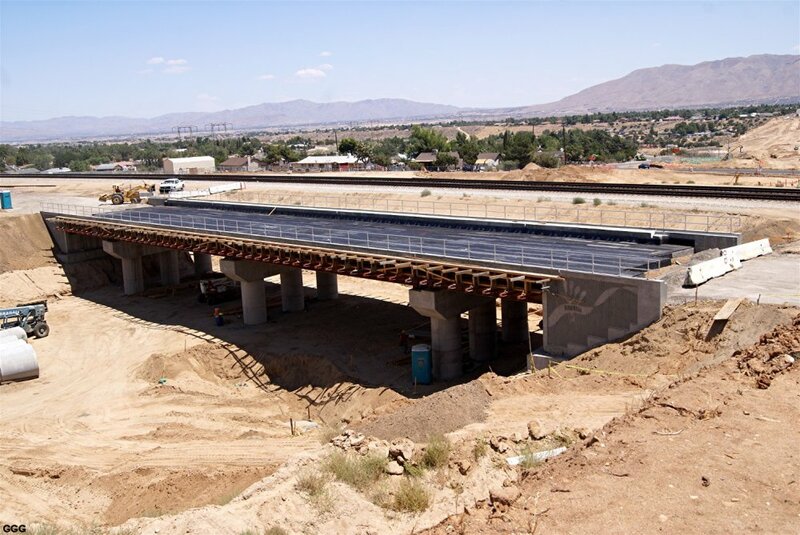 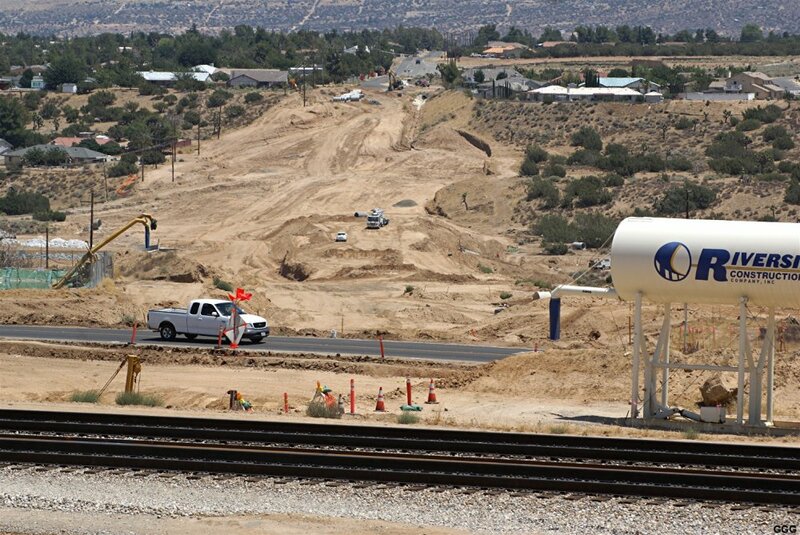 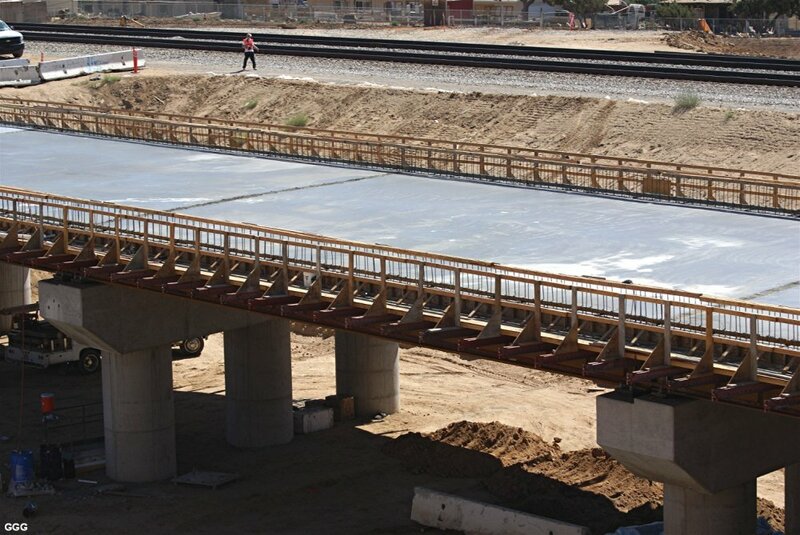 May 25: Well, the Ranchero Rd / BNSF Bridge project is essentially complete. 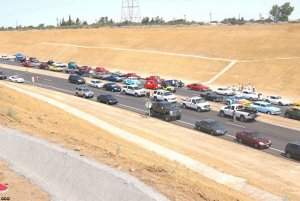 I will try to get to the GRAND OPENING next month. 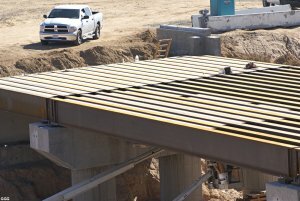 It has been a pleasure and I'm still amazed at your interest in this project. 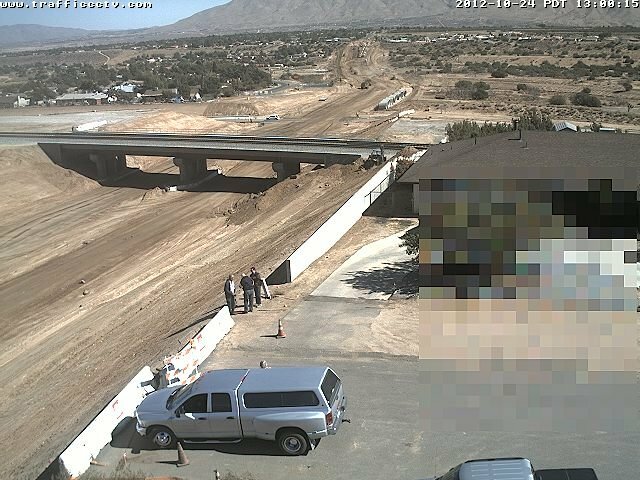 Note: The web-cams and their 30 foot poles have been removed. 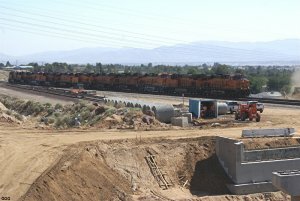 # 2778: The Eastern extension of Ranchero Rd from near the BNSF RR Bridge. 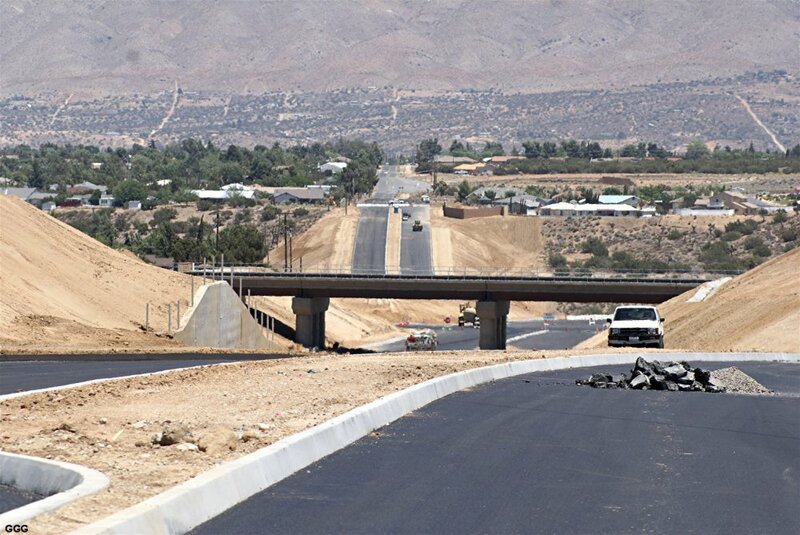 # 2779: The completed Western extension of Ranchero Rd. 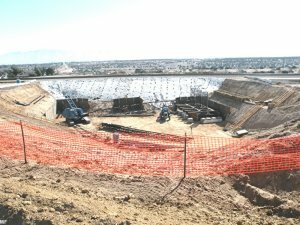 # 2780: The entire project --- Looking West from the far Eastern end. 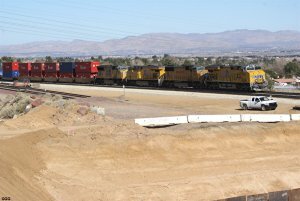 # 2781: Photographed near the project, the ULTIMATE RailFan vehicle rests outside a Hesperia Junk Yard. 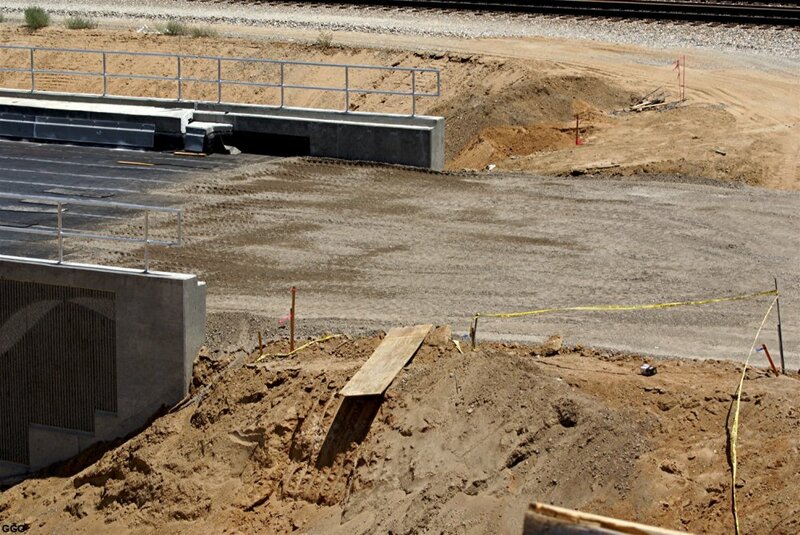 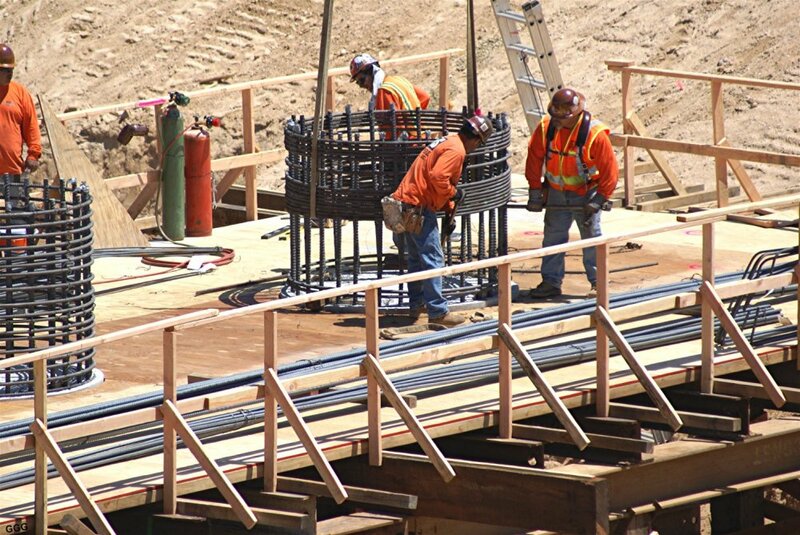 May 29: Today, I visited the construction office for the BNSF Bridge / Ranchero Rd project. 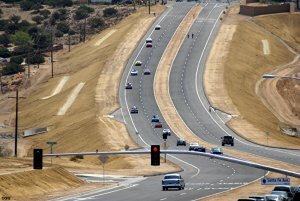 The project is 95% complete and the grand opening ceremony is scheduled for the end of June. 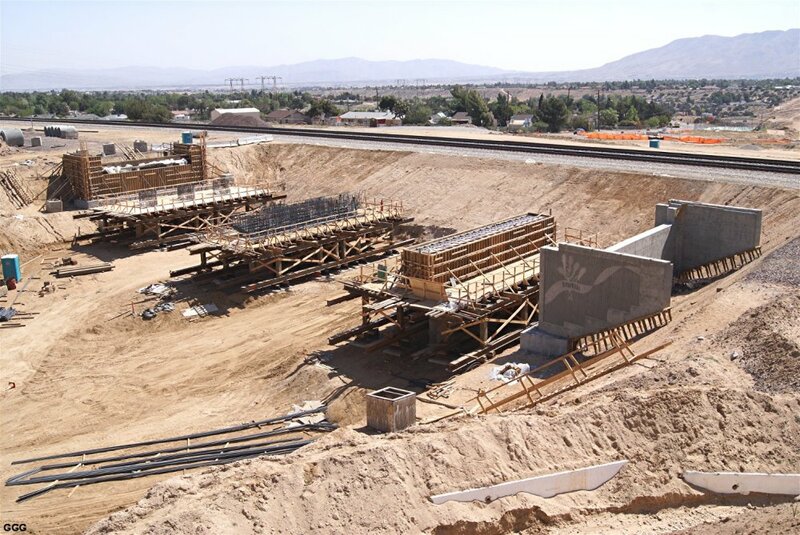 They are now awaiting installation of the Traffic Control signals at Ranchero Rd and Santa Fe Ave / Summit Valley Rd. 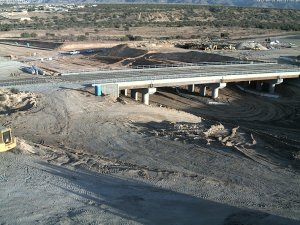 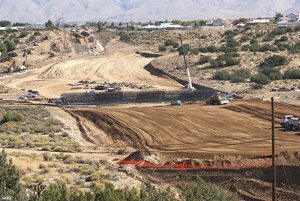 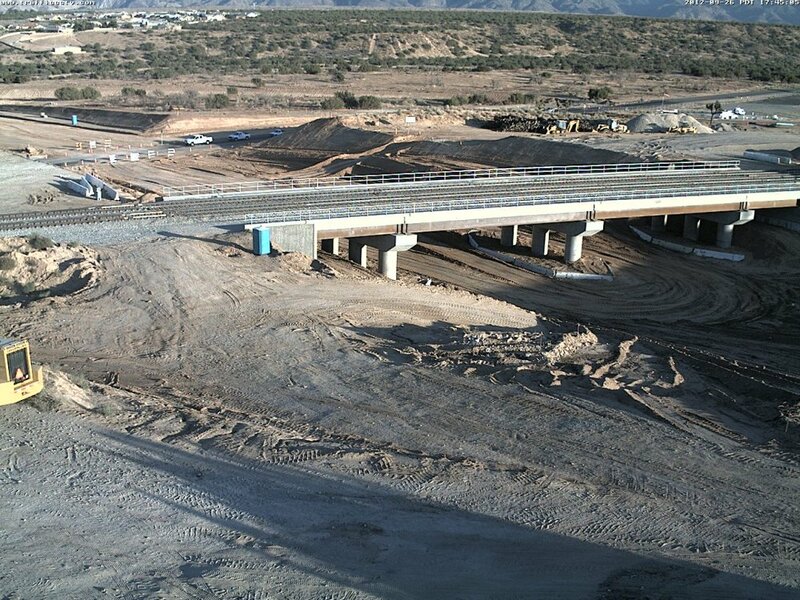 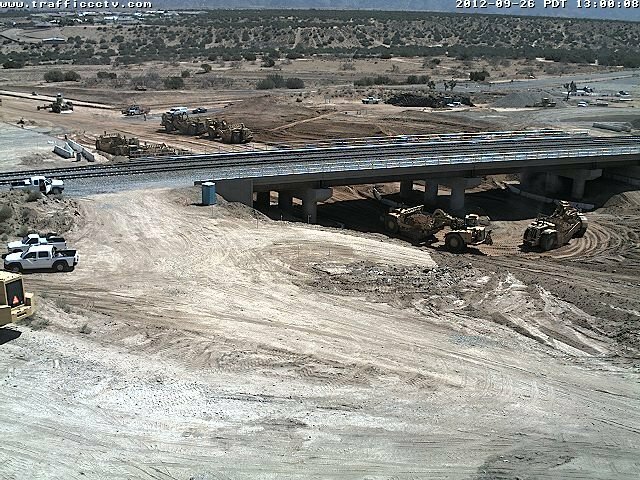 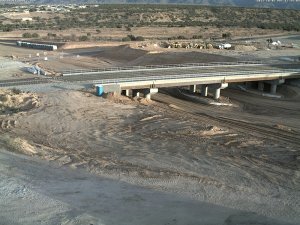 The WebCams have been removed and placed four miles to the West at the newly started Ranchero Rd / Interstate 15 interchange. May 29: Was out at the new BNSF bridge over Ranchero Rd today. # 3088: UP 7375 is WB @ MP 48. 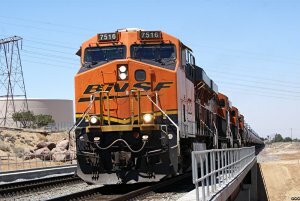 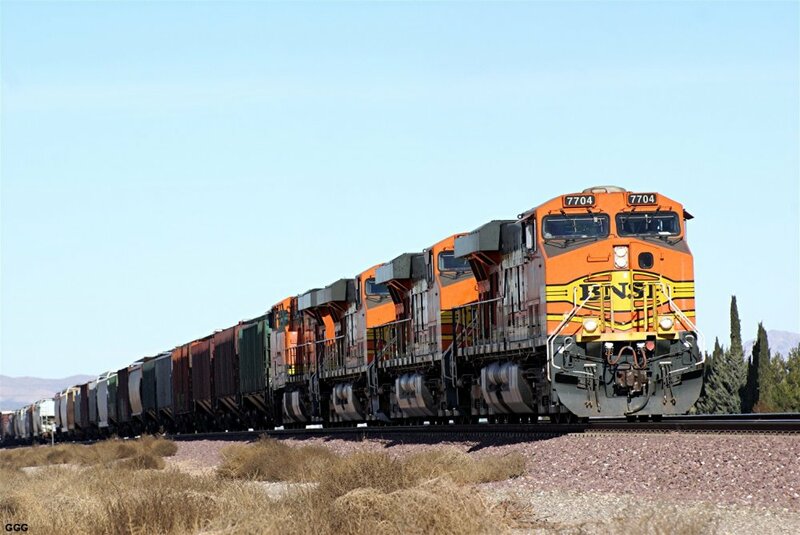 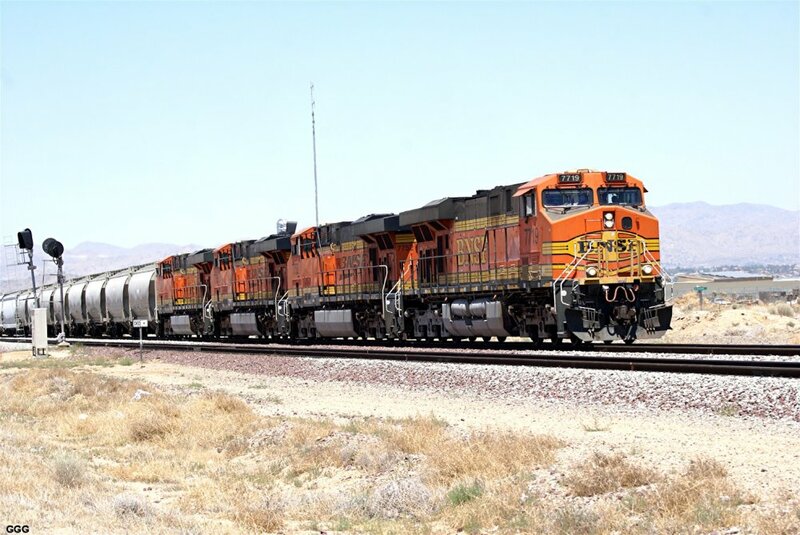 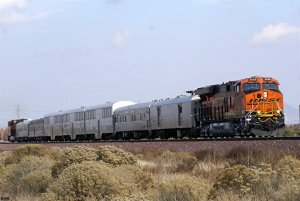 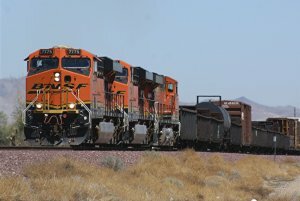 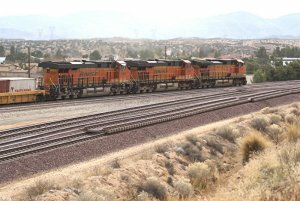 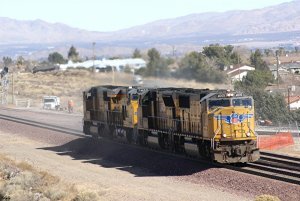 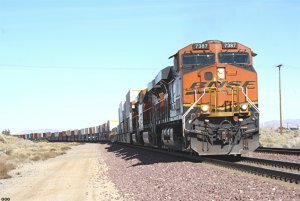 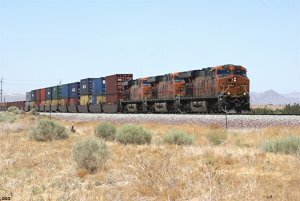 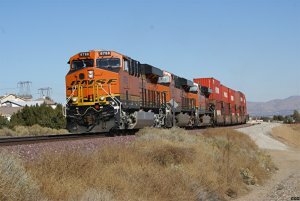 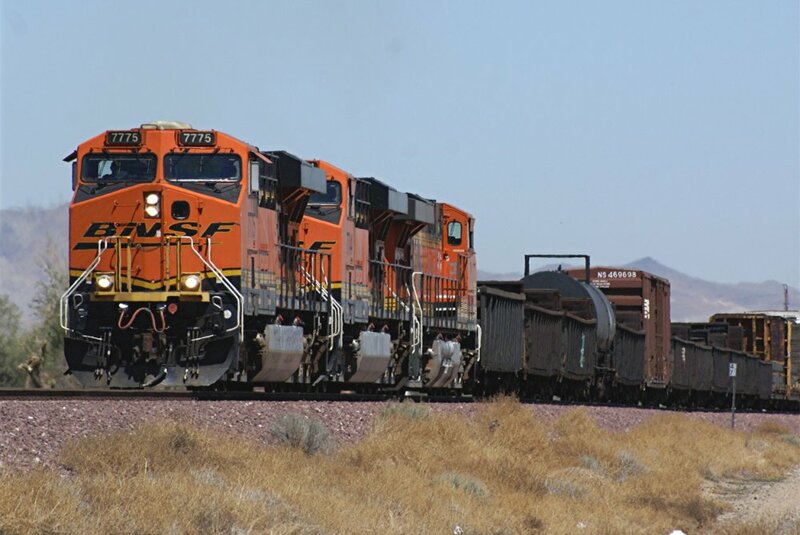 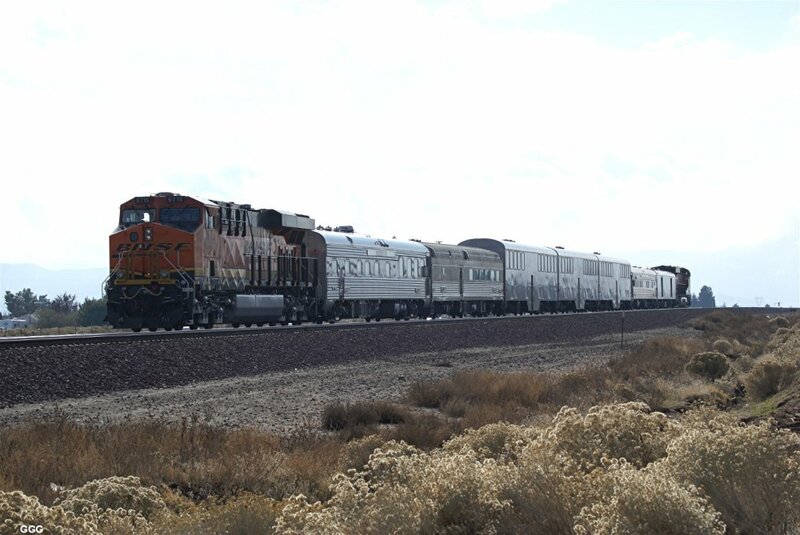 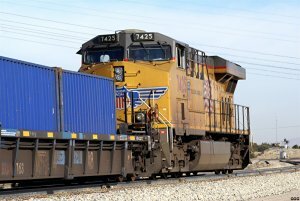 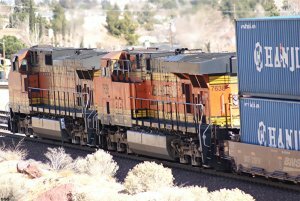 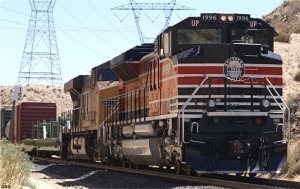 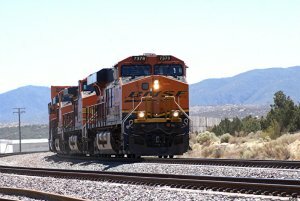 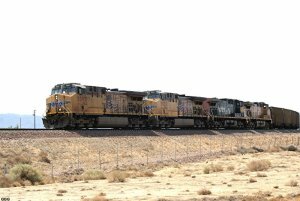 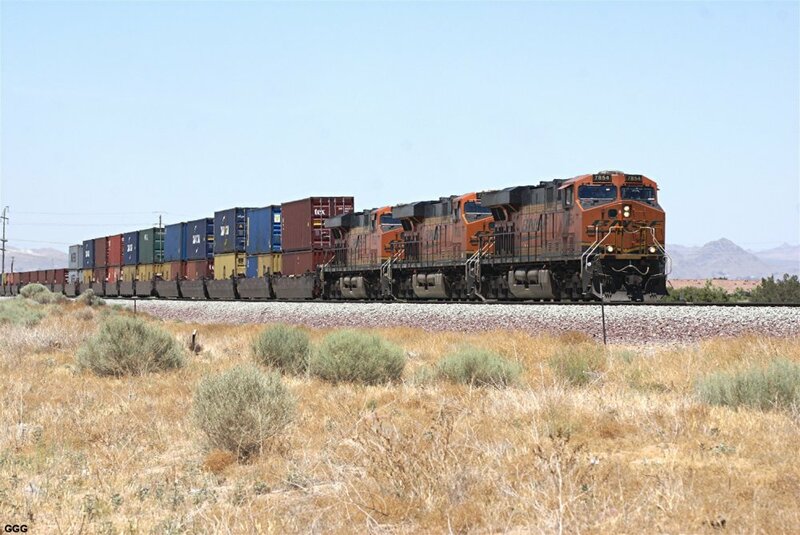 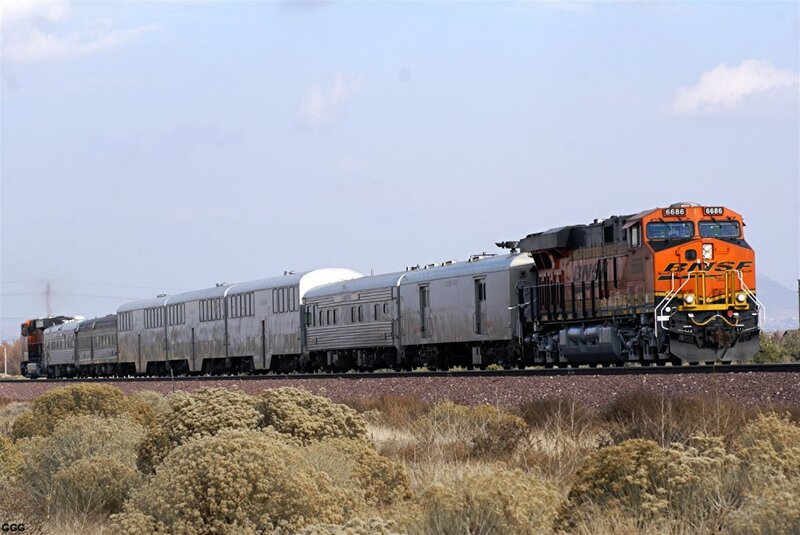 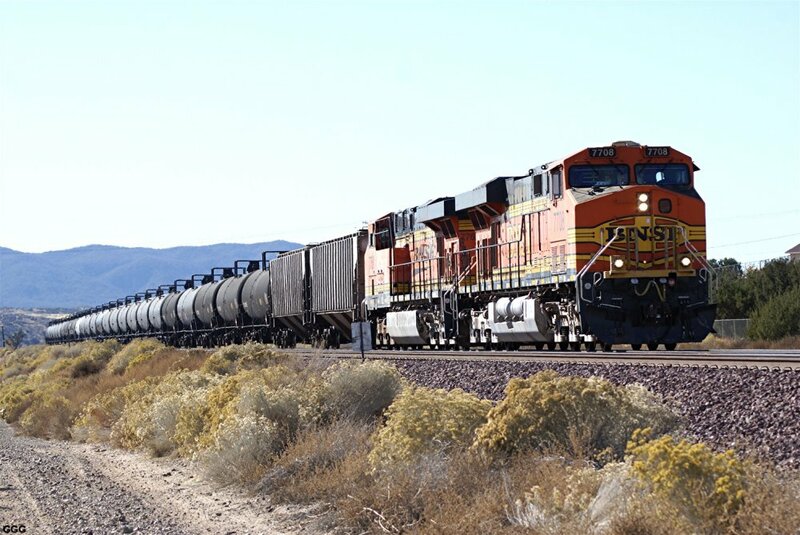 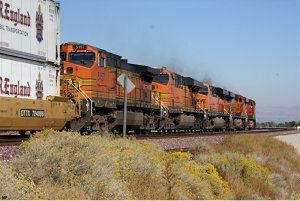 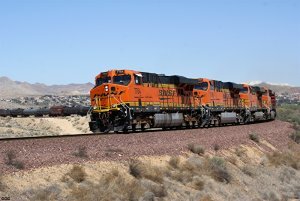 # 3089: BNSF 7378 is EB @ MP 48. 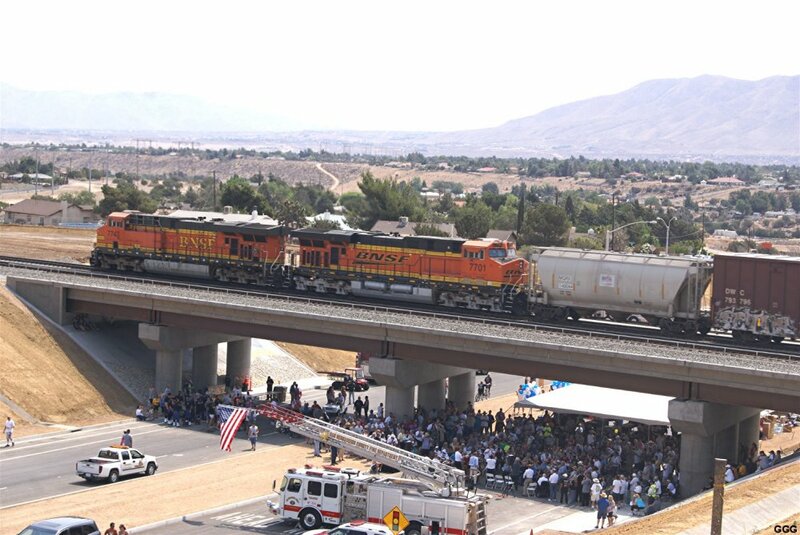 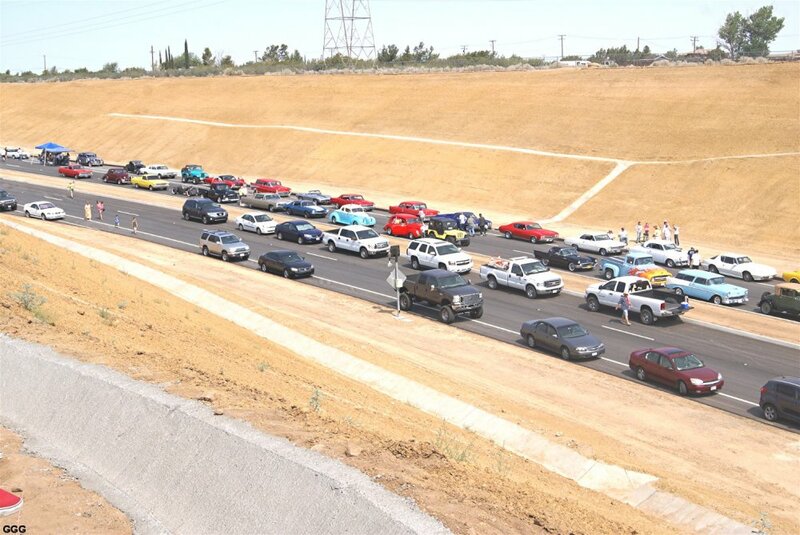 Saturday (06-29-13): 1000 folks attended the Grand Opening Ceremony of Hesperia's Ranchero Rd. 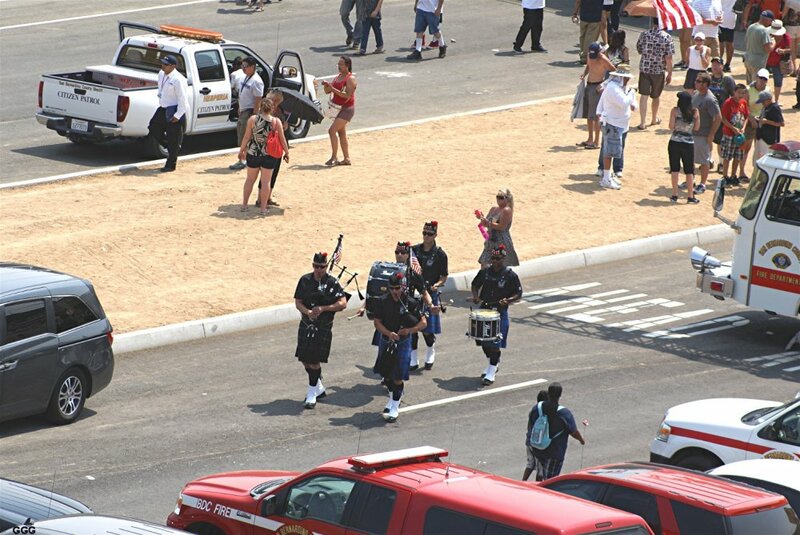 Marc & I were joined at the festivities by Ruedi & Hans (Switzerland). 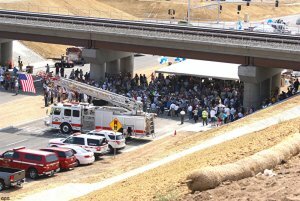 At 10:00 AM, the temperature was 98 F and later topped out at 111 F.
# 2789: The ceremony was held under the BNSF bridge and a tent which helped --- a bit. 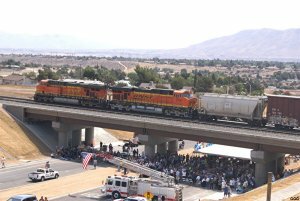 # 2790-2792: There was plenty of train traffic-most of whom "SALUTED" the crowd with LOUD horn BLASTS. 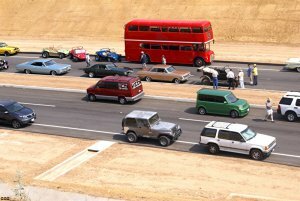 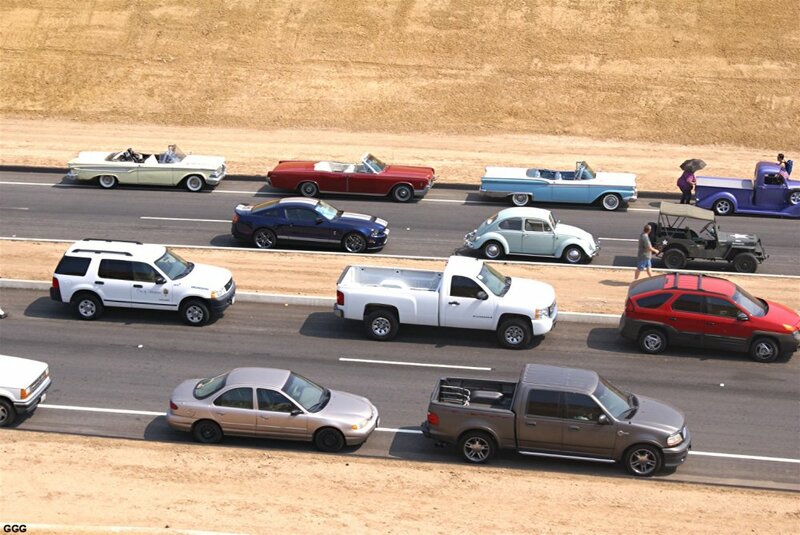 # 2793-2796: In the far lanes, several of the many beautifully restored and maintained classic parade cars are visible. # 2797-2798: Even more train traffic. # 2799-2800: BagPipe & Drum Corps marched while the ribbon was cut by a classic Dodge Coronet R/T. 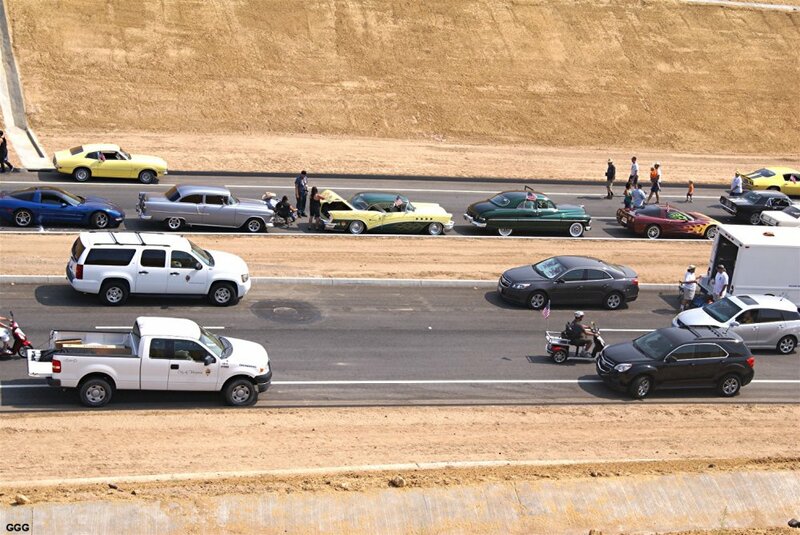 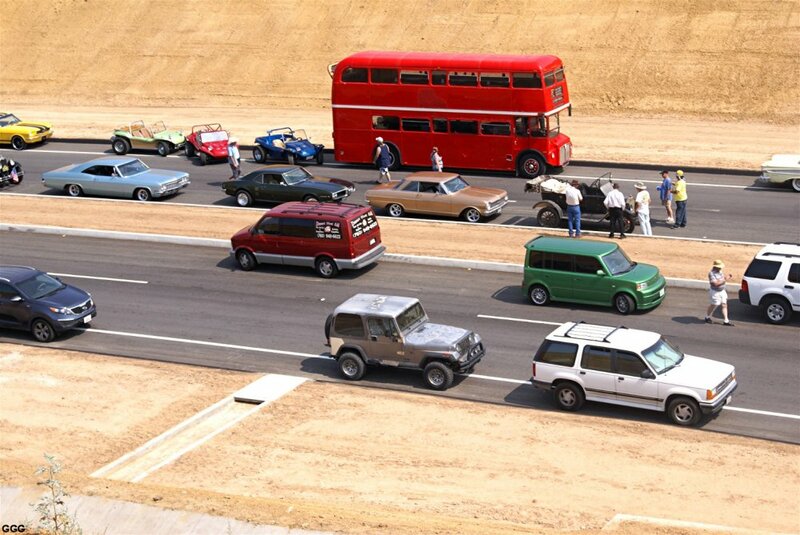 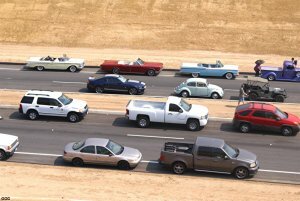 # 2801: The classic car parade climbs the Eastern extension of Ranchero Rd. 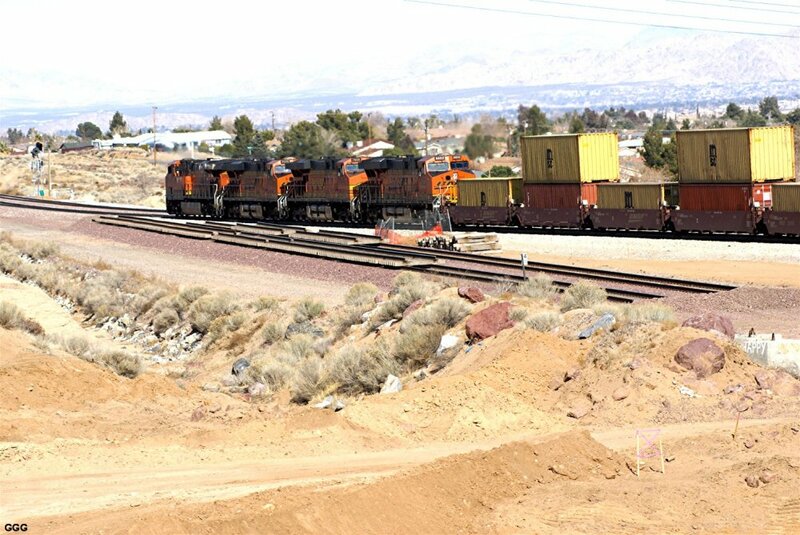 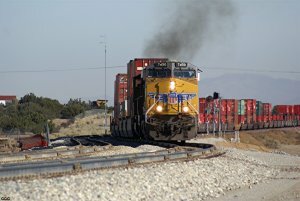 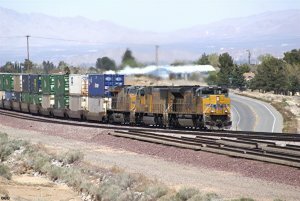 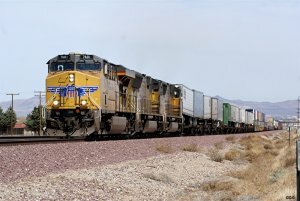 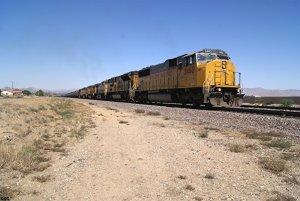 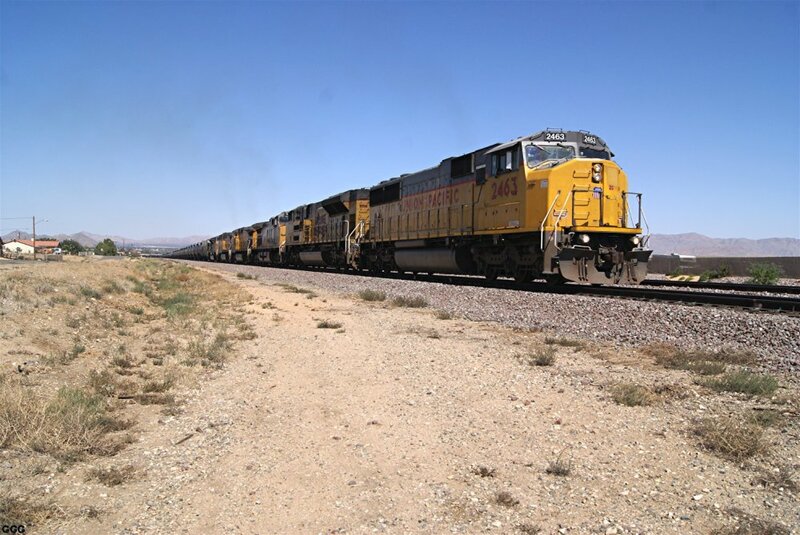 # 2802: UP 5897 is EB with an empty coal train thru East Hesperia.